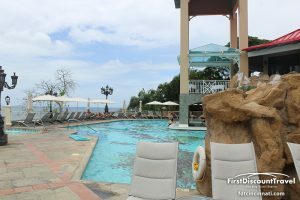 Set amidst 210 lush acres on a half-mile crescent-shaped beach, this spectacular resort offers a 9-hole golf course, 8 restaurants and 10 bars serving Beringer house wines. 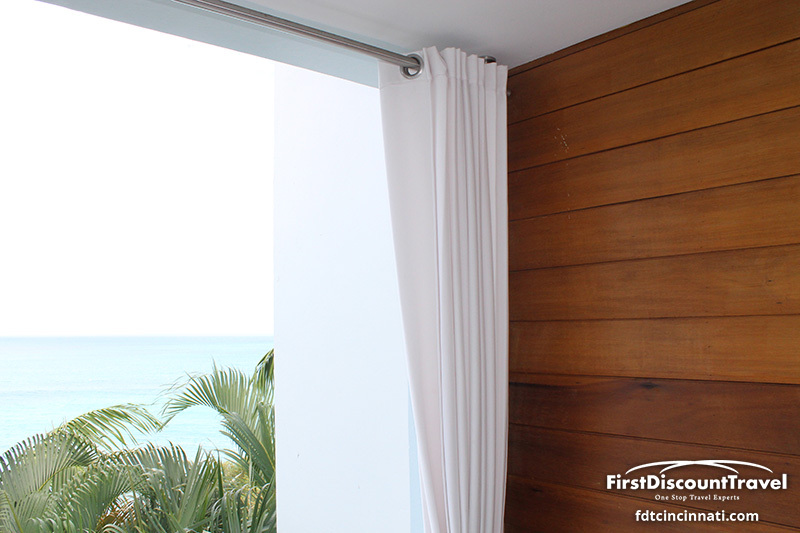 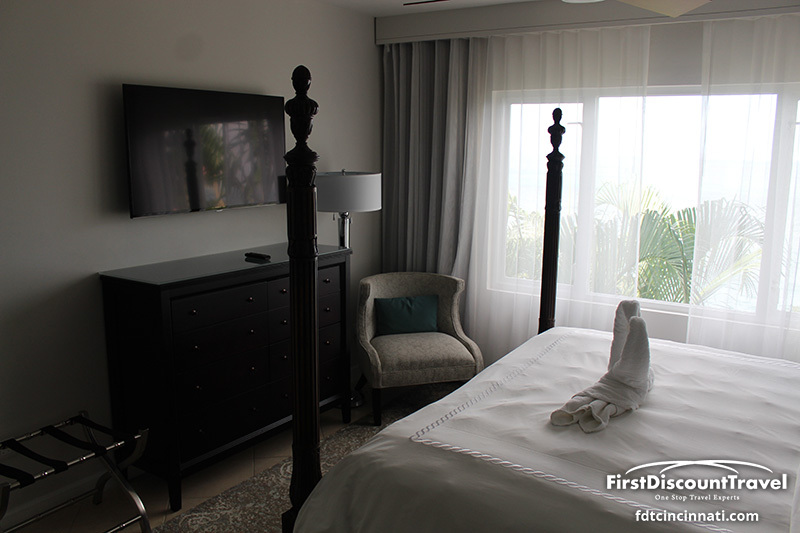 Choose from a range of accommodations from ocean view rooms to expansive Millionaire Suites featuring private pools, butler service and 24-hour room service. 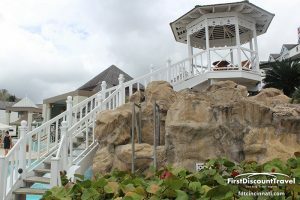 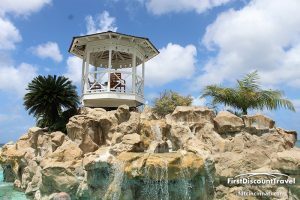 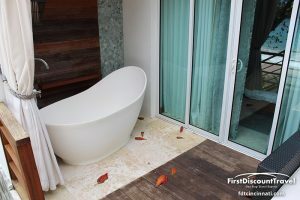 Guests enjoy complimentary golf greens fees, land and watersports, including snorkeling and scuba diving, a full service Red Lane Spa, plus exchange privileges at two nearby Sandals Resorts. 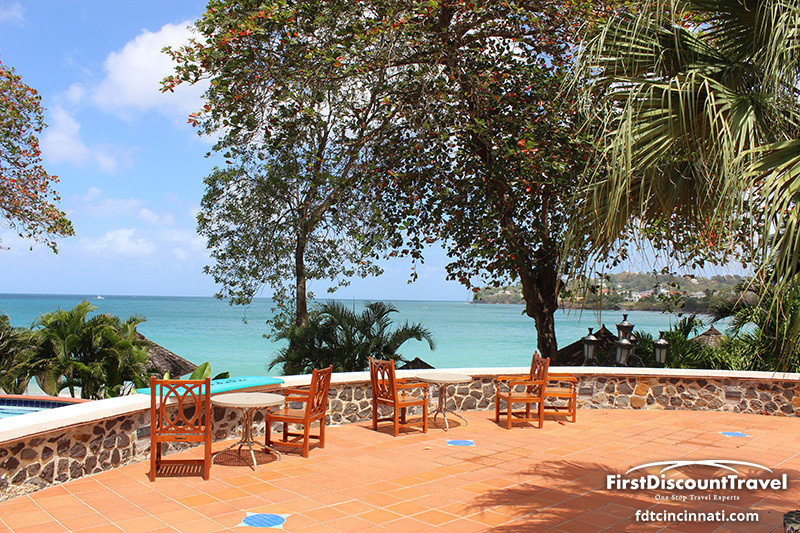 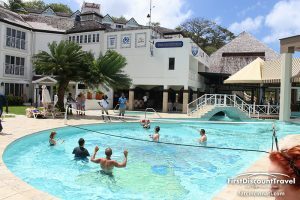 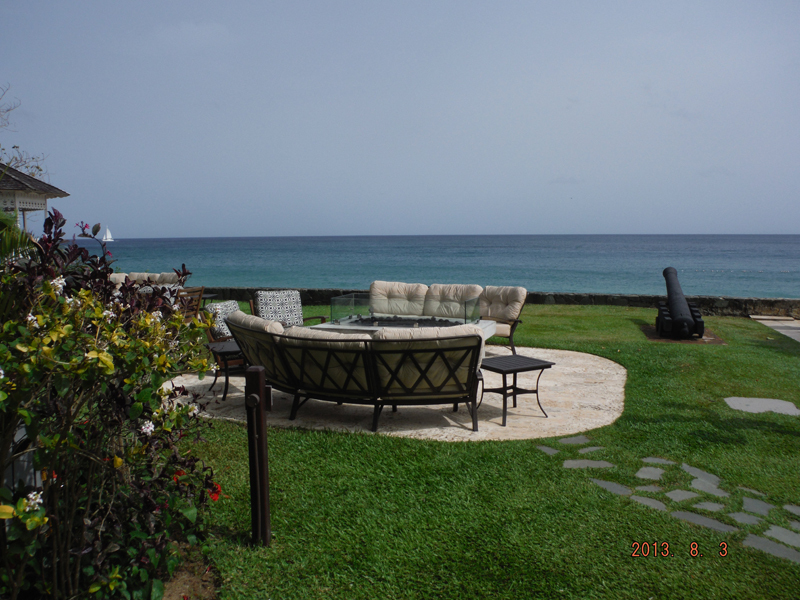 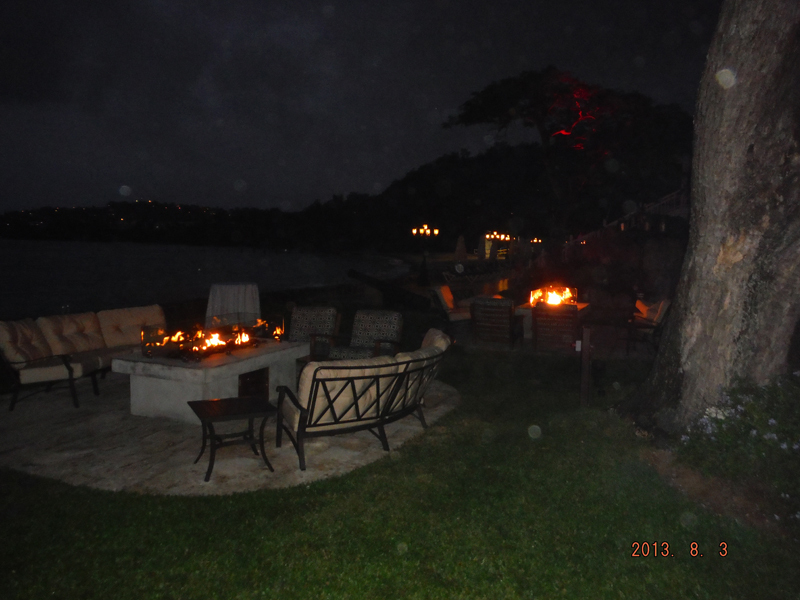 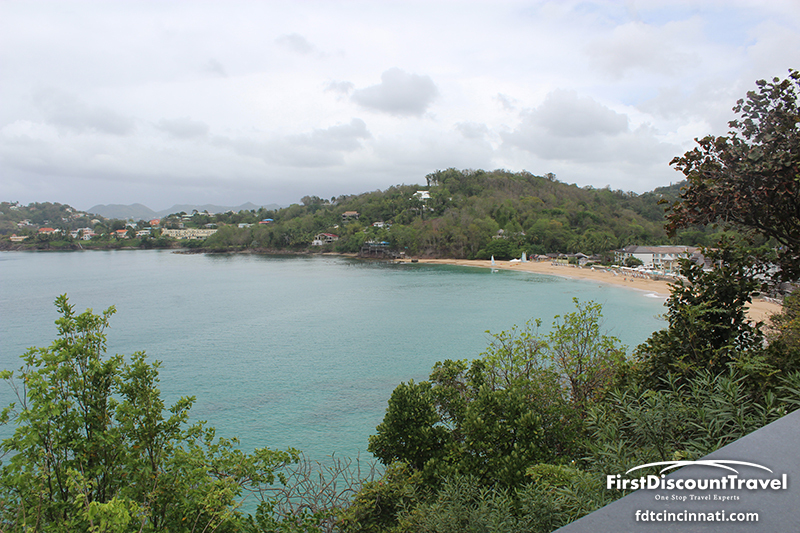 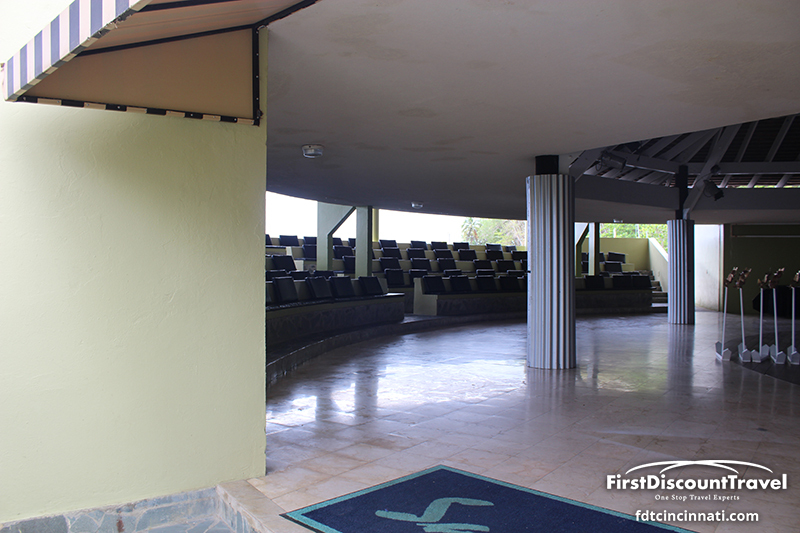 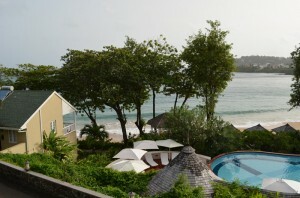 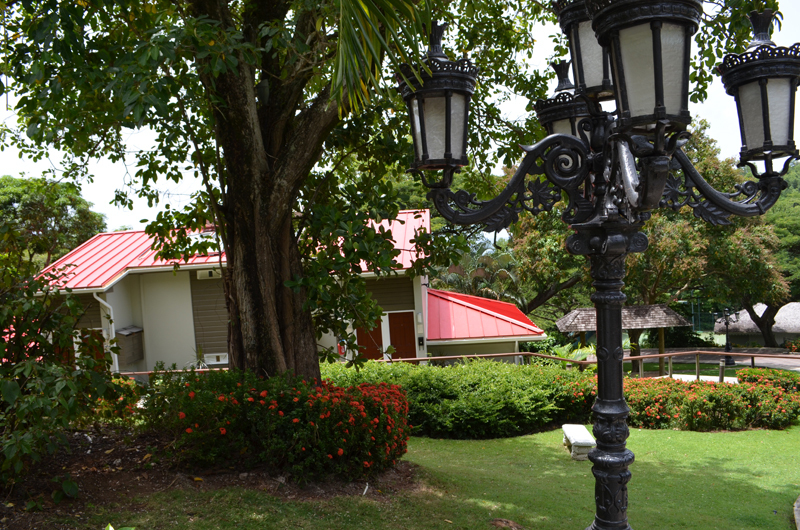 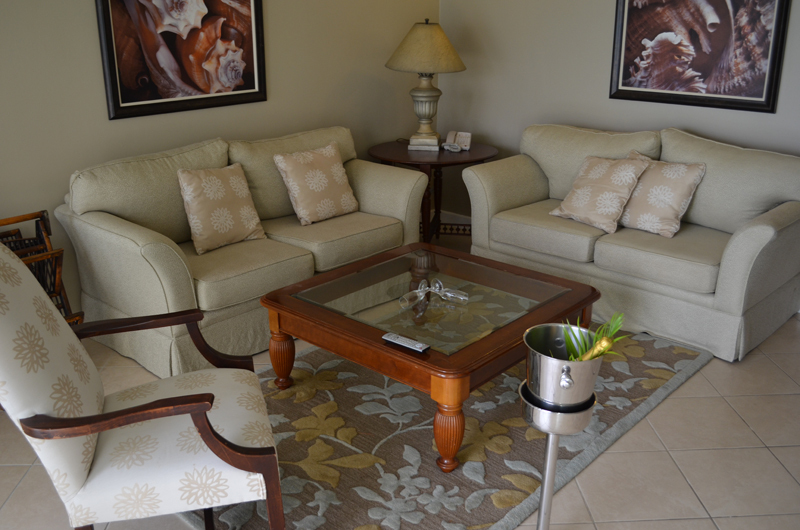 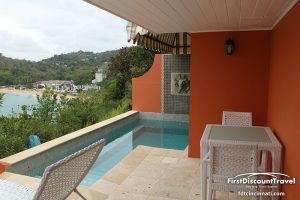 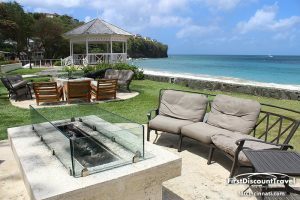 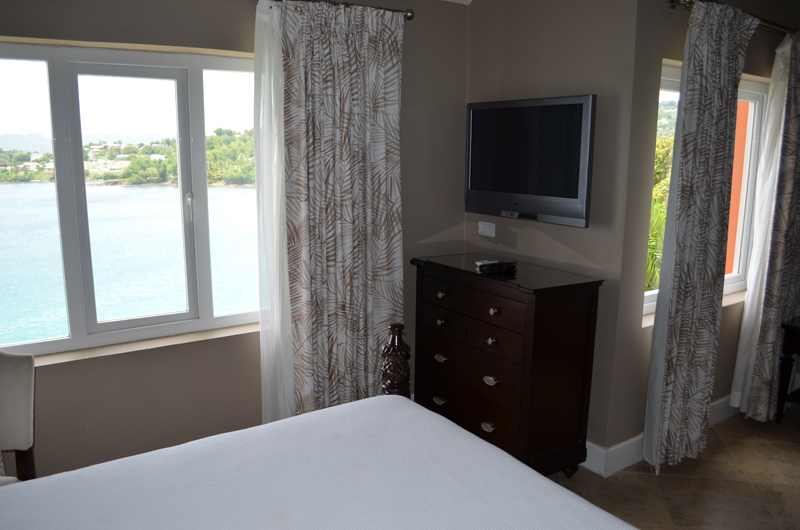 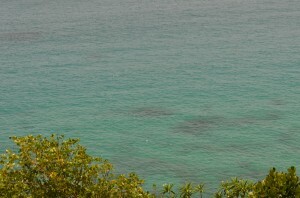 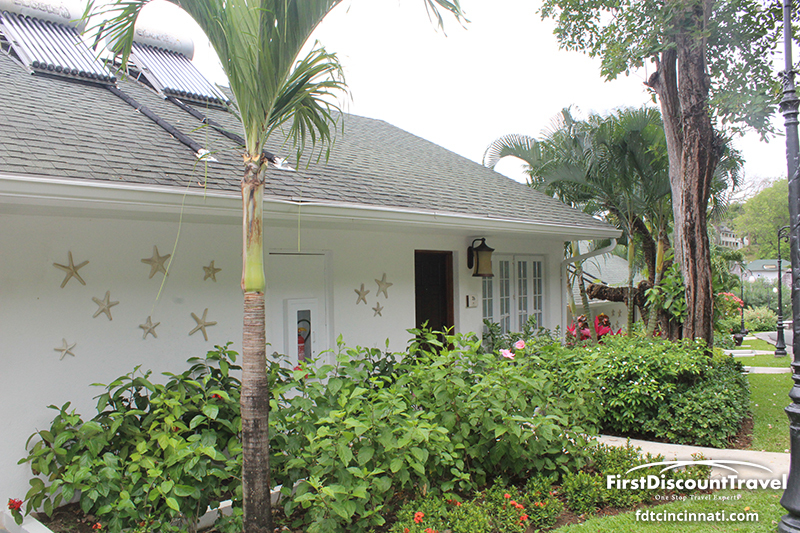 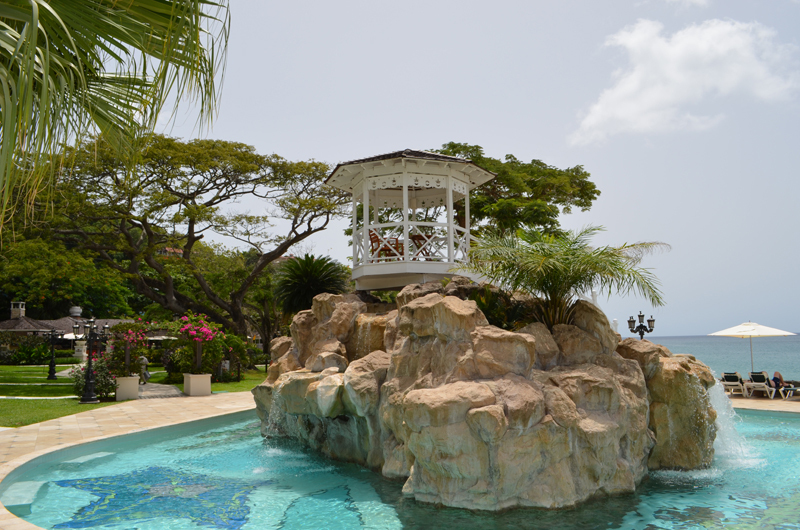 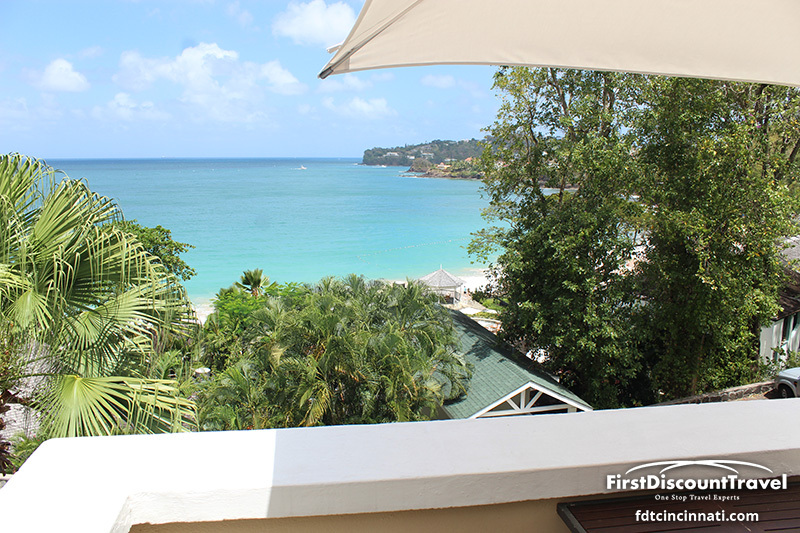 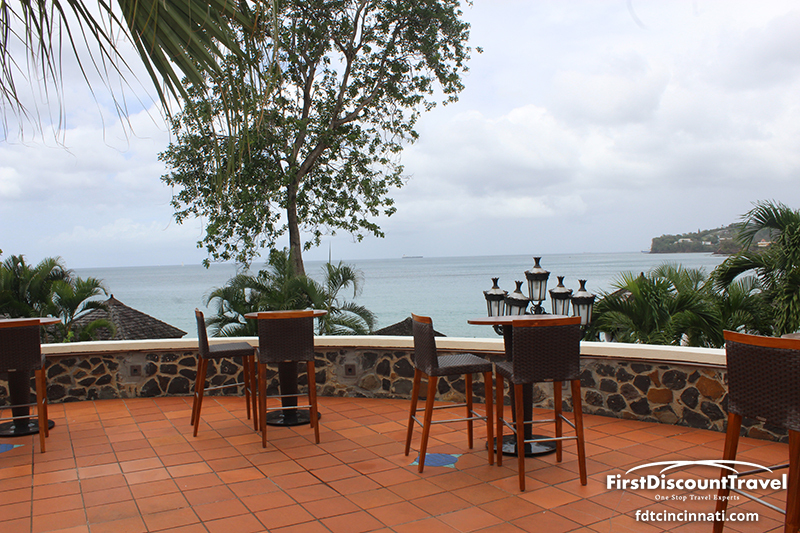 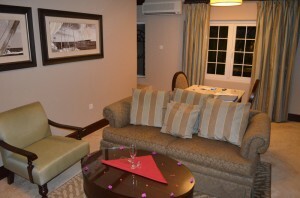 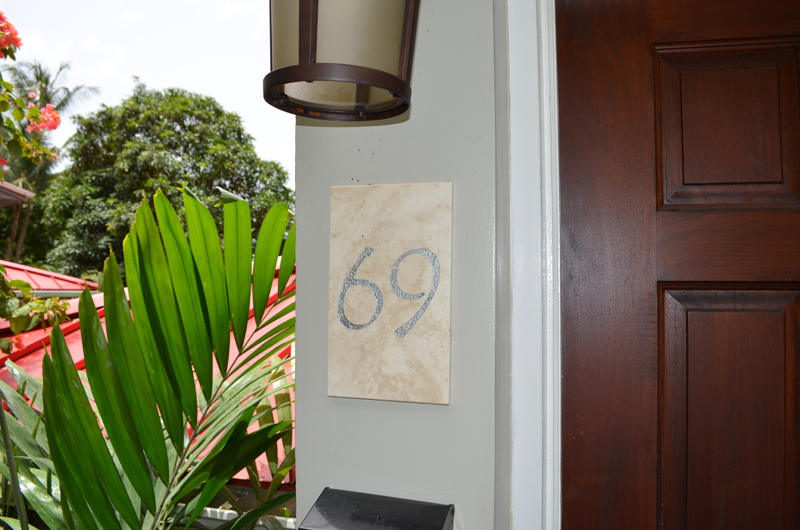 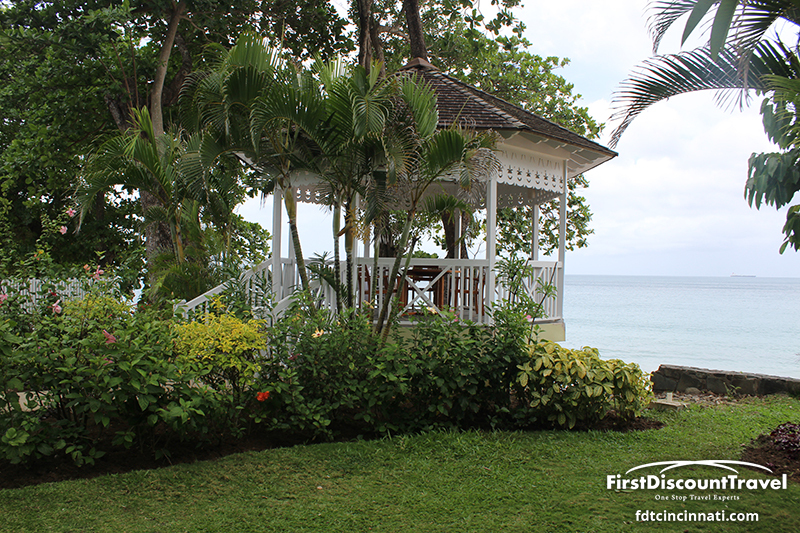 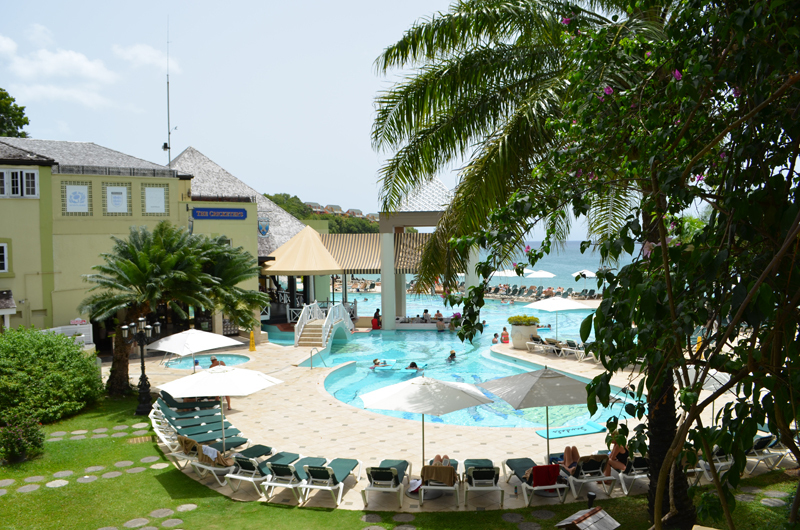 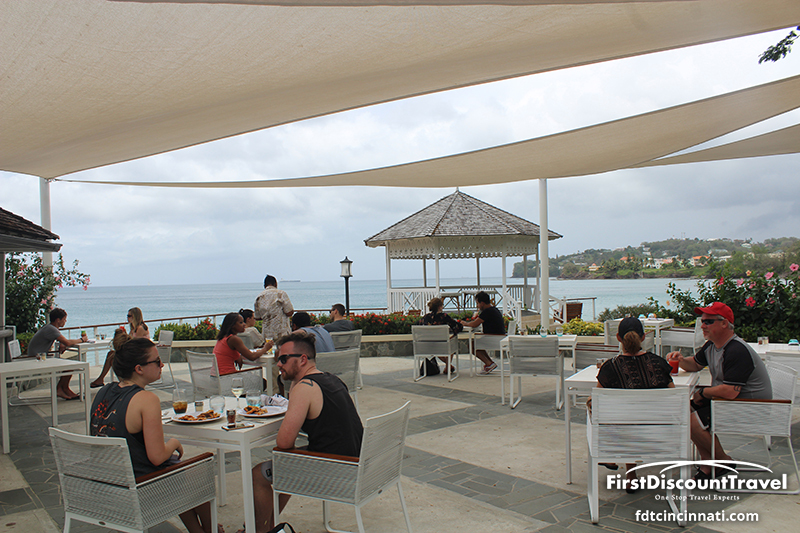 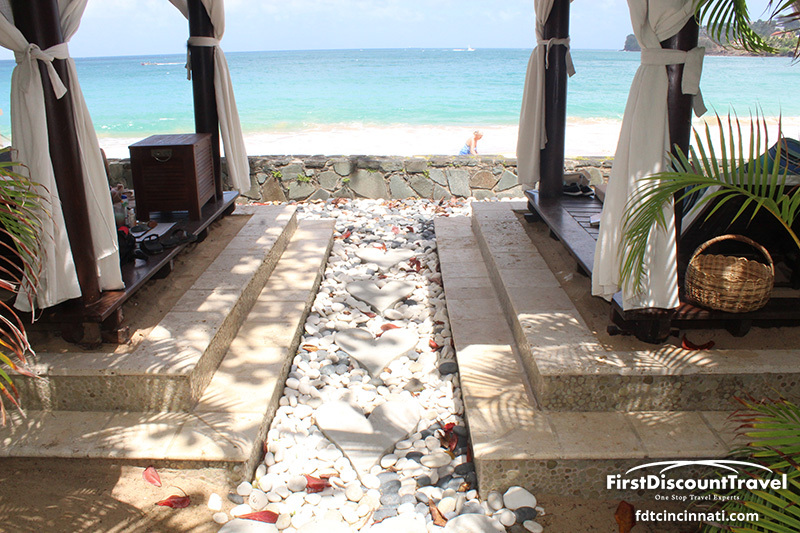 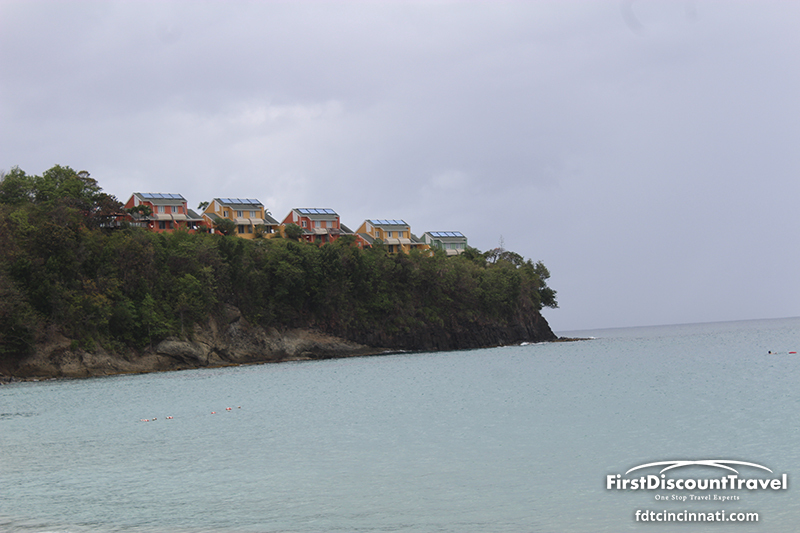 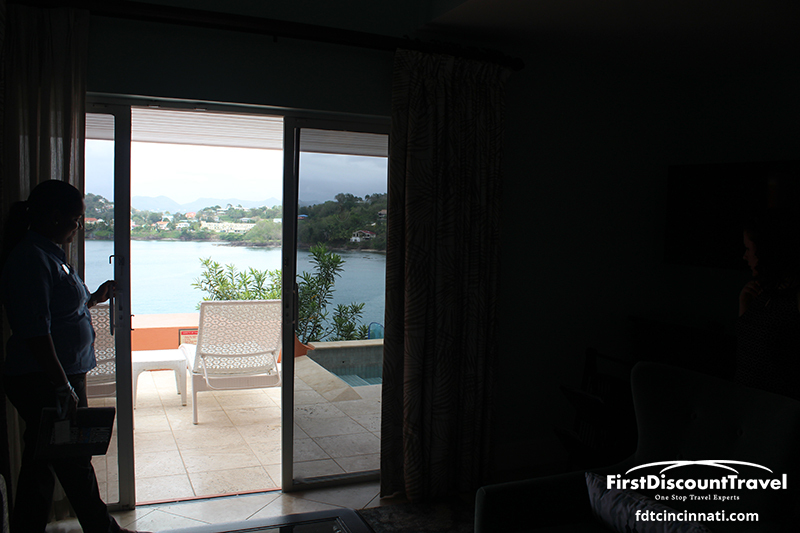 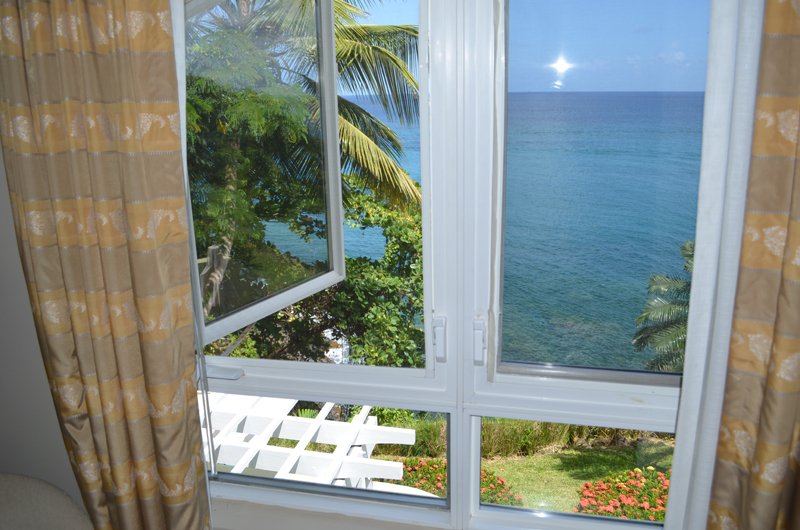 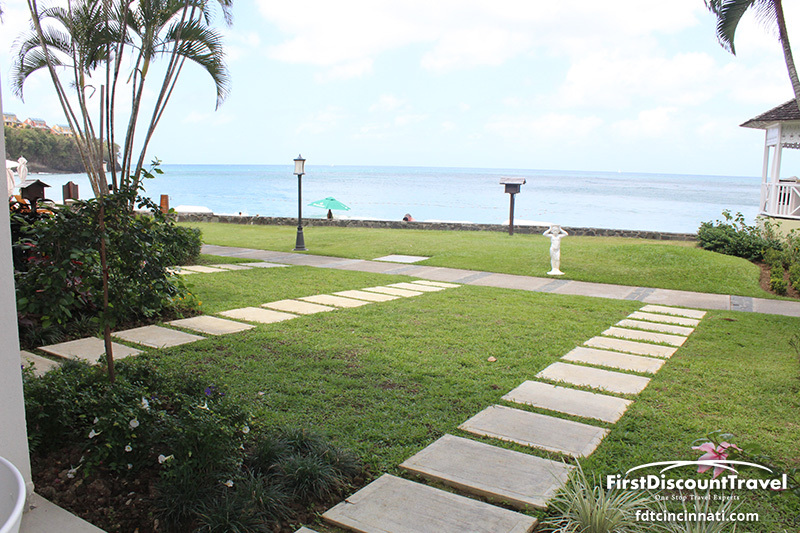 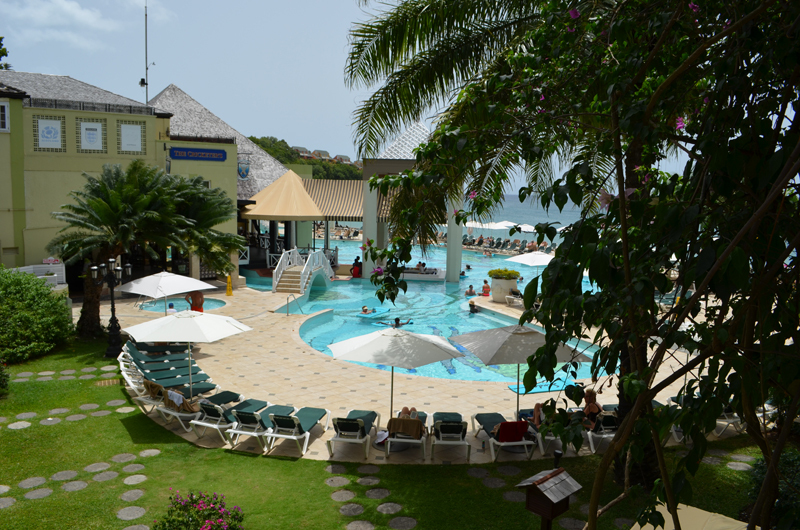 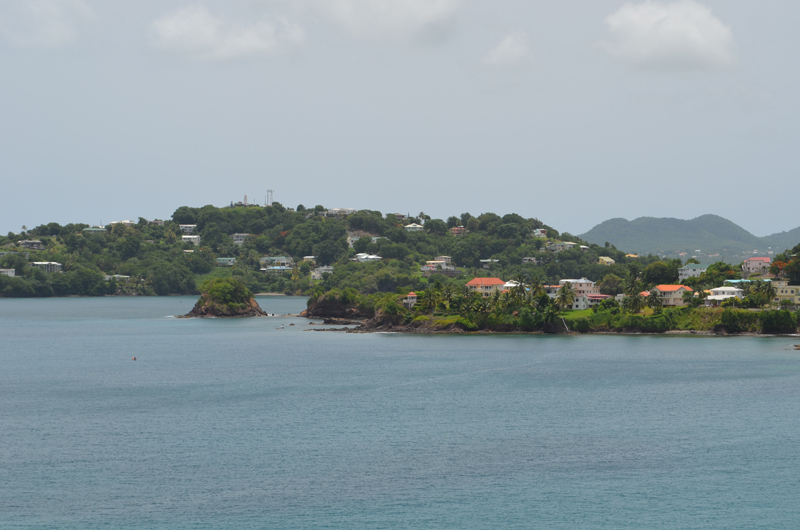 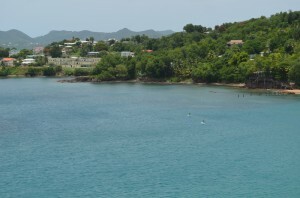 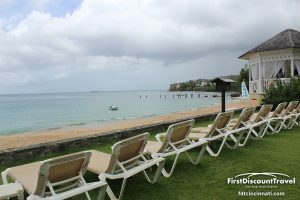 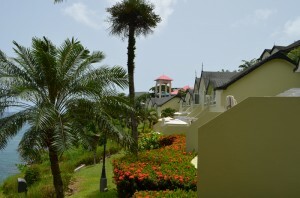 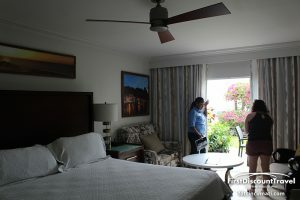 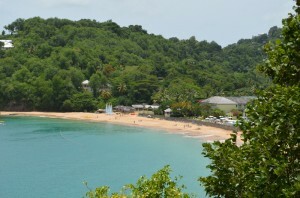 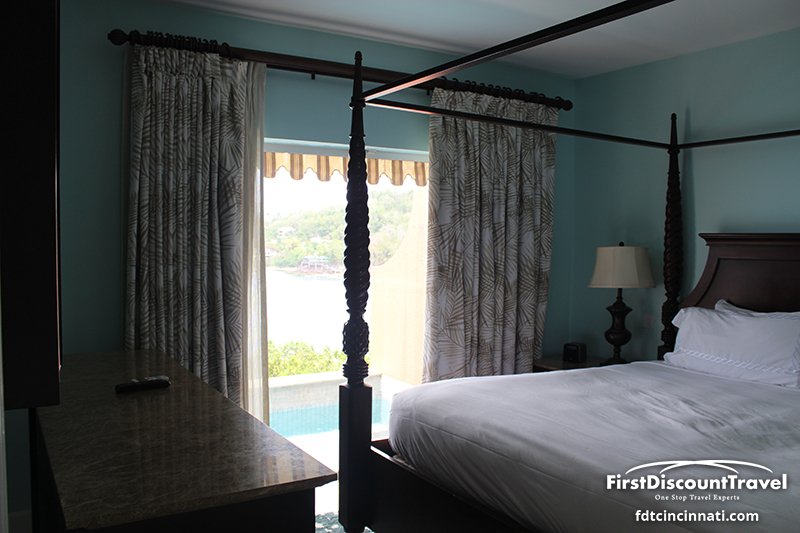 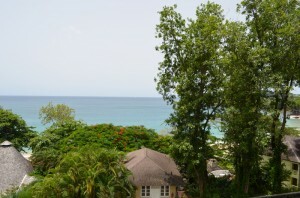 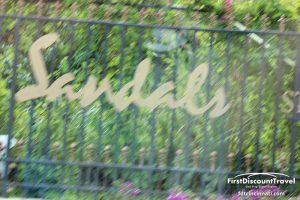 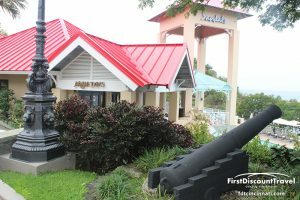 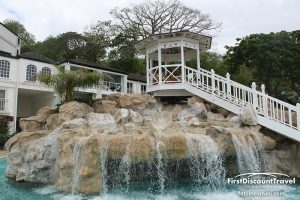 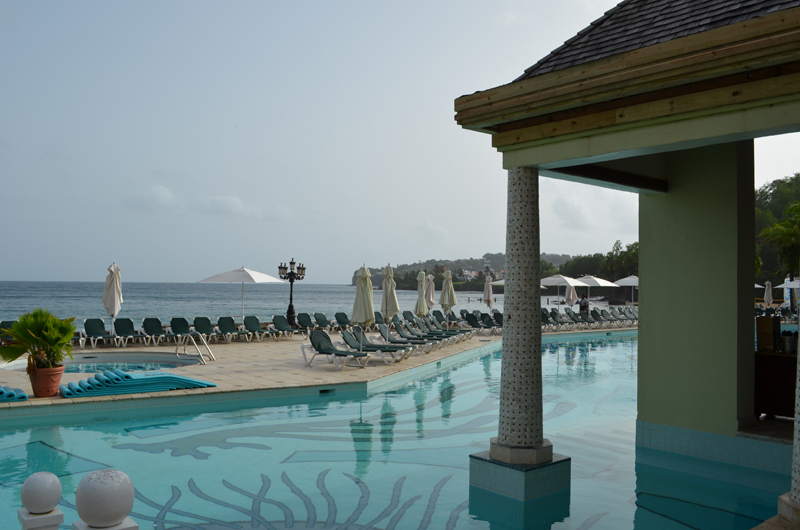 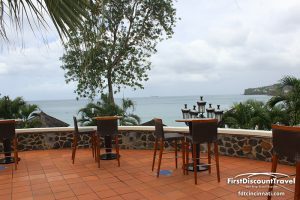 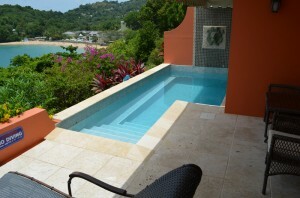 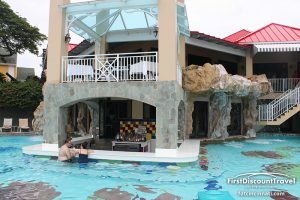 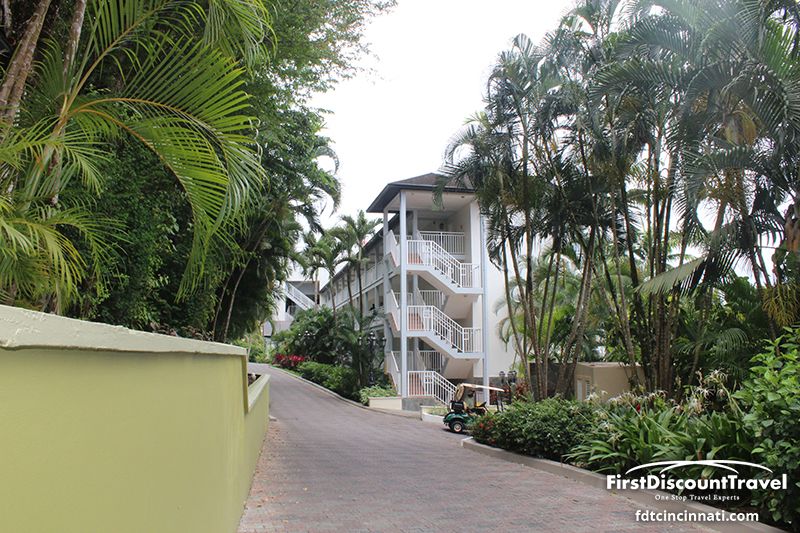 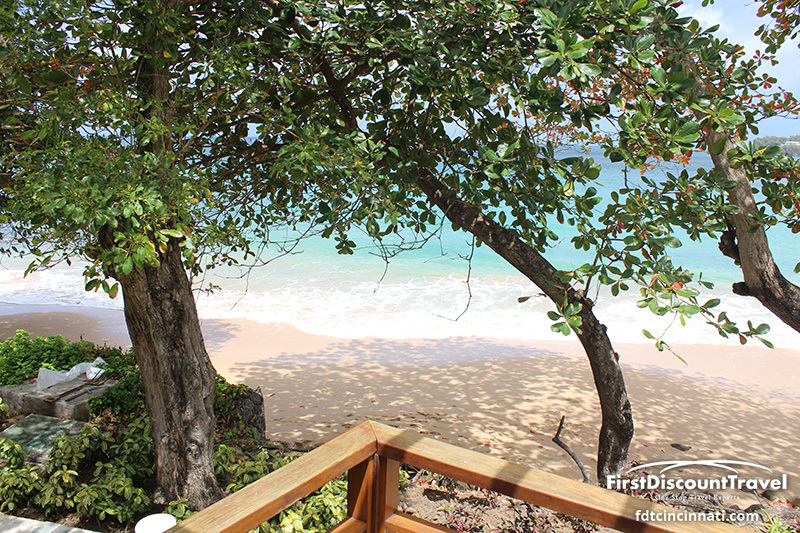 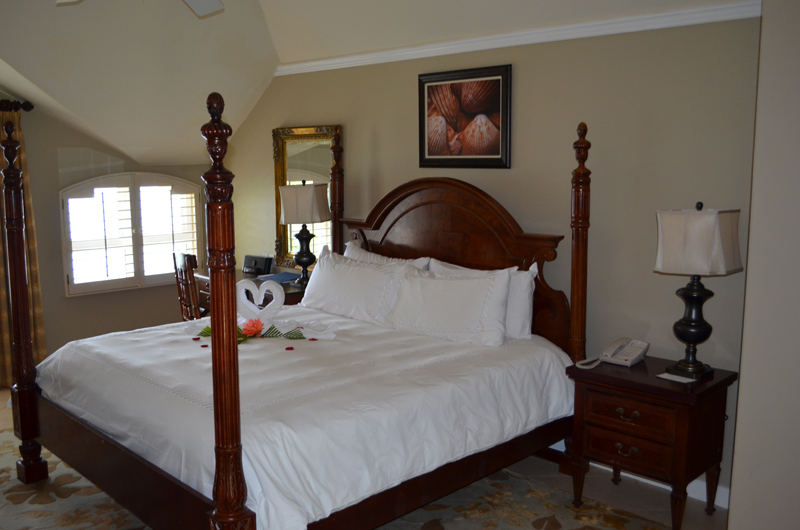 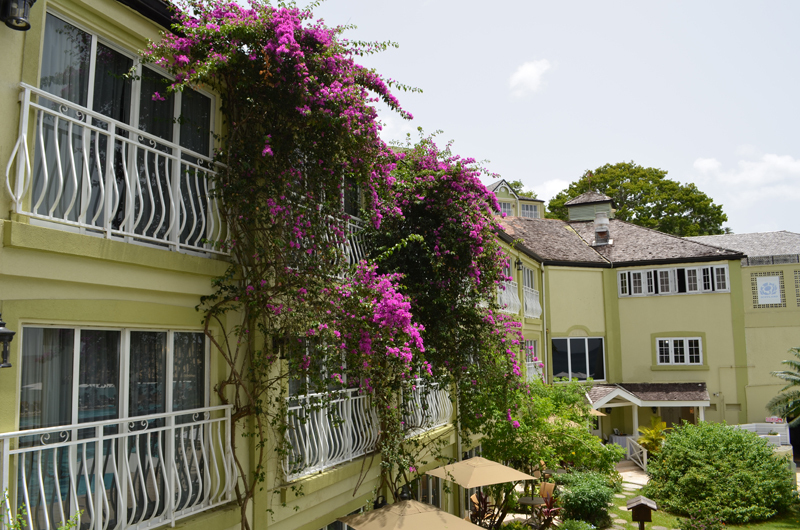 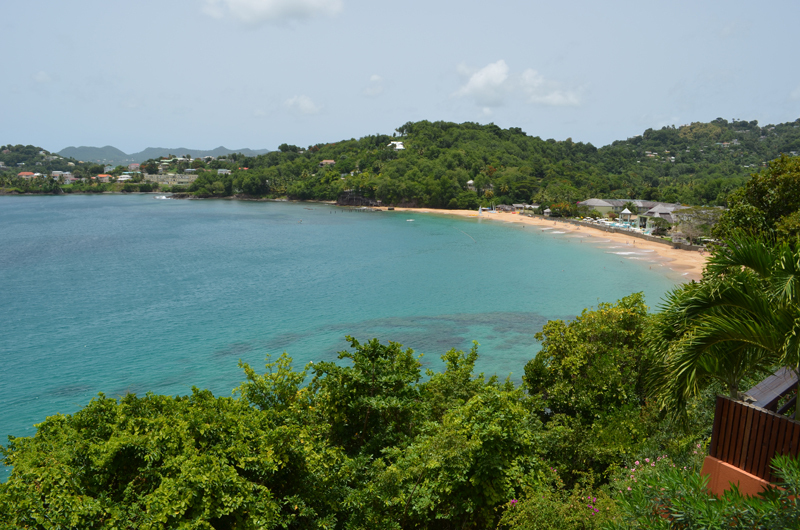 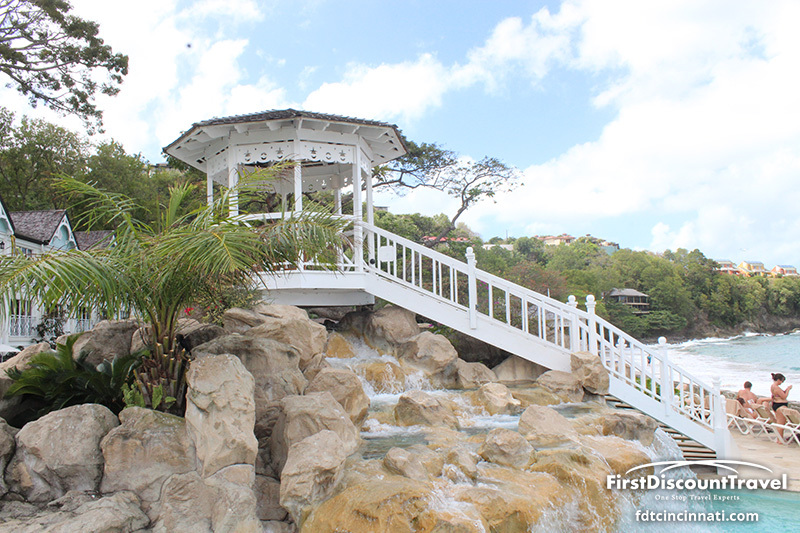 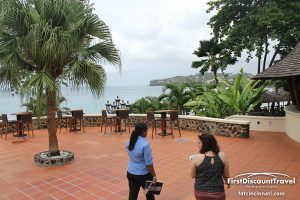 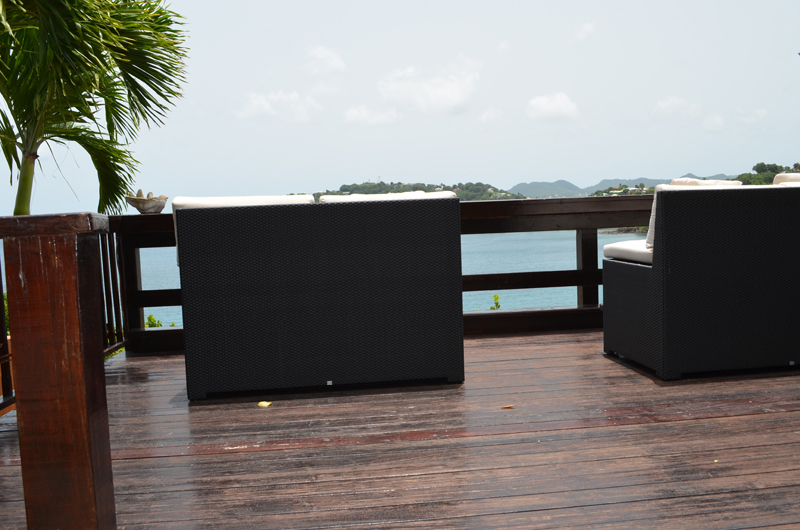 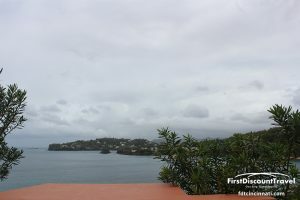 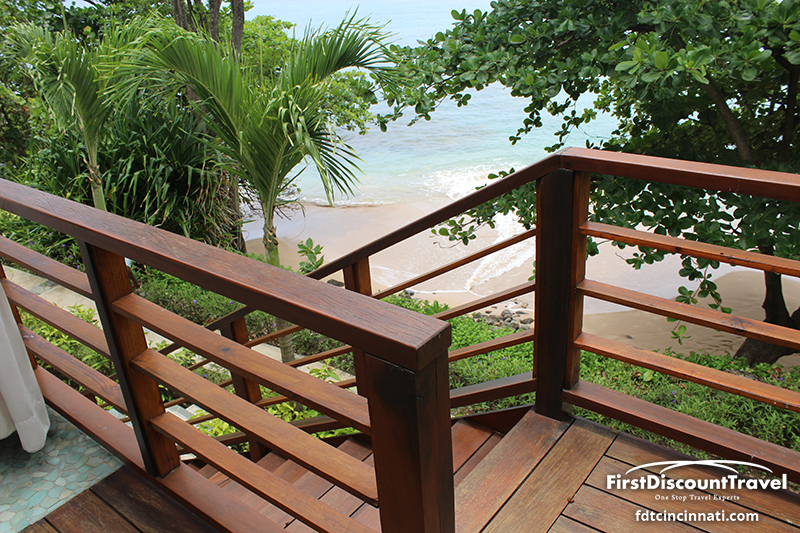 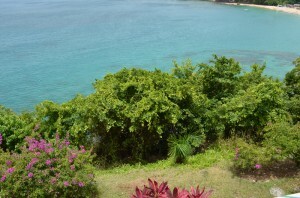 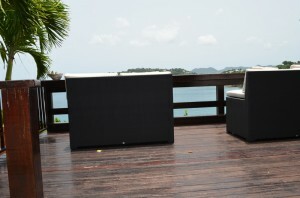 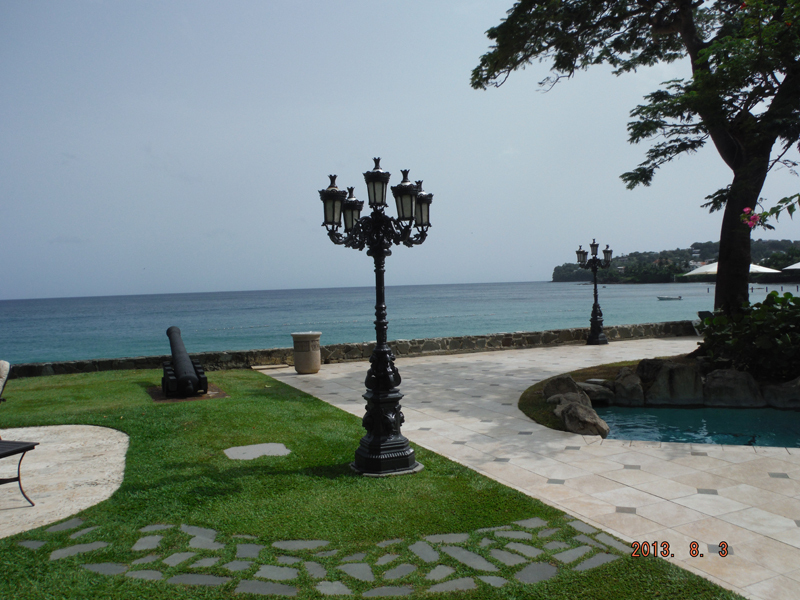 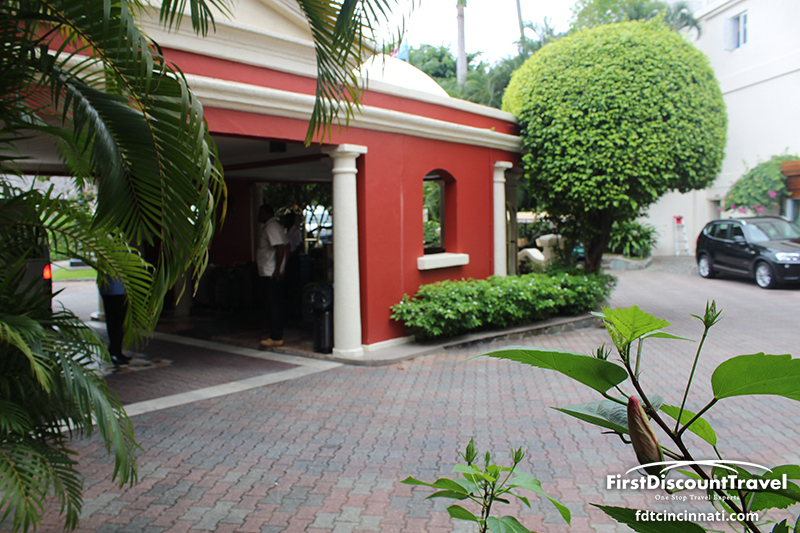 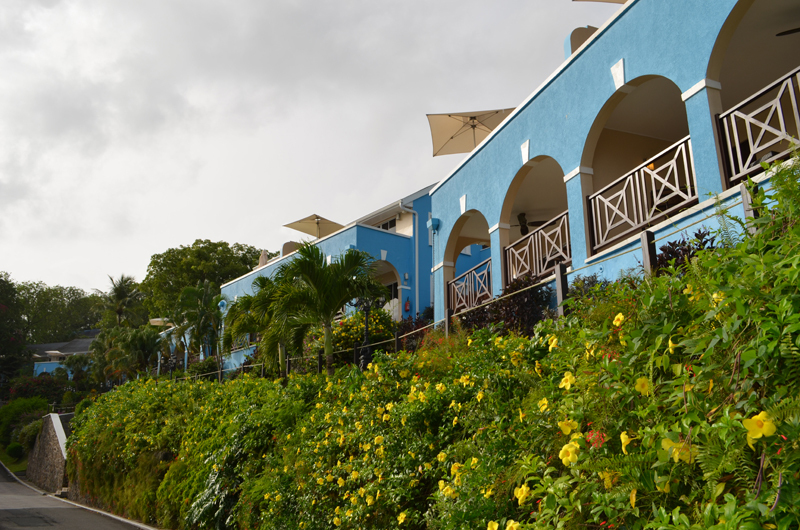 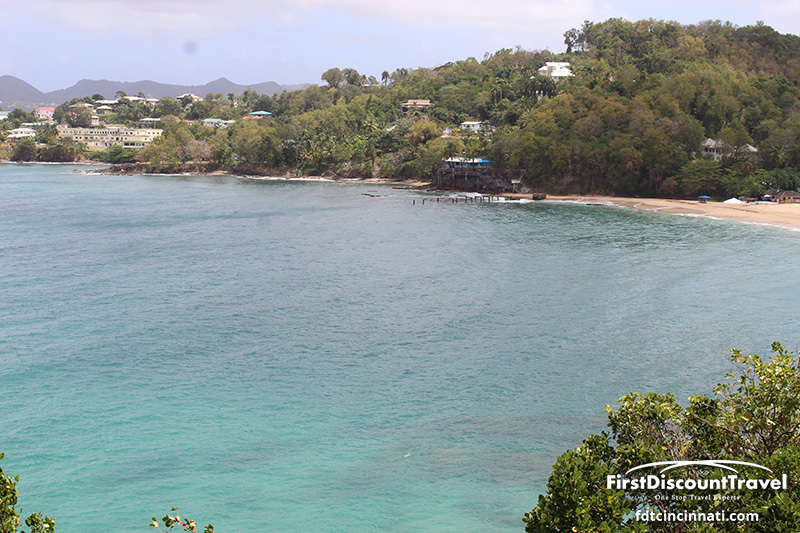 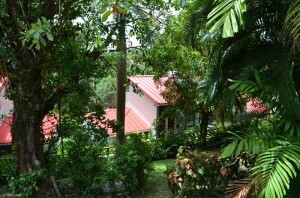 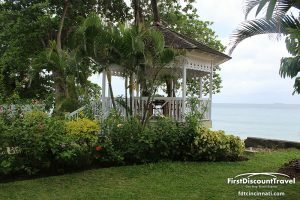 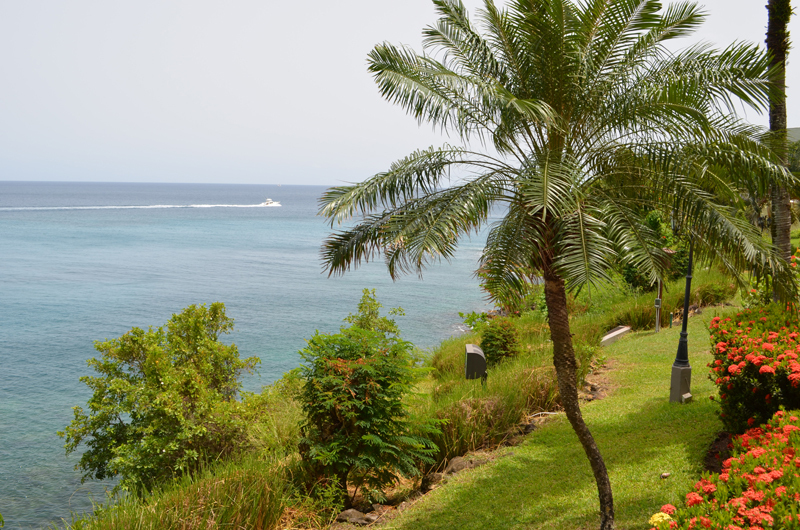 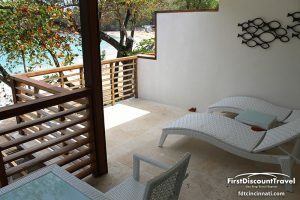 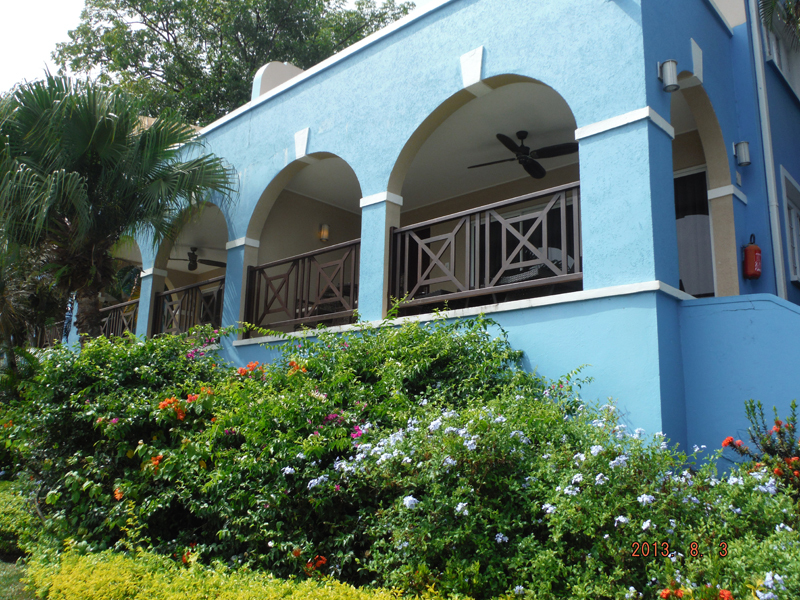 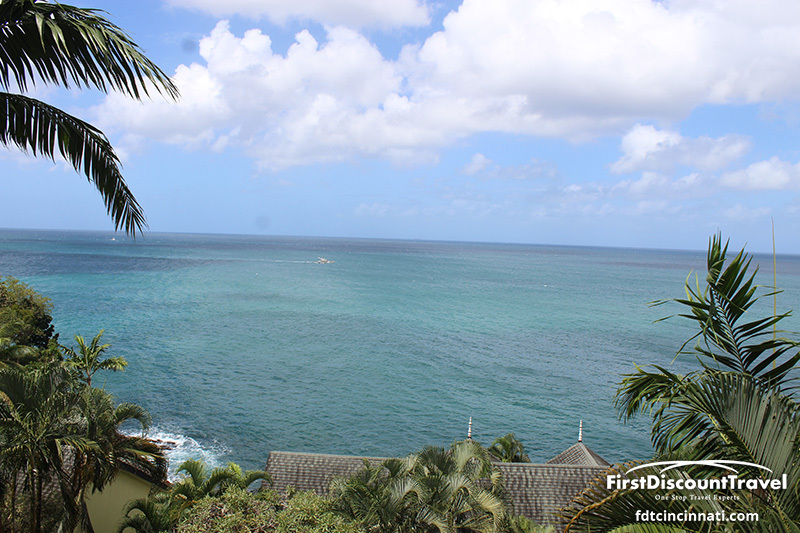 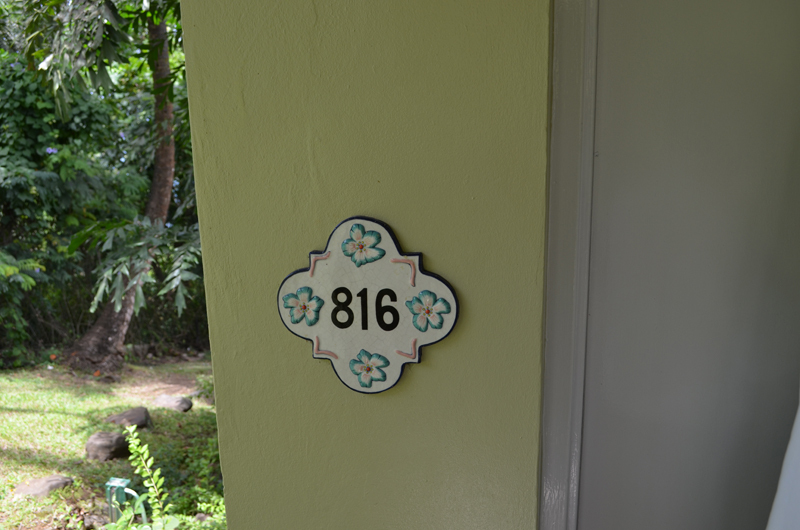 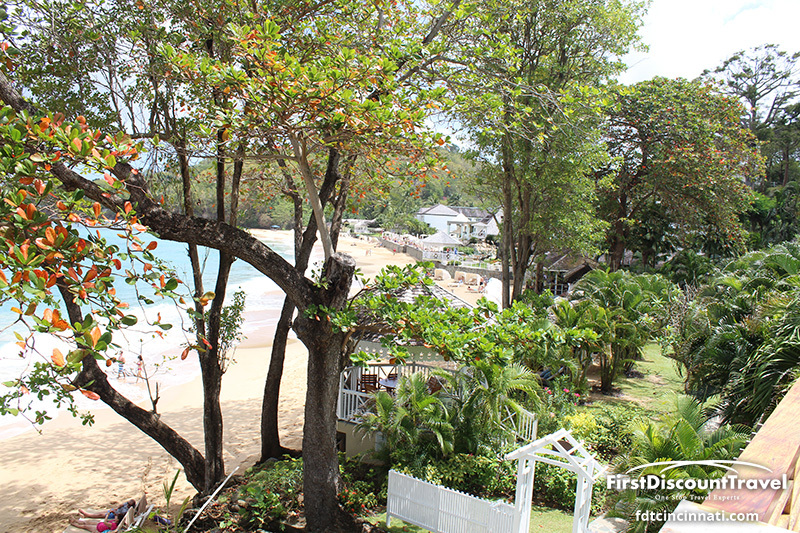 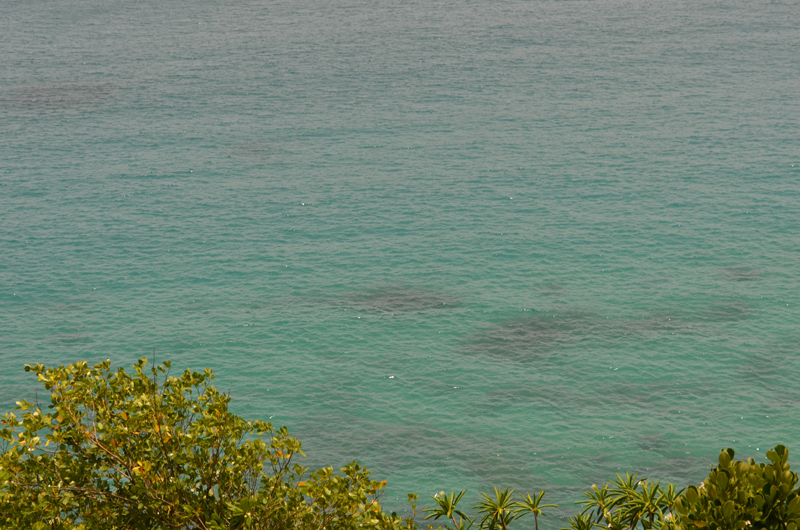 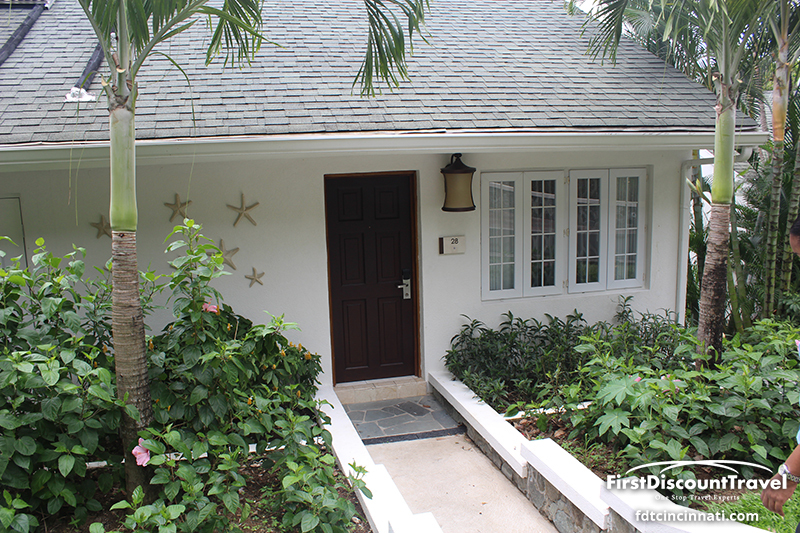 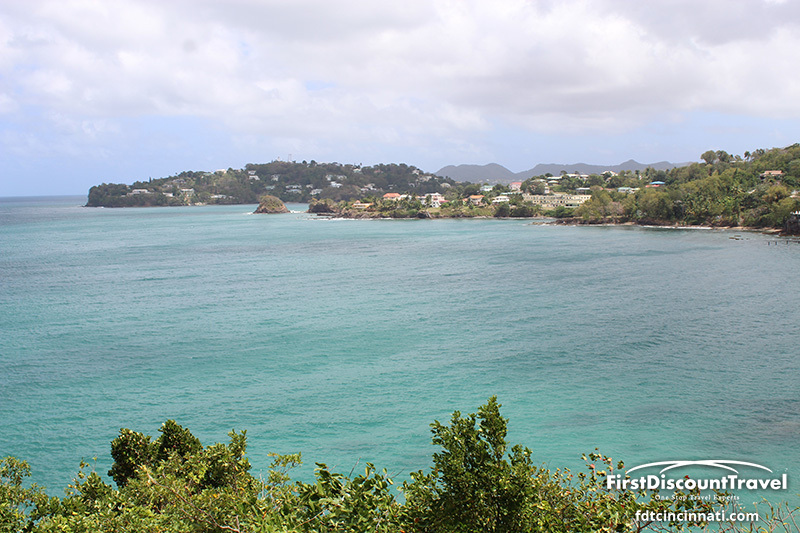 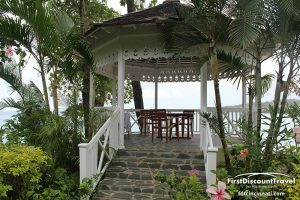 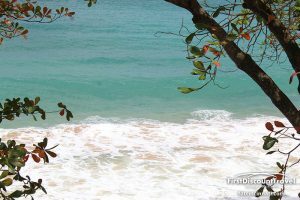 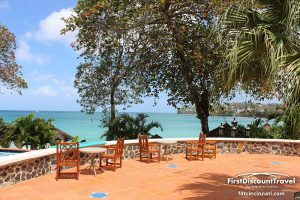 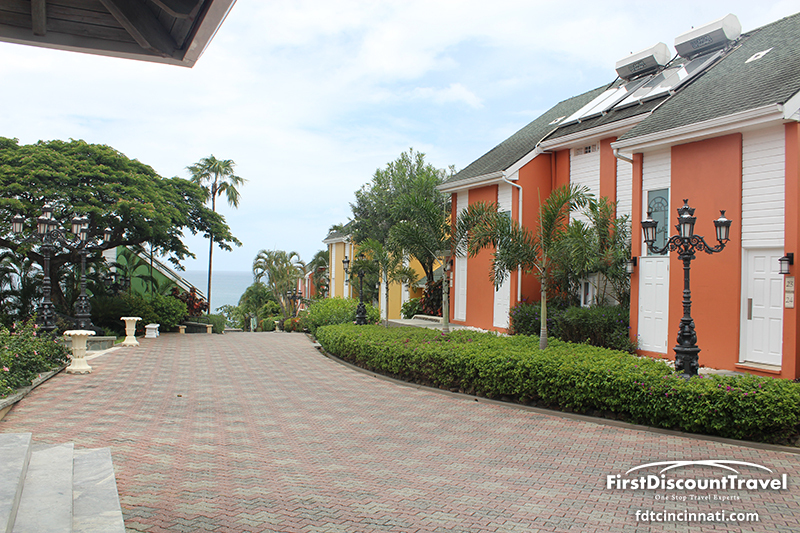 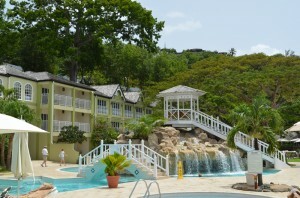 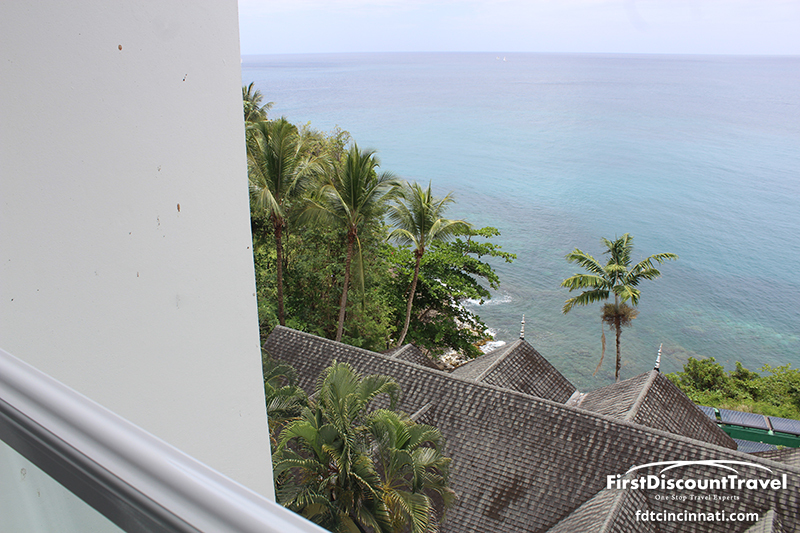 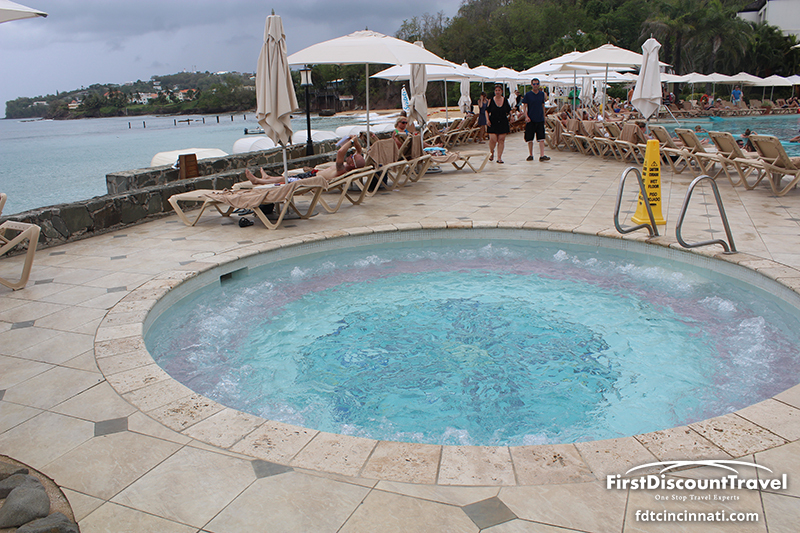 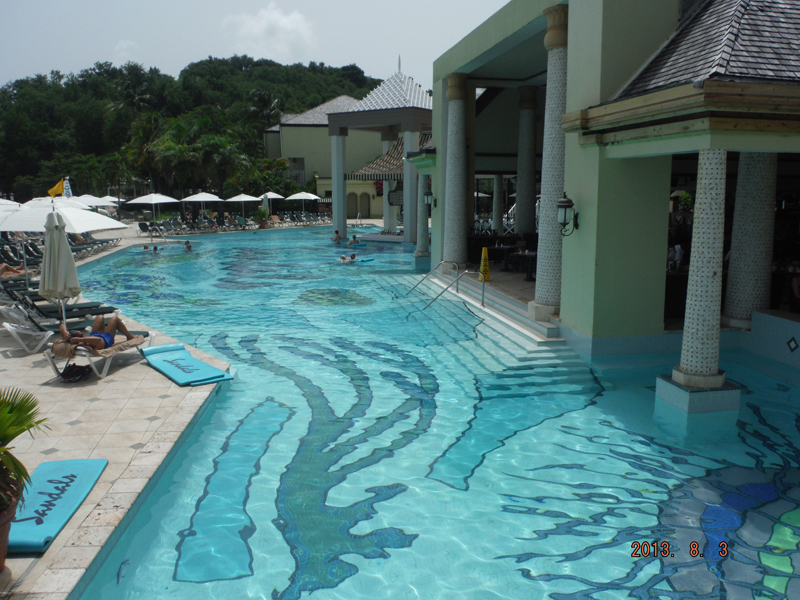 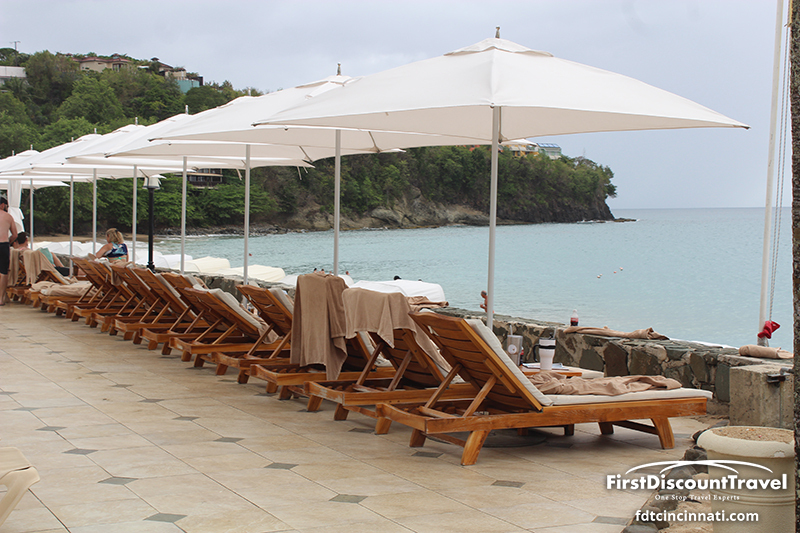 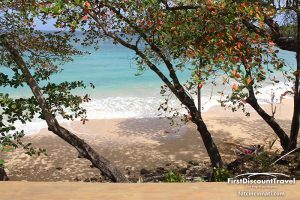 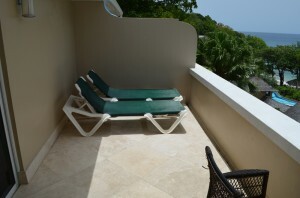 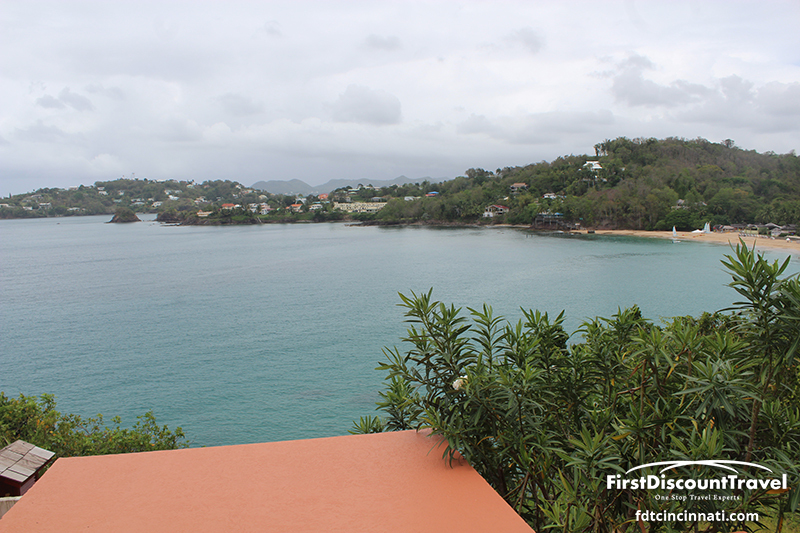 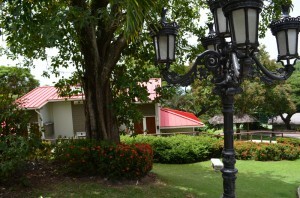 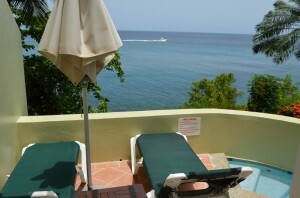 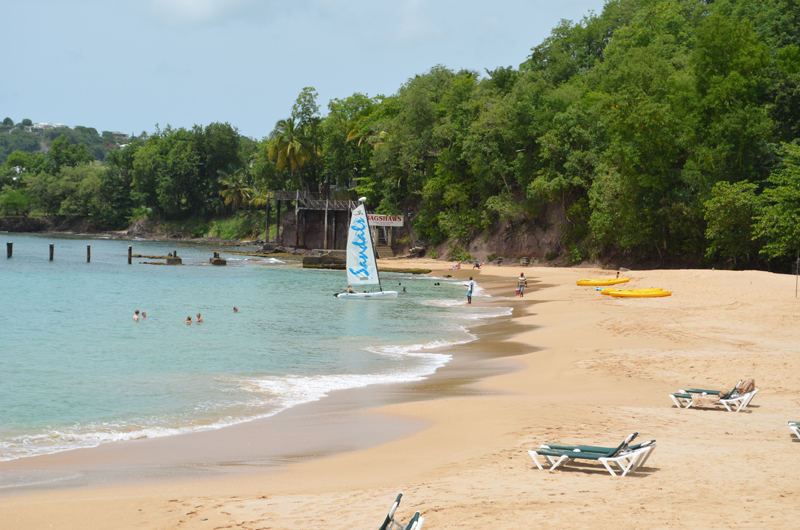 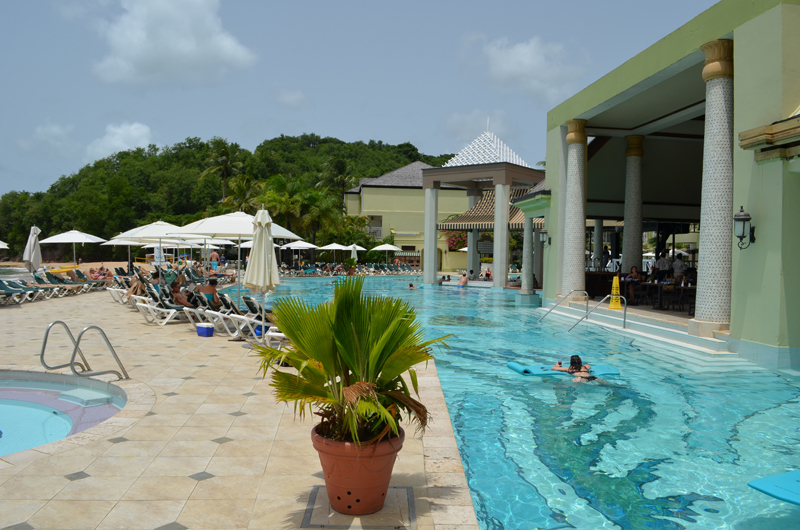 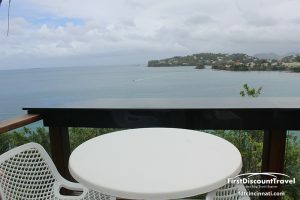 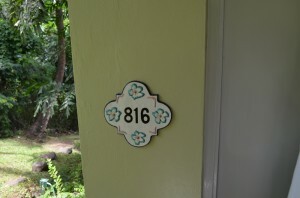 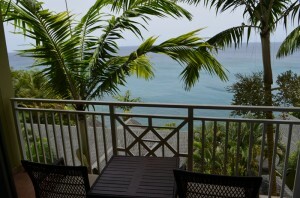 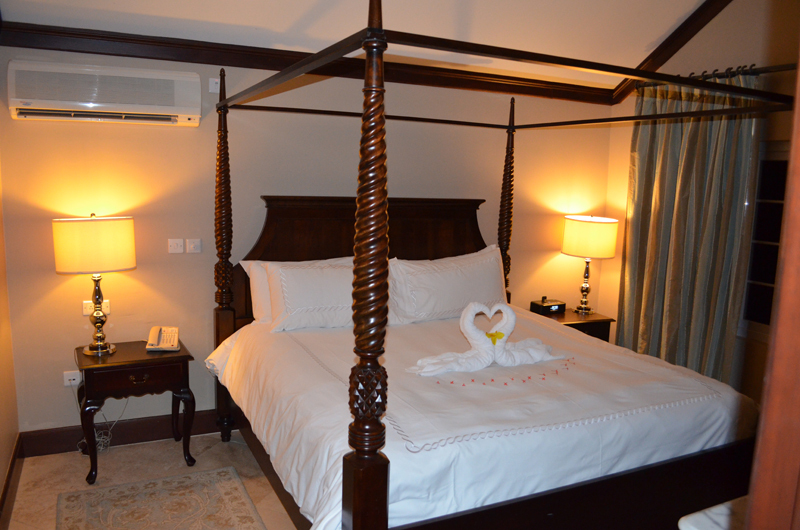 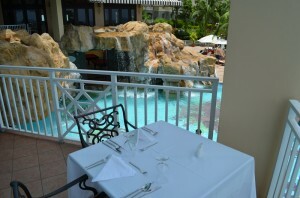 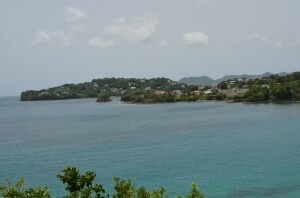 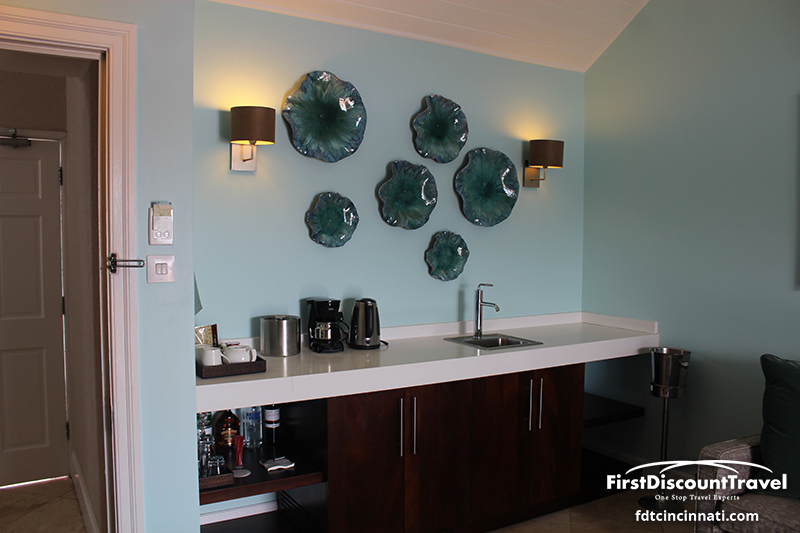 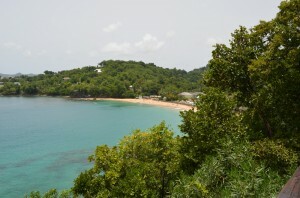 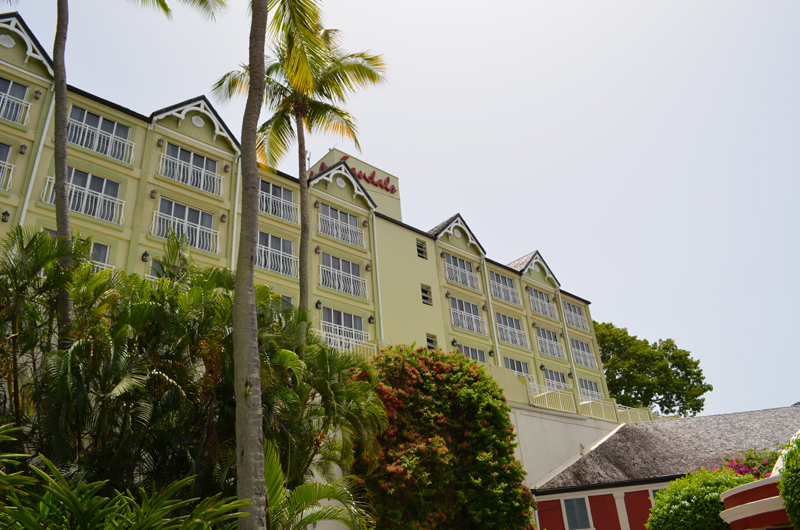 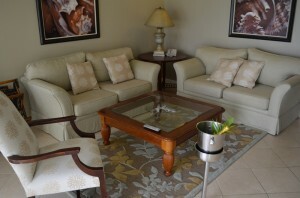 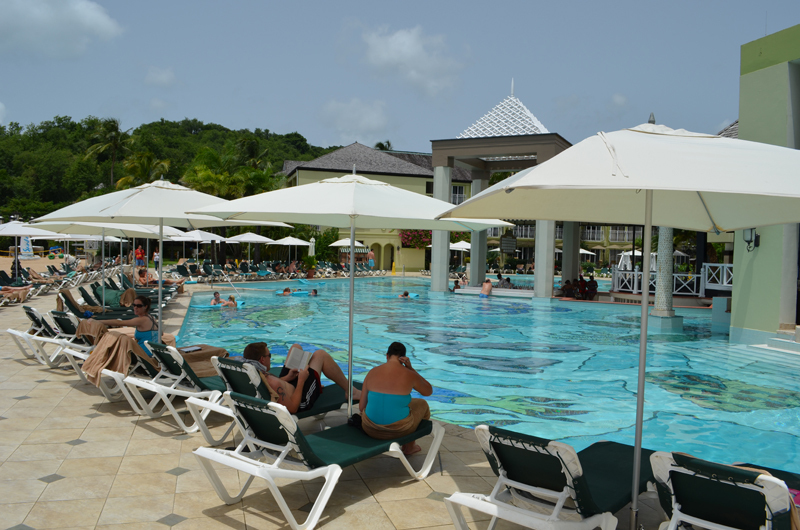 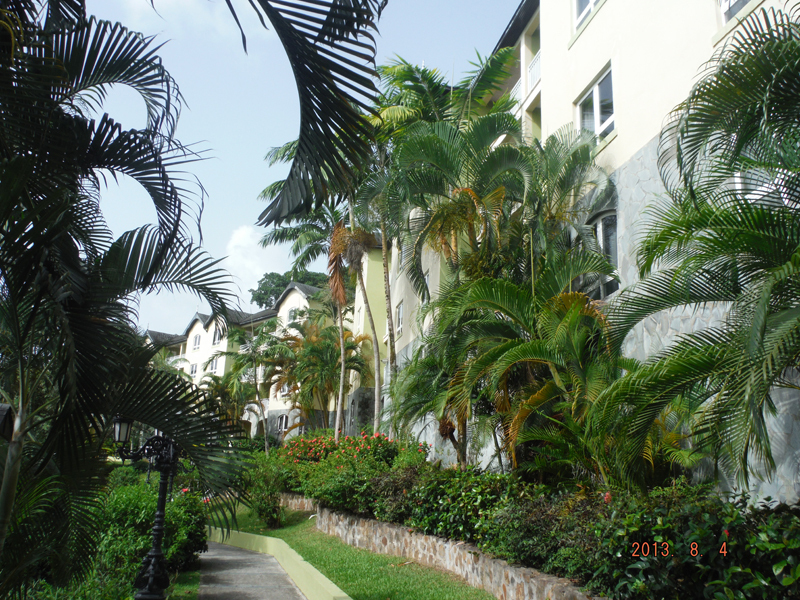 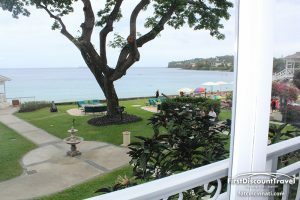 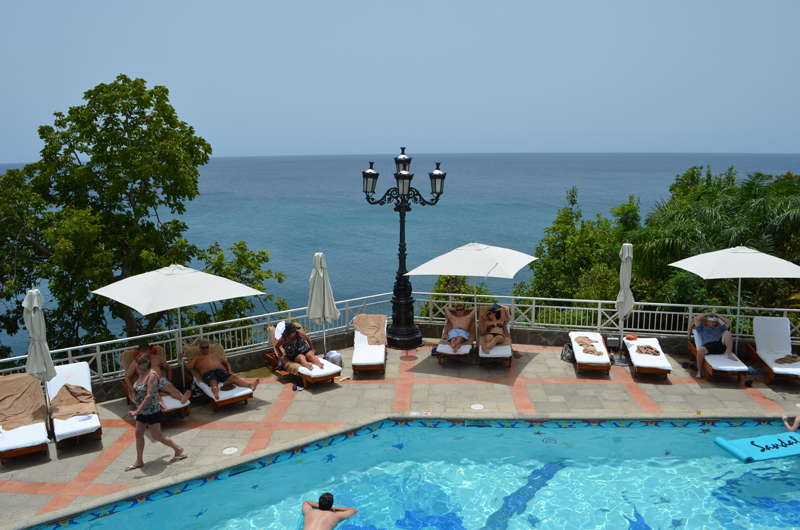 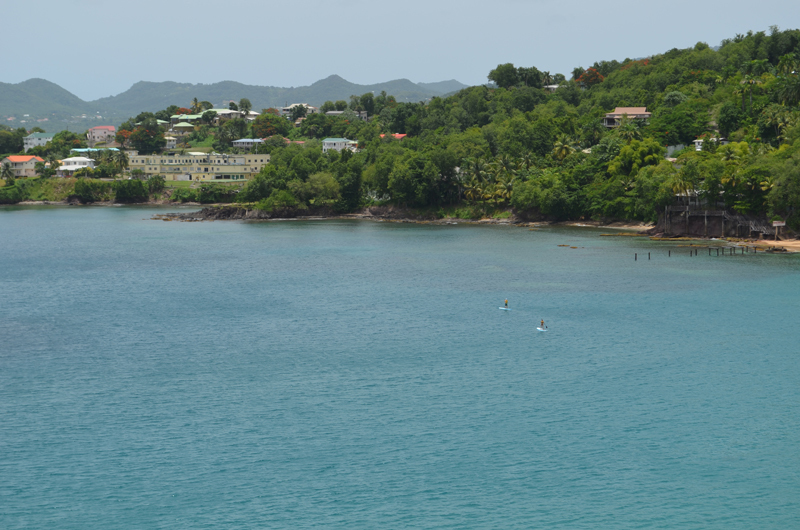 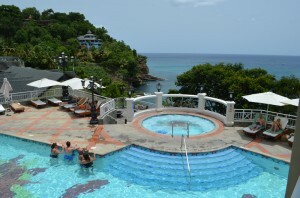 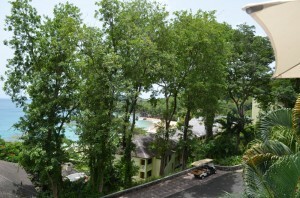 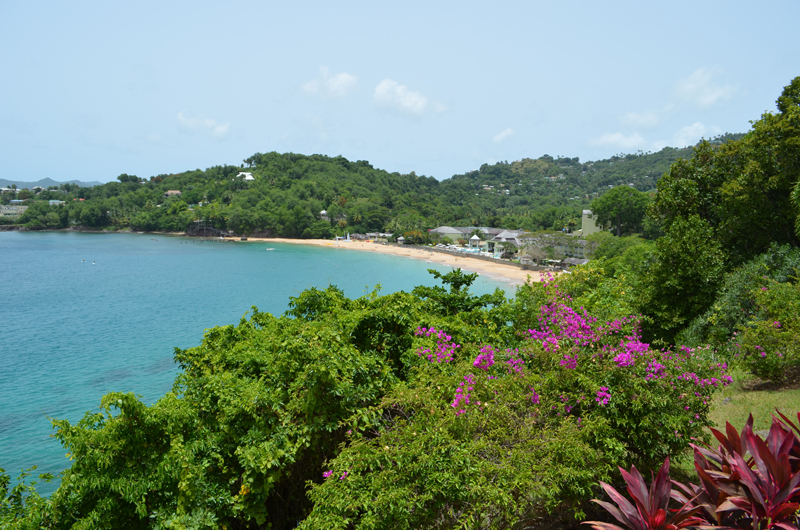 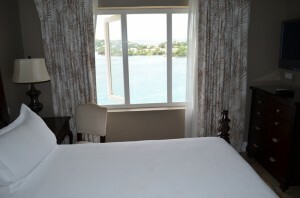 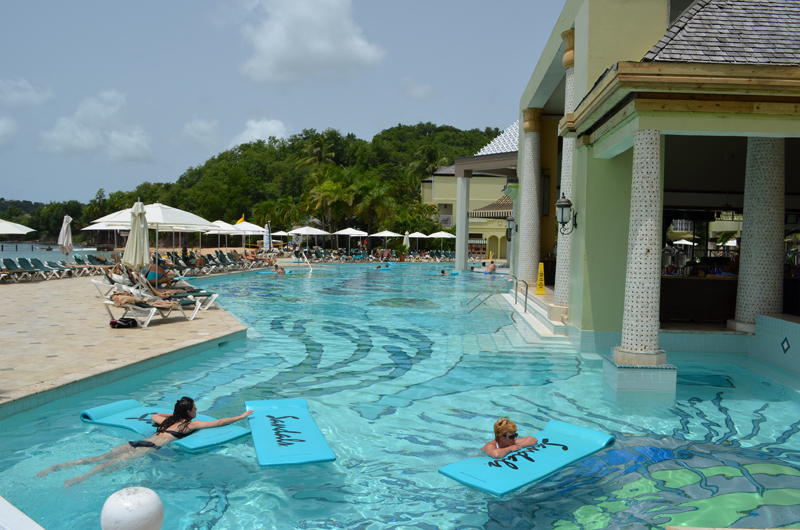 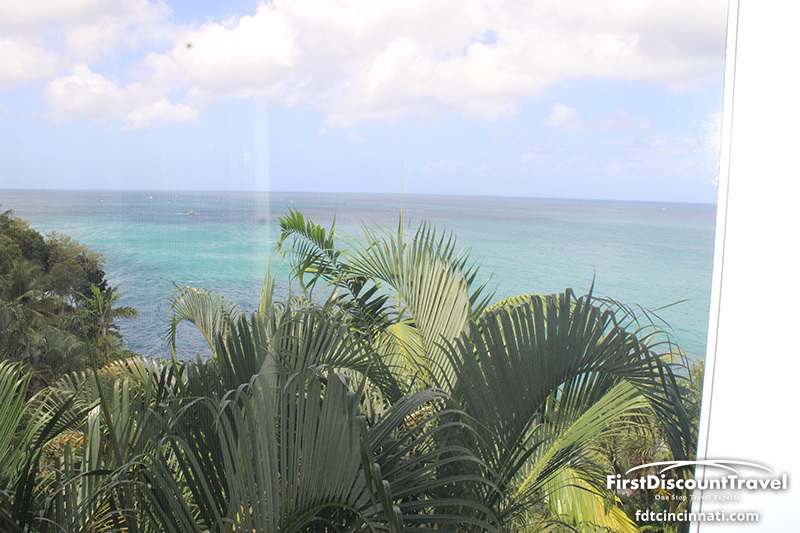 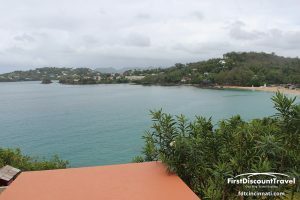 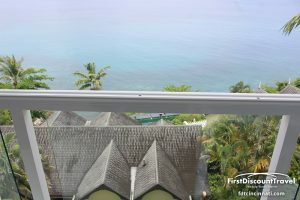 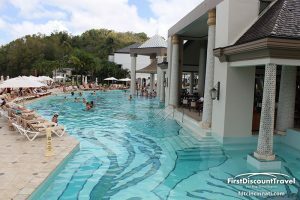 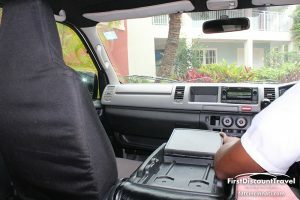 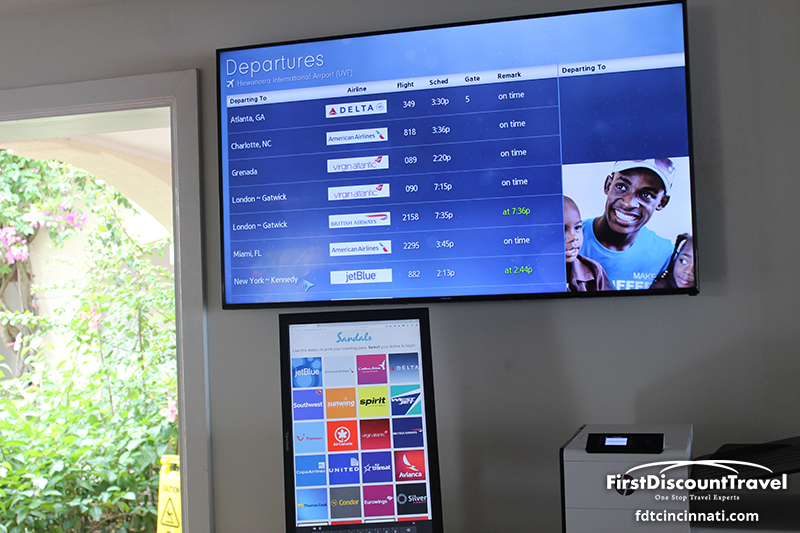 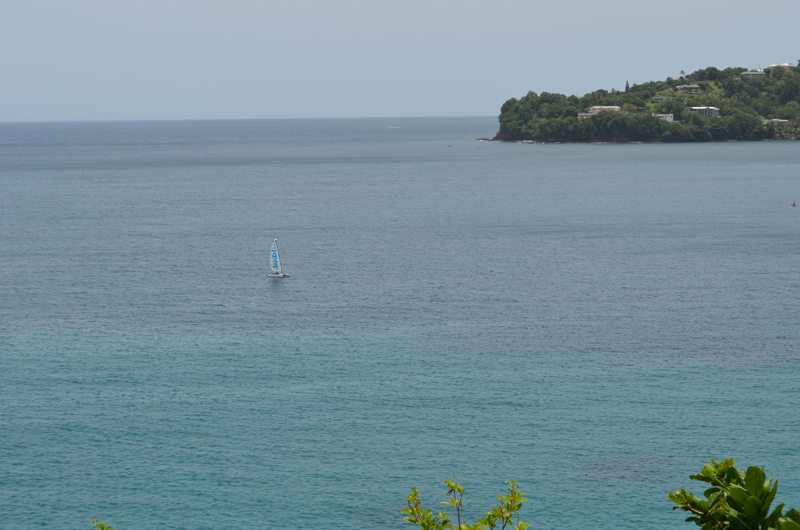 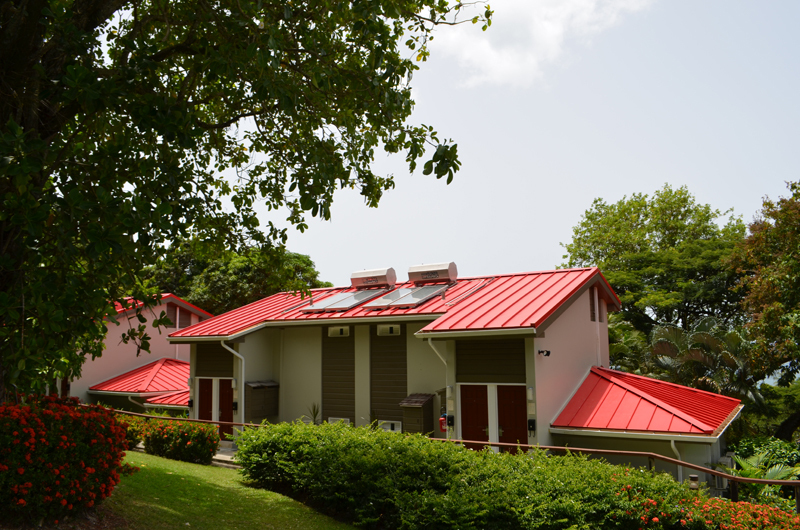 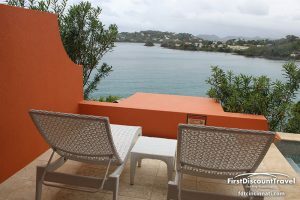 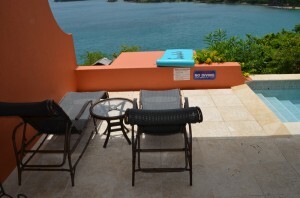 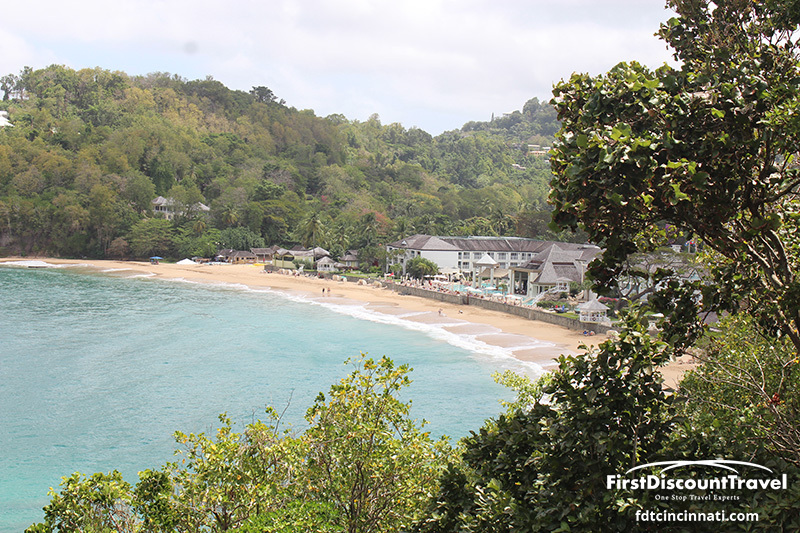 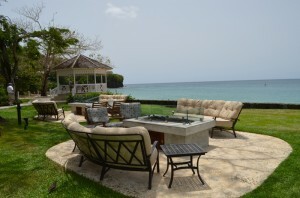 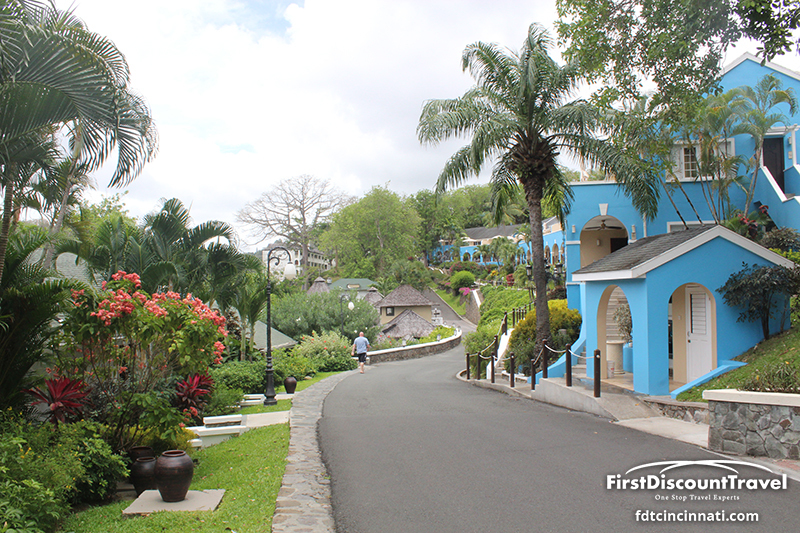 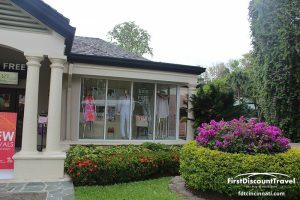 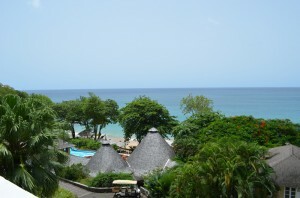 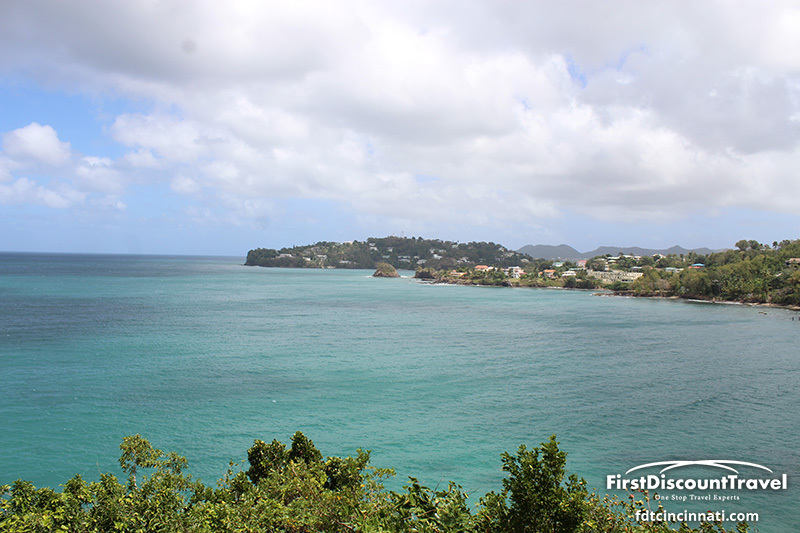 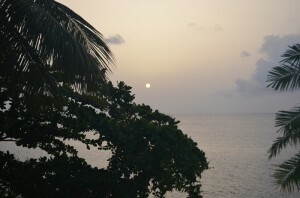 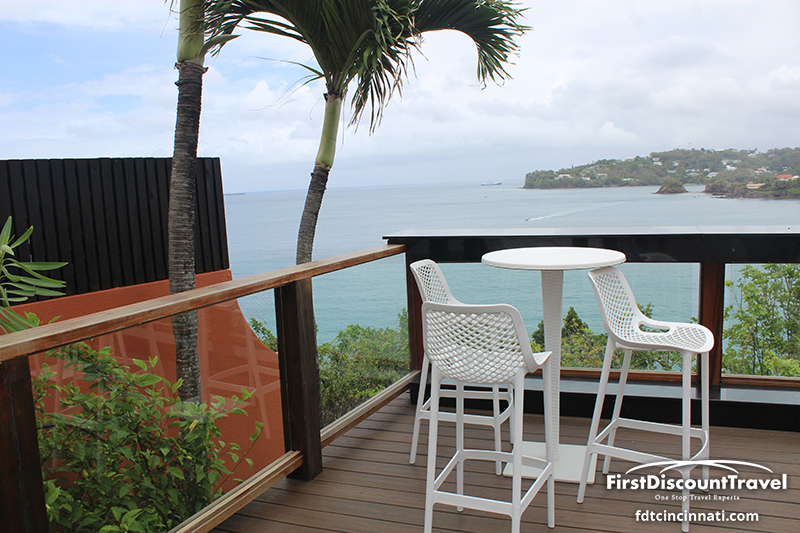 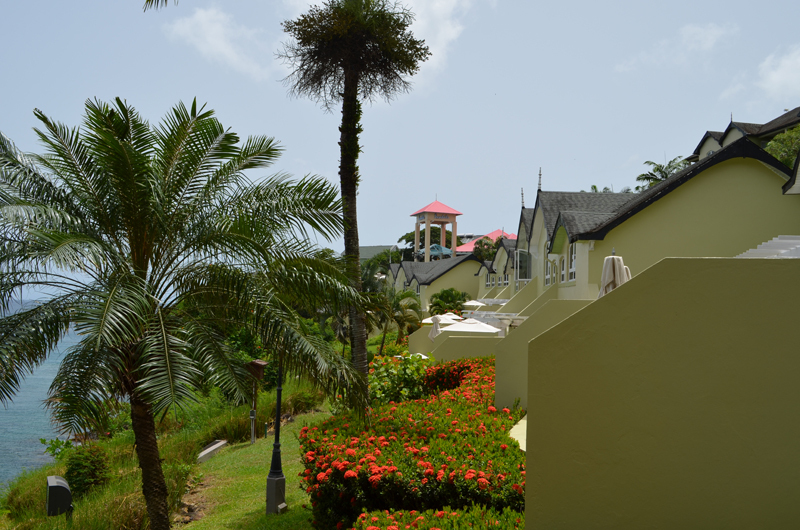 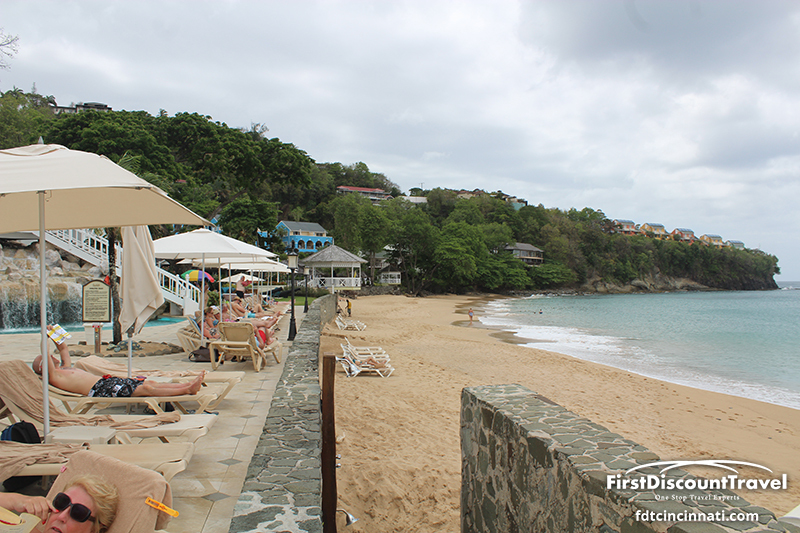 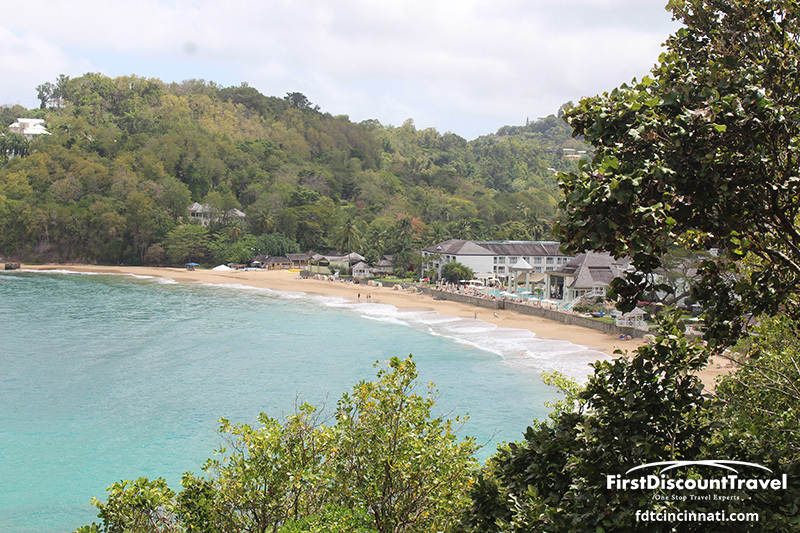 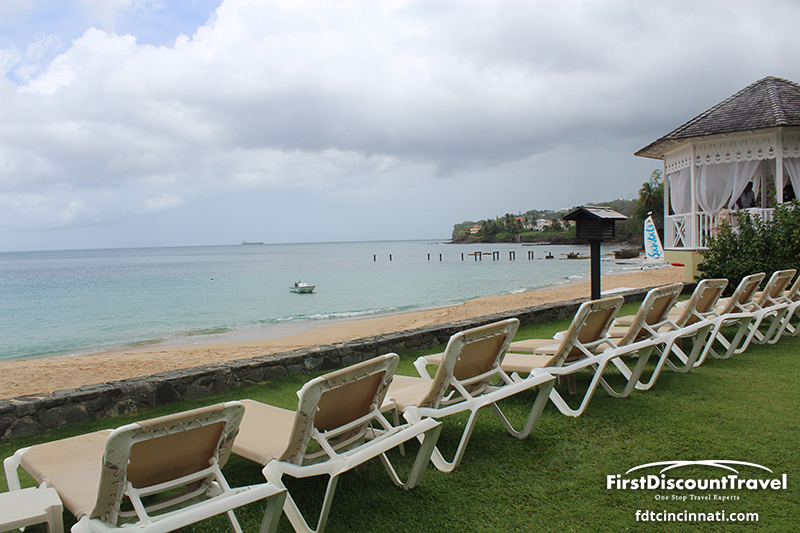 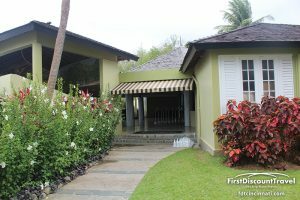 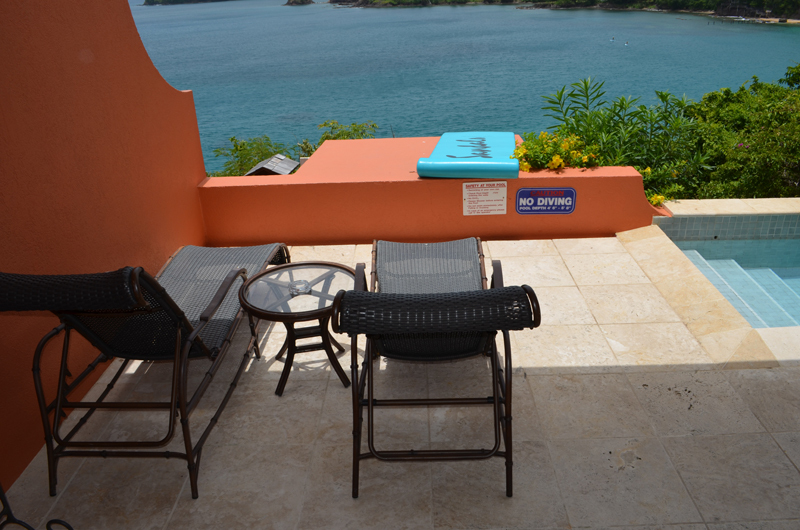 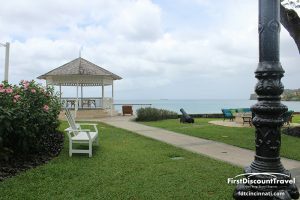 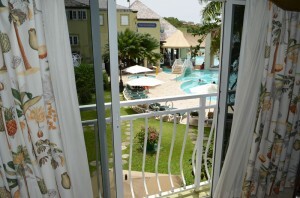 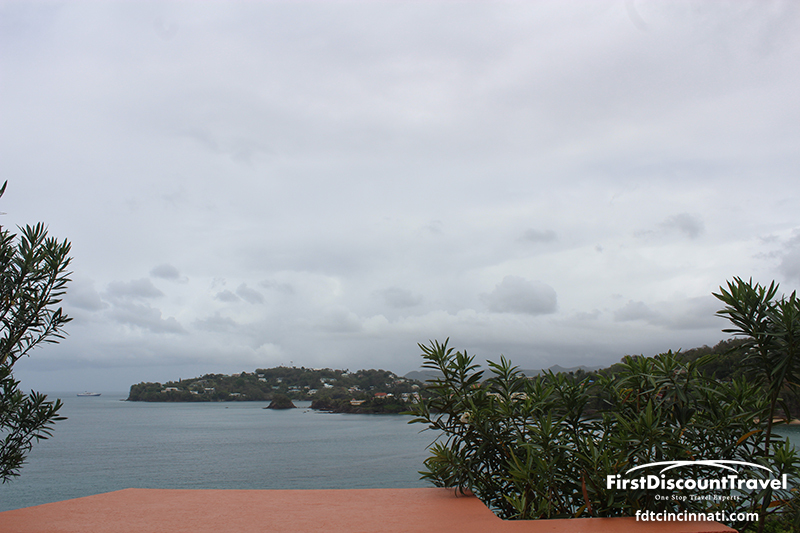 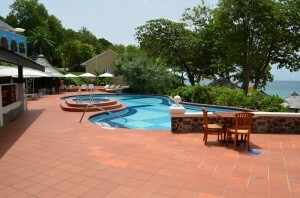 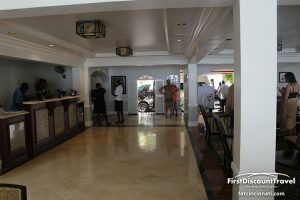 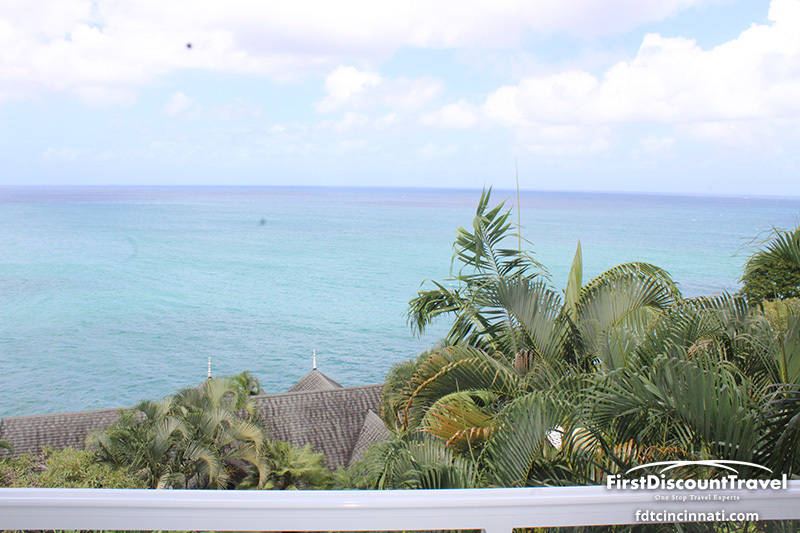 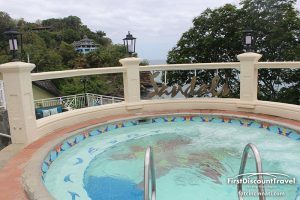 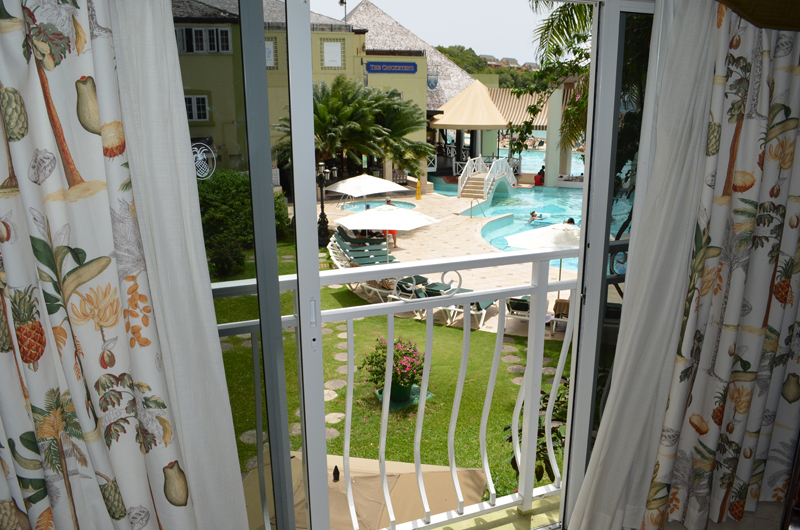 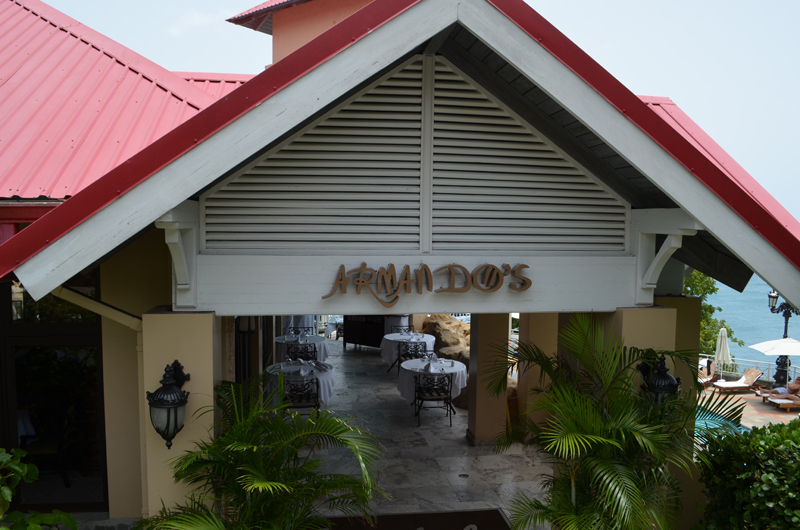 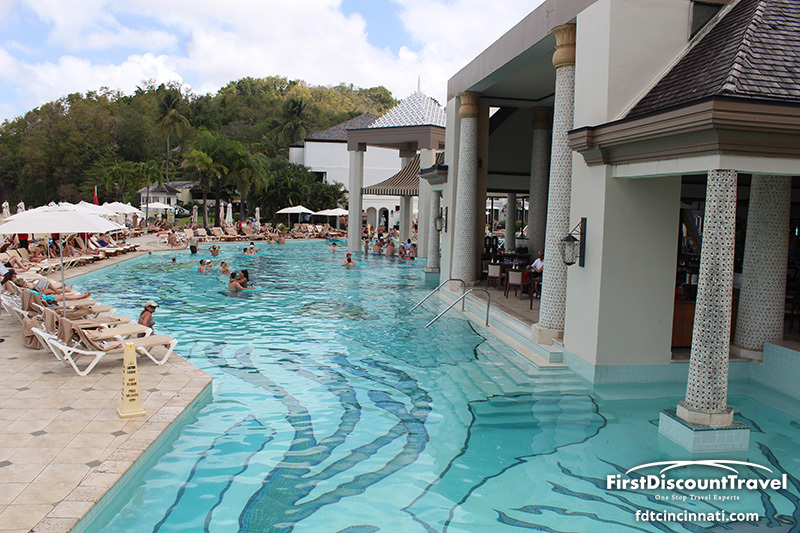 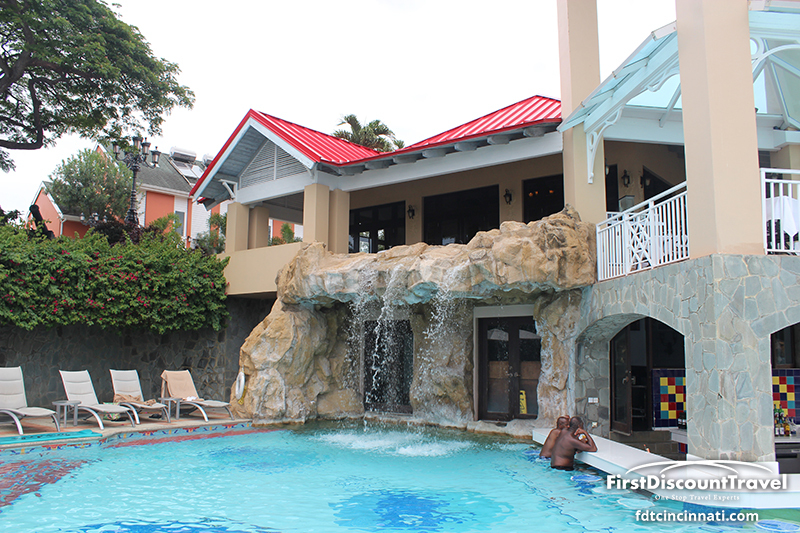 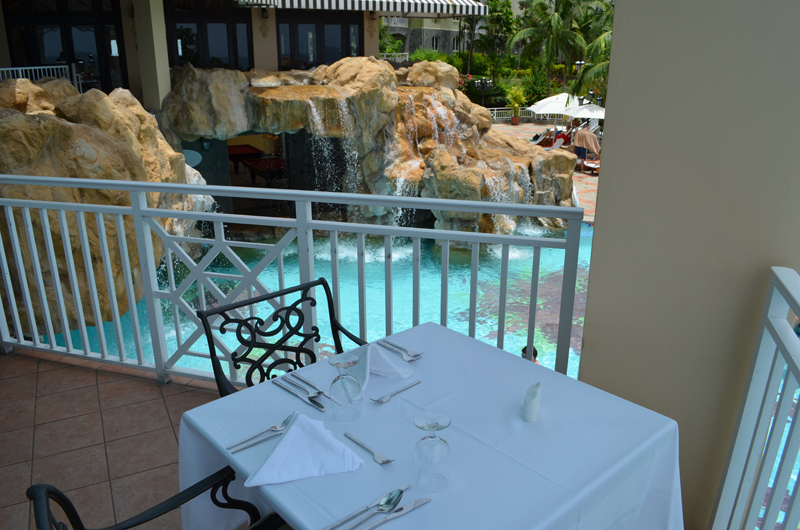 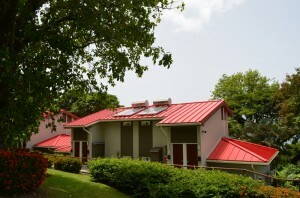 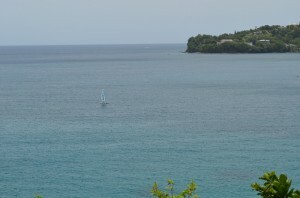 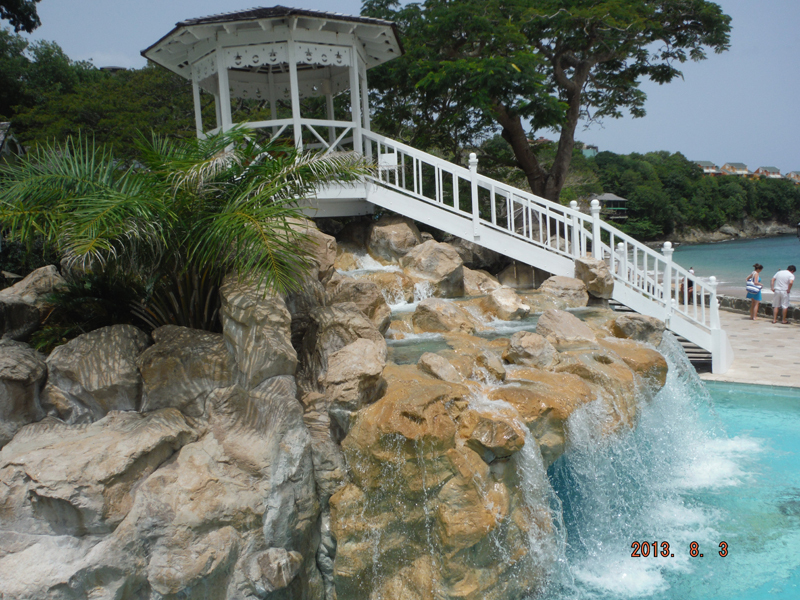 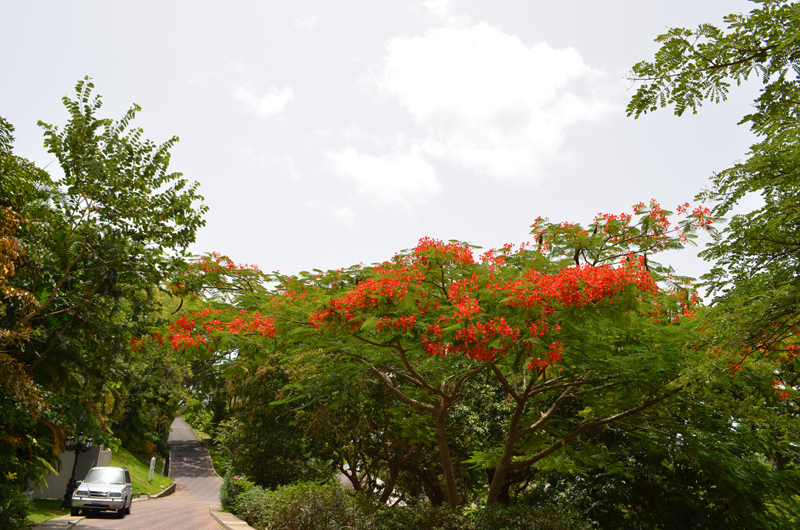 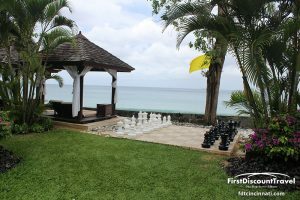 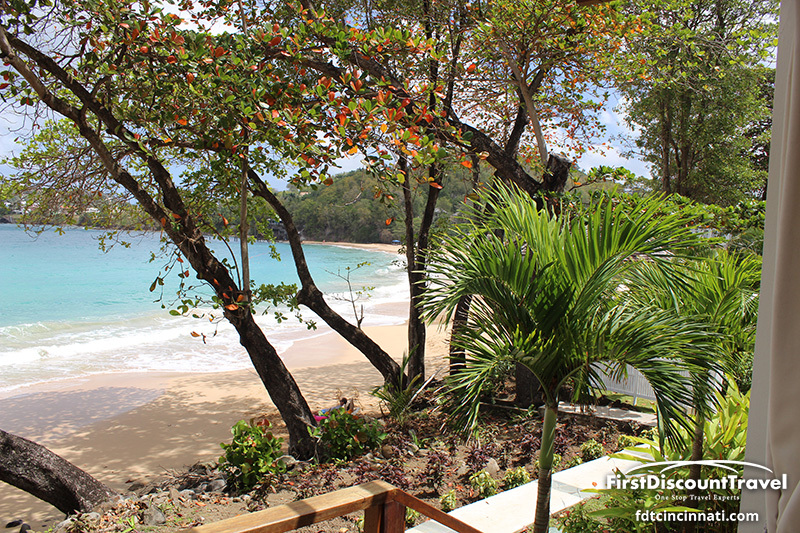 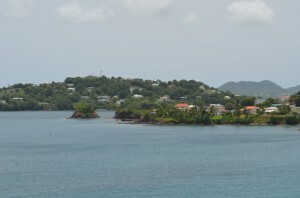 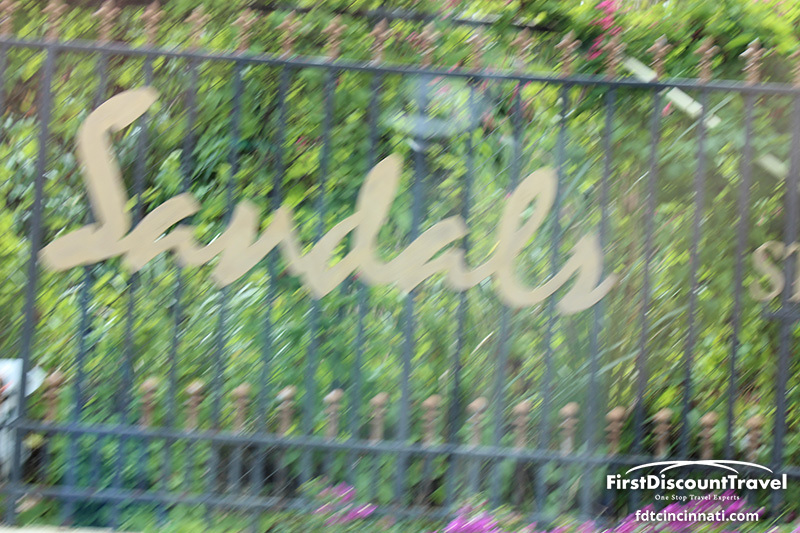 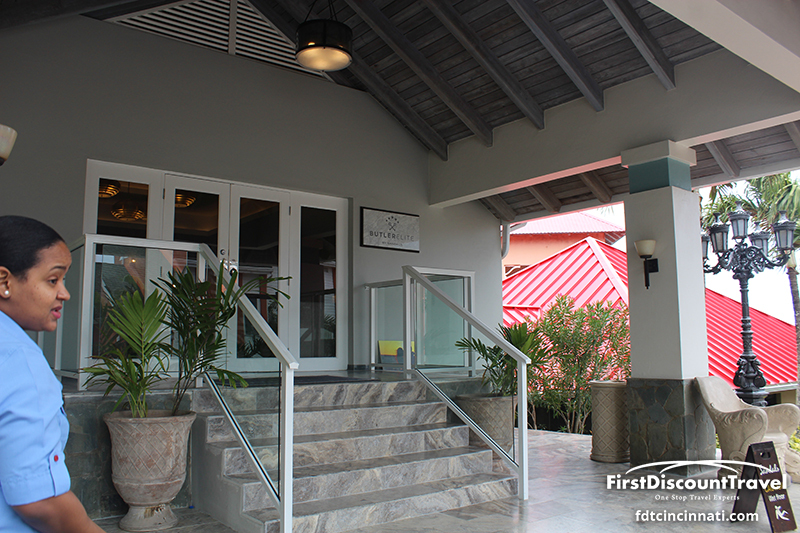 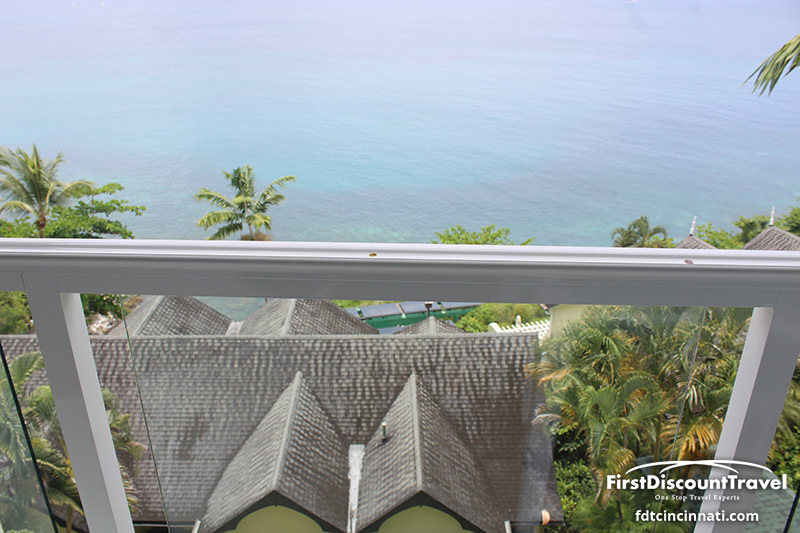 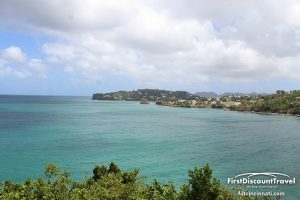 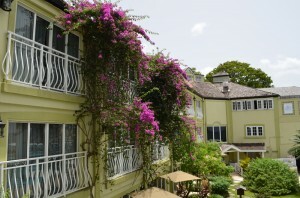 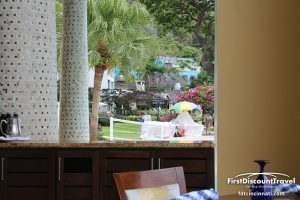 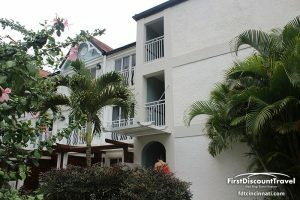 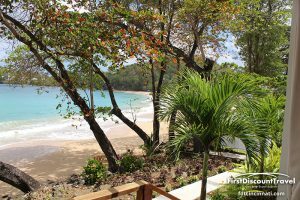 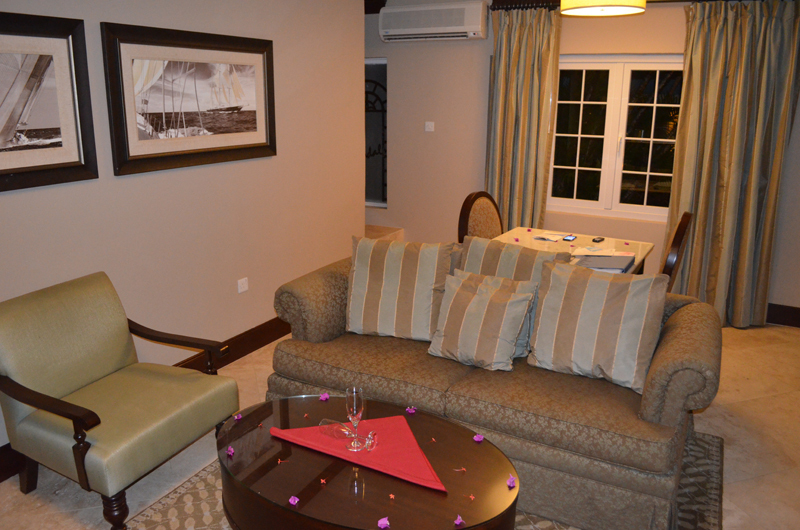 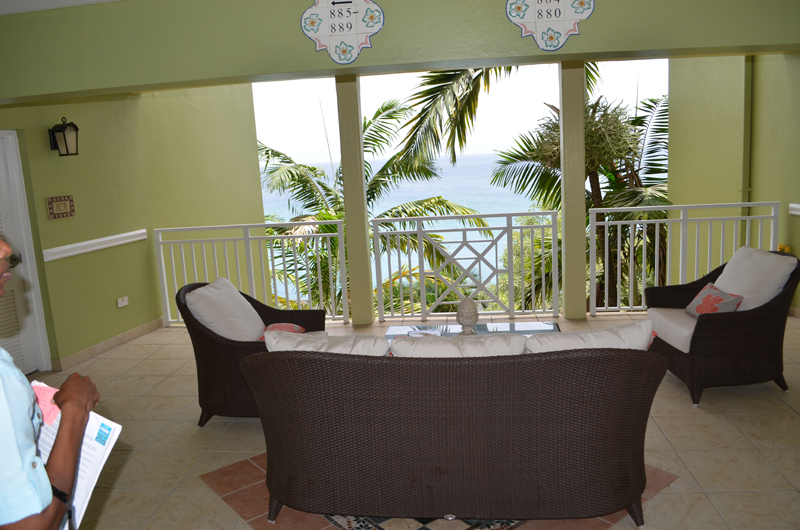 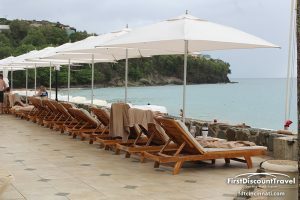 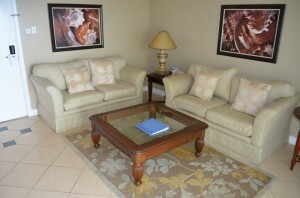 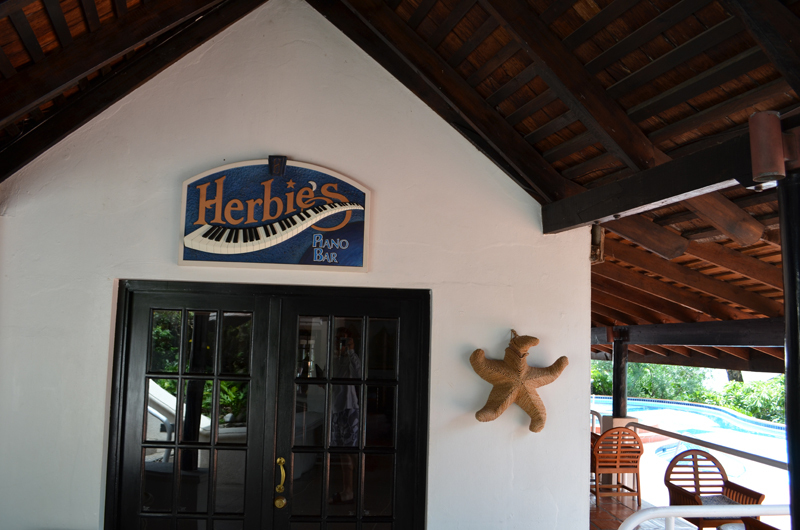 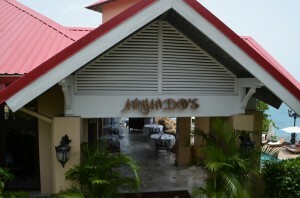 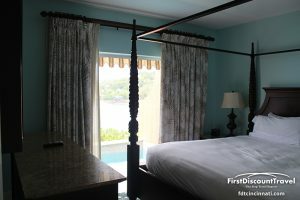 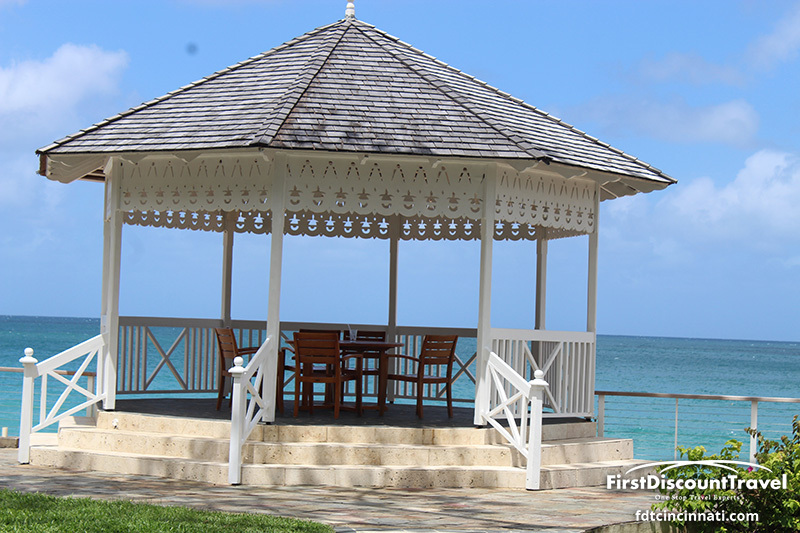 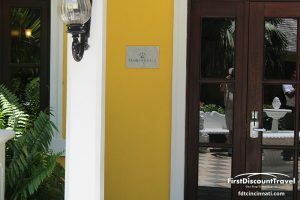 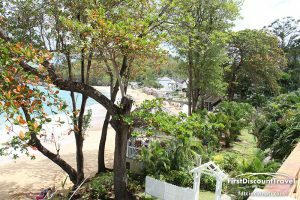 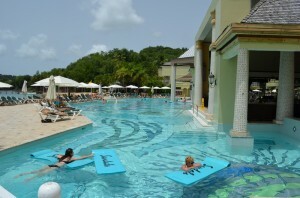 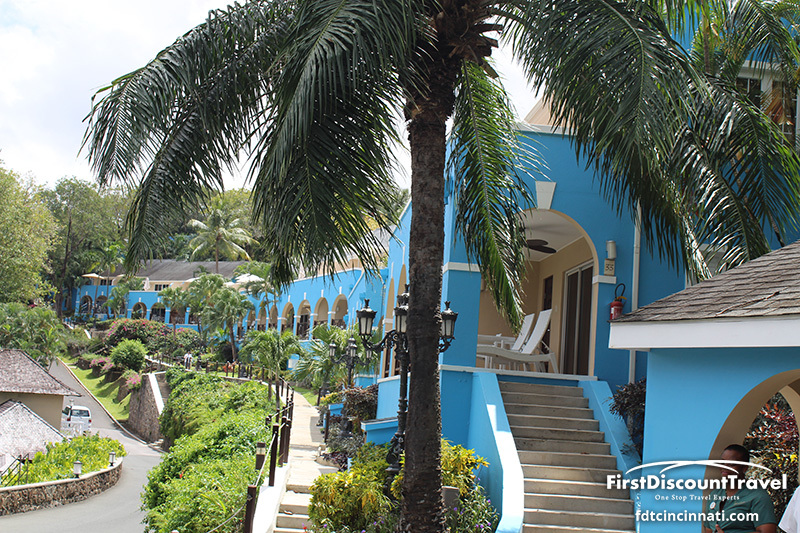 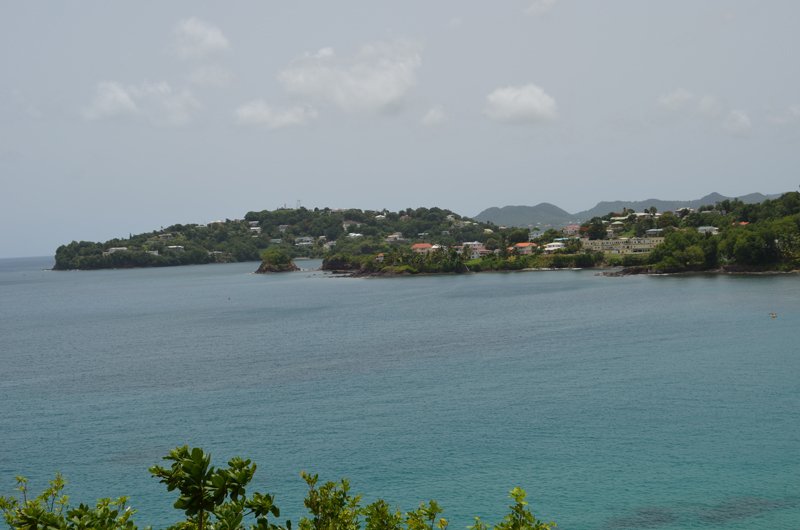 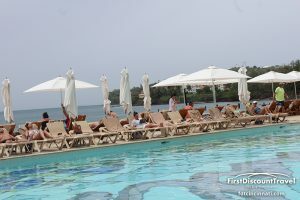 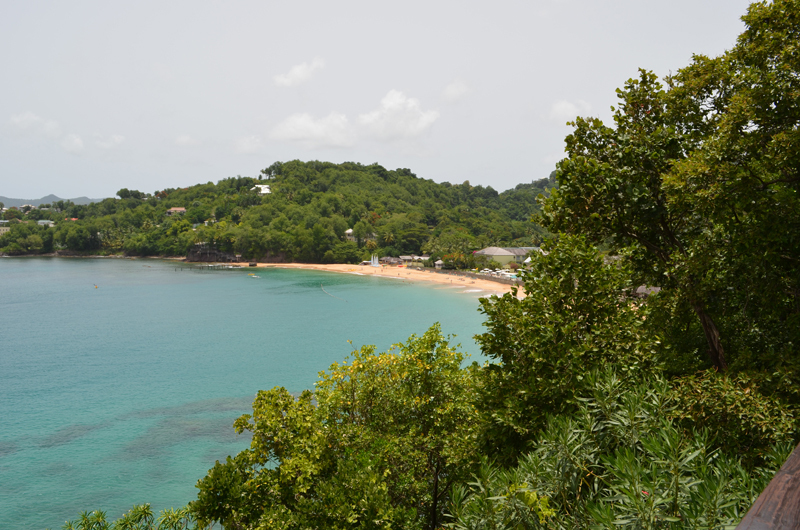 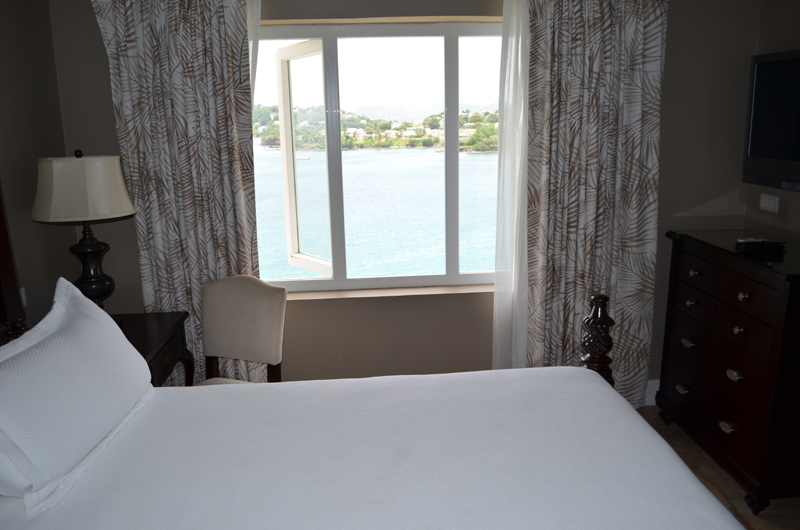 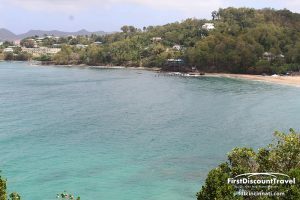 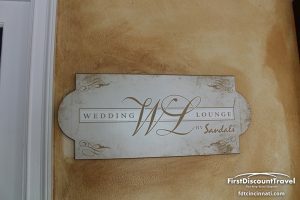 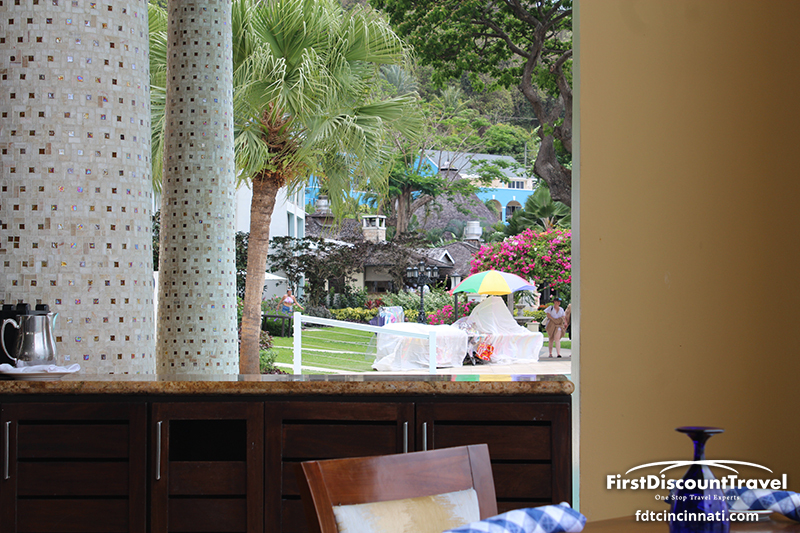 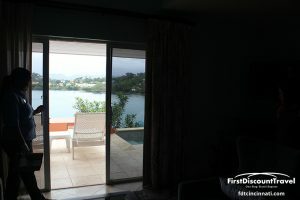 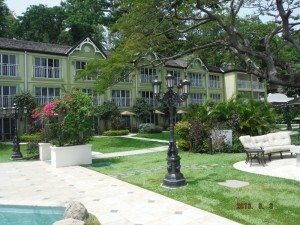 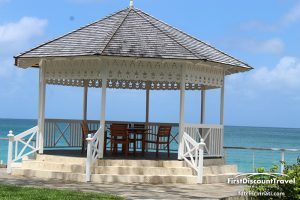 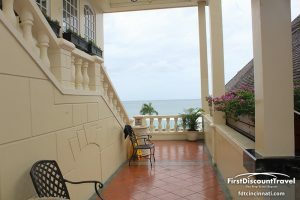 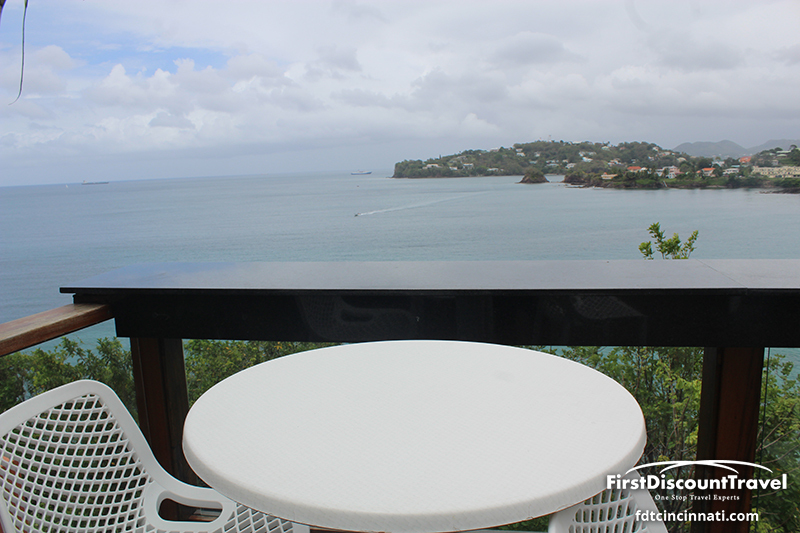 Sandals La Toc is located just South of Castries, about an hour from the Hewanorra Airport. 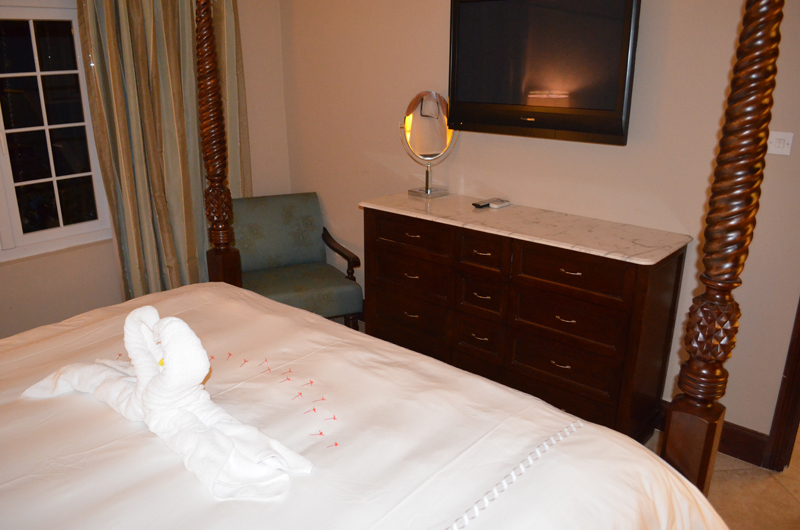 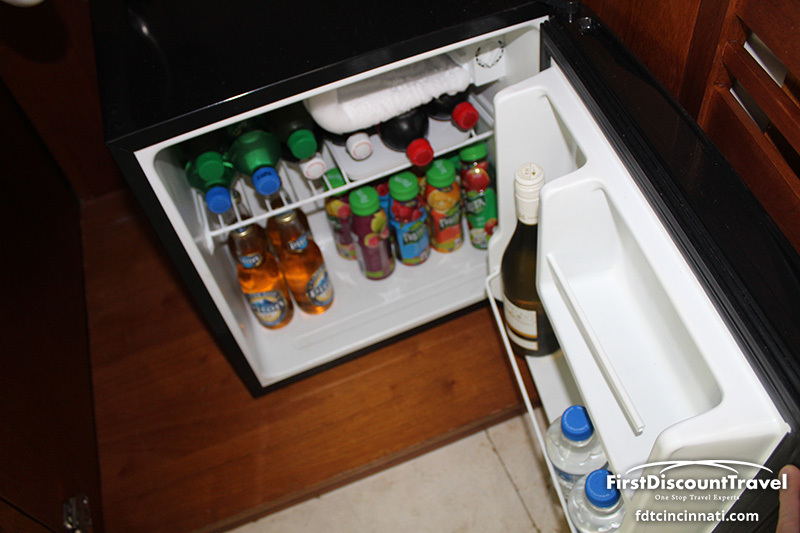 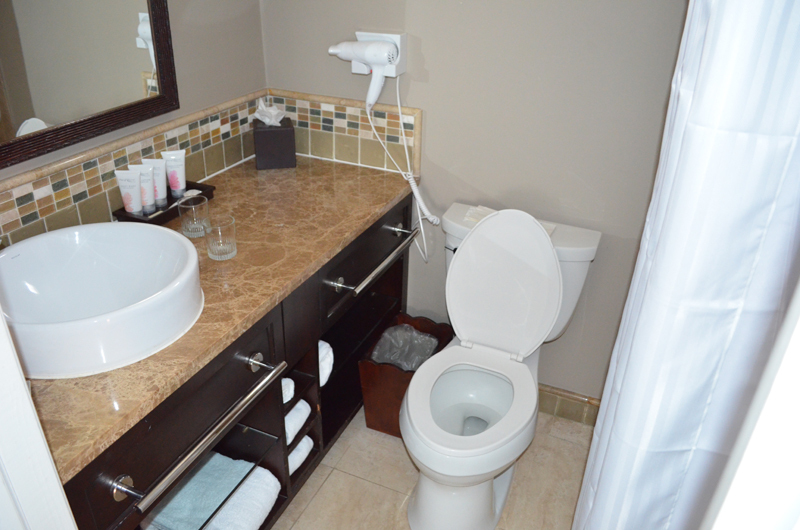 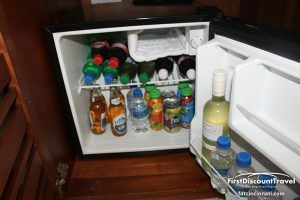 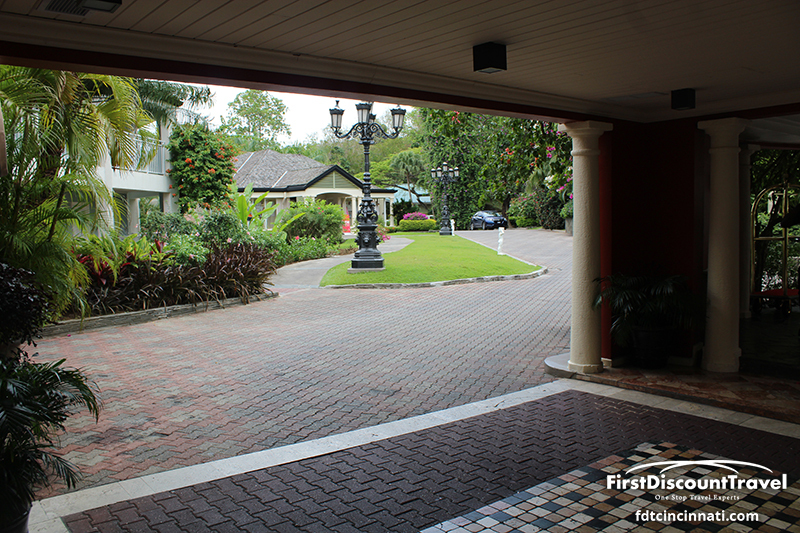 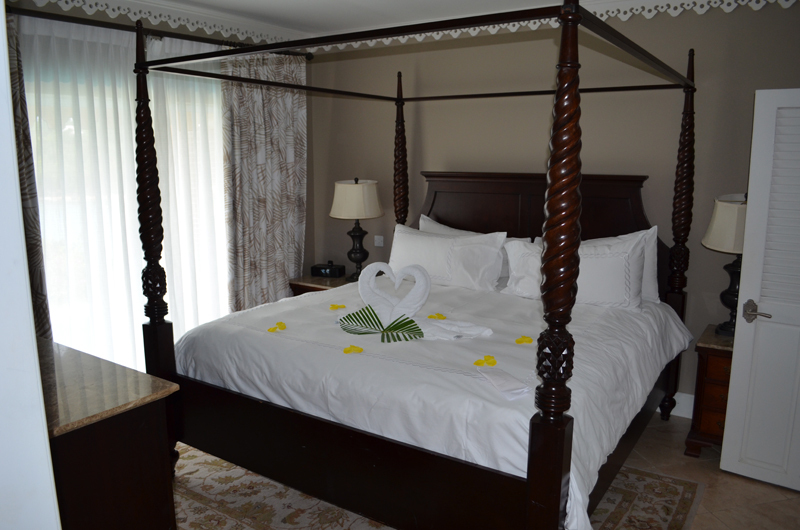 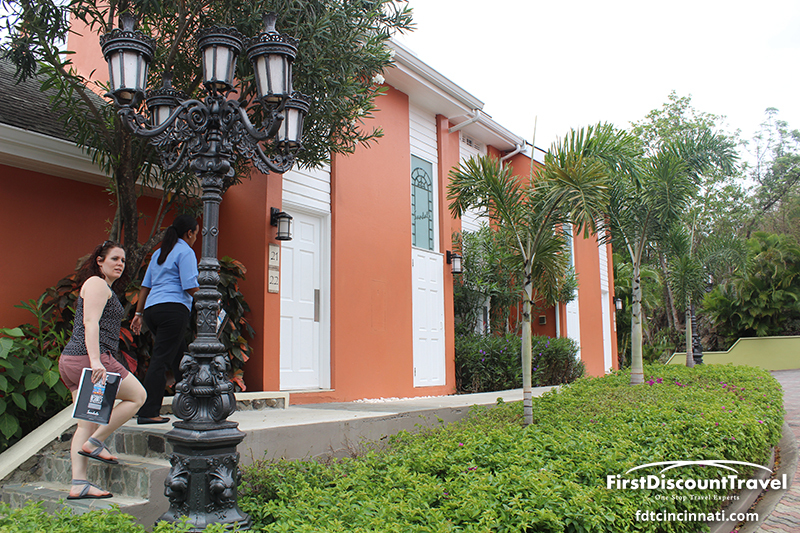 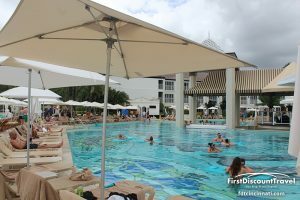 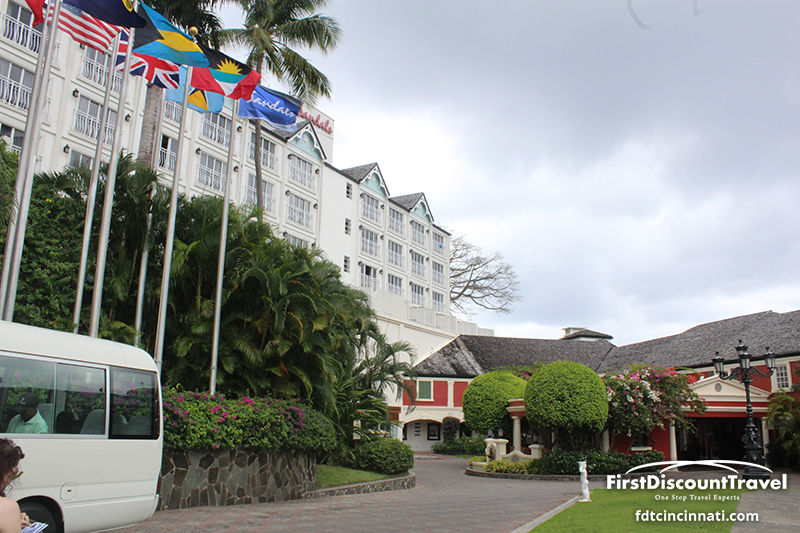 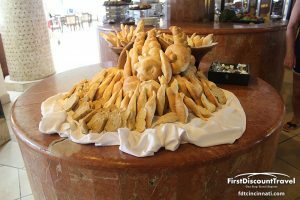 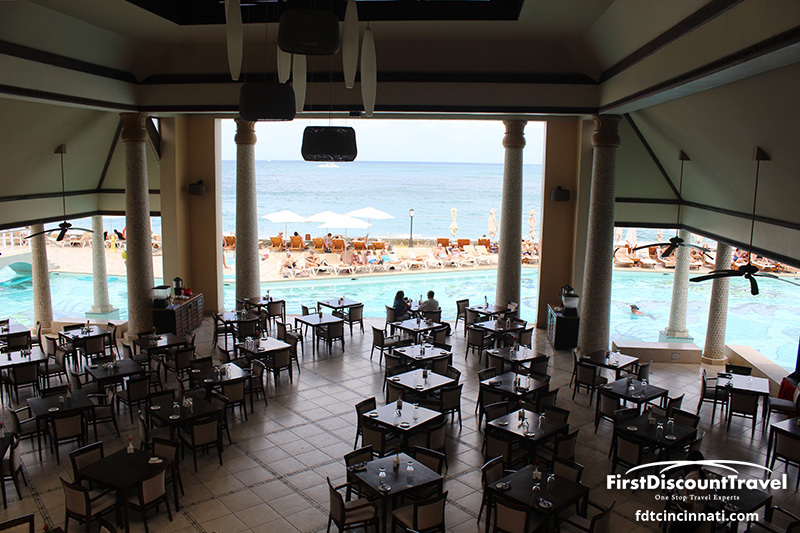 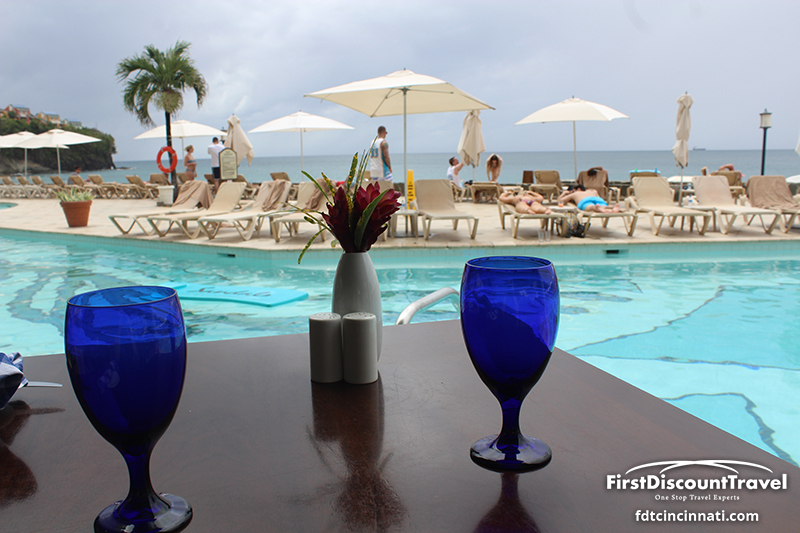 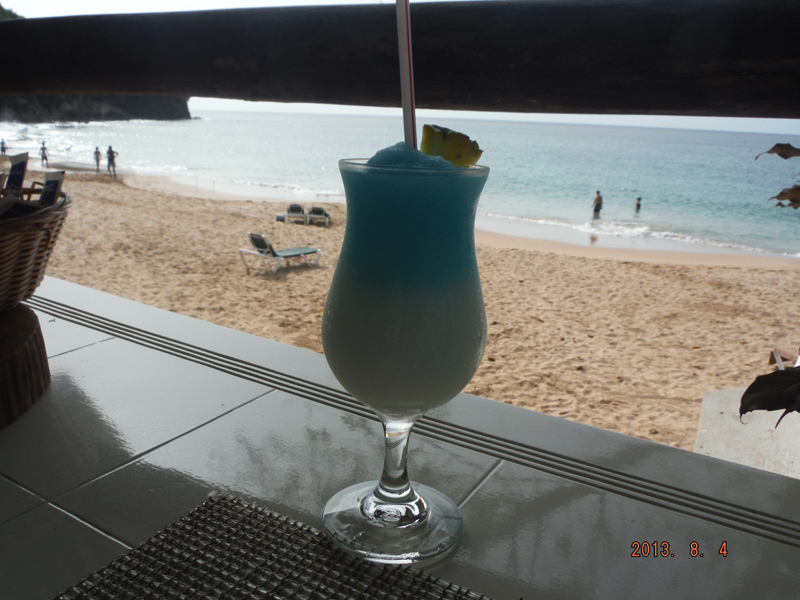 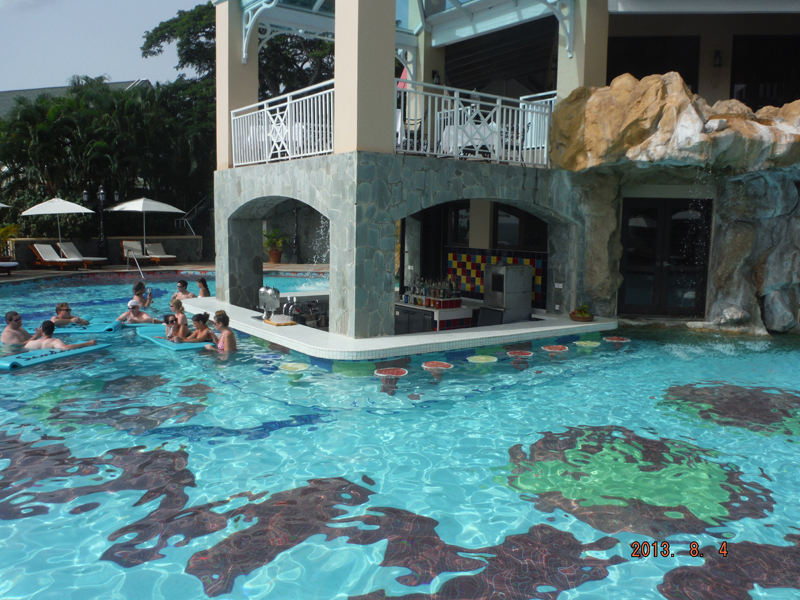 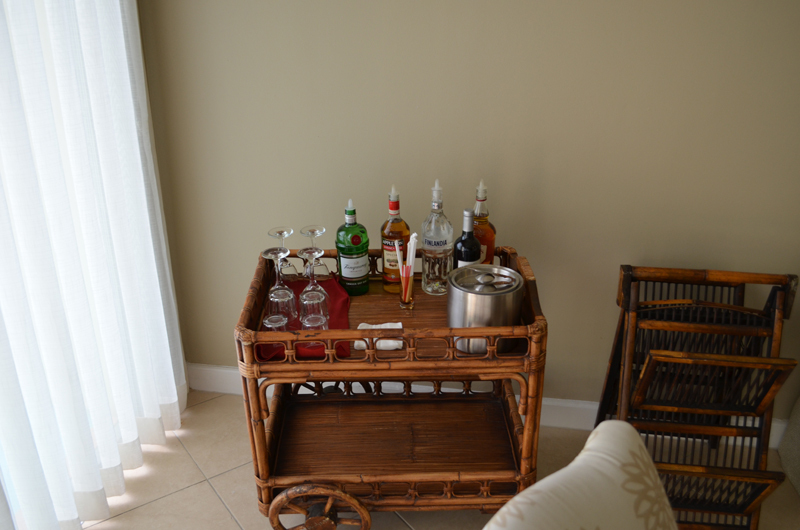 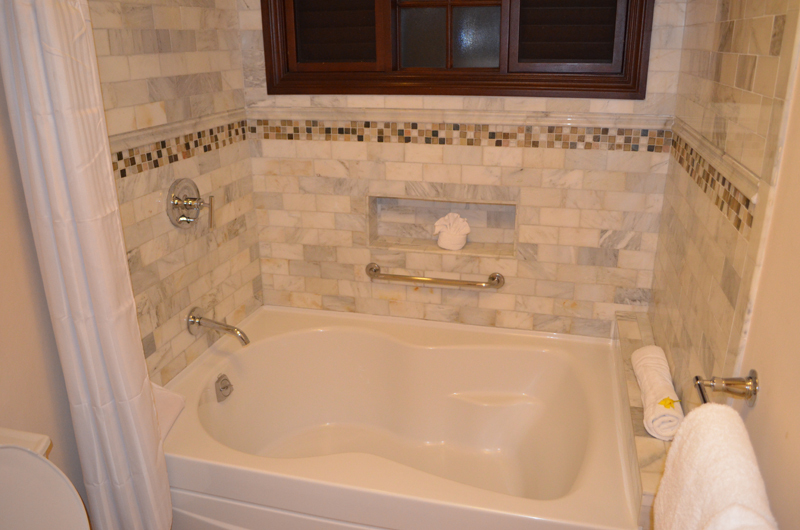 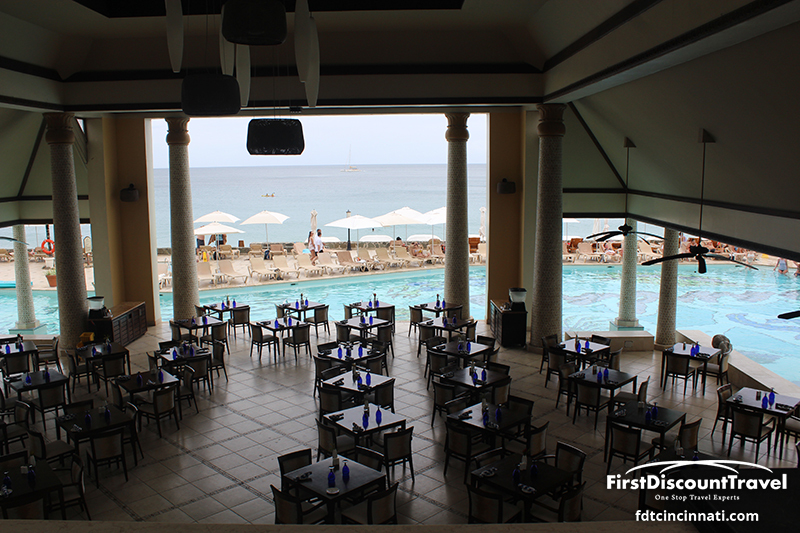 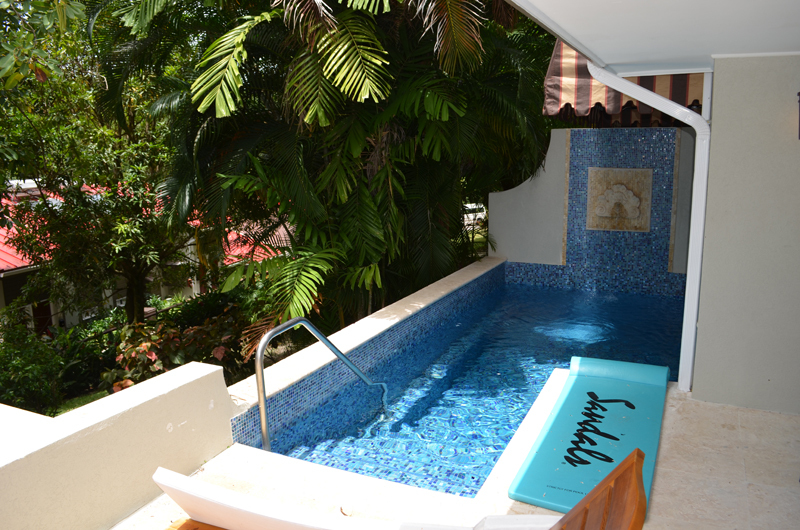 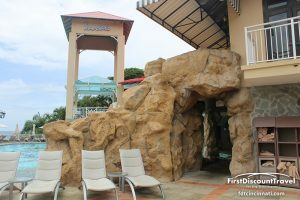 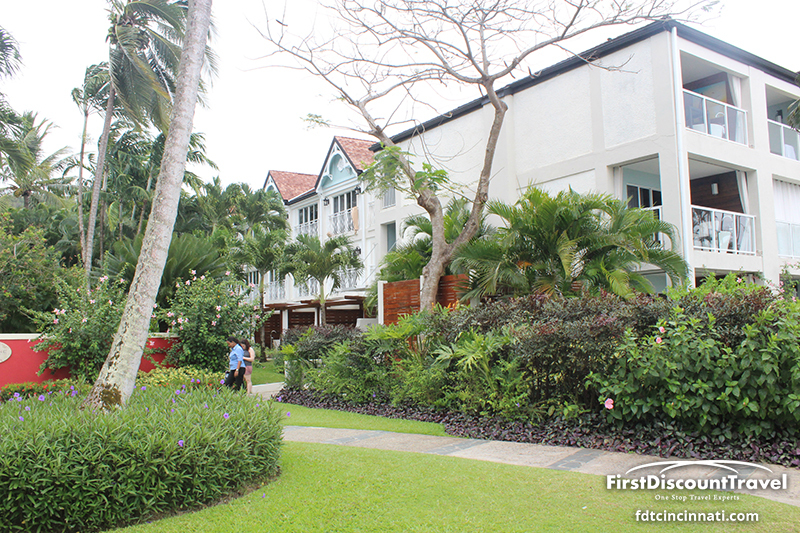 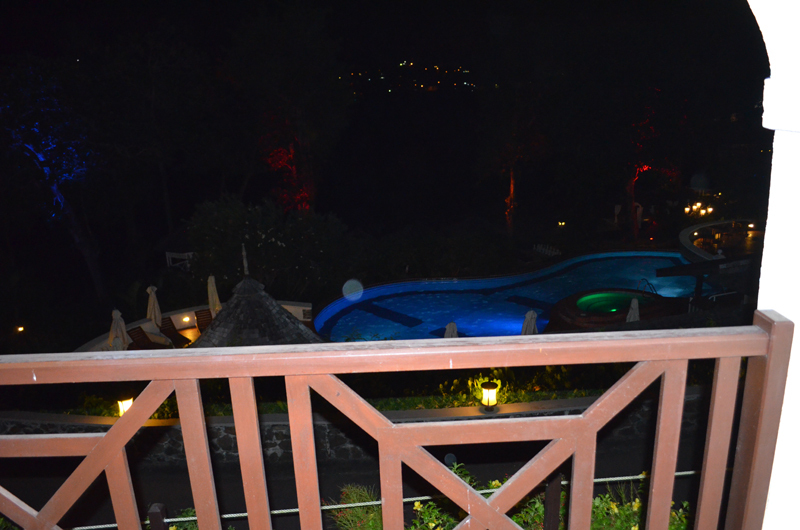 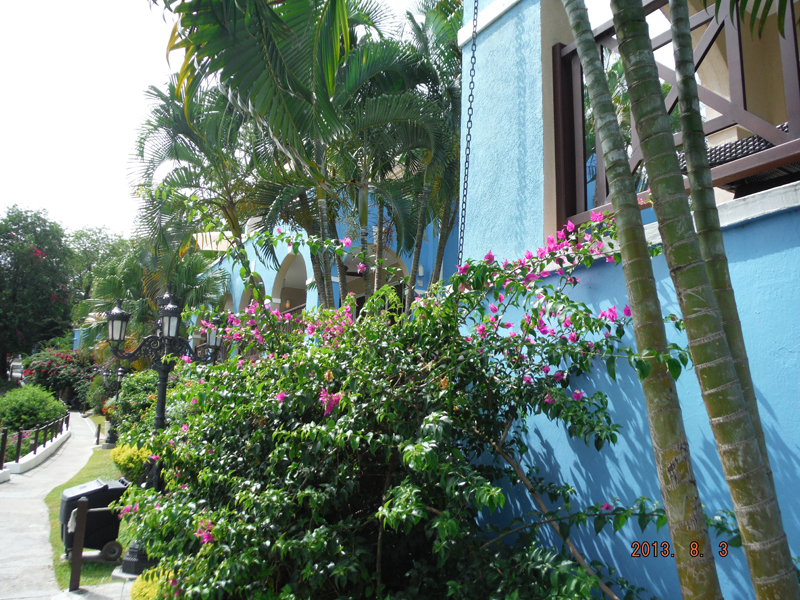 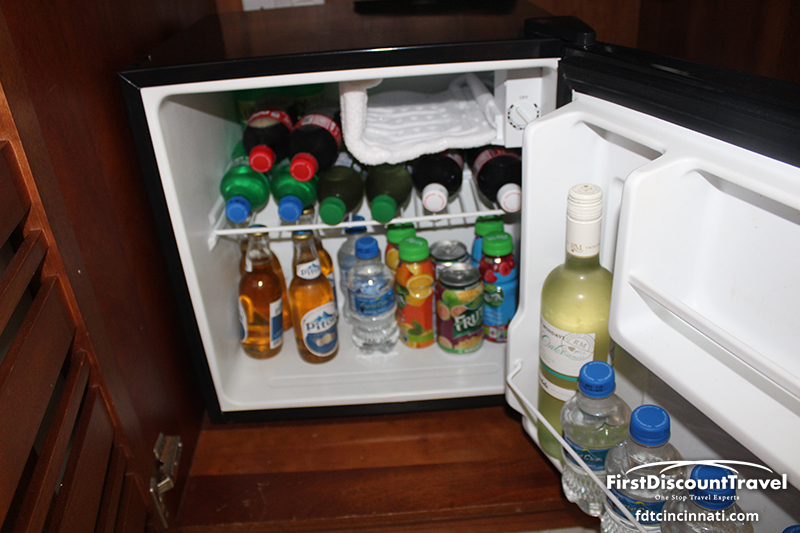 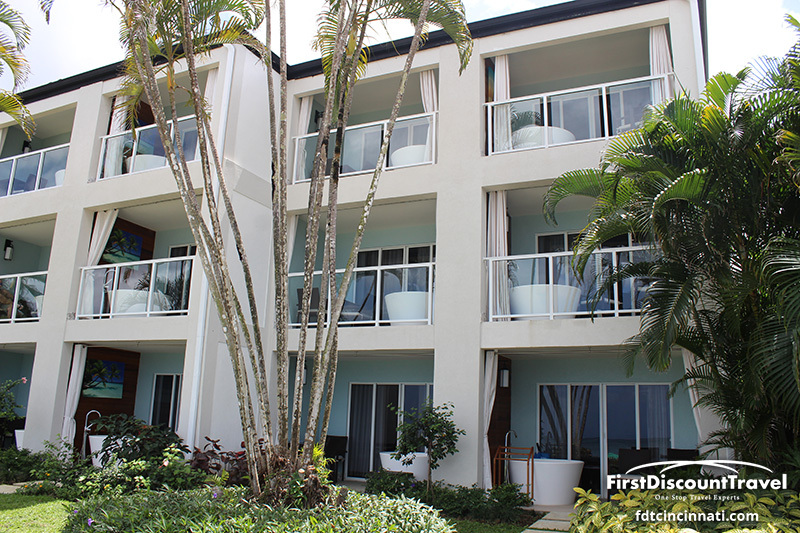 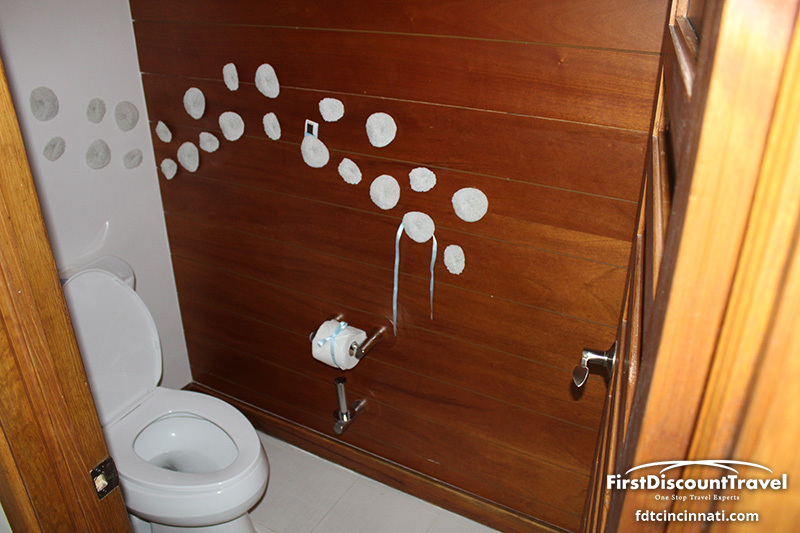 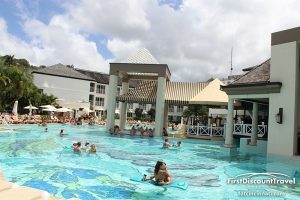 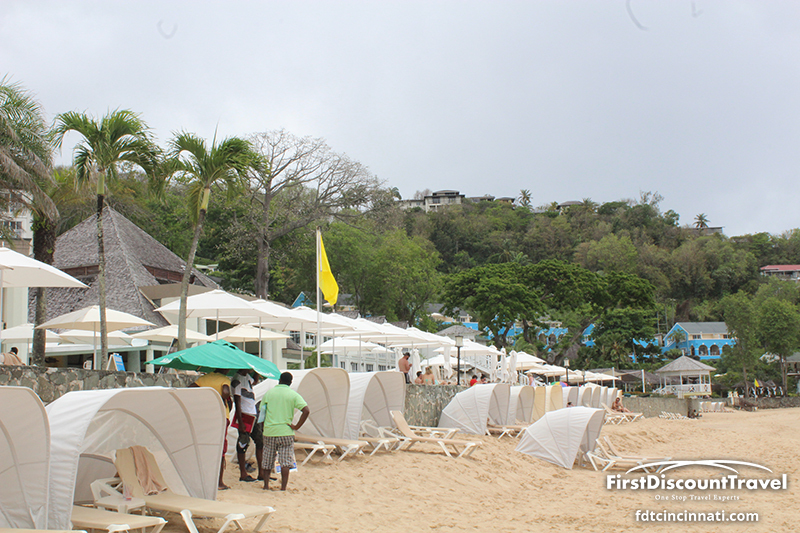 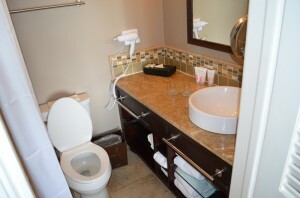 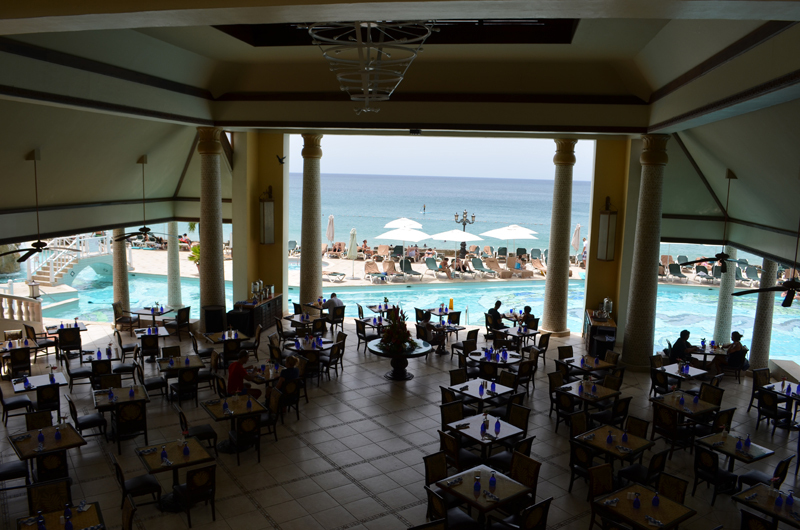 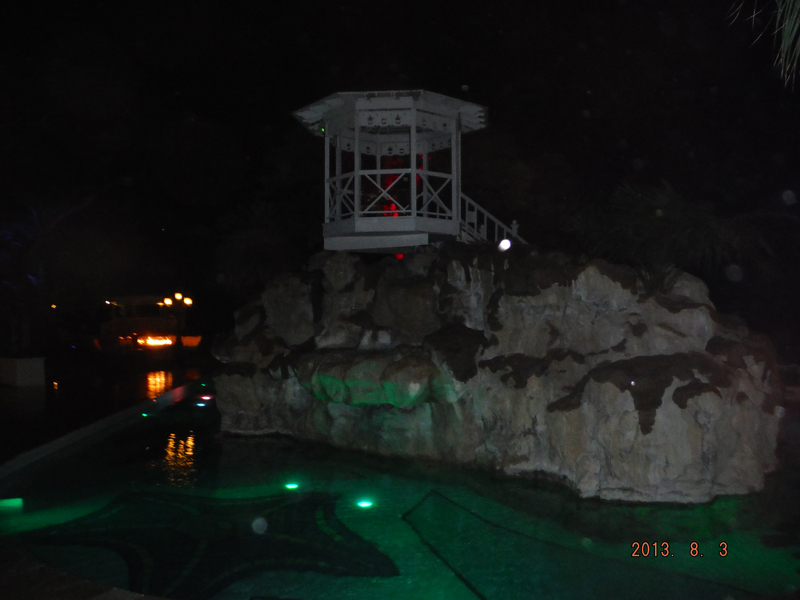 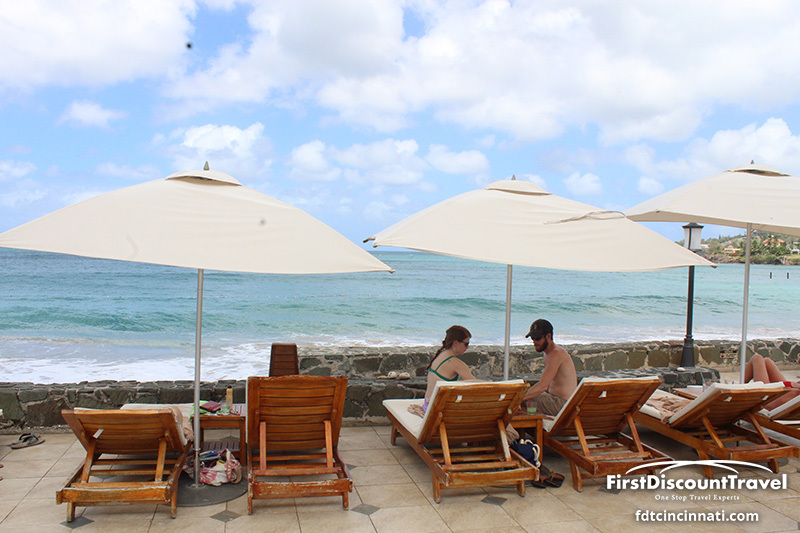 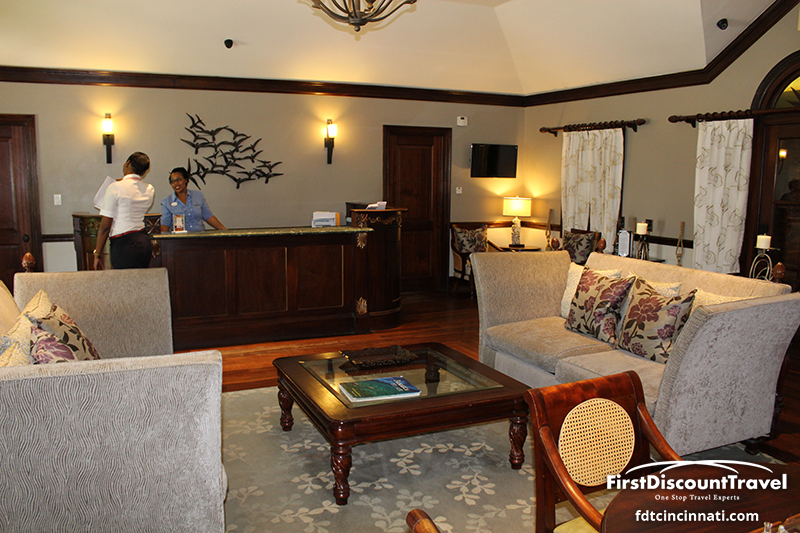 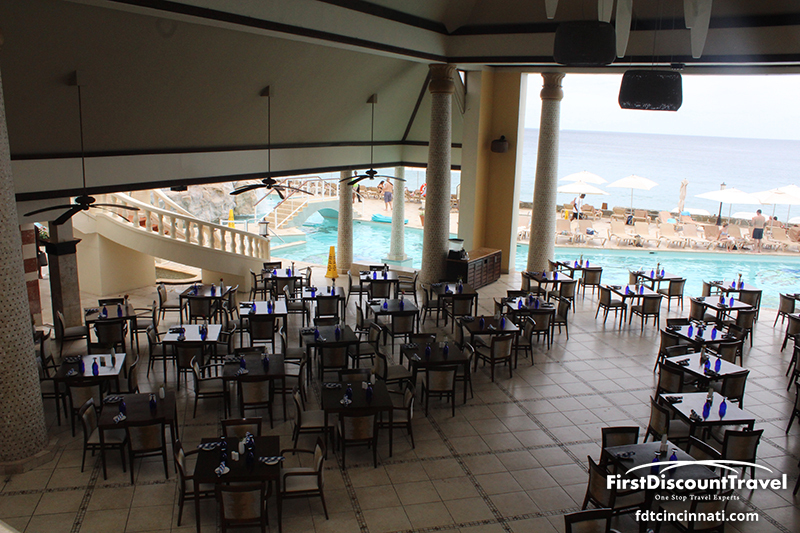 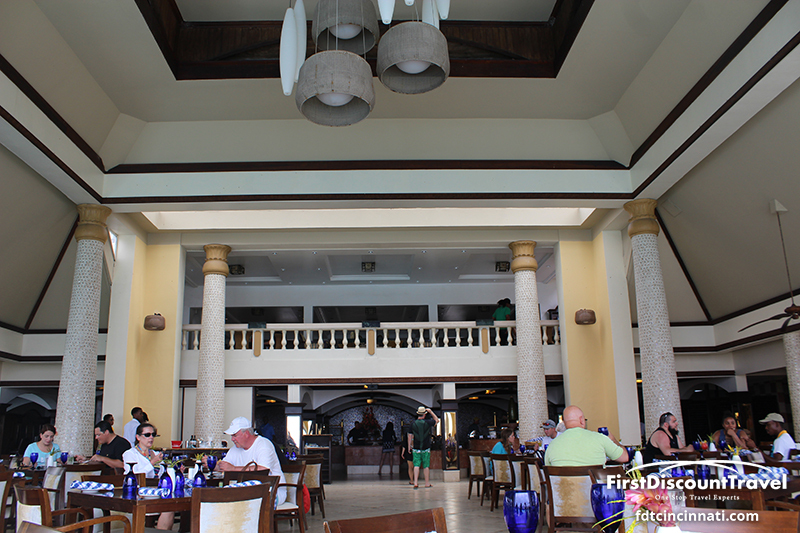 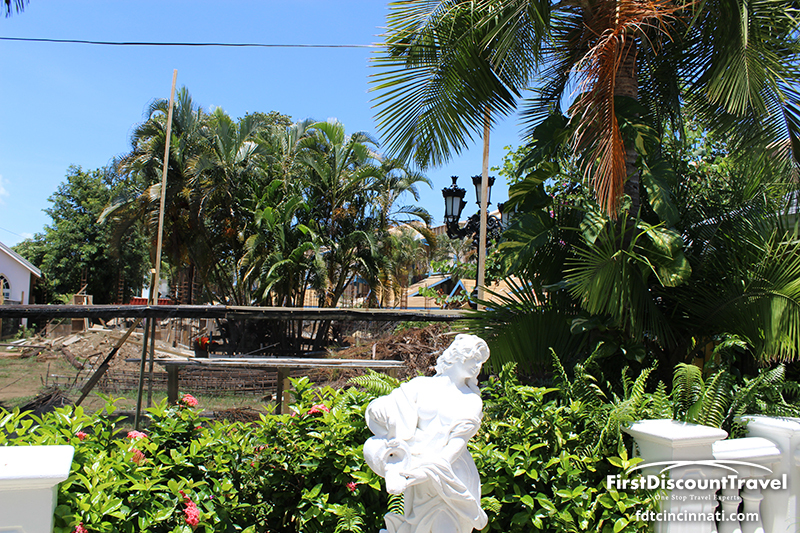 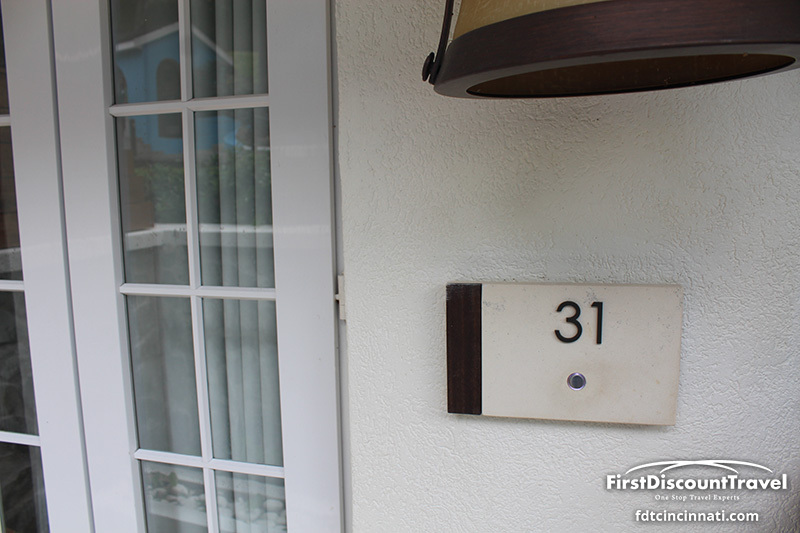 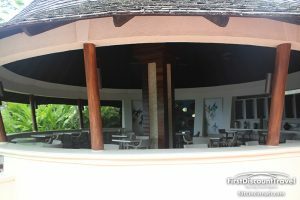 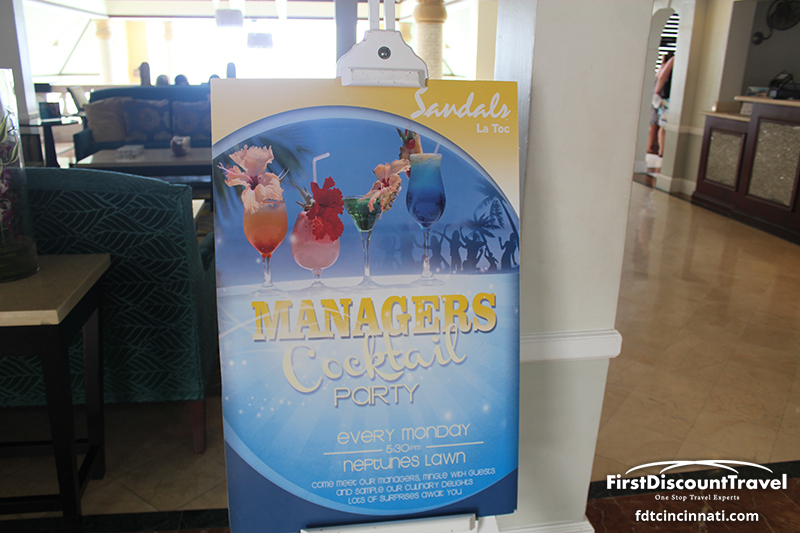 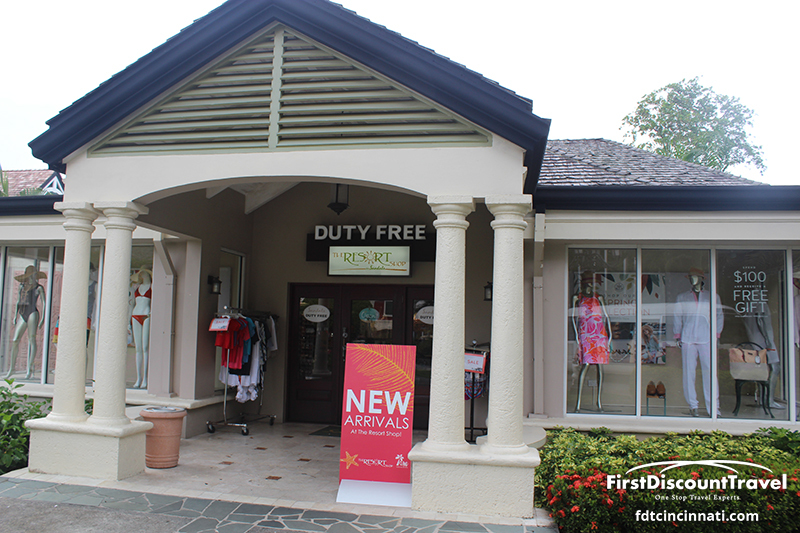 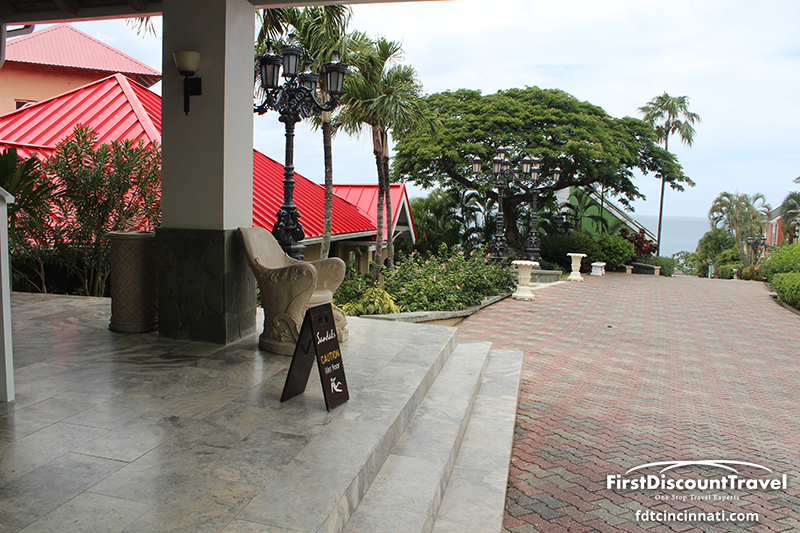 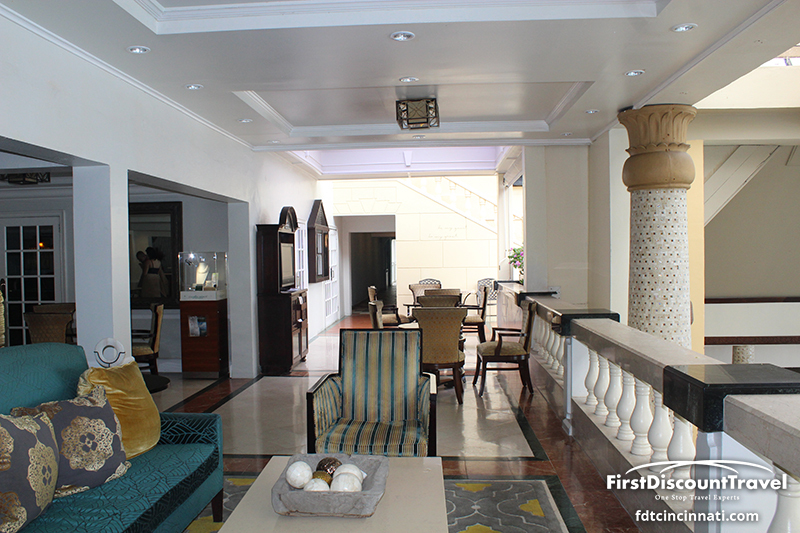 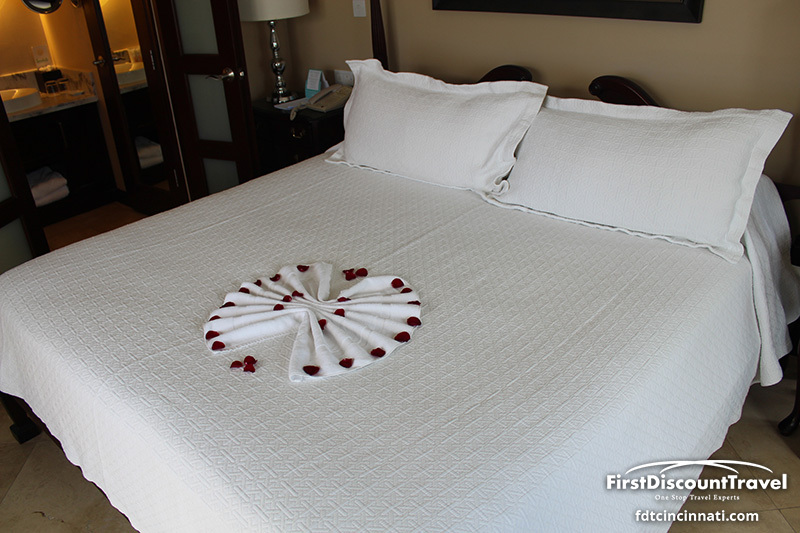 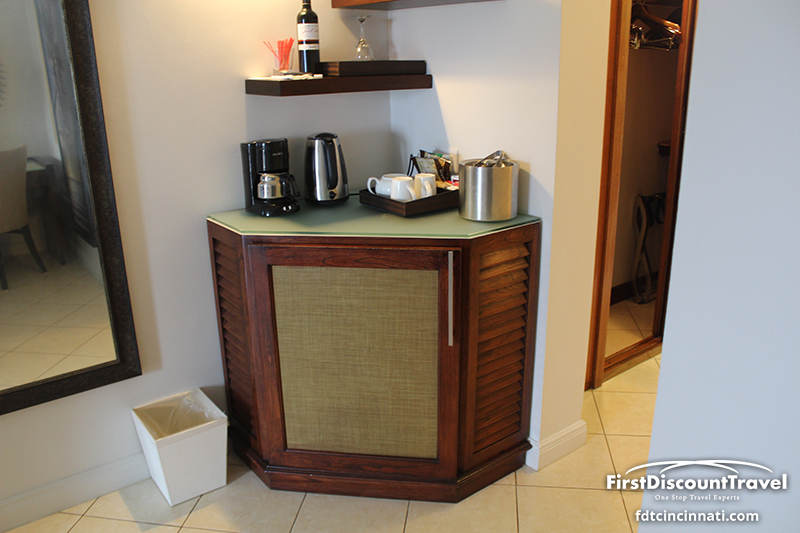 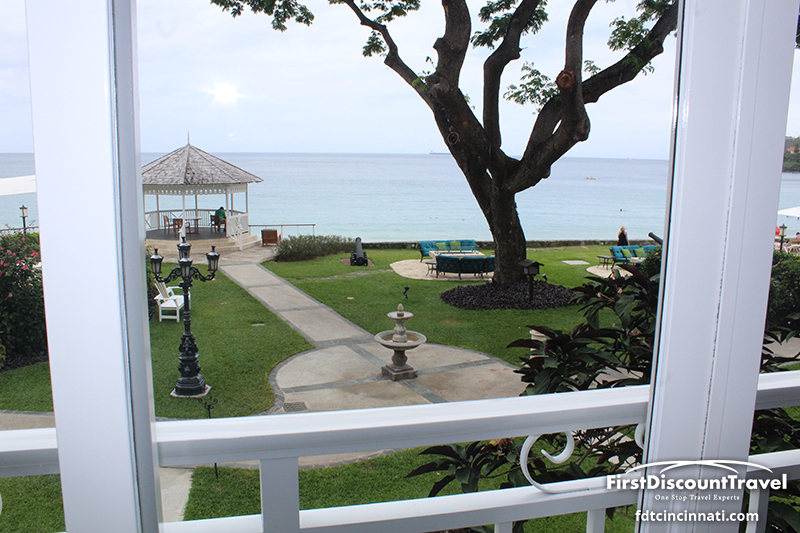 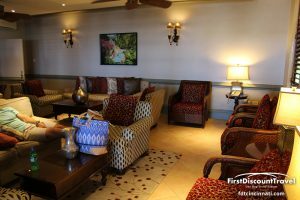 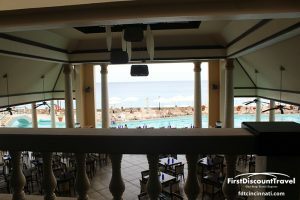 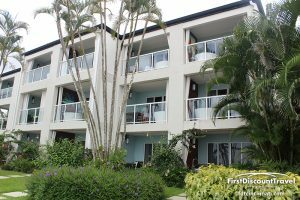 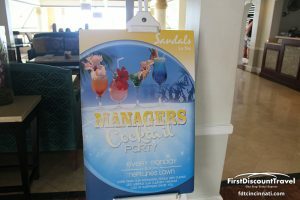 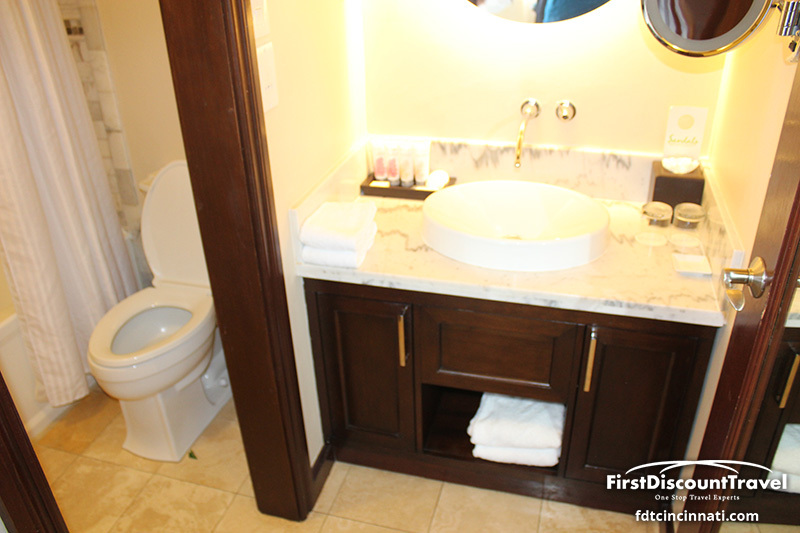 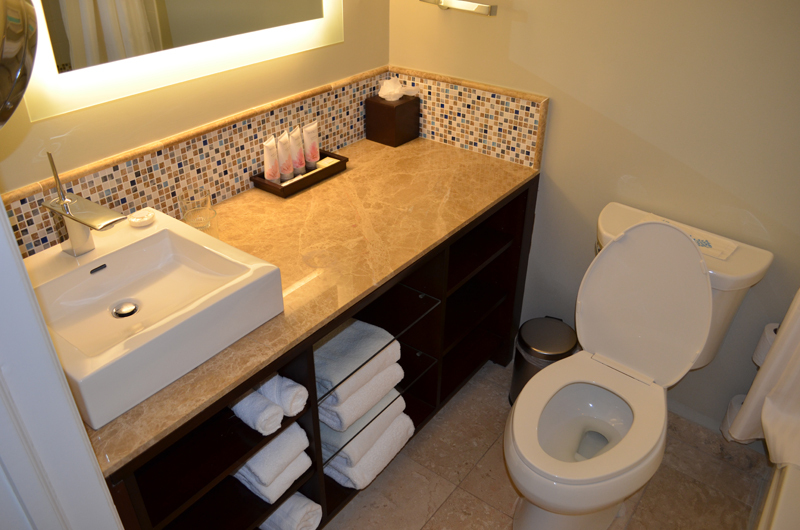 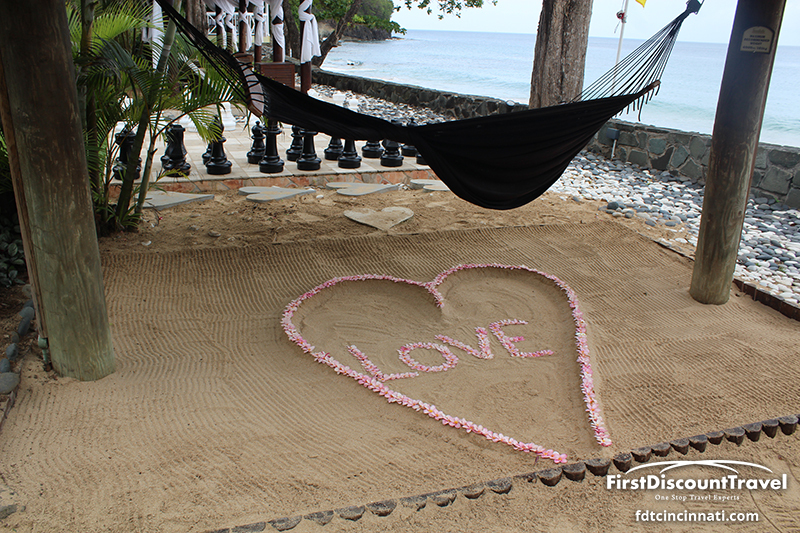 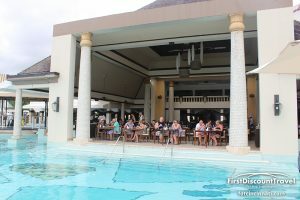 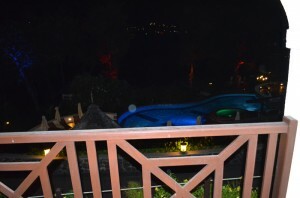 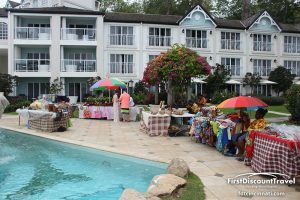 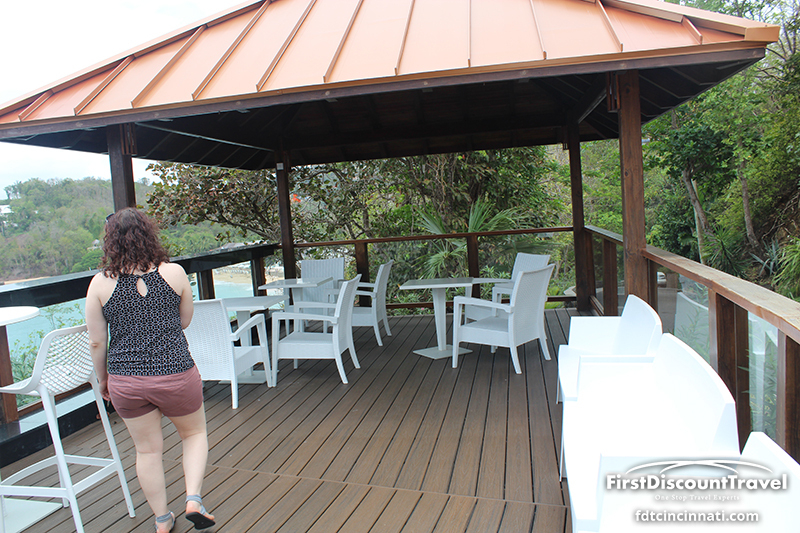 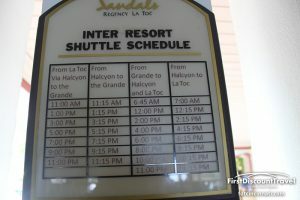 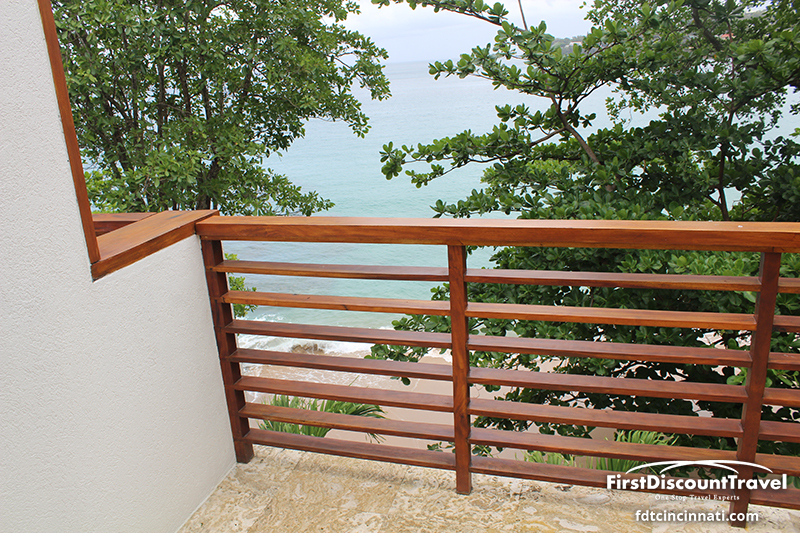 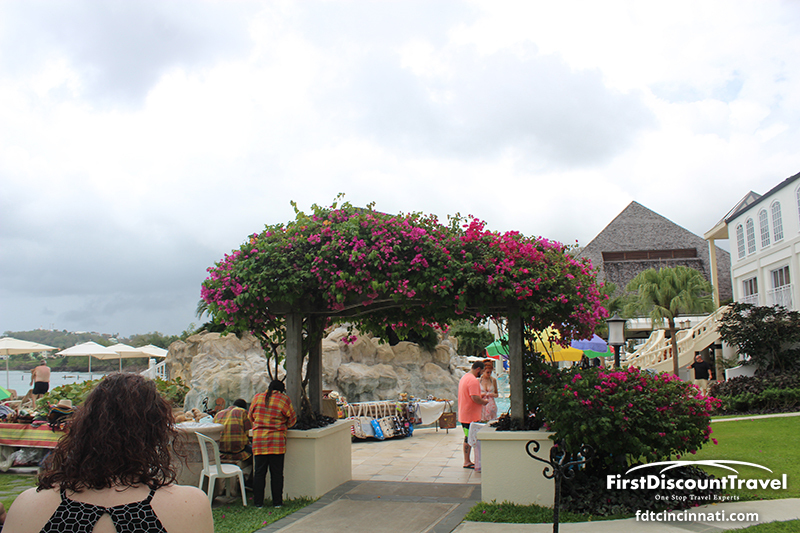 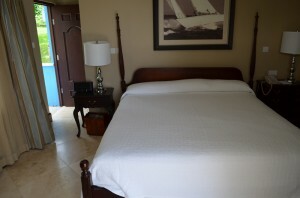 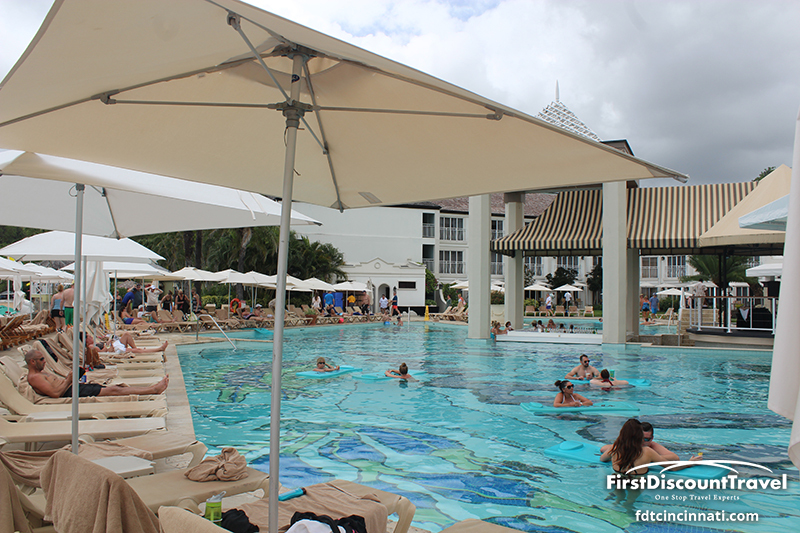 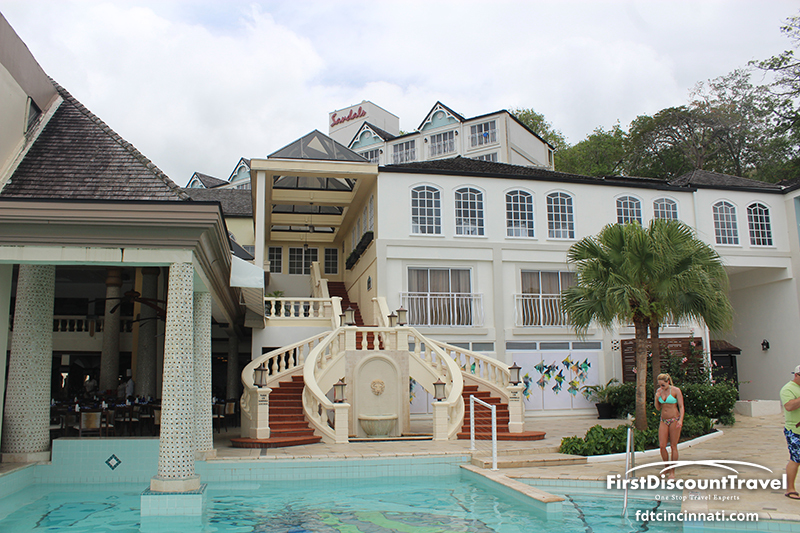 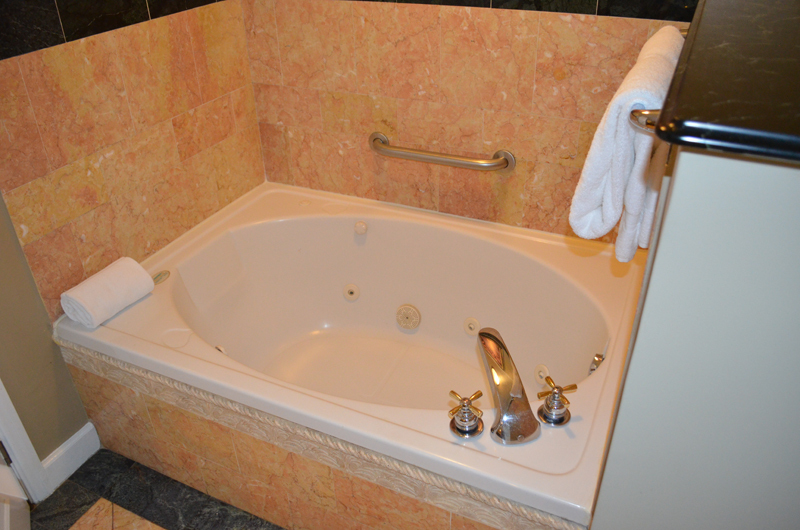 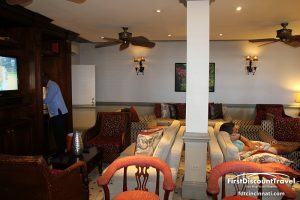 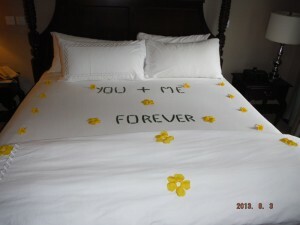 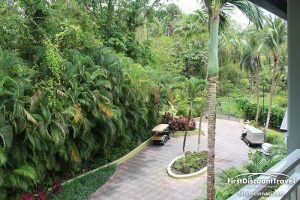 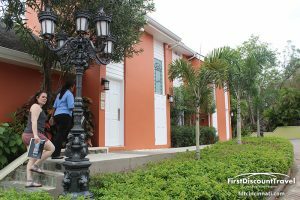 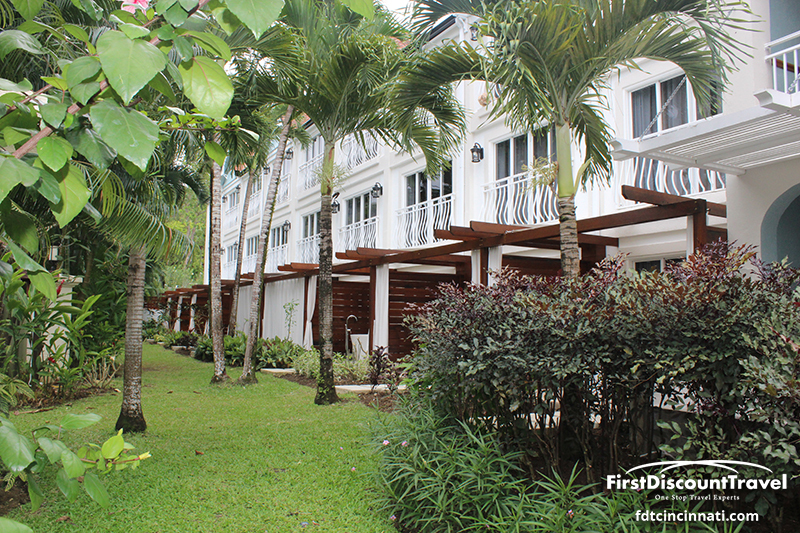 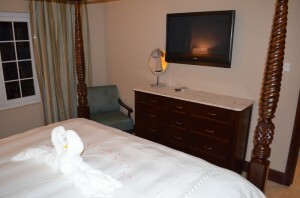 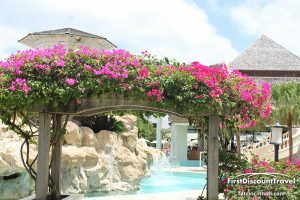 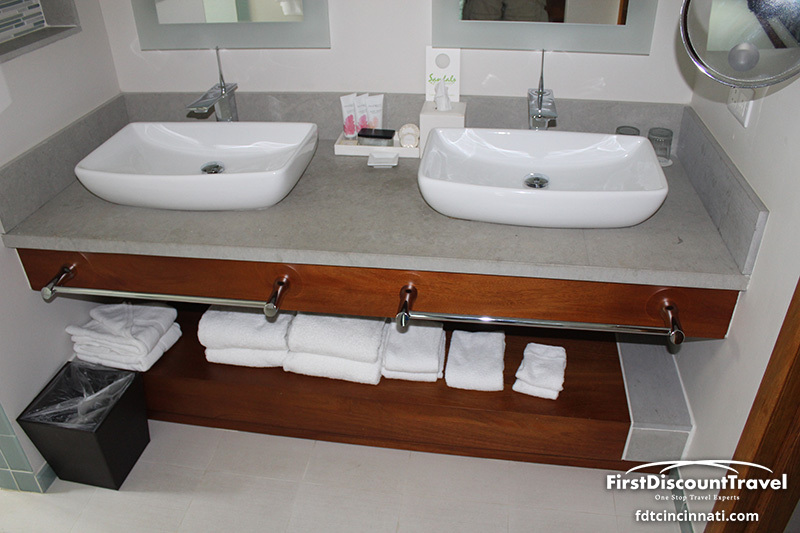 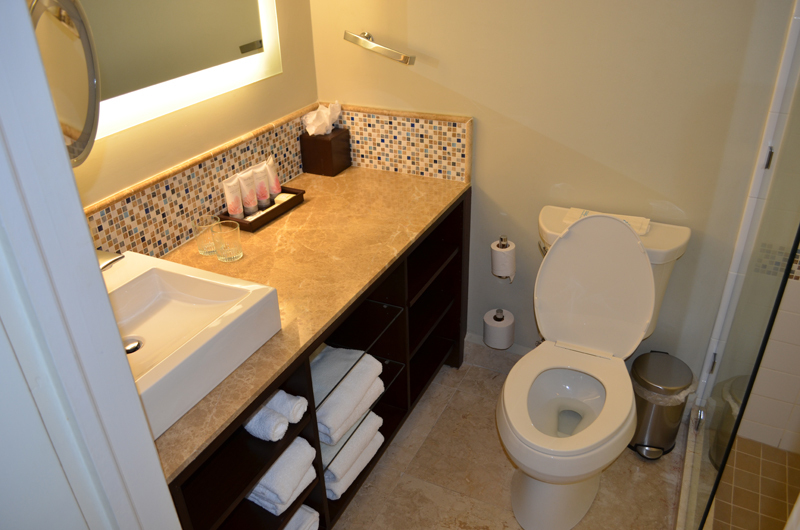 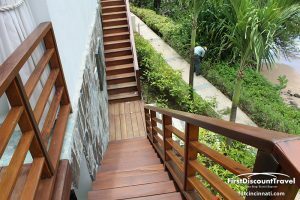 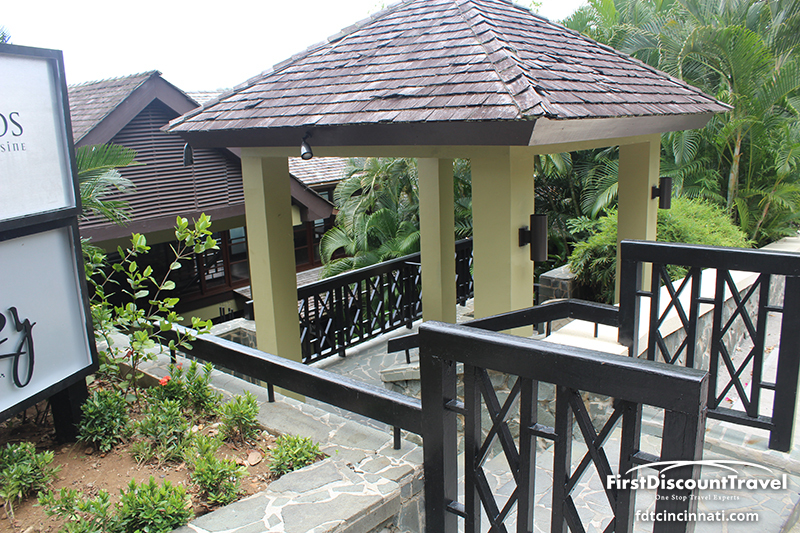 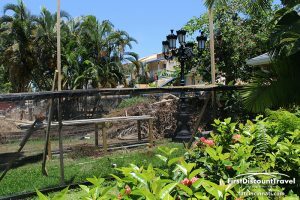 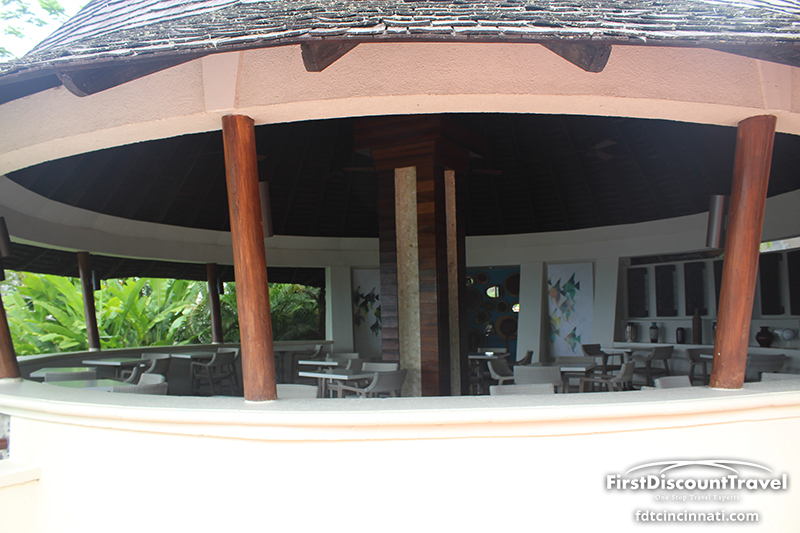 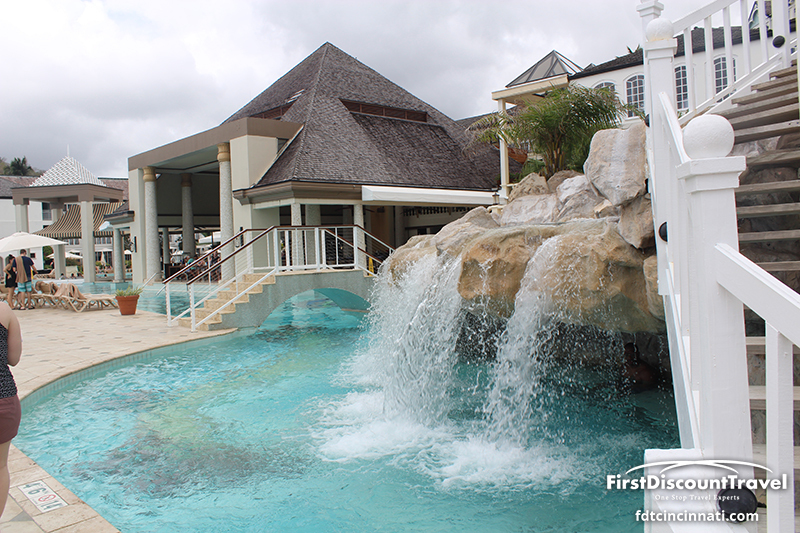 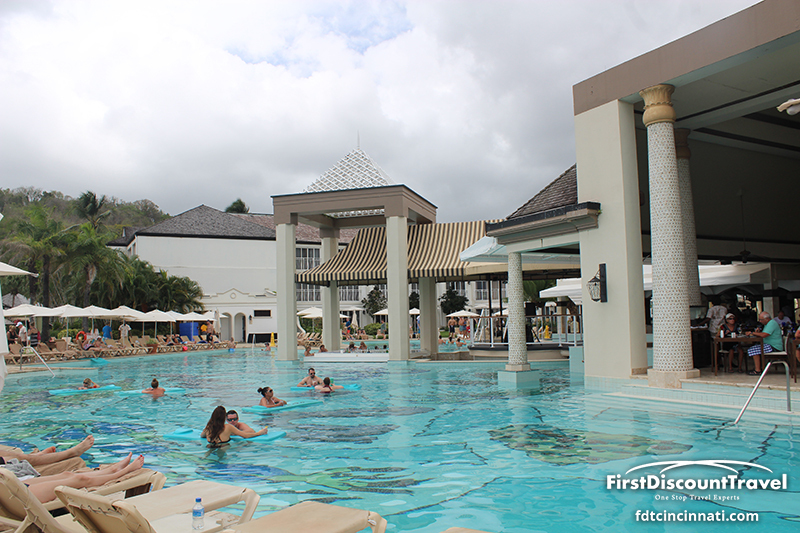 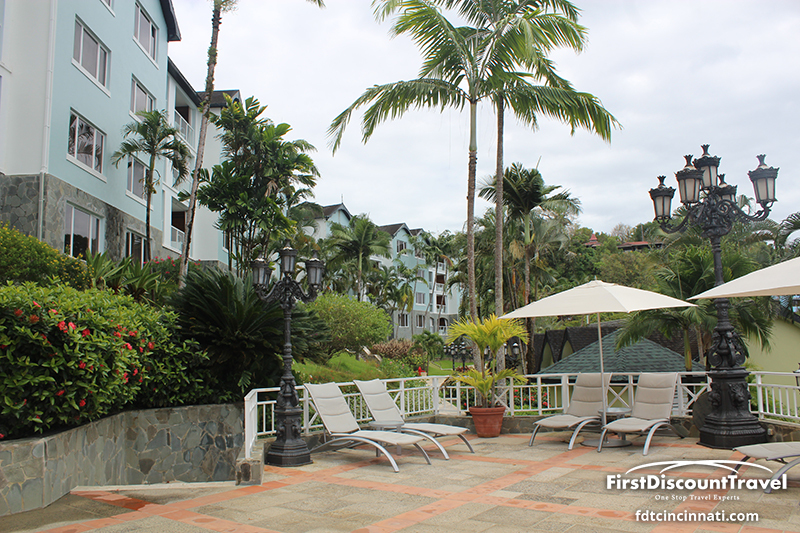 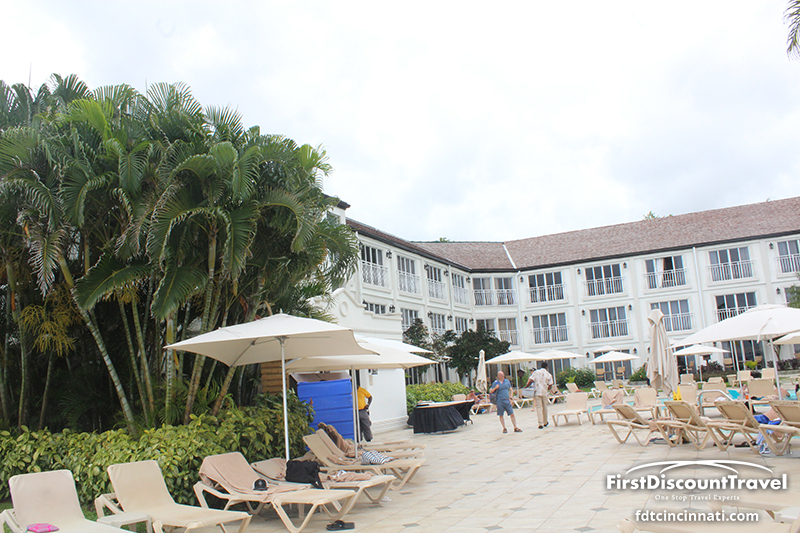 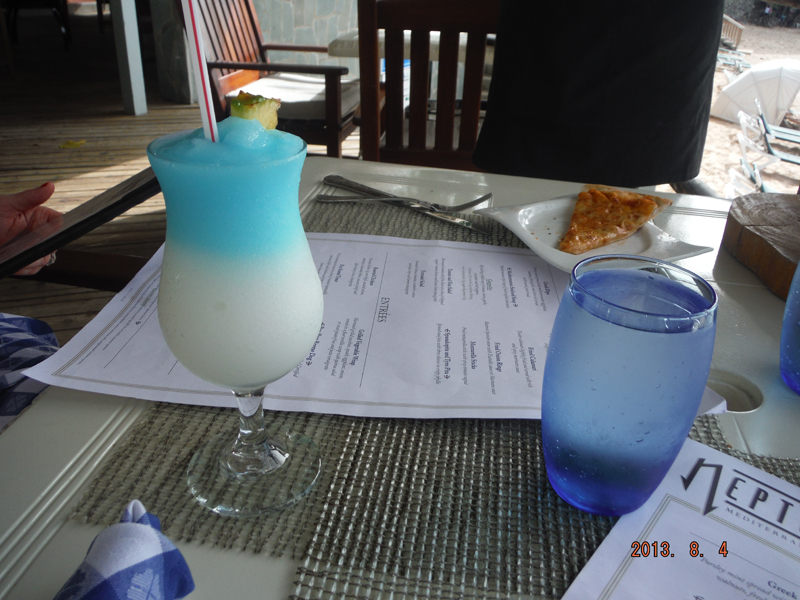 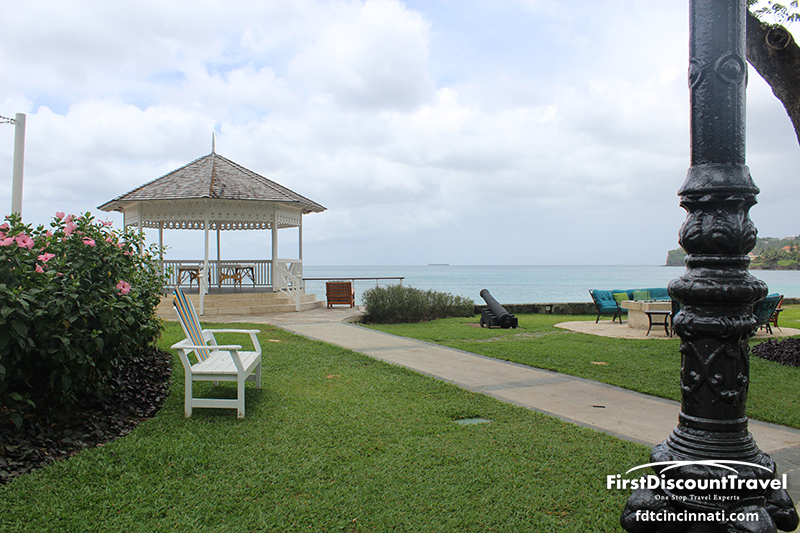 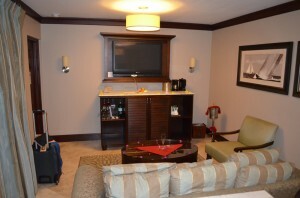 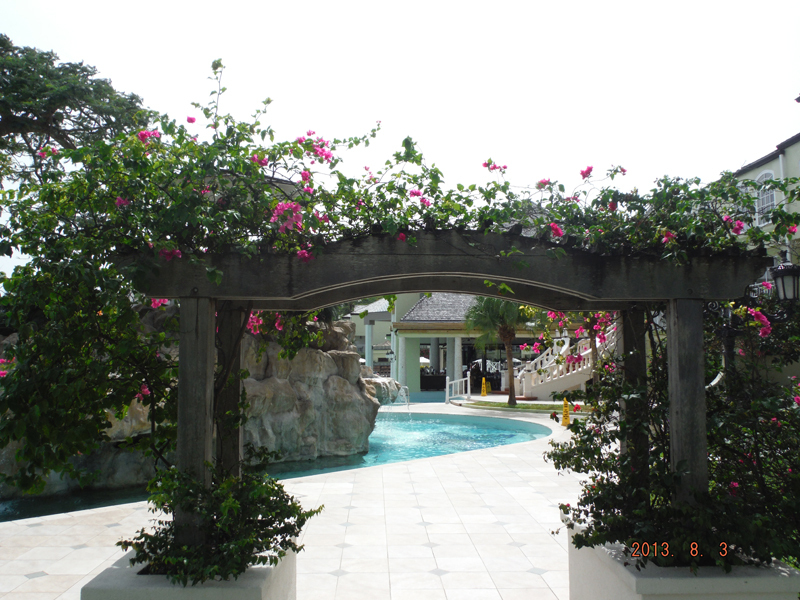 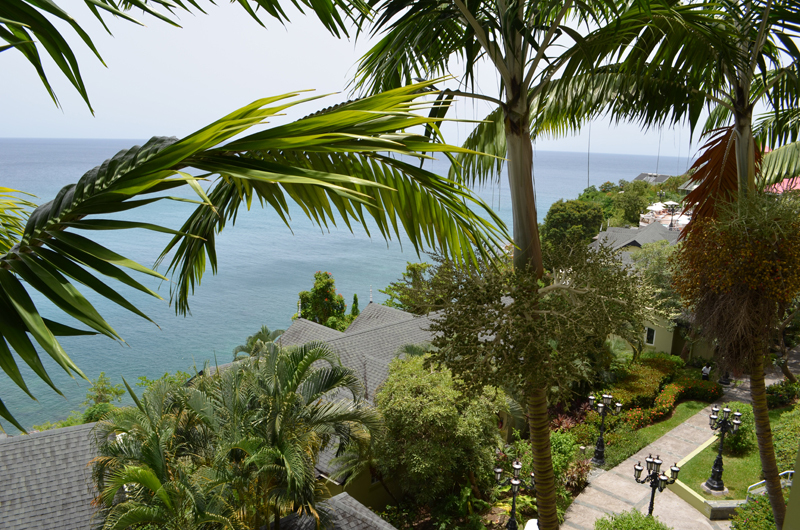 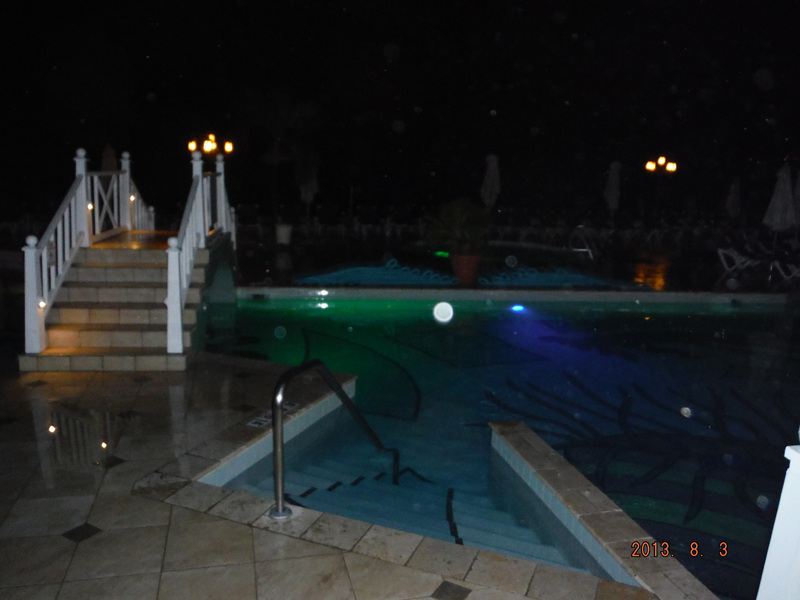 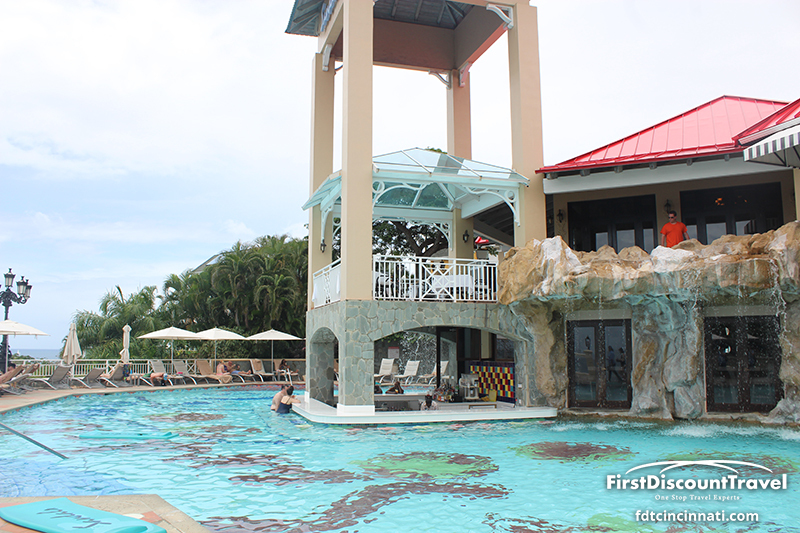 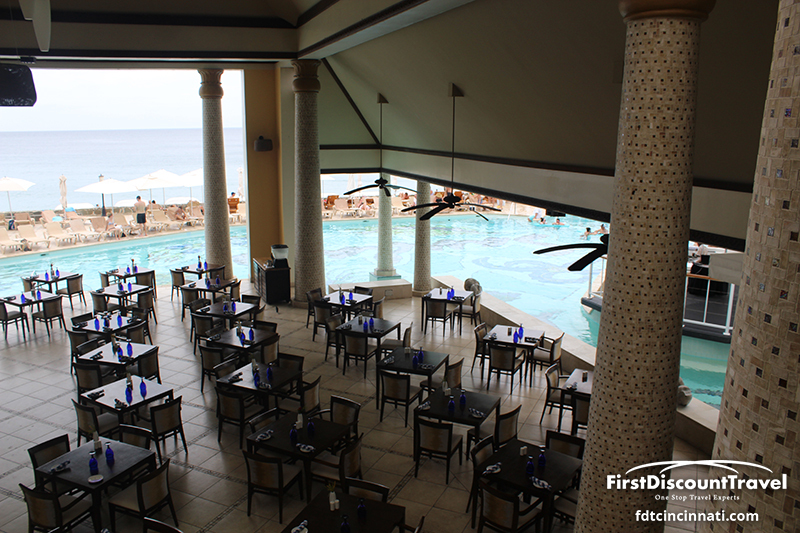 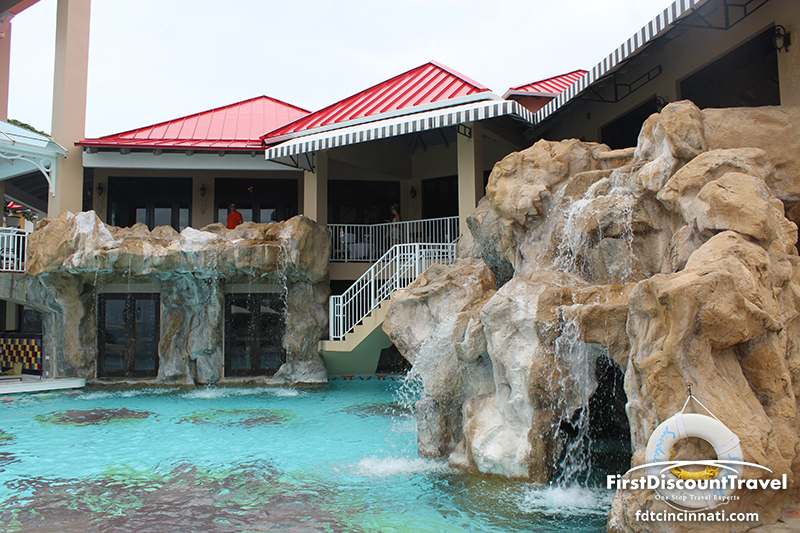 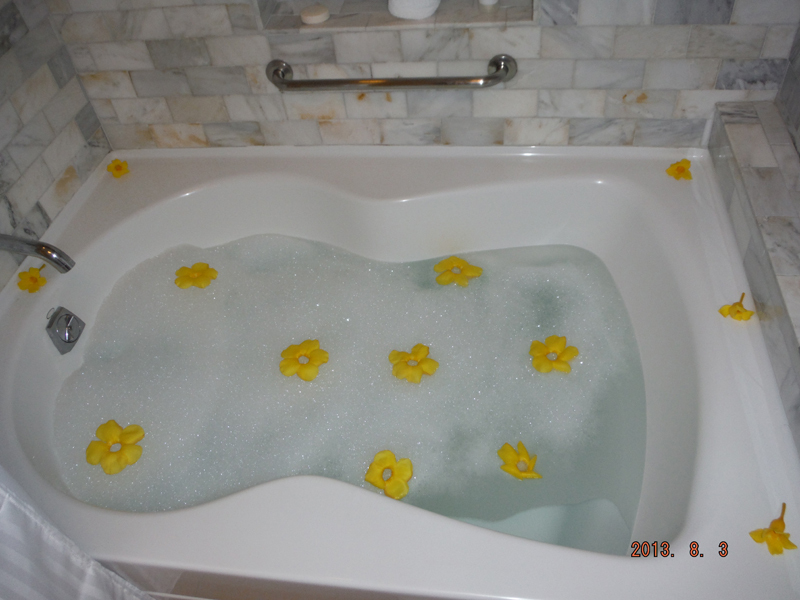 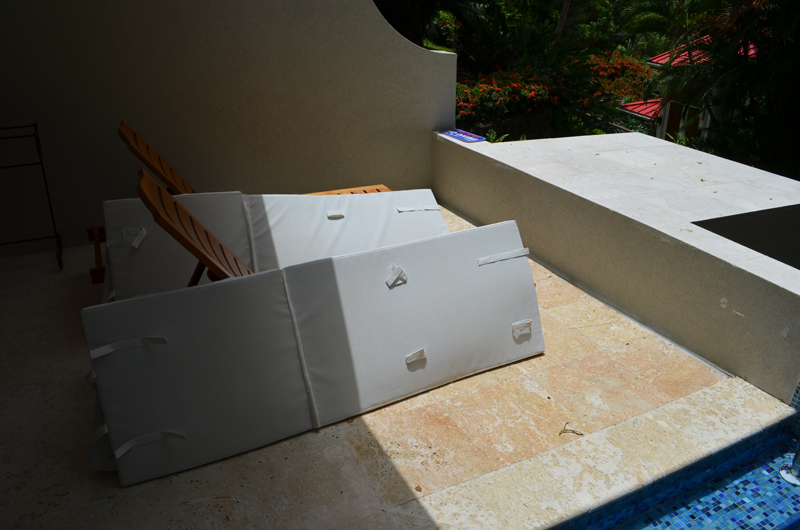 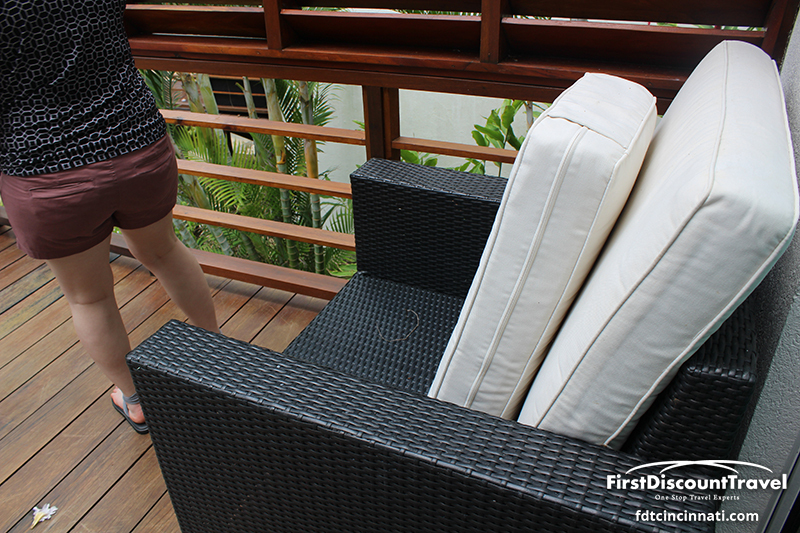 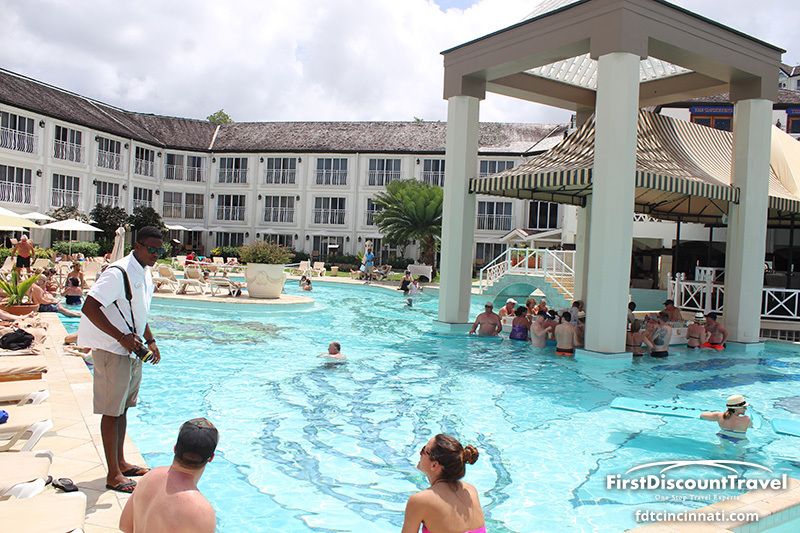 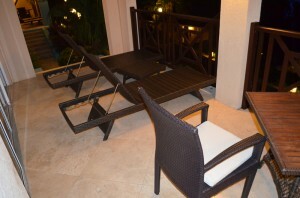 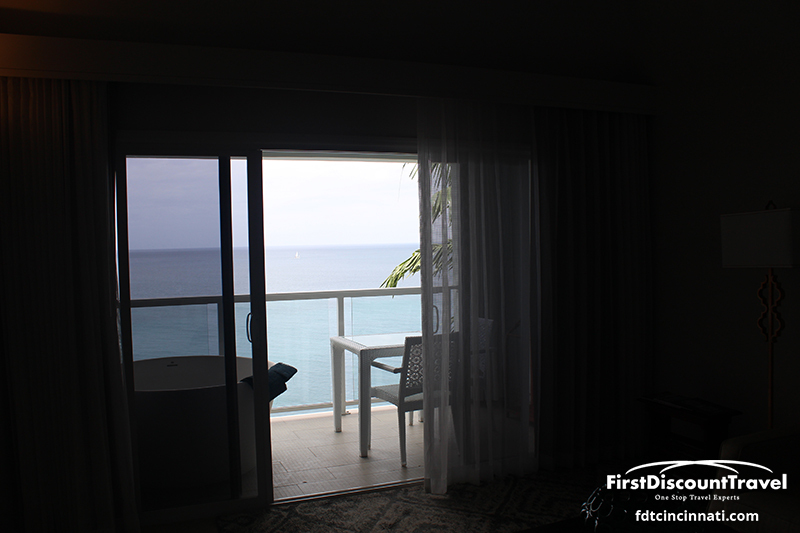 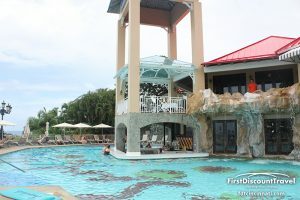 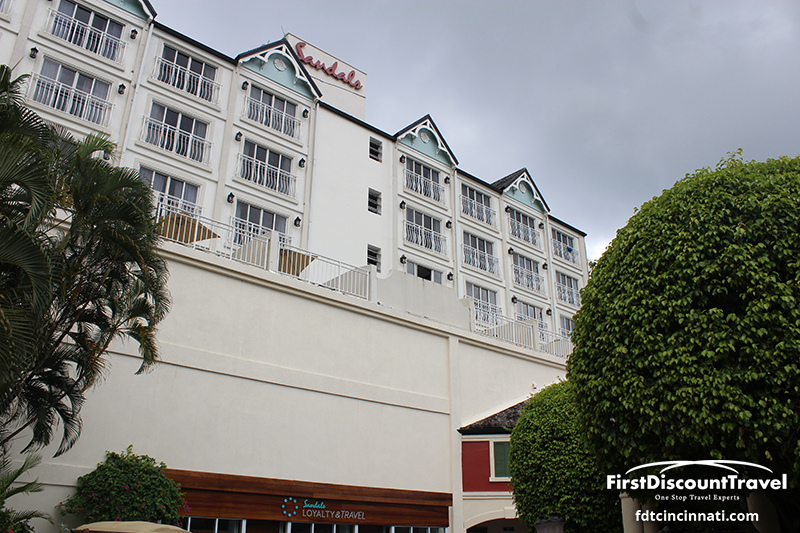 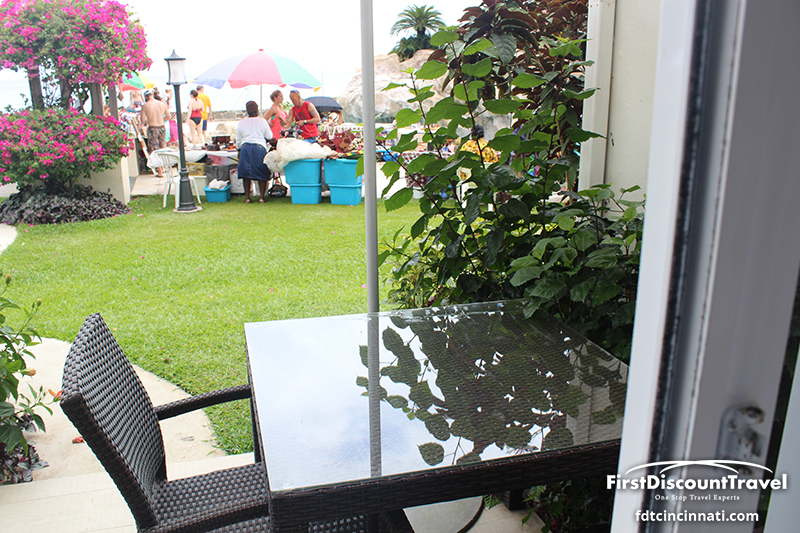 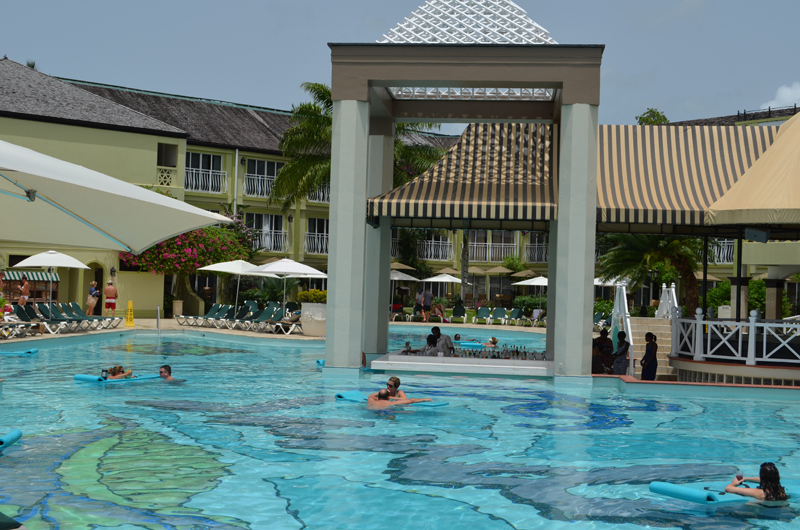 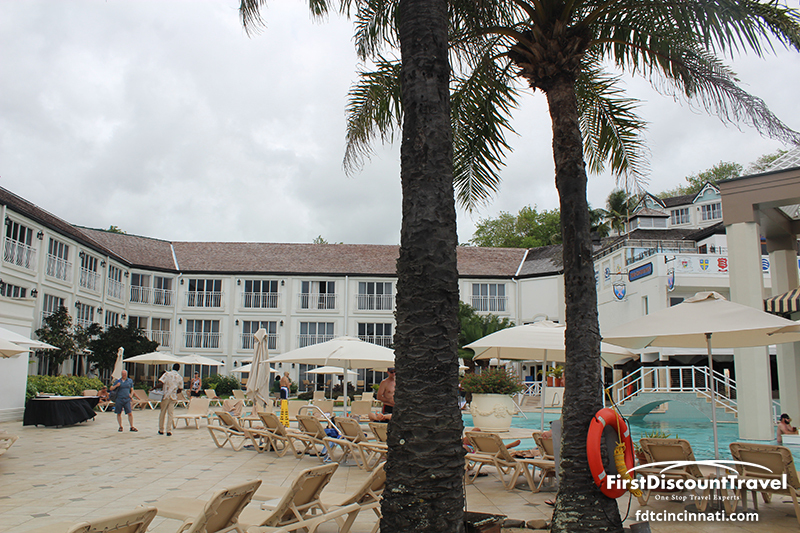 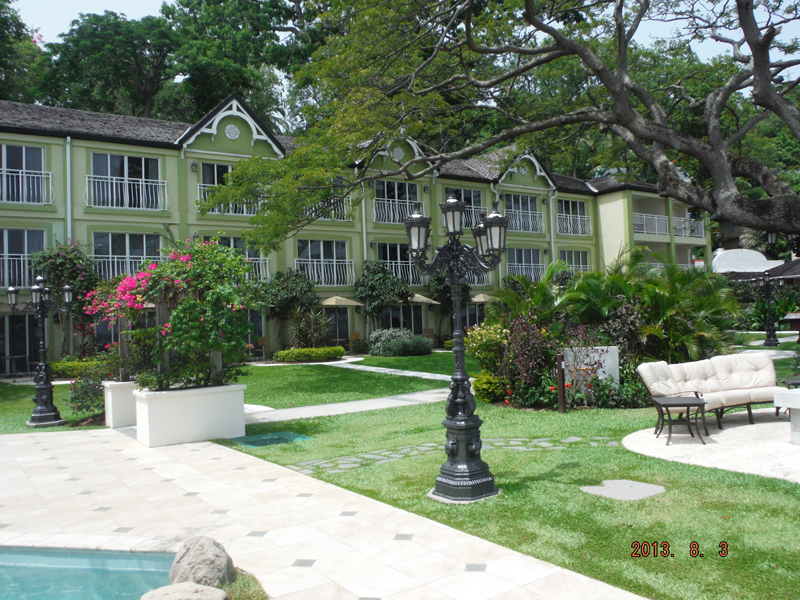 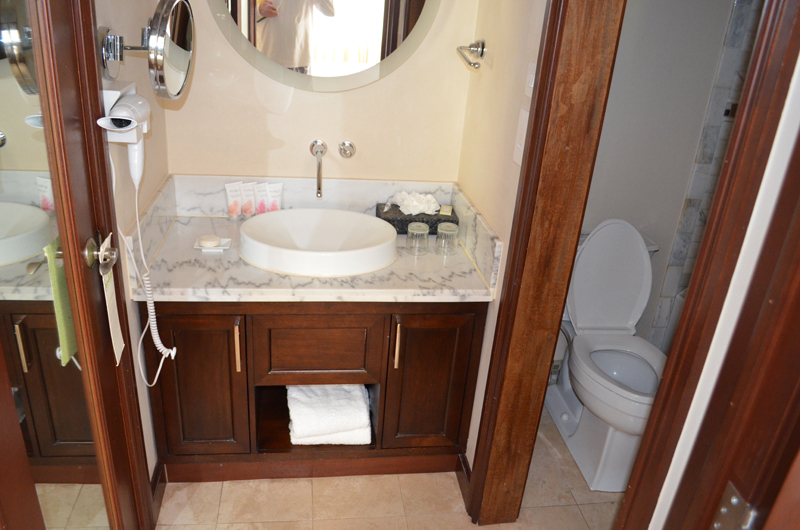 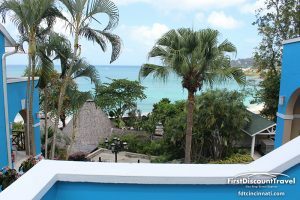 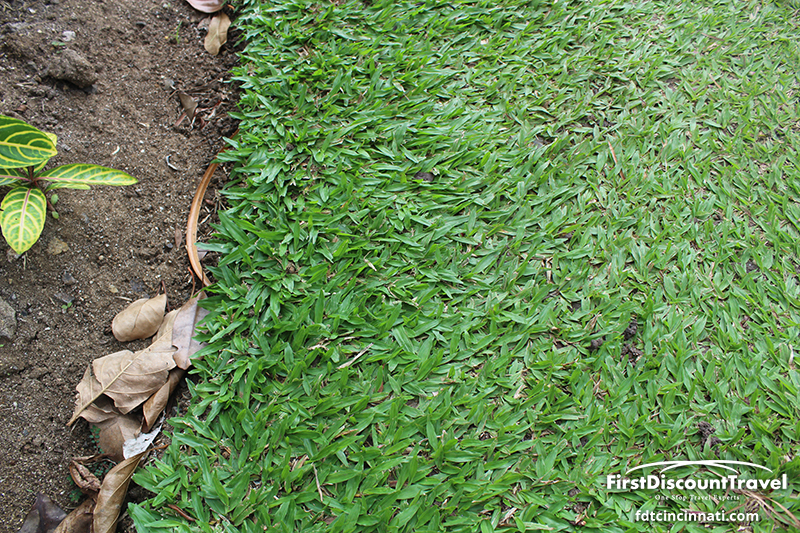 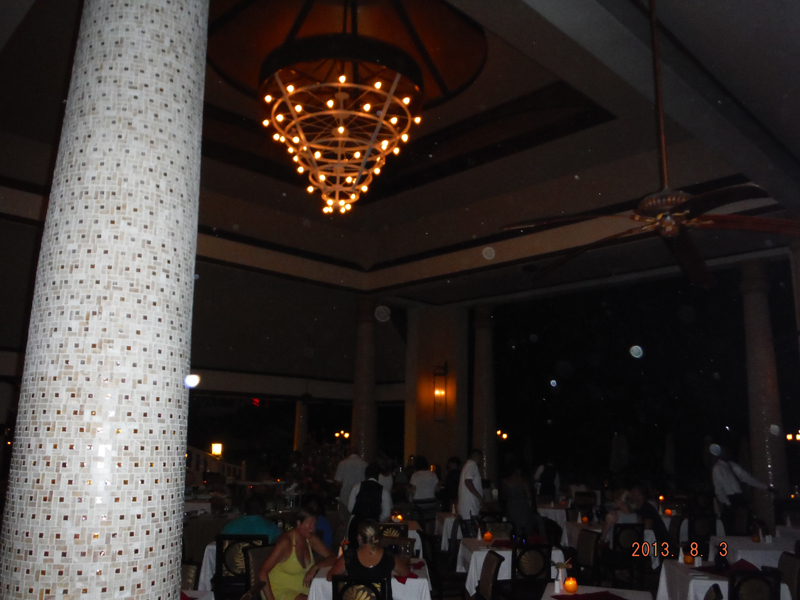 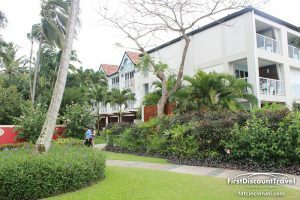 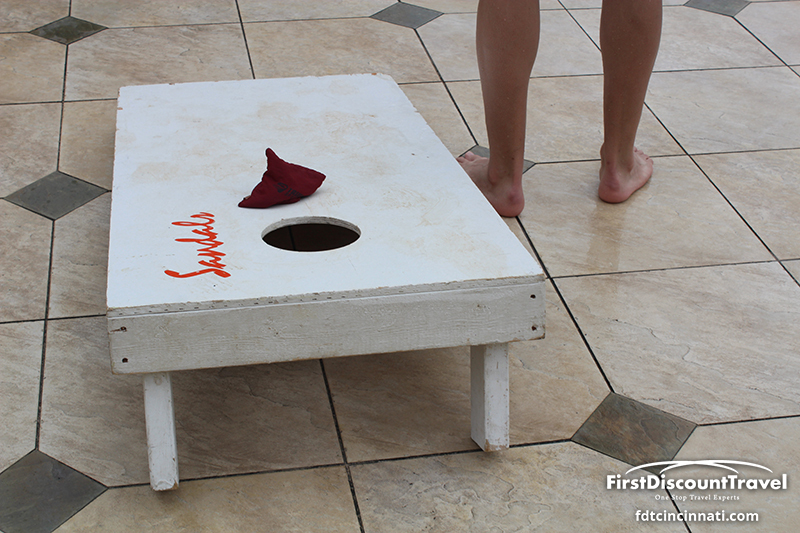 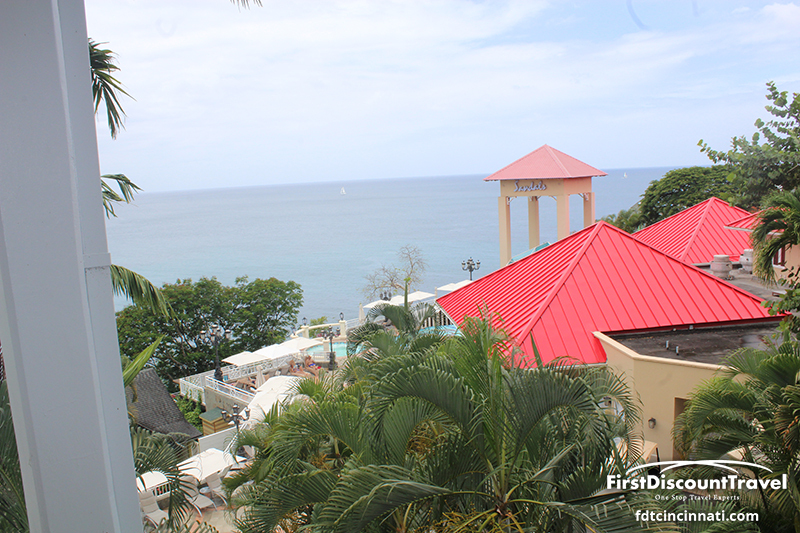 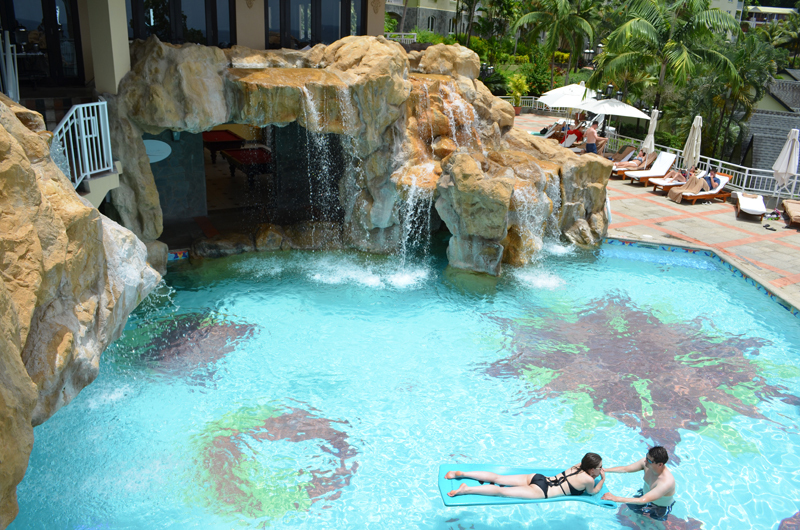 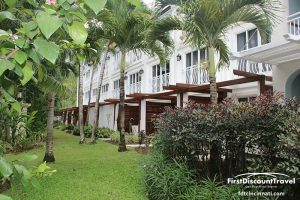 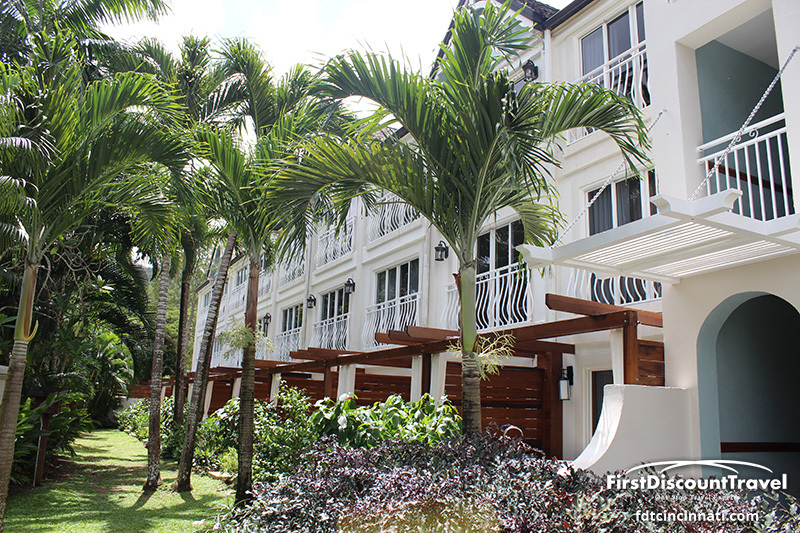 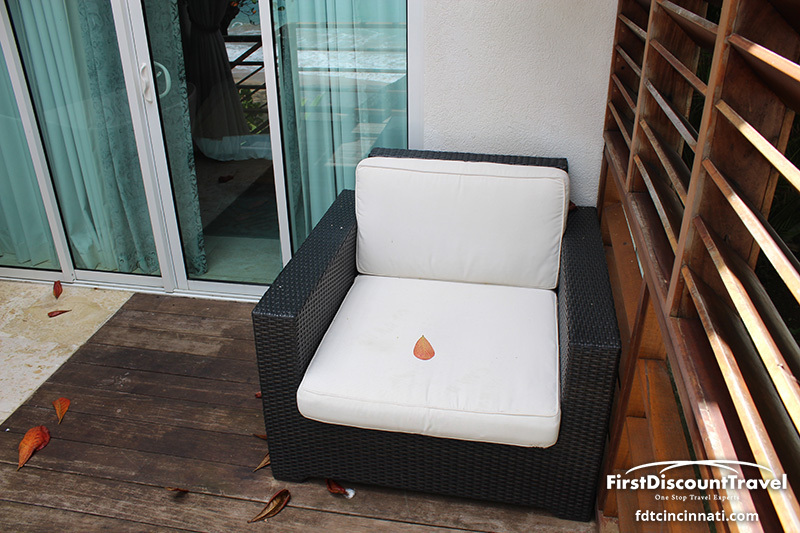 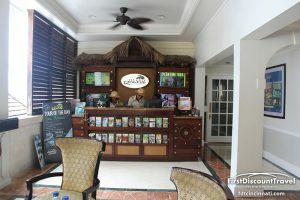 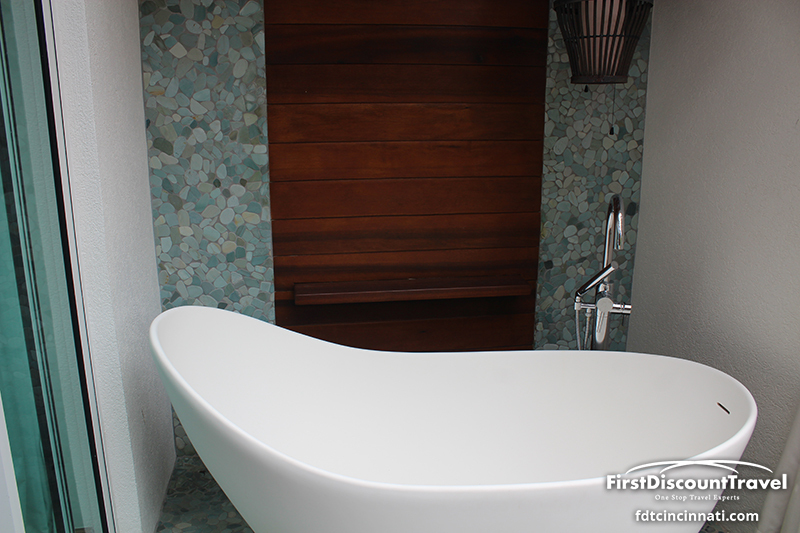 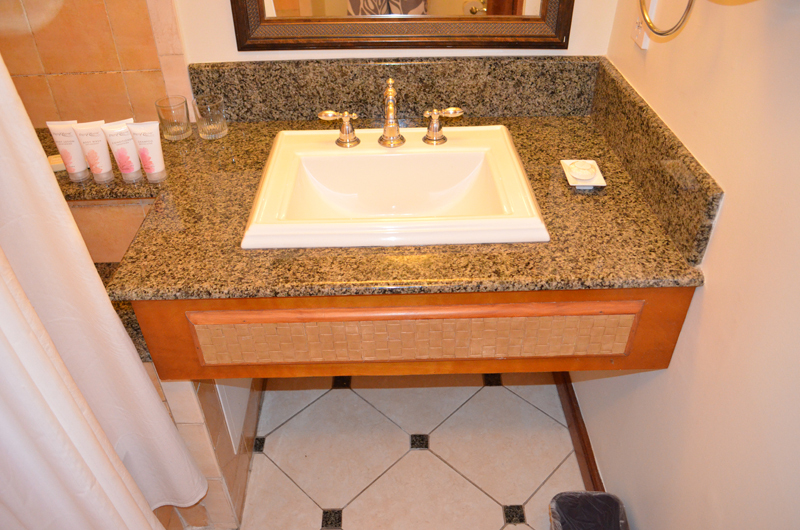 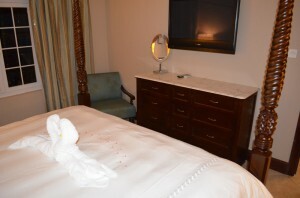 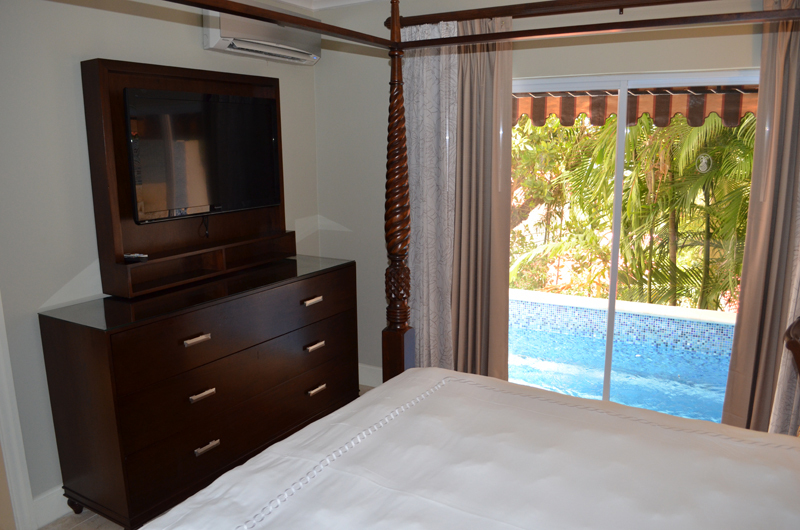 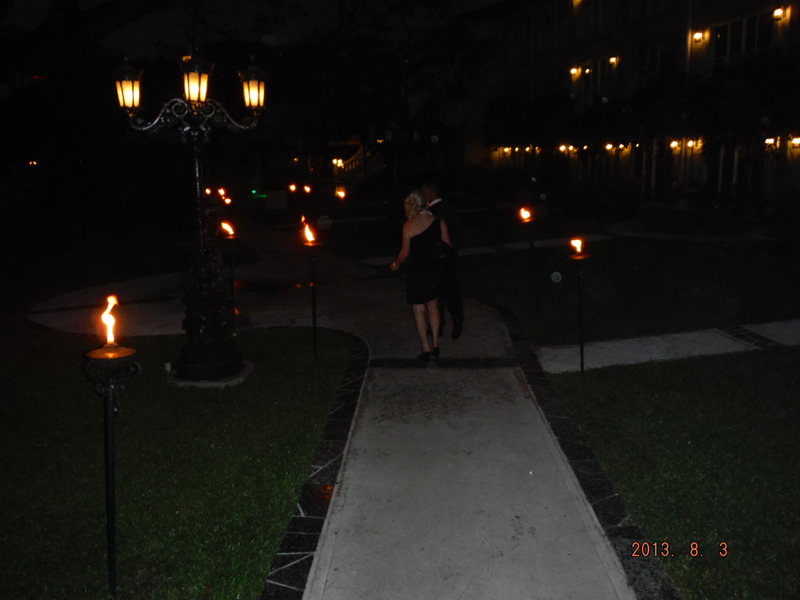 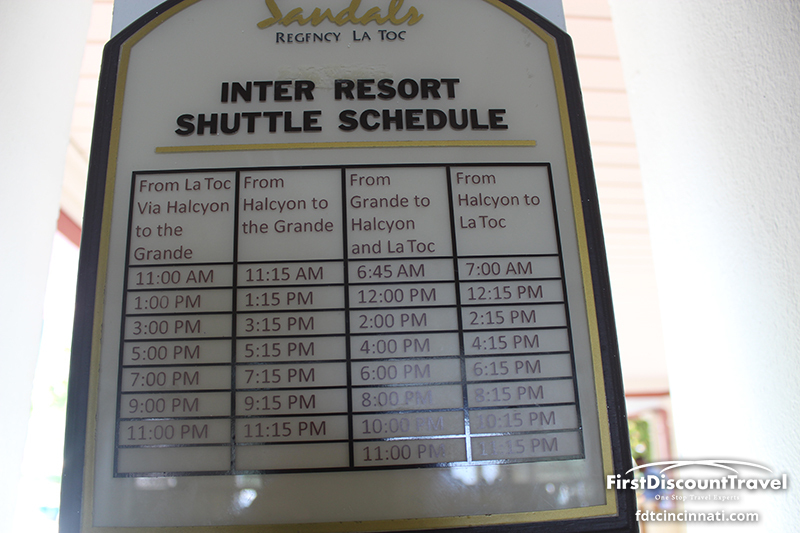 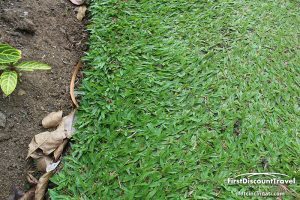 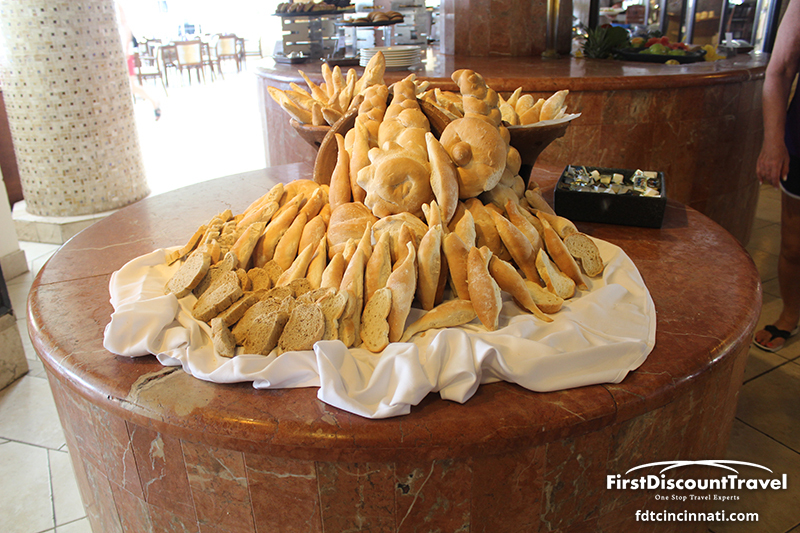 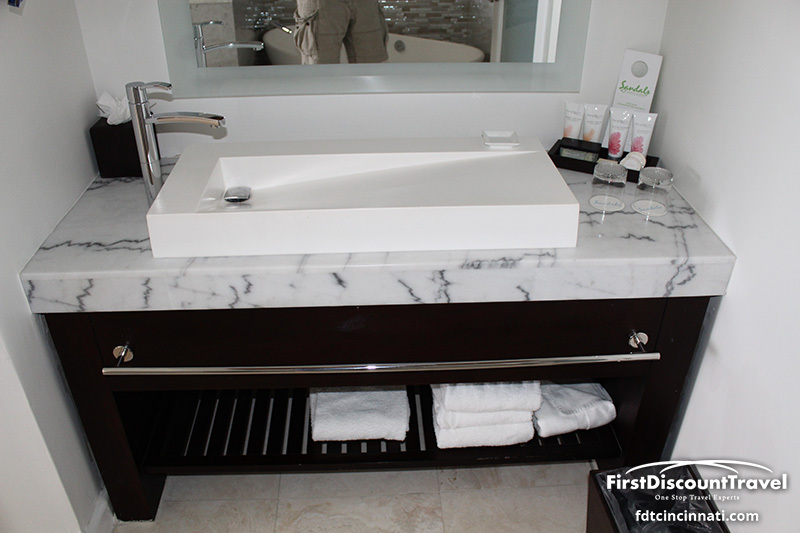 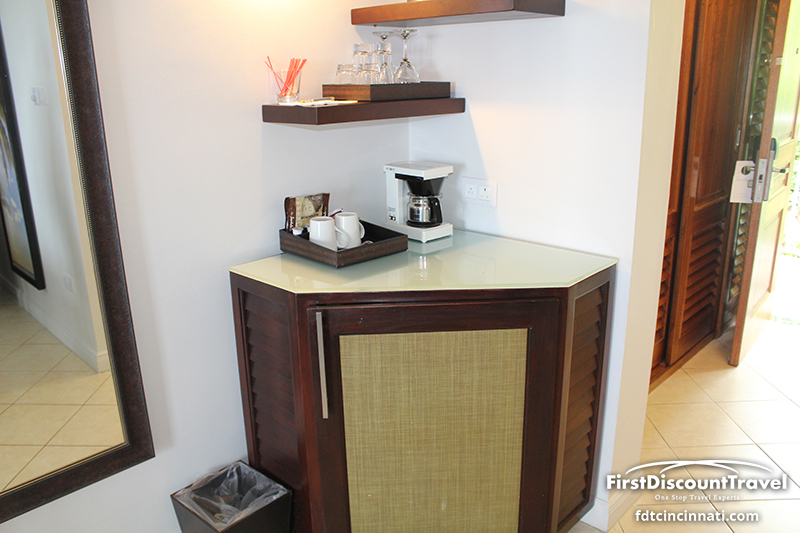 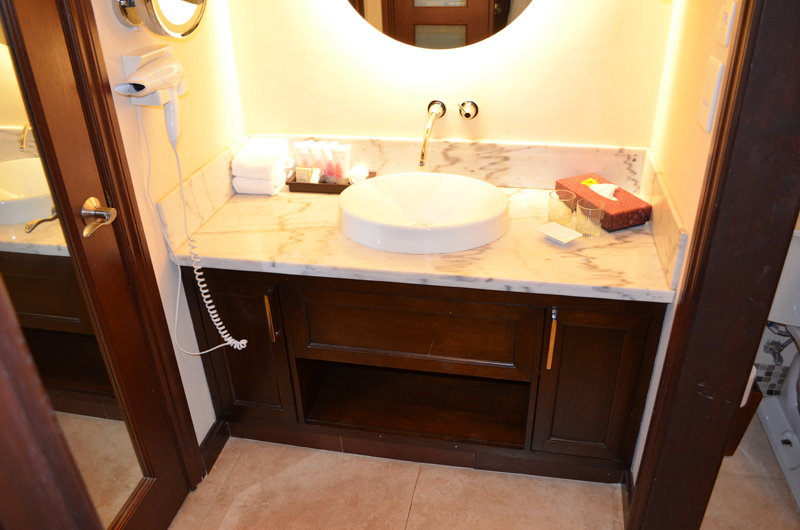 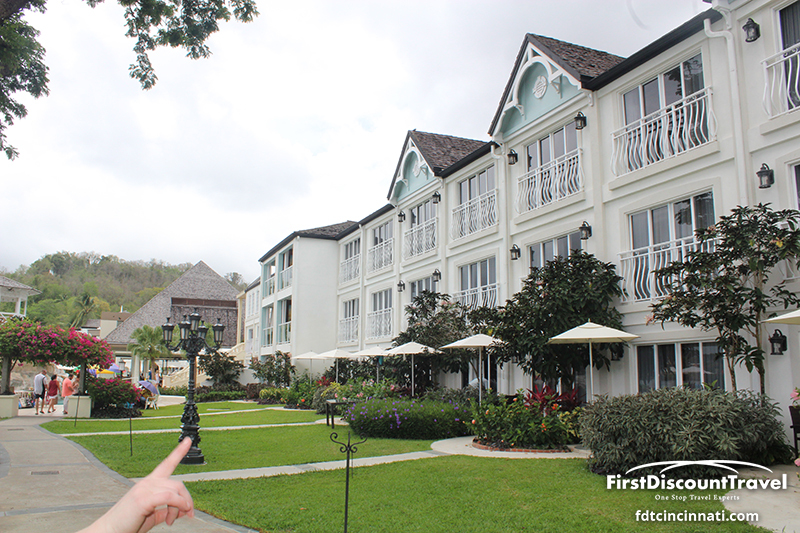 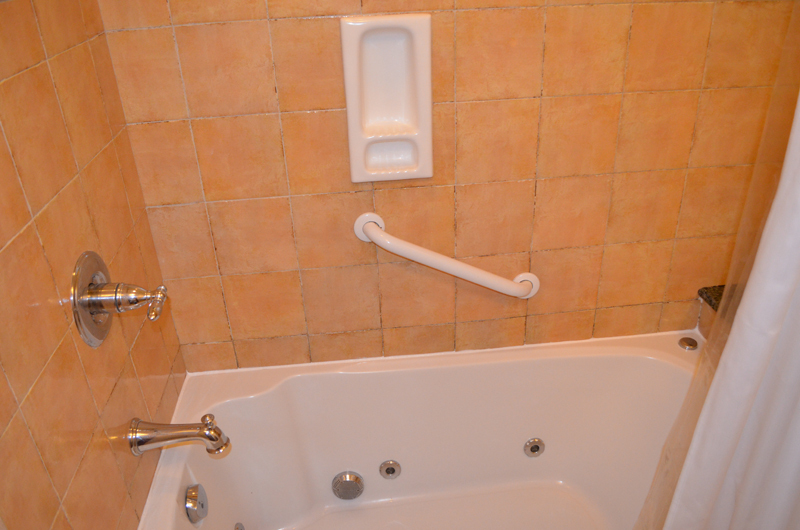 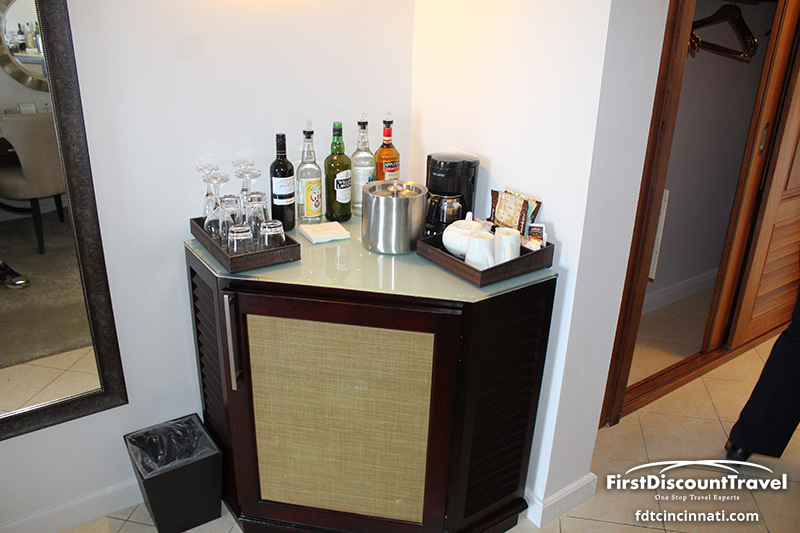 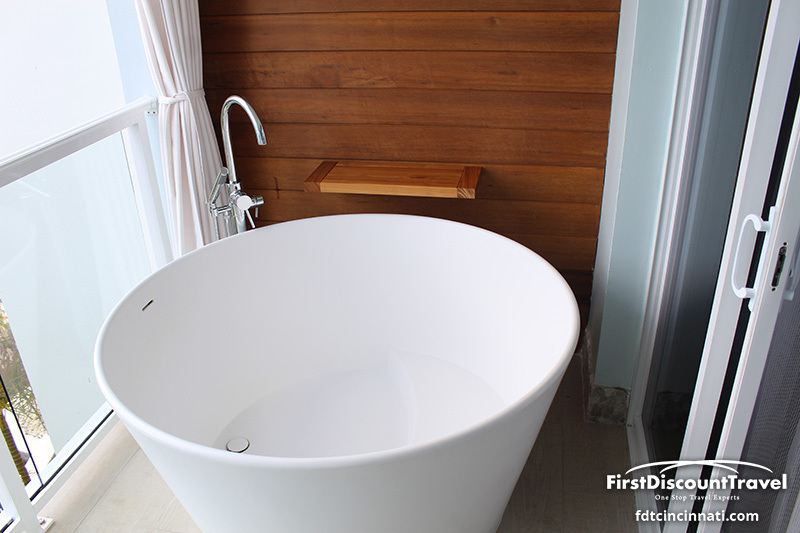 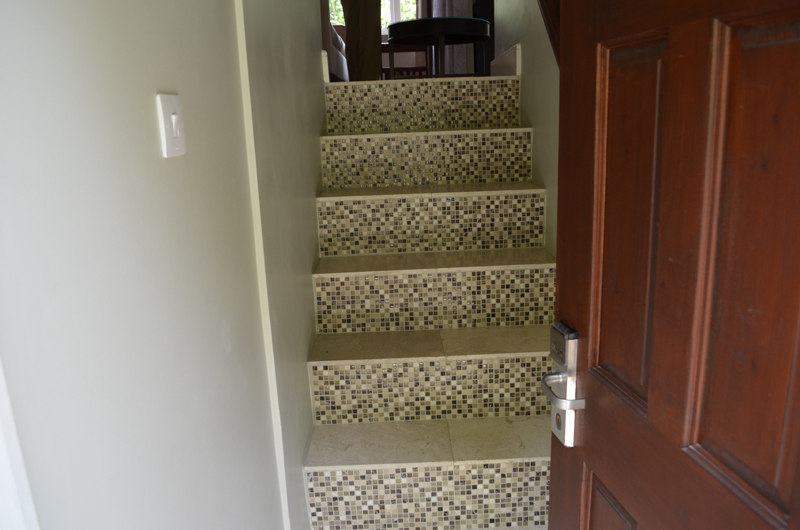 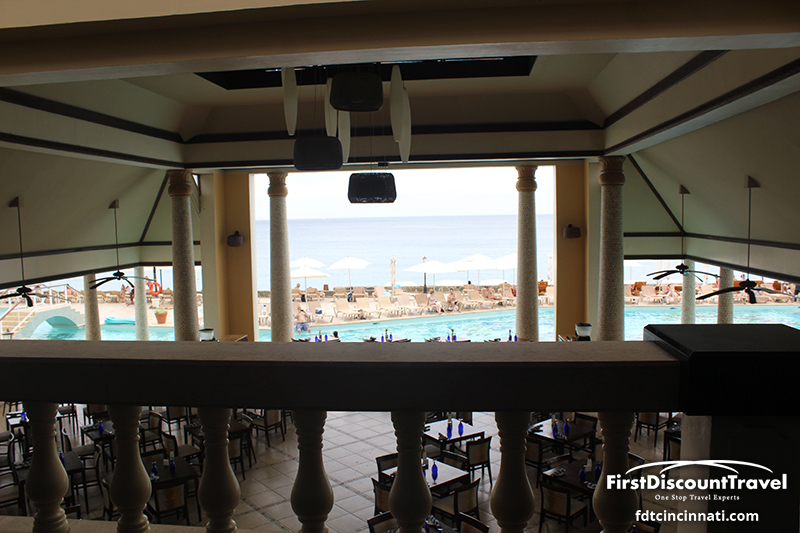 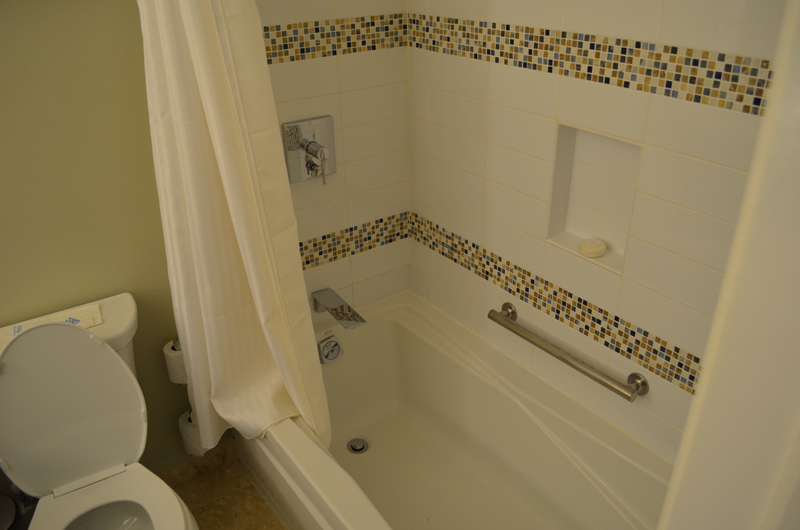 I was pleasantly surprised by Sandals La Toc when I stayed there in August of 2013. 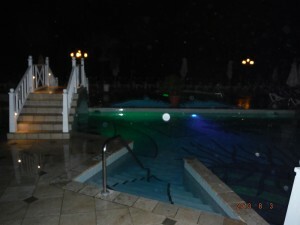 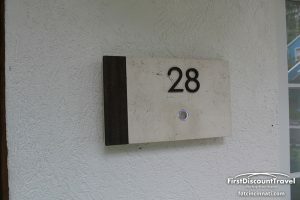 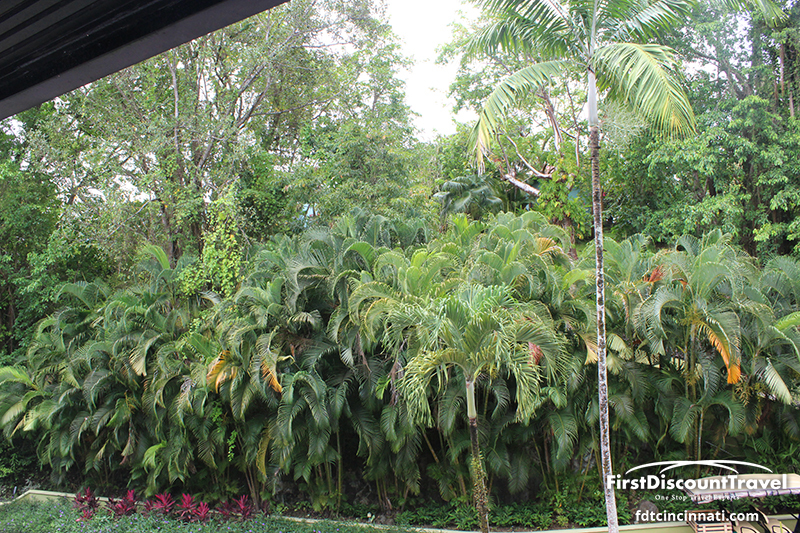 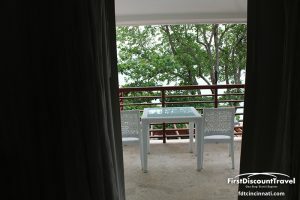 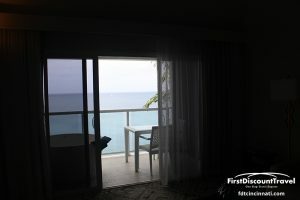 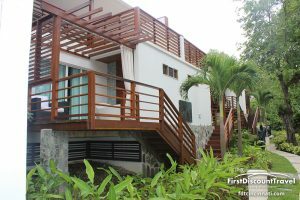 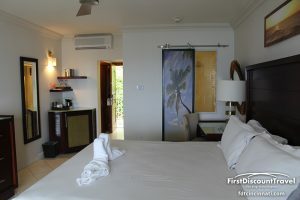 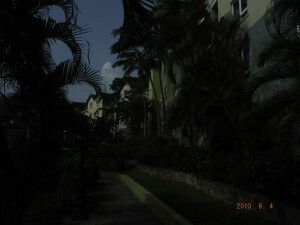 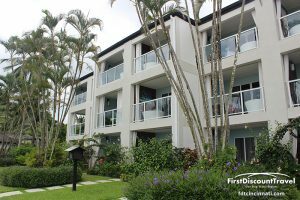 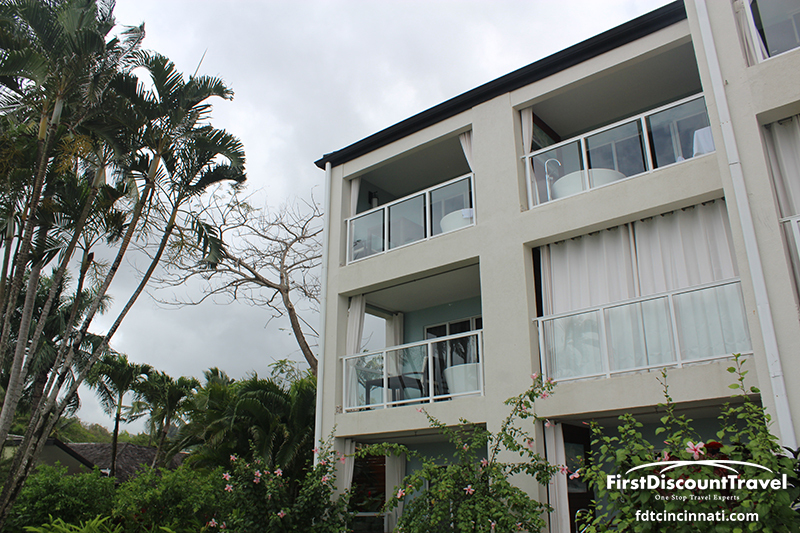 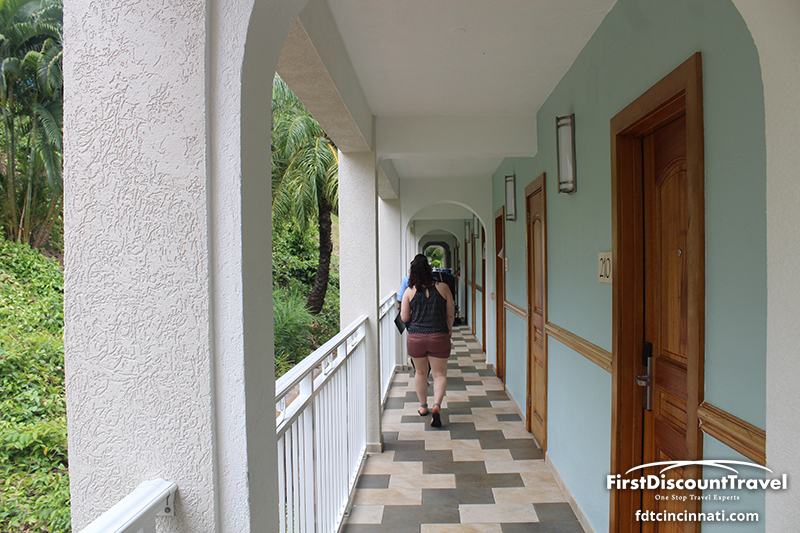 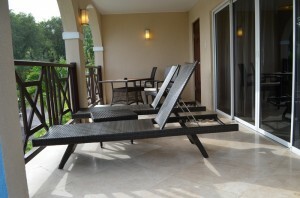 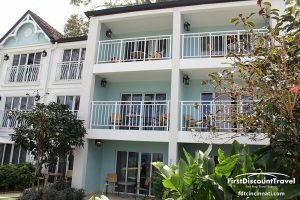 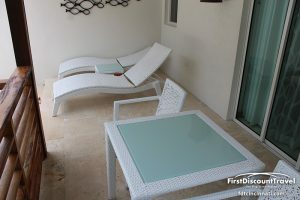 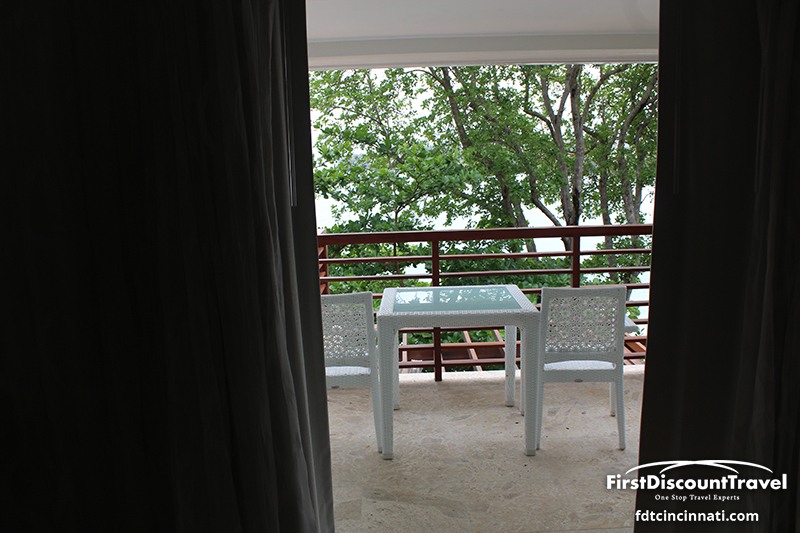 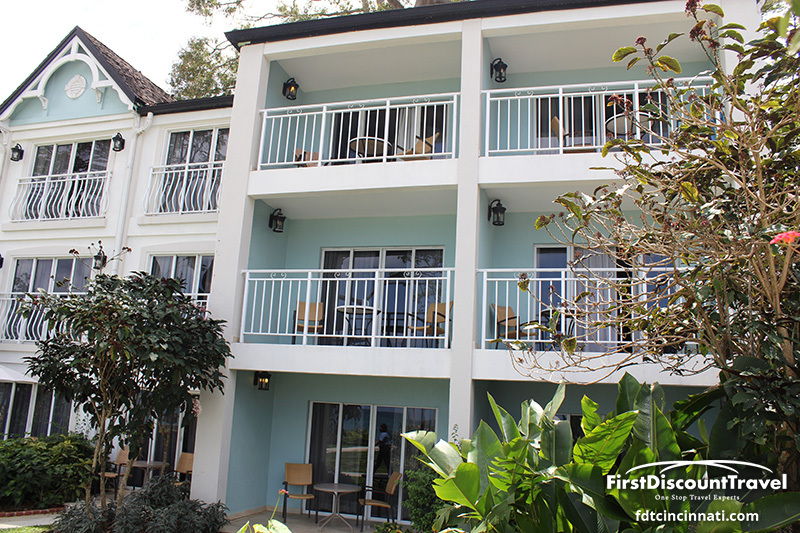 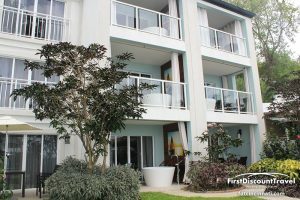 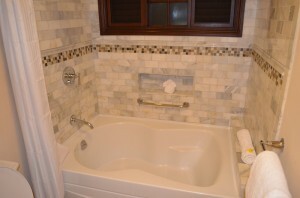 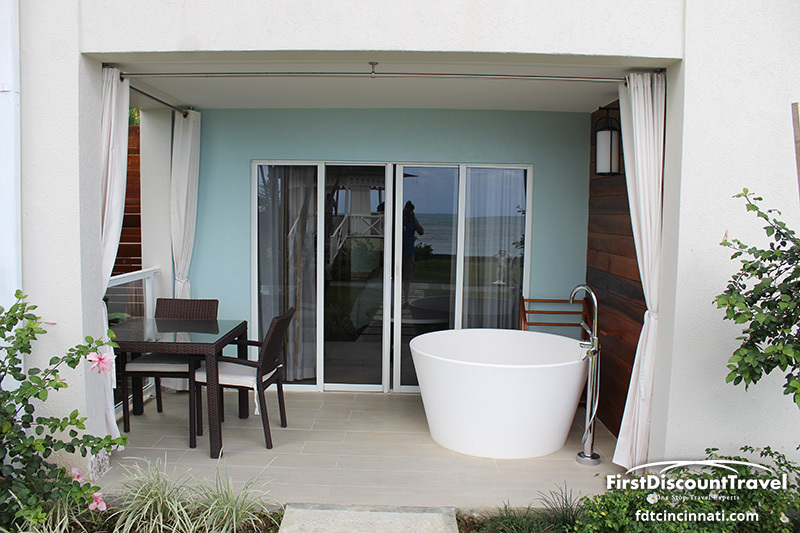 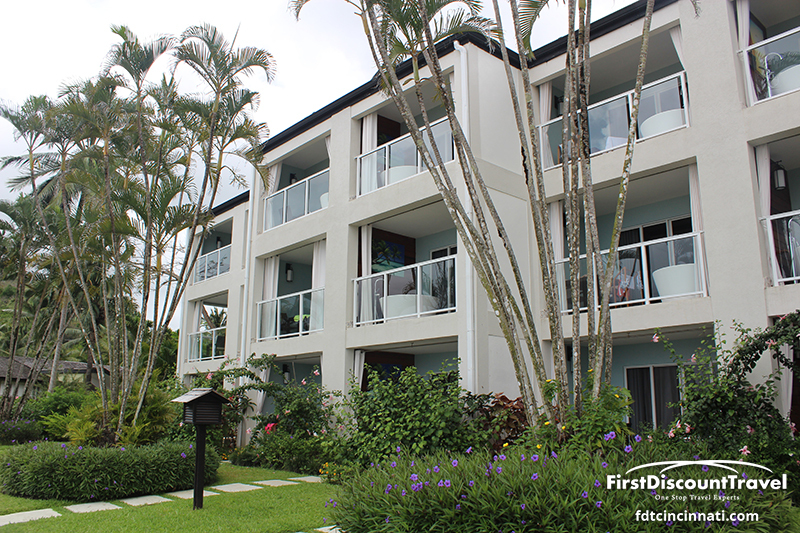 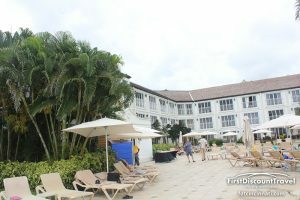 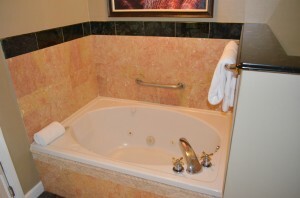 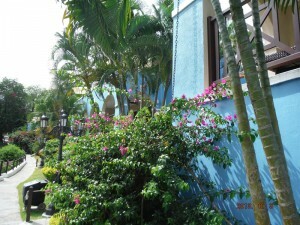 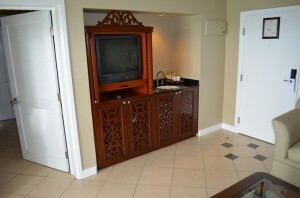 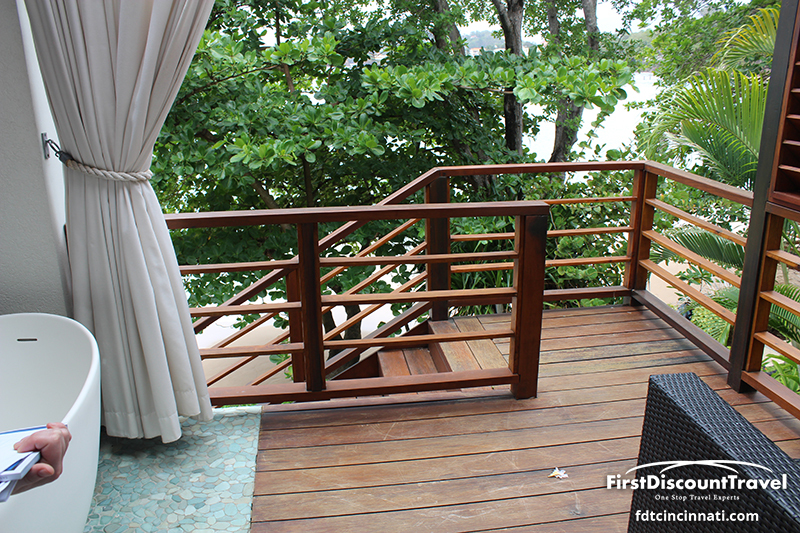 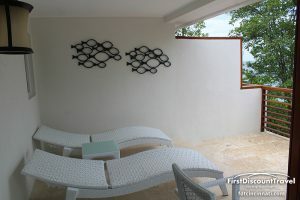 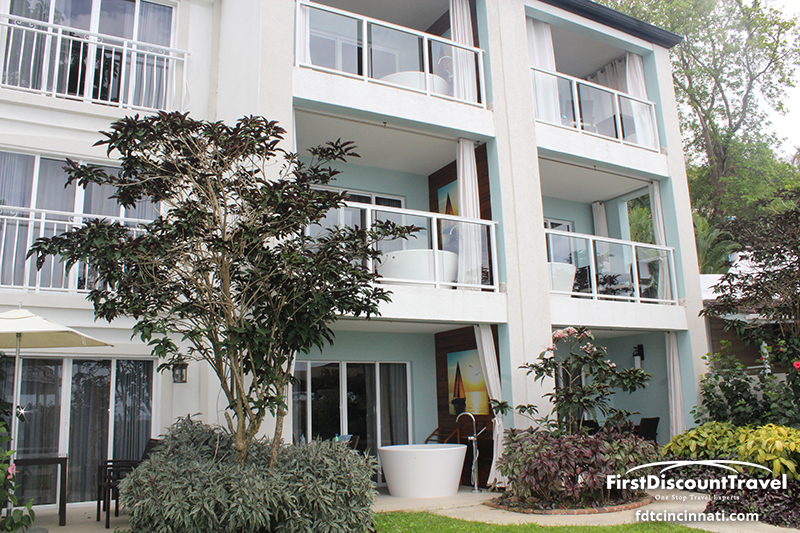 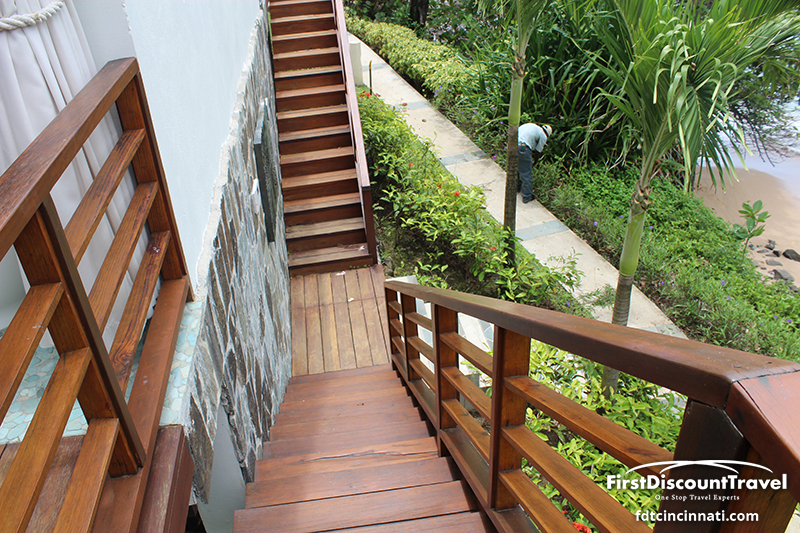 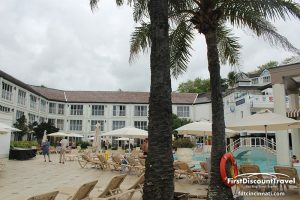 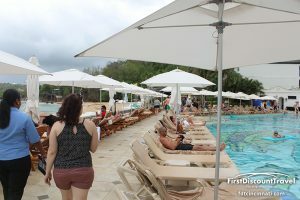 The resort has a nice beach, an awesome pool area, and great suites. 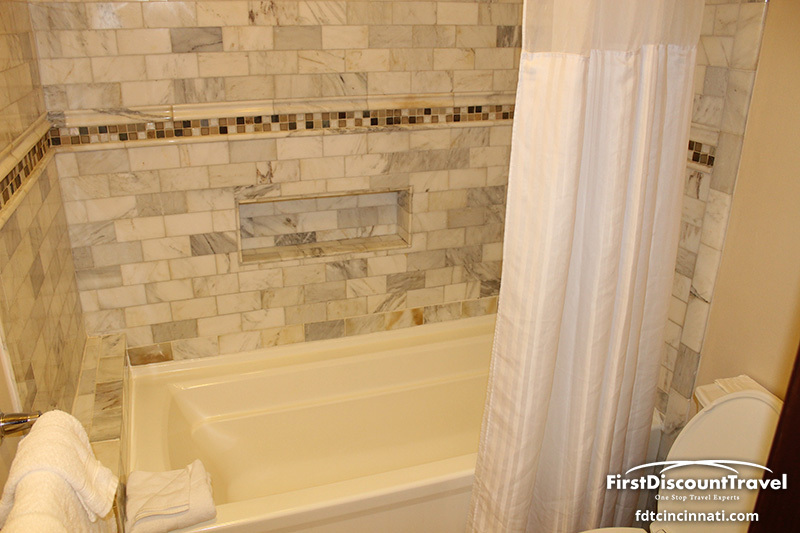 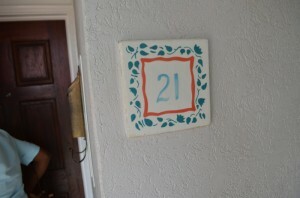 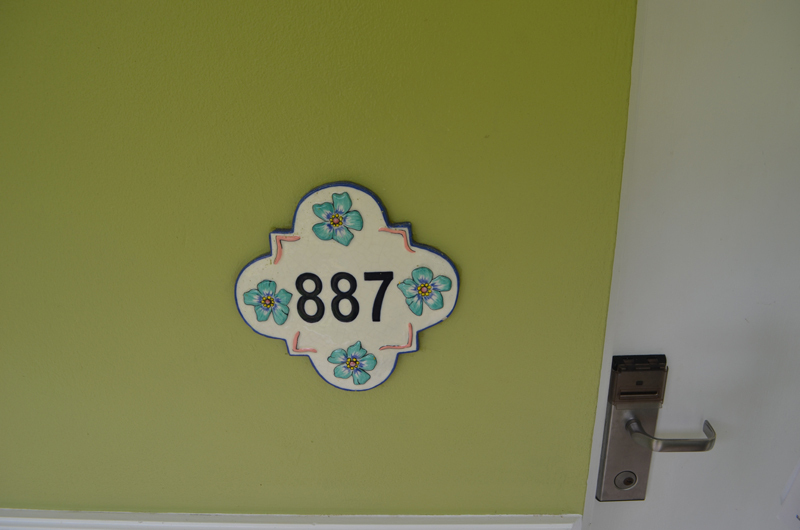 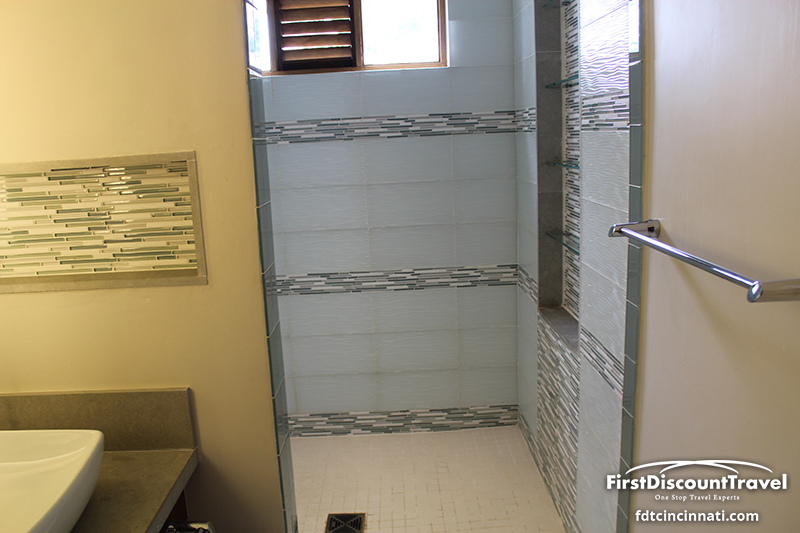 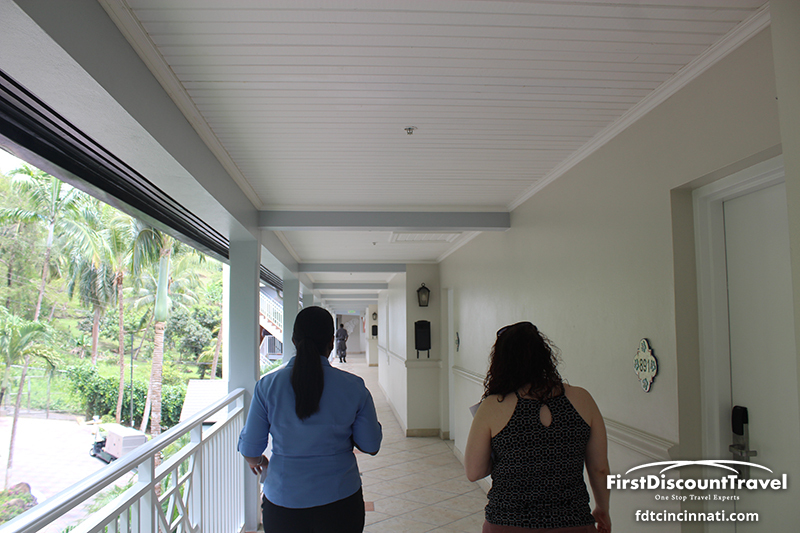 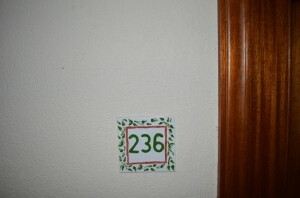 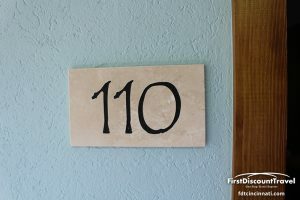 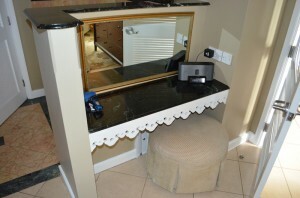 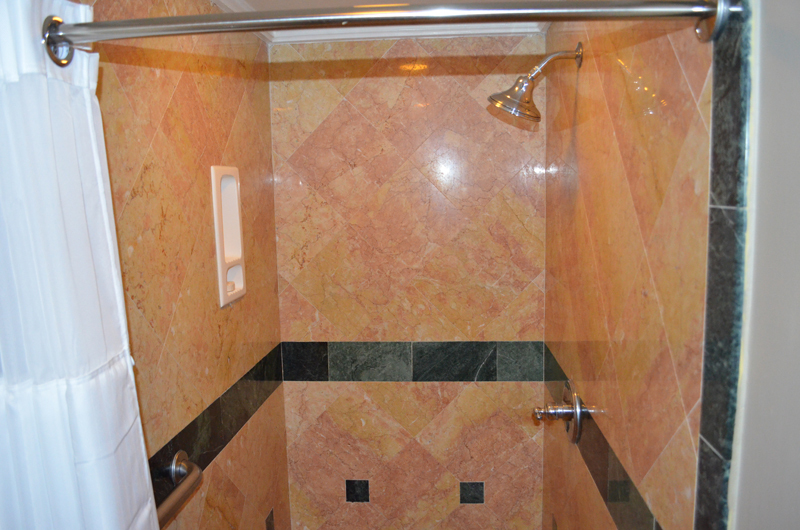 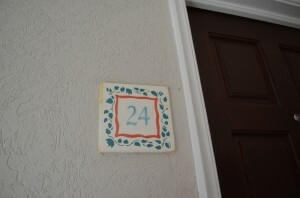 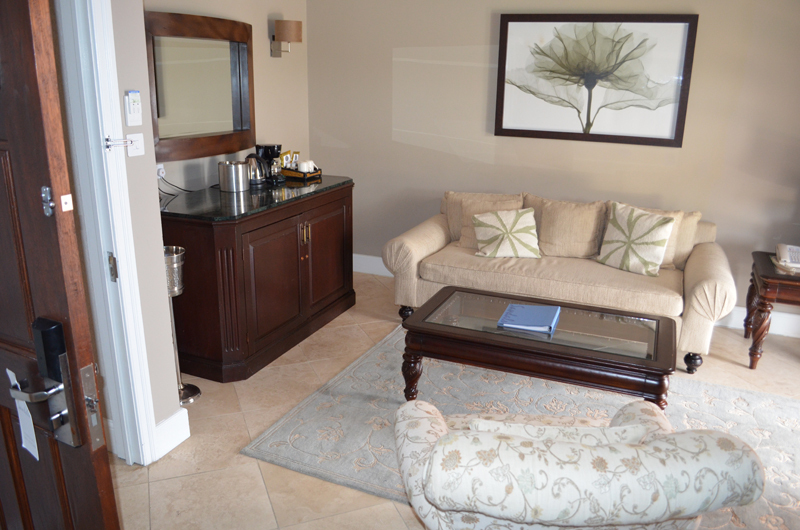 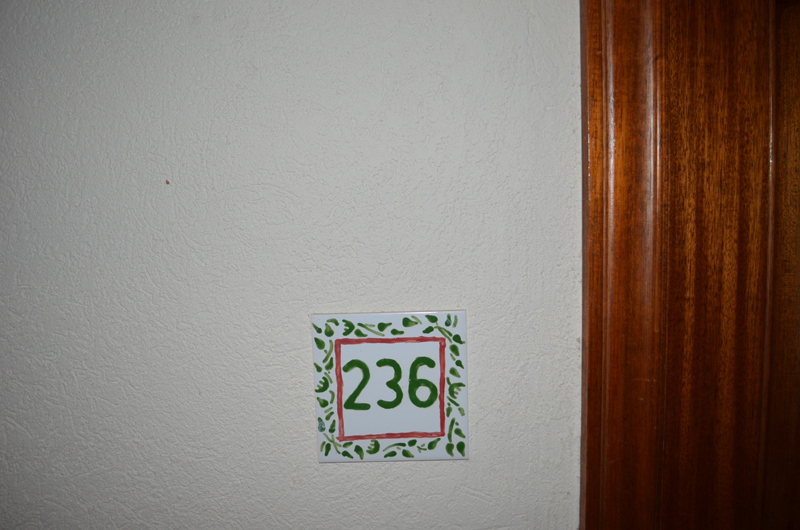 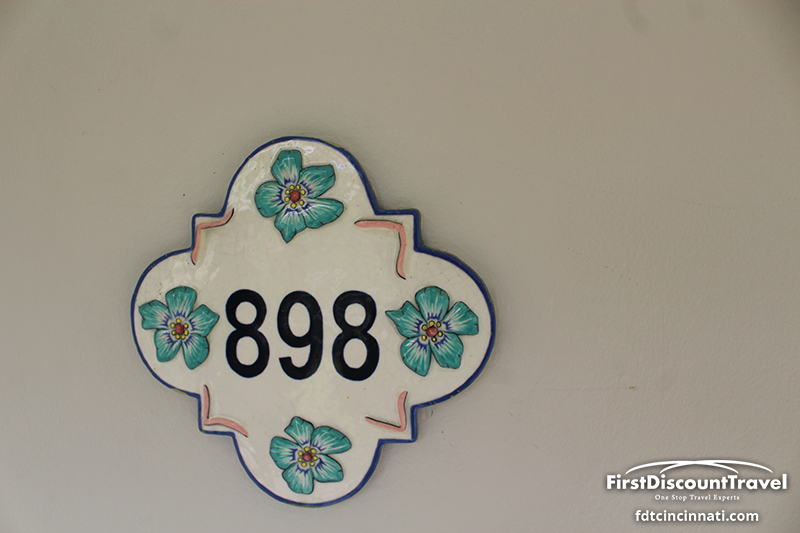 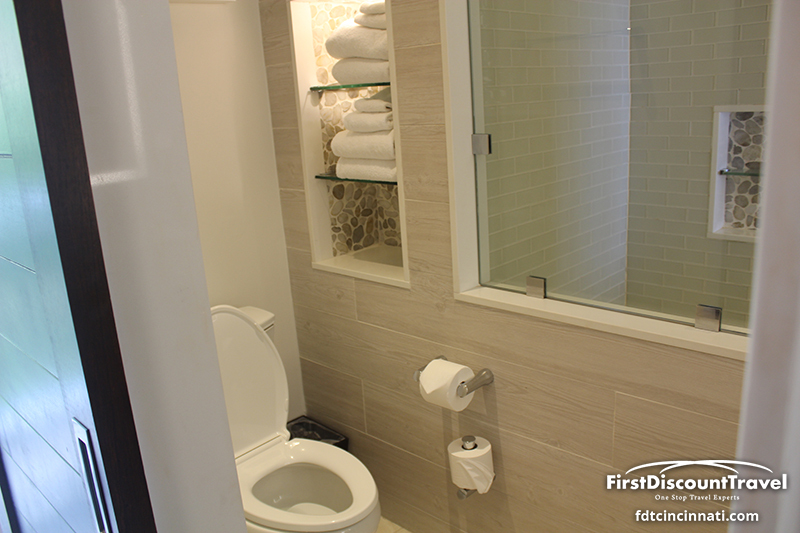 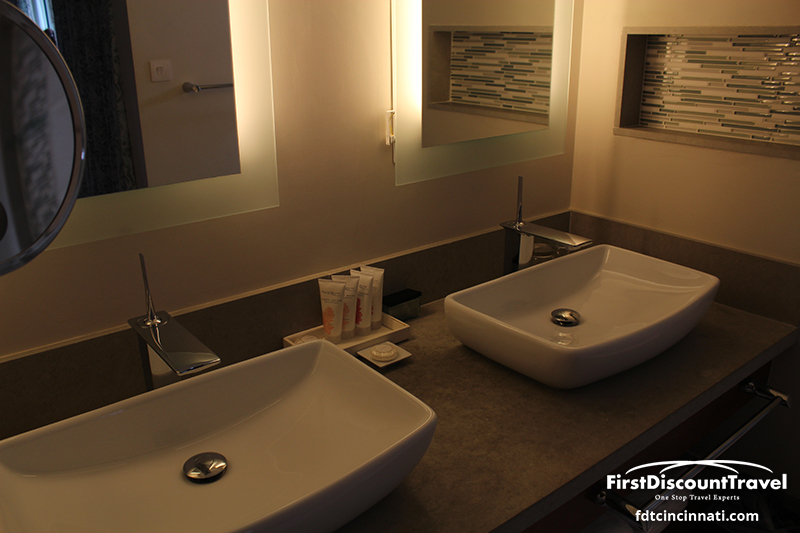 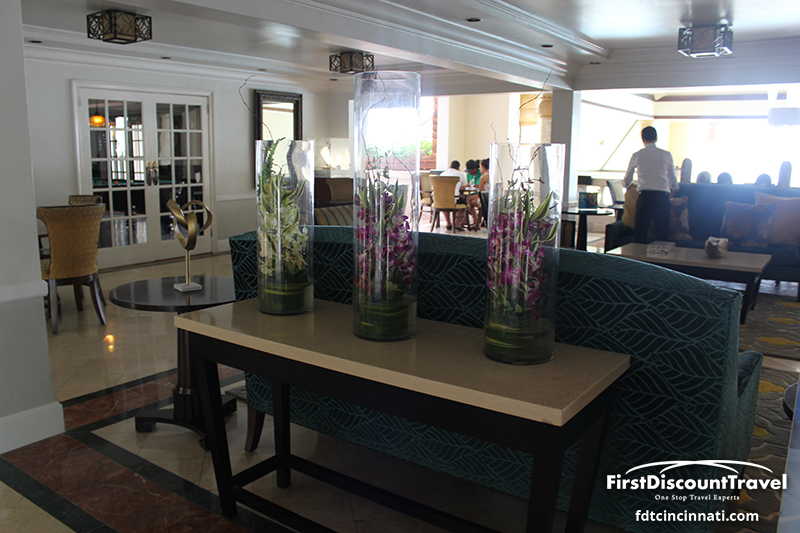 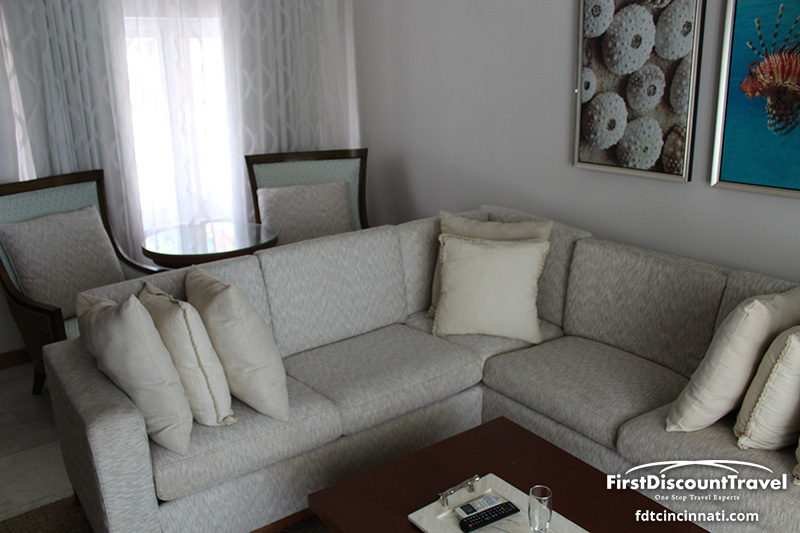 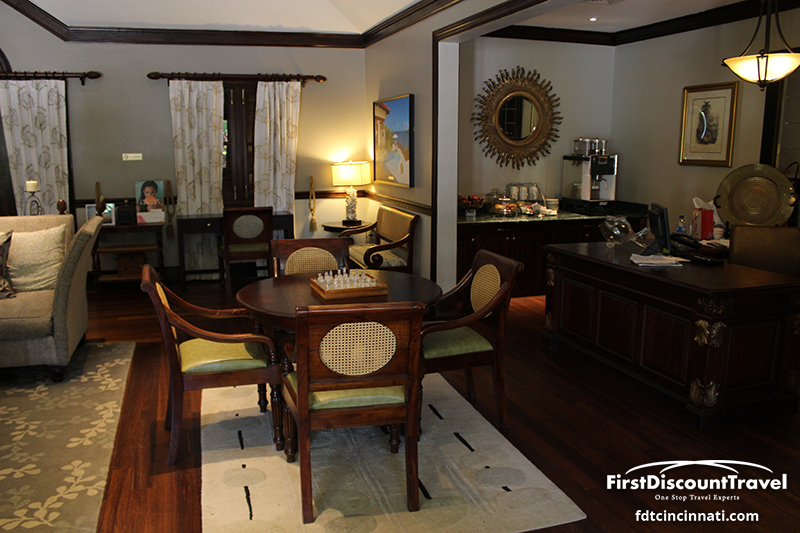 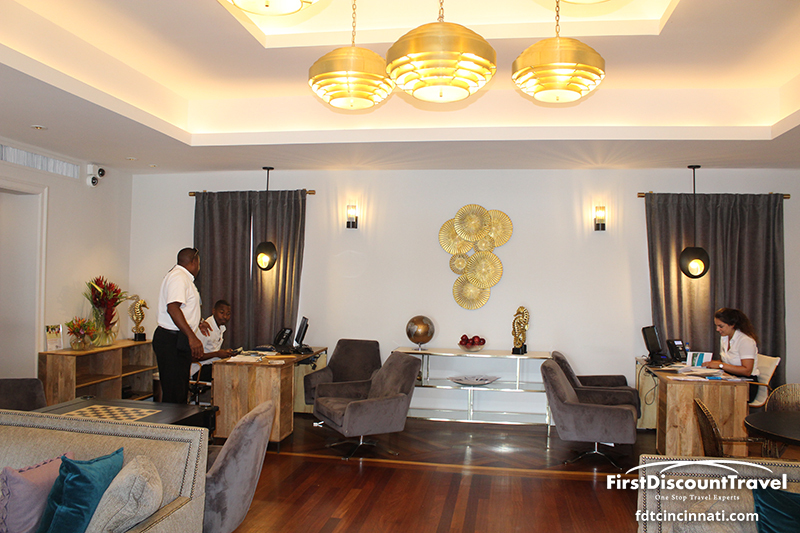 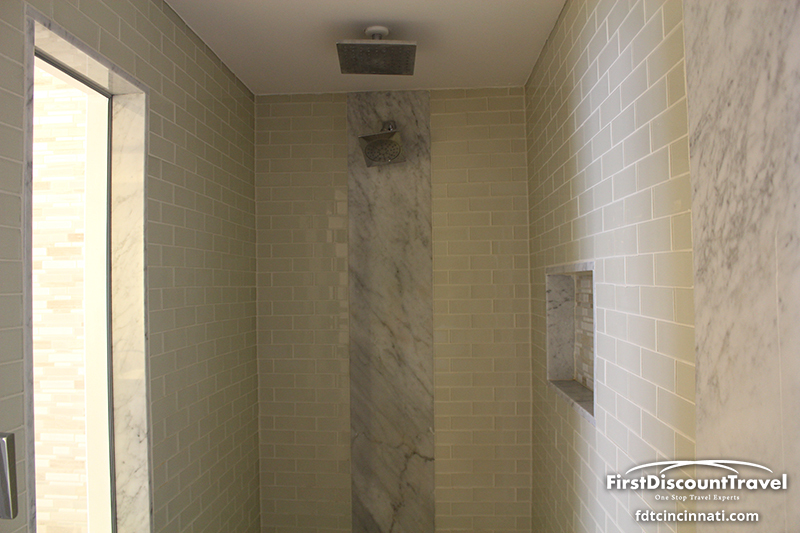 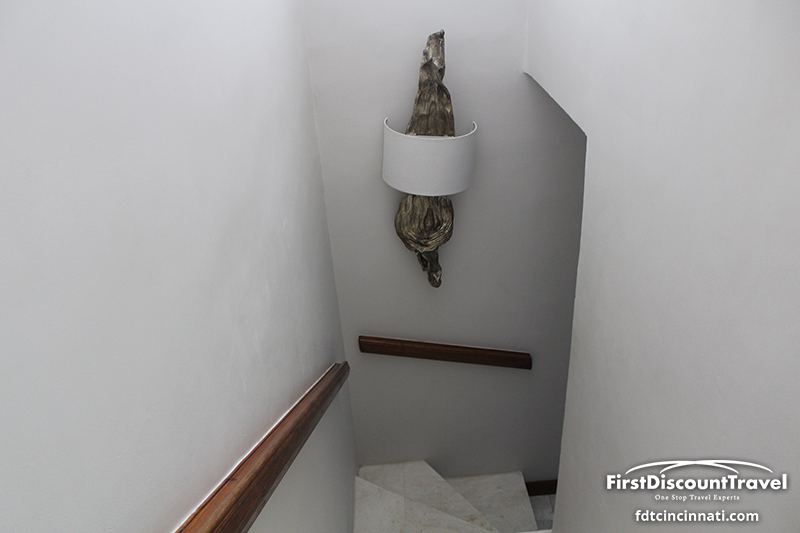 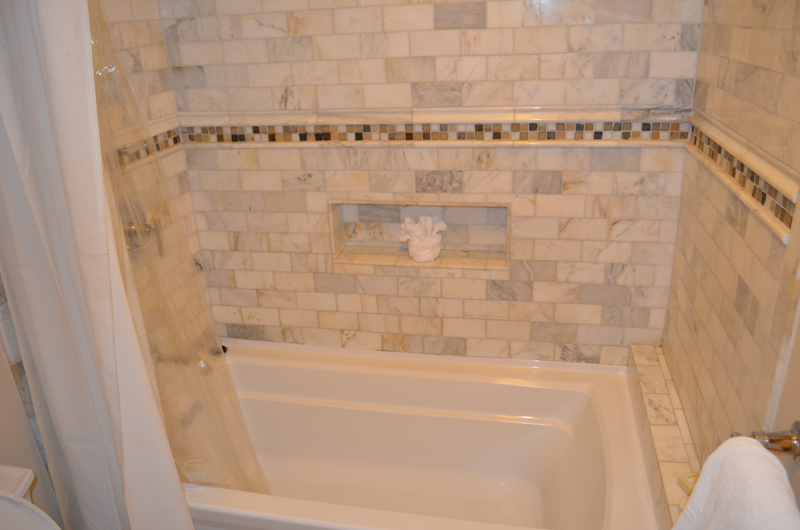 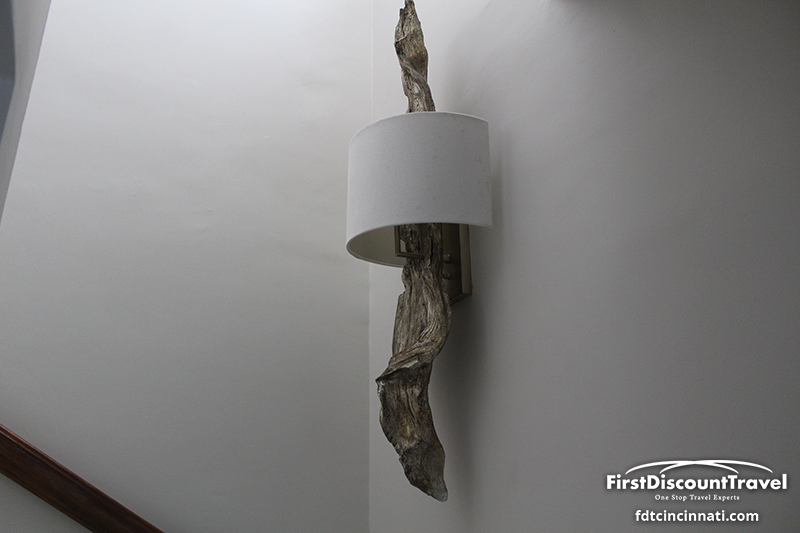 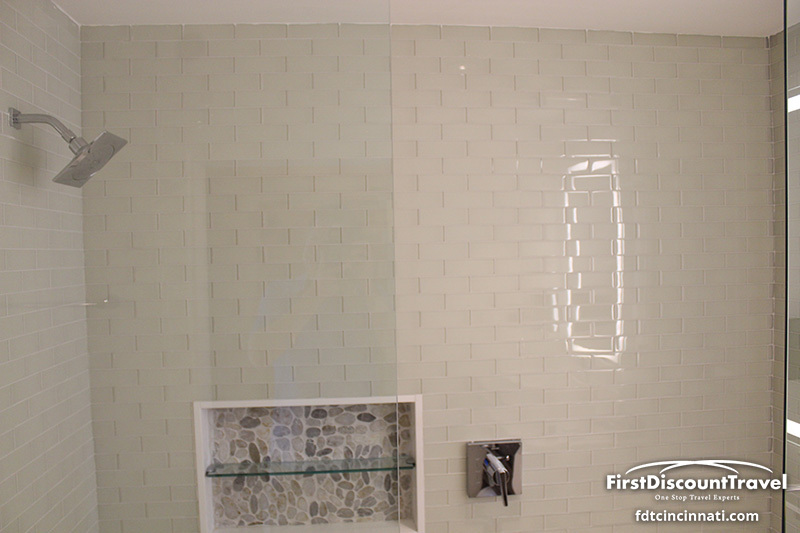 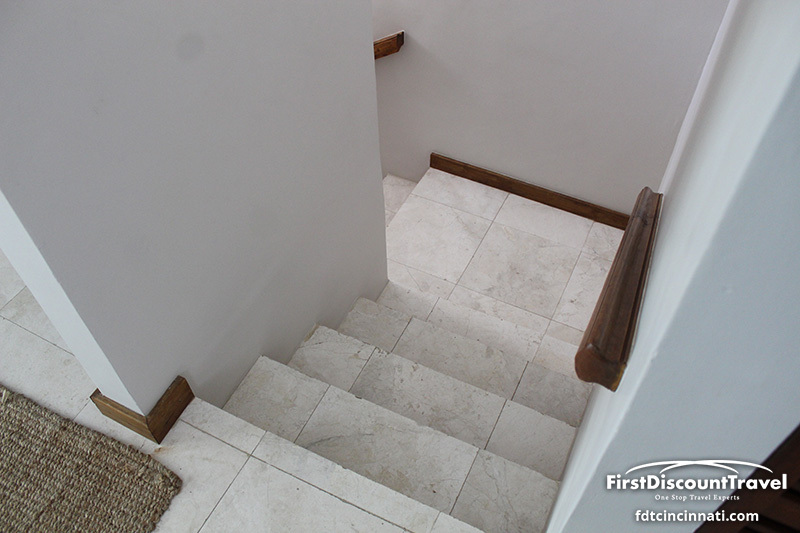 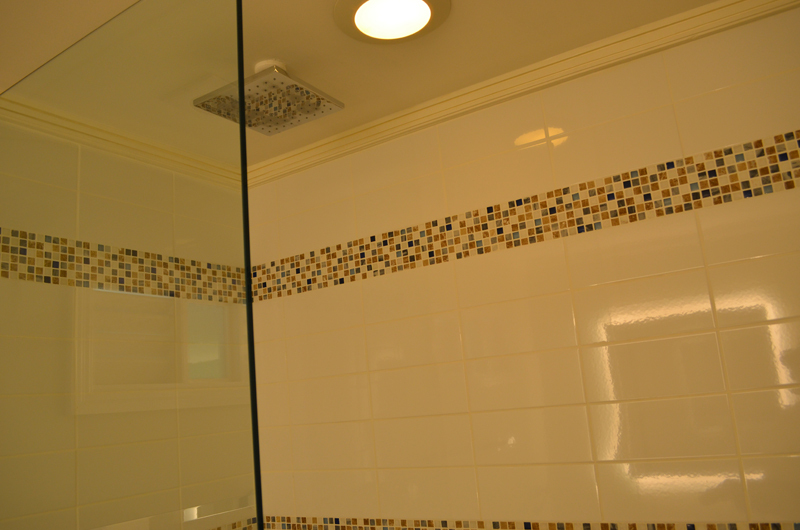 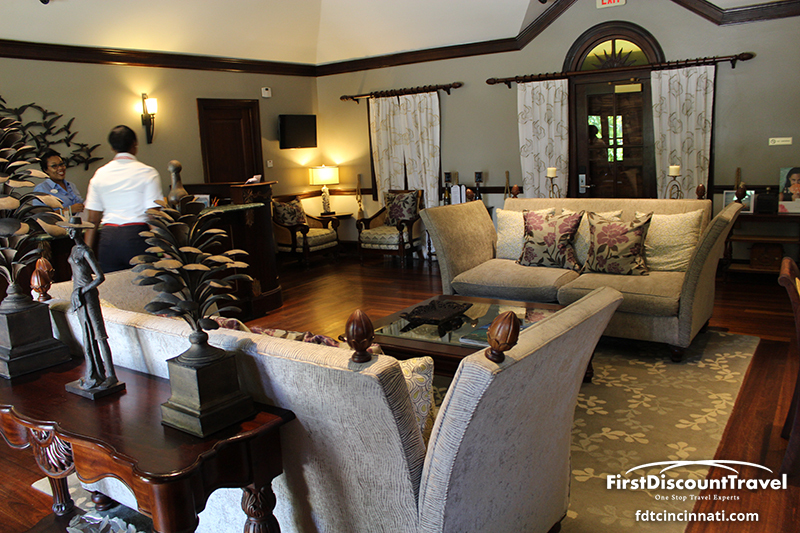 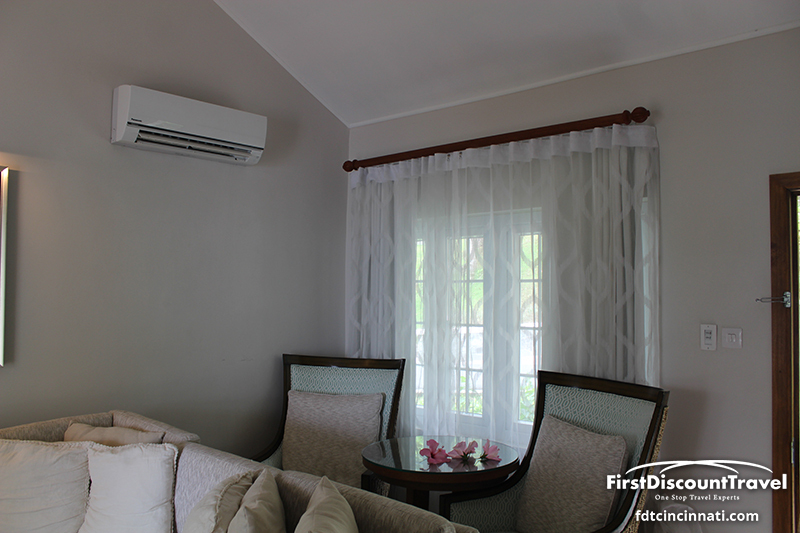 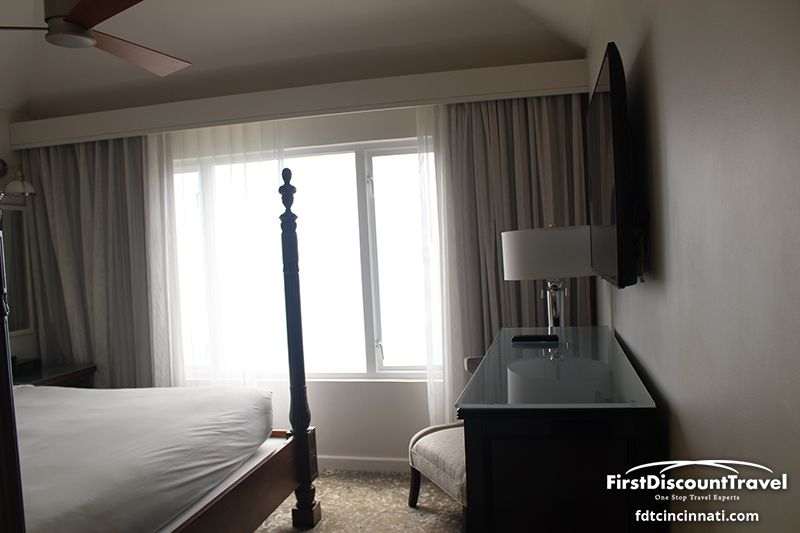 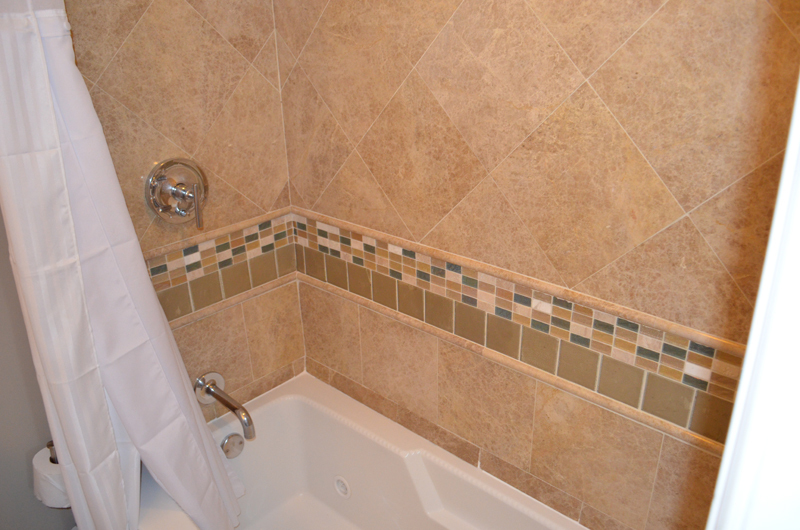 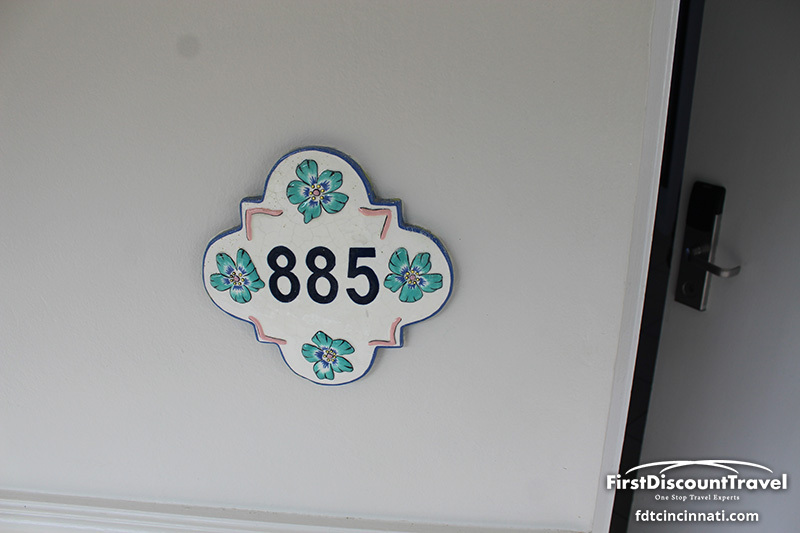 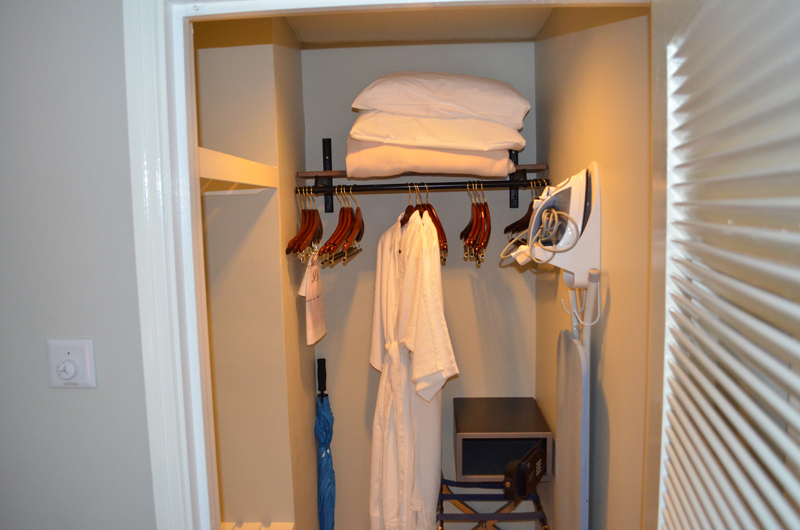 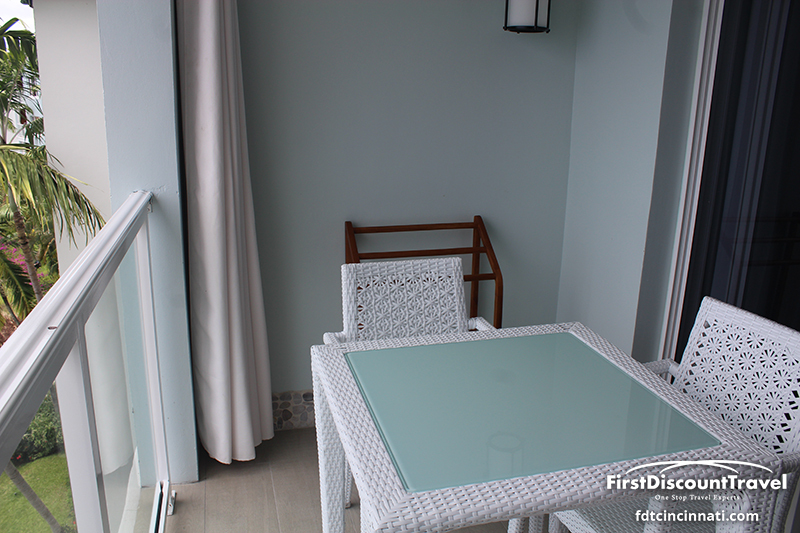 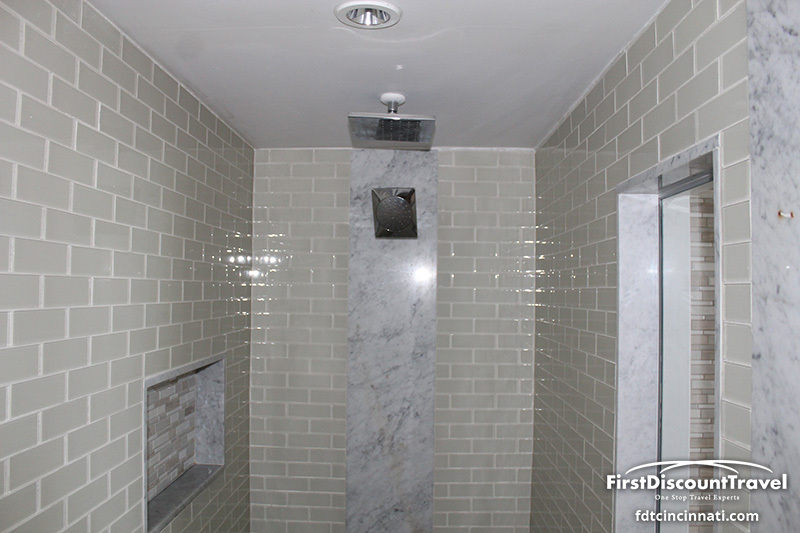 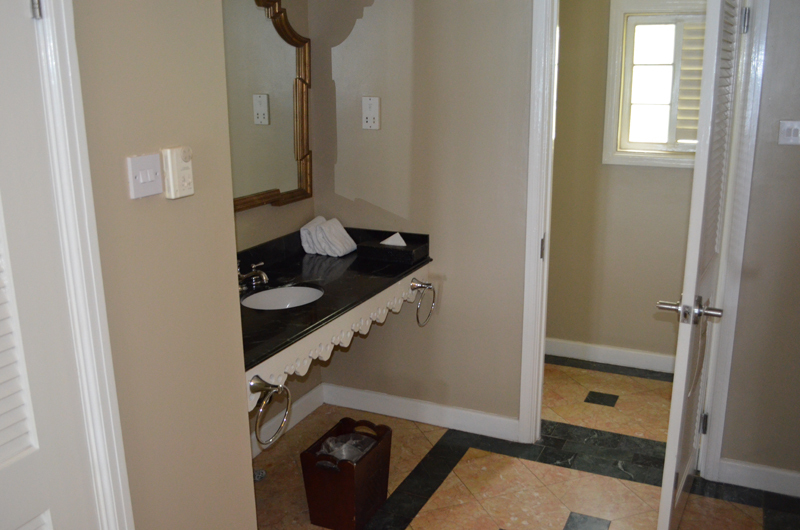 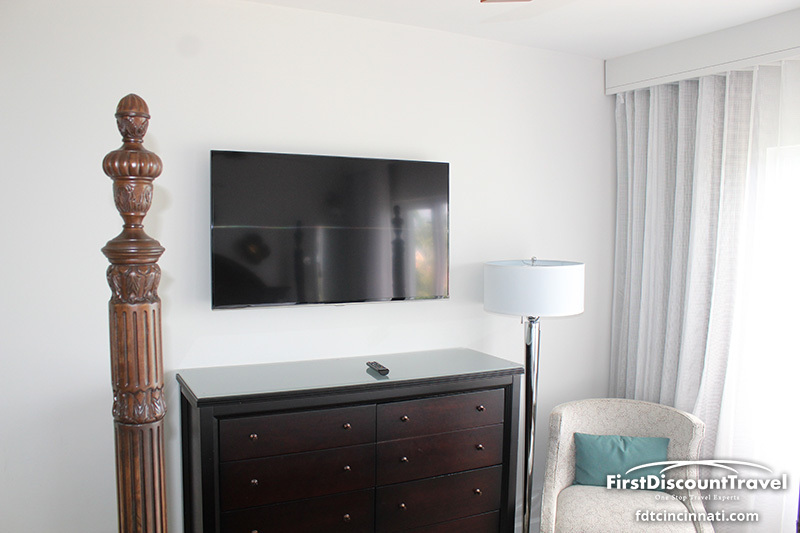 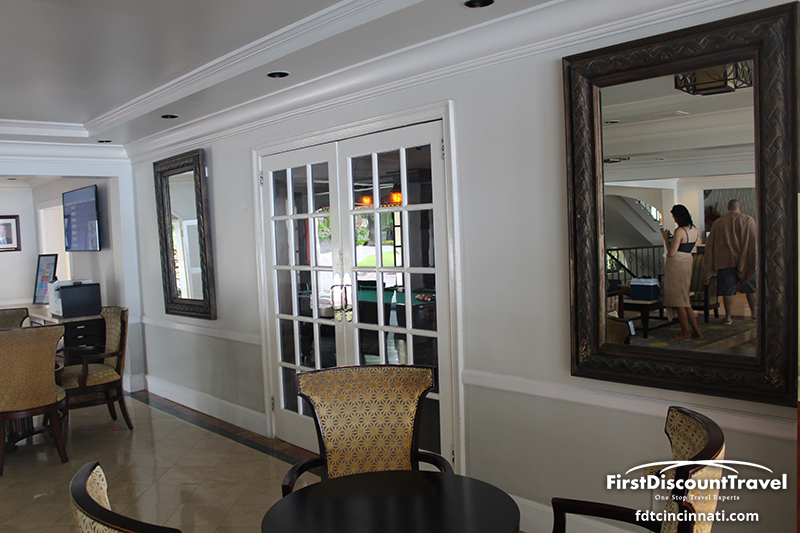 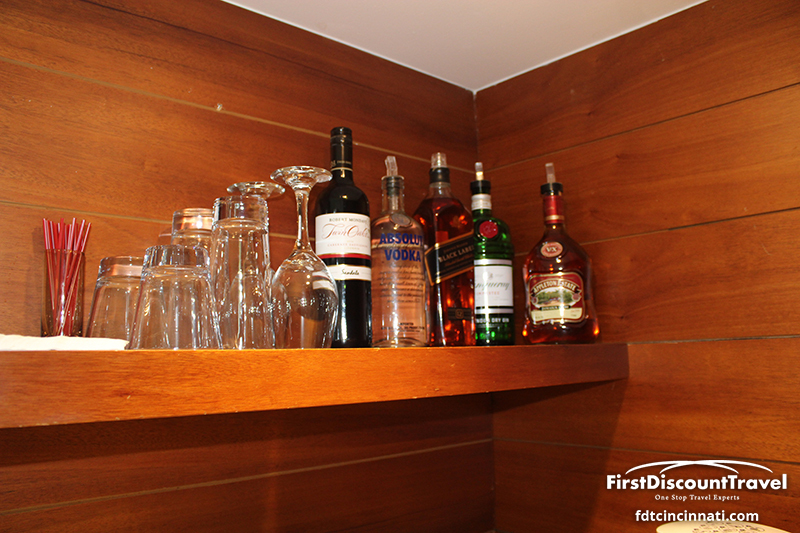 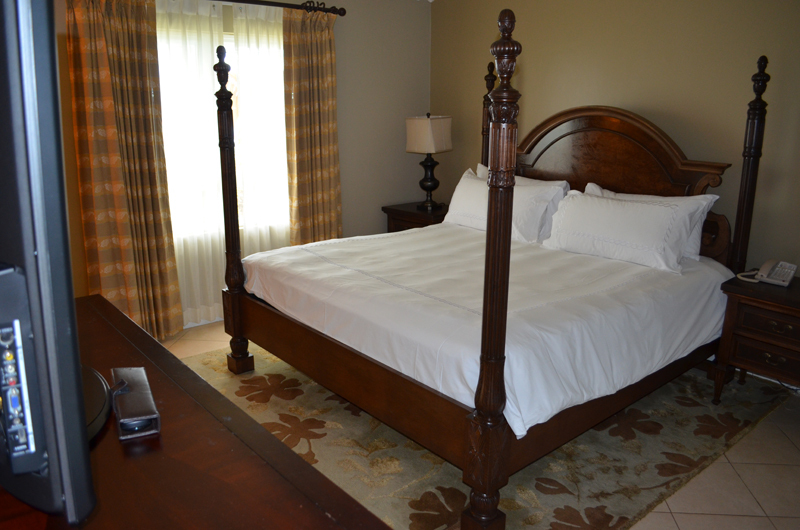 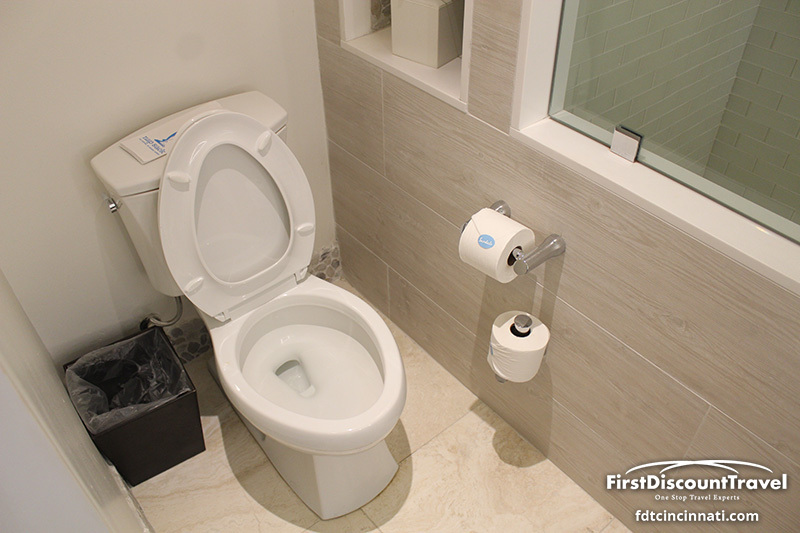 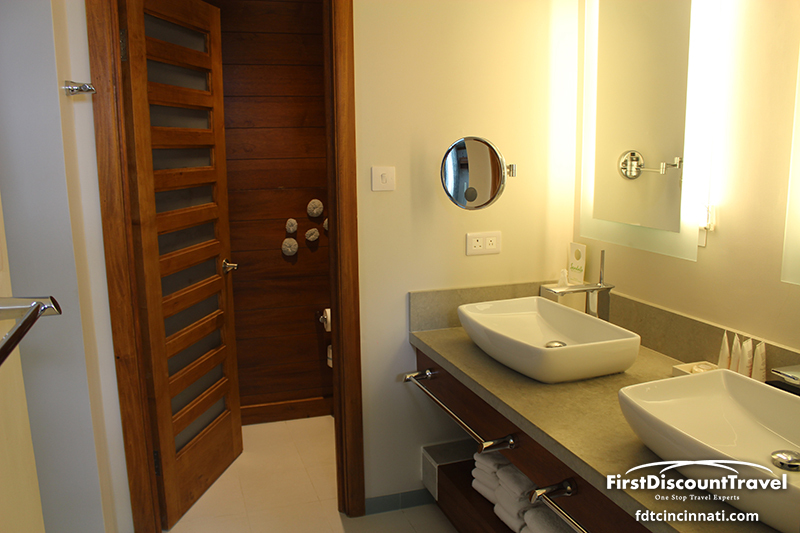 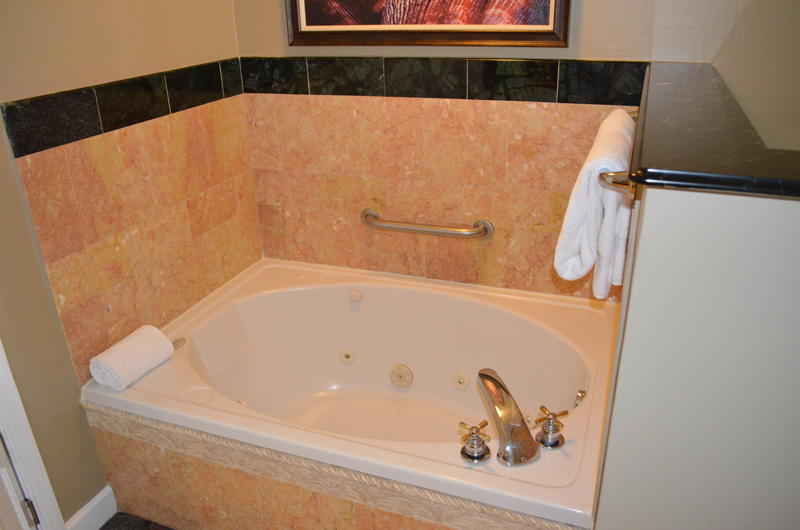 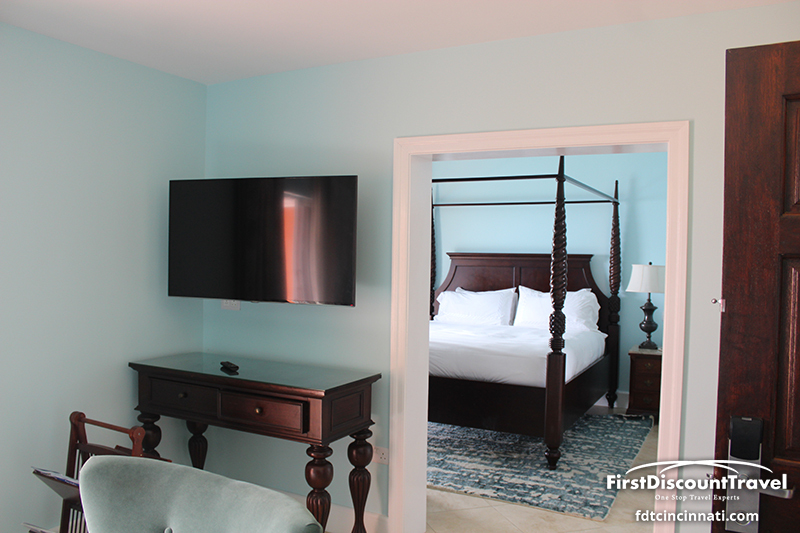 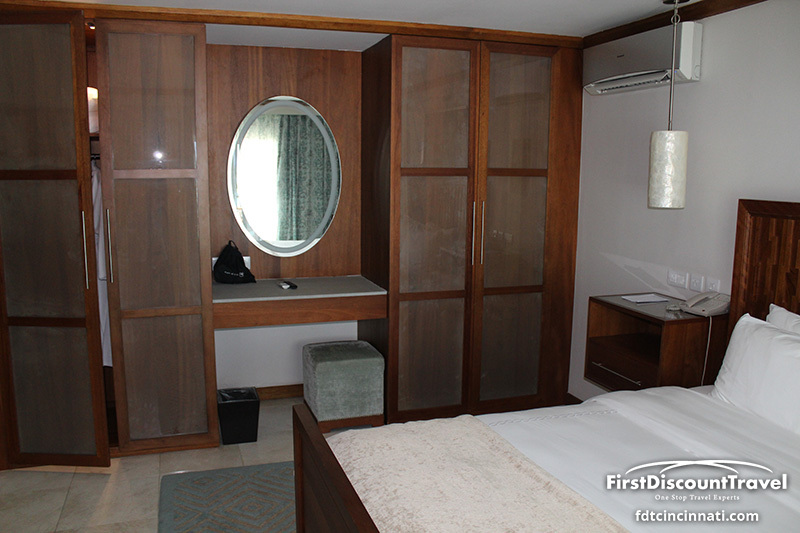 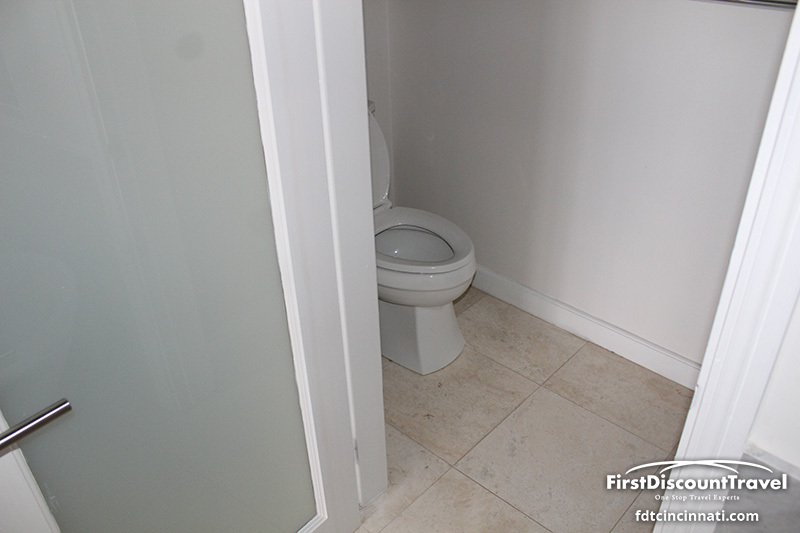 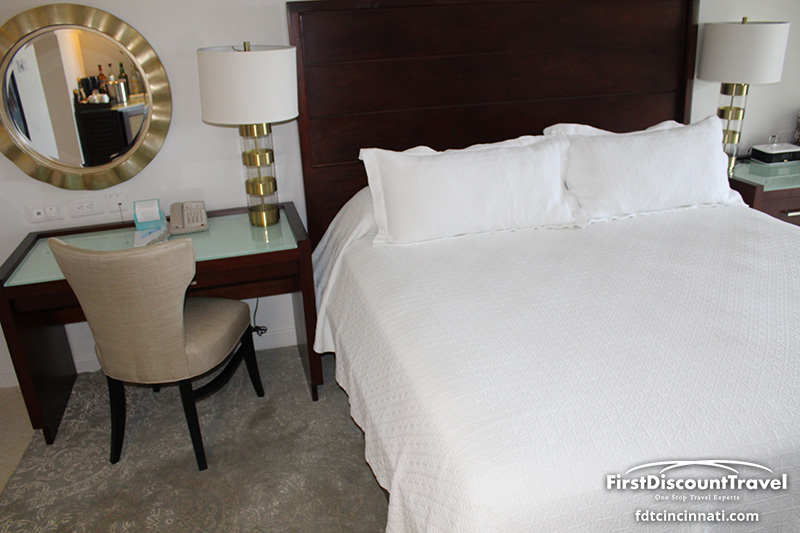 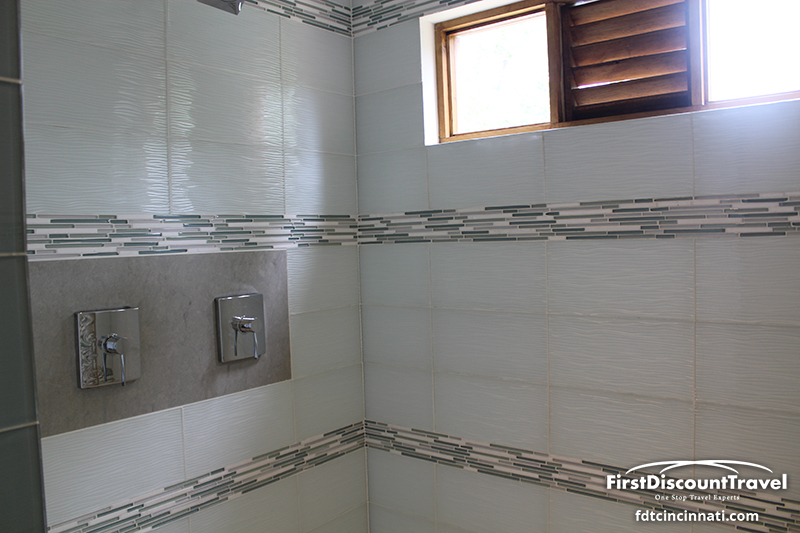 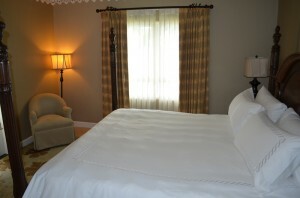 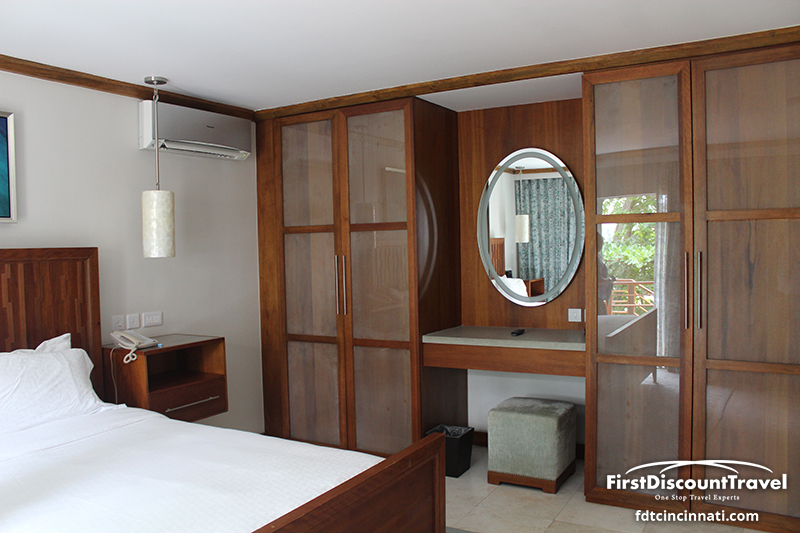 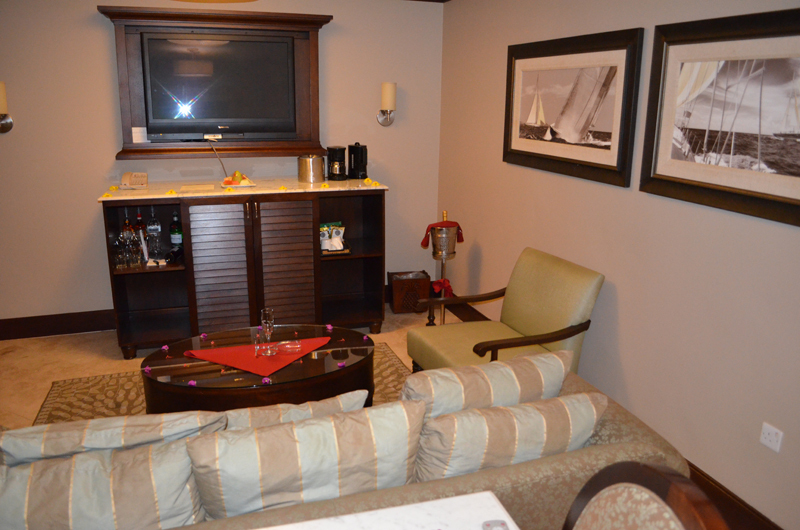 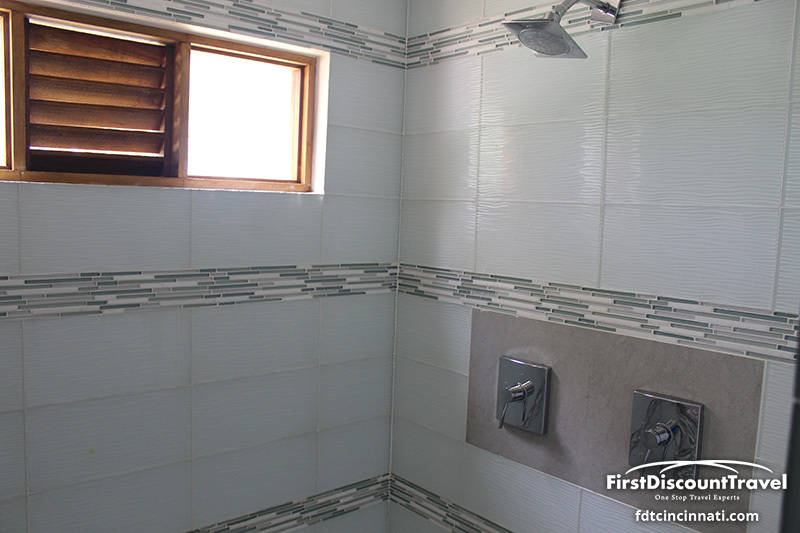 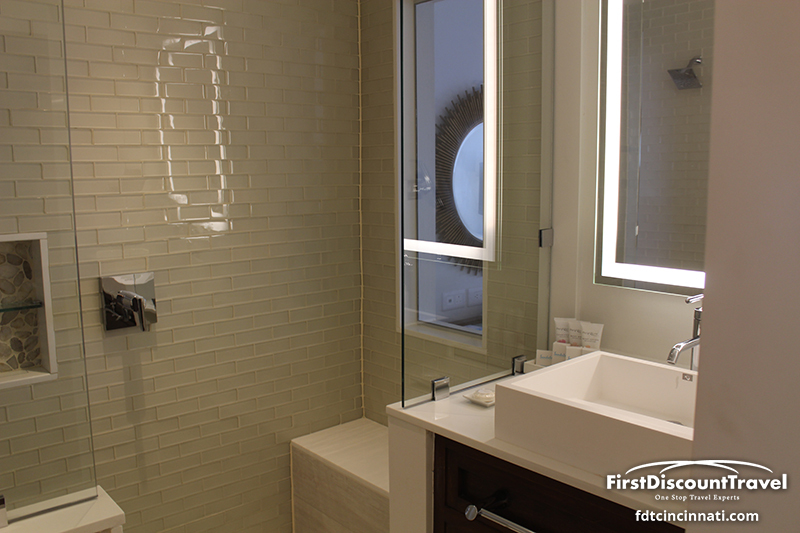 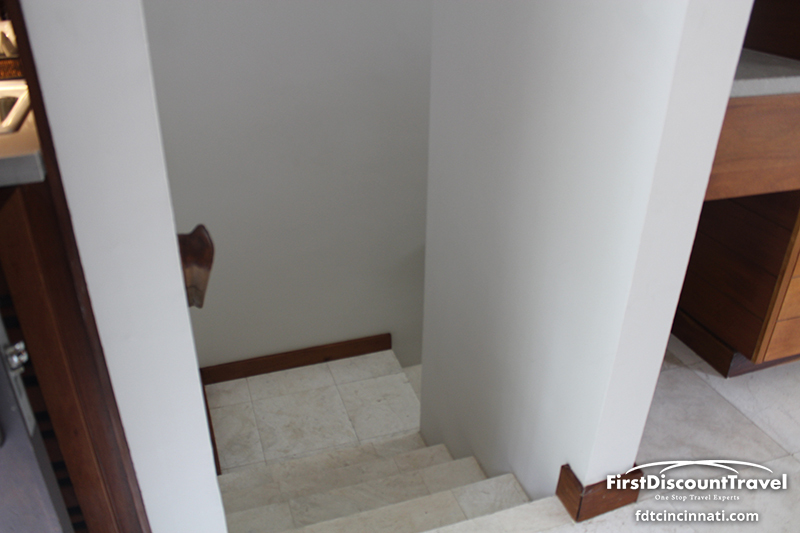 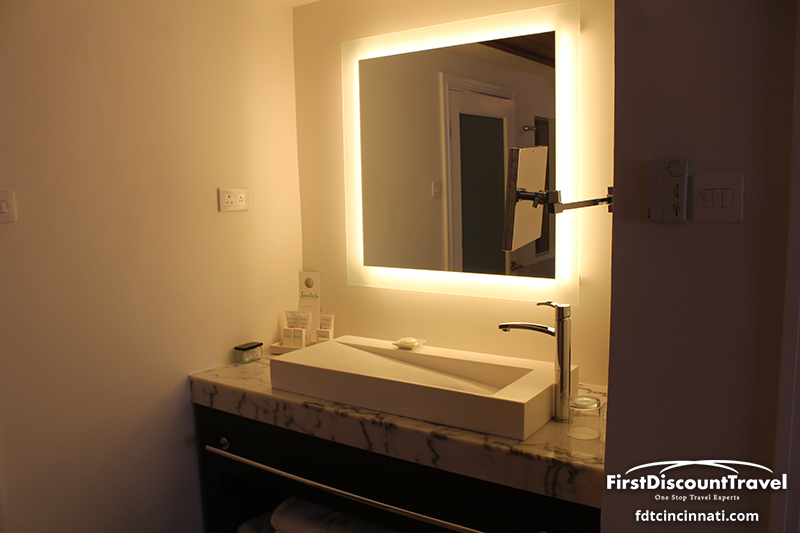 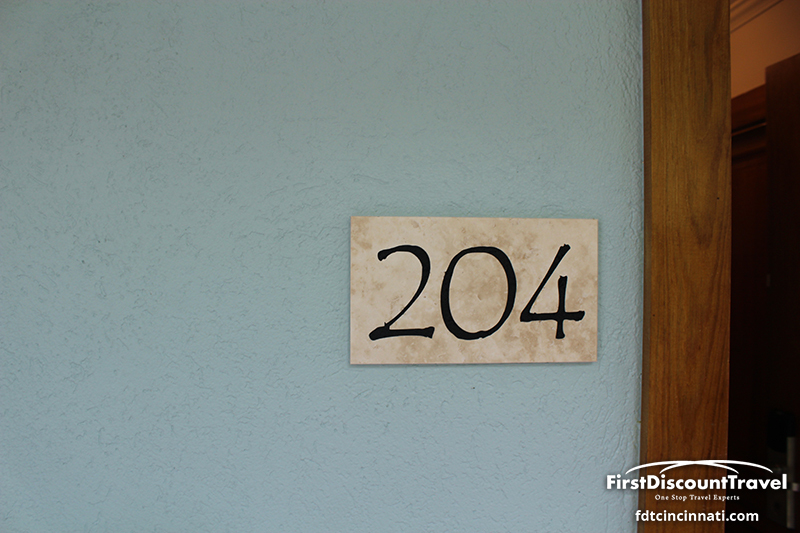 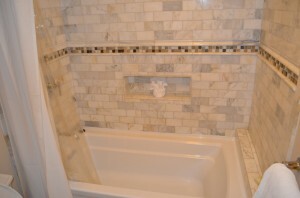 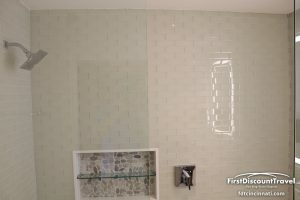 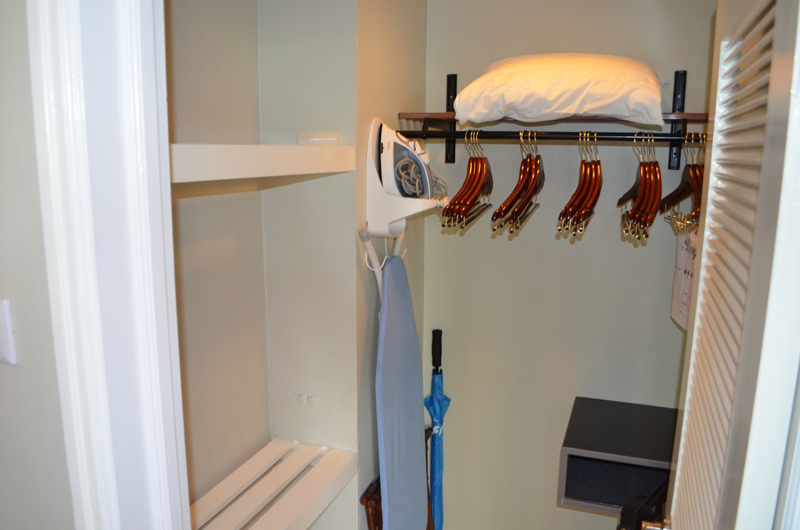 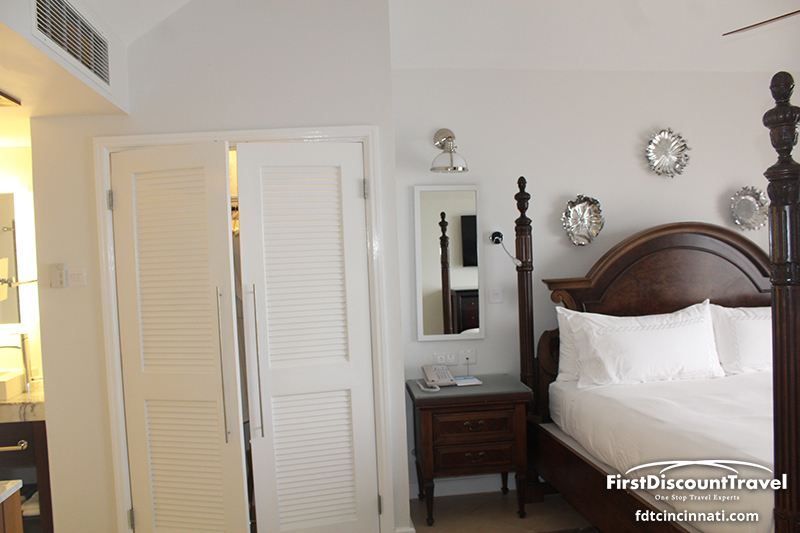 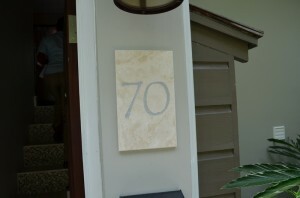 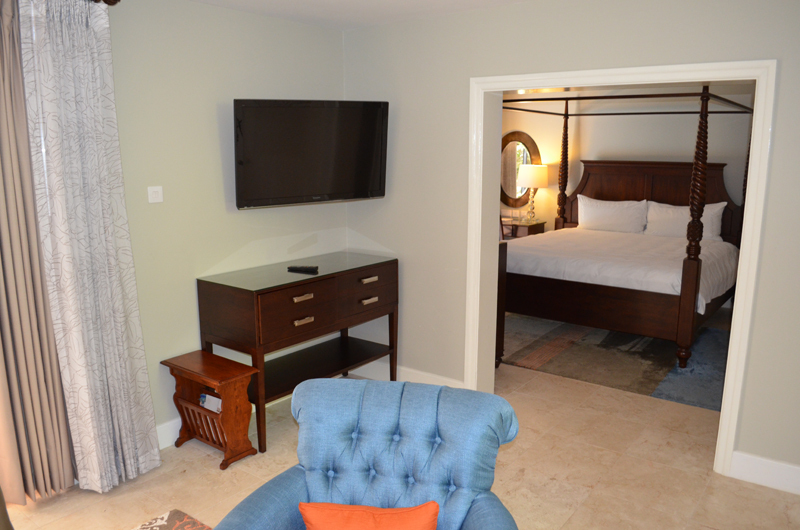 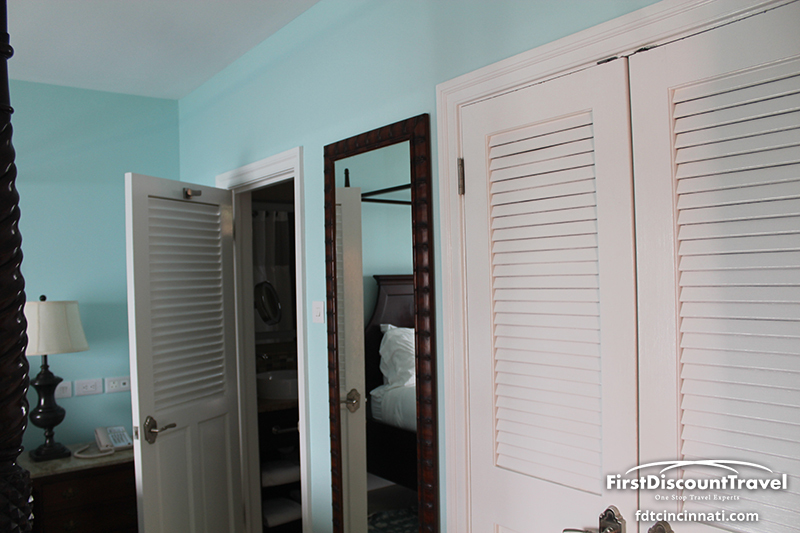 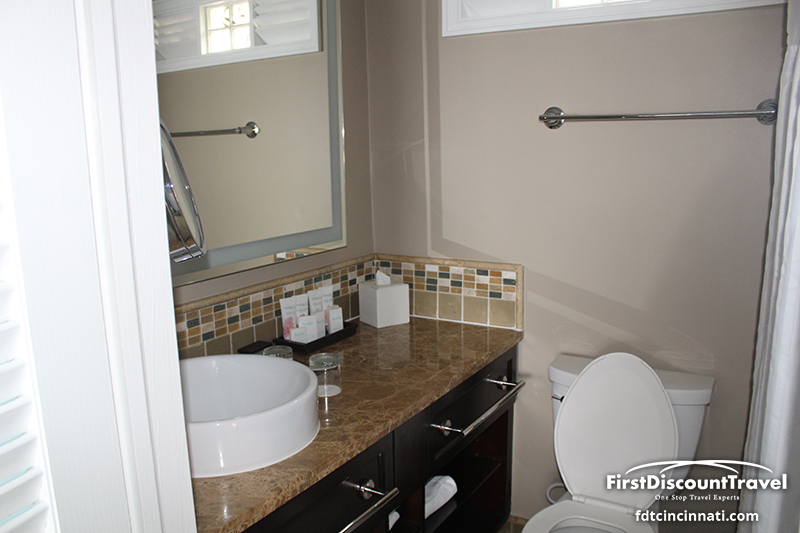 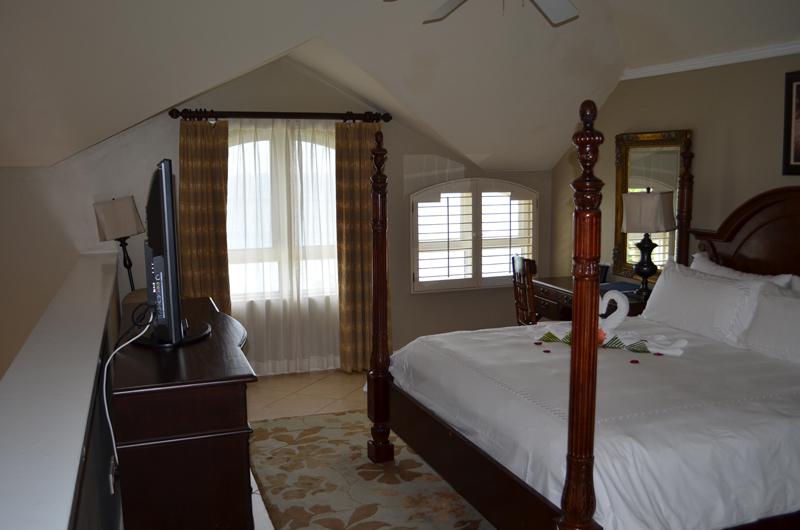 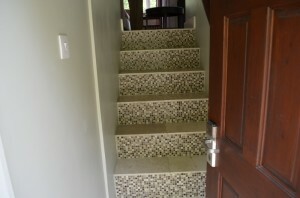 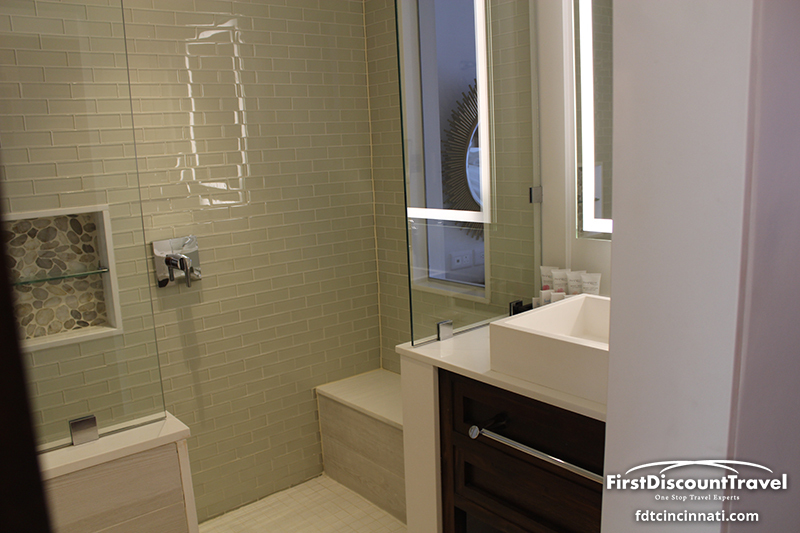 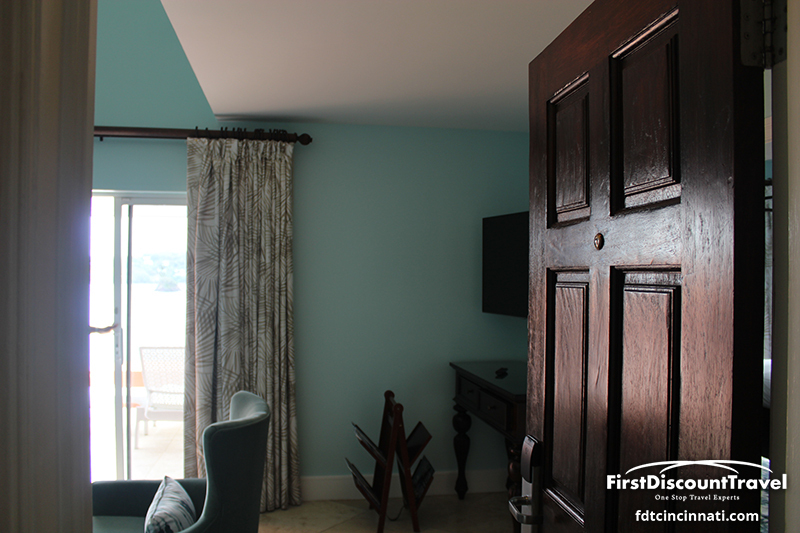 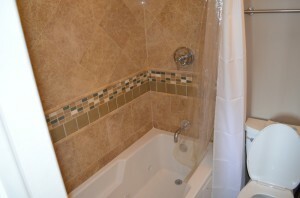 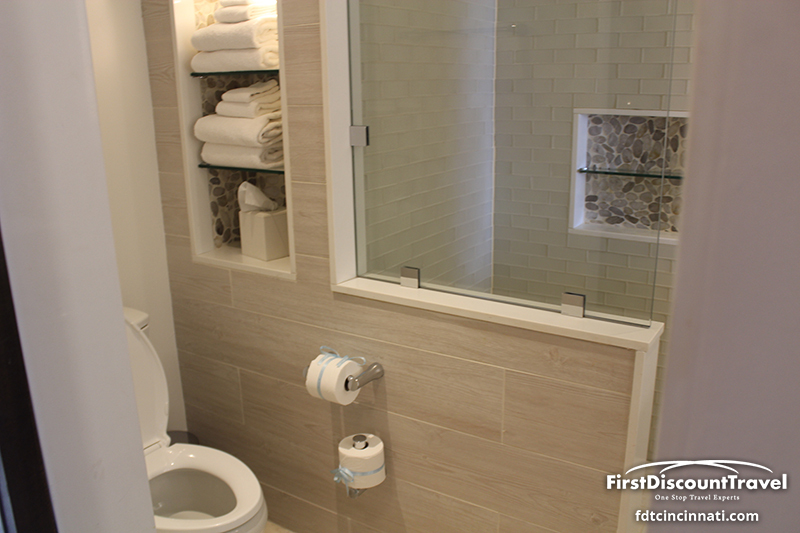 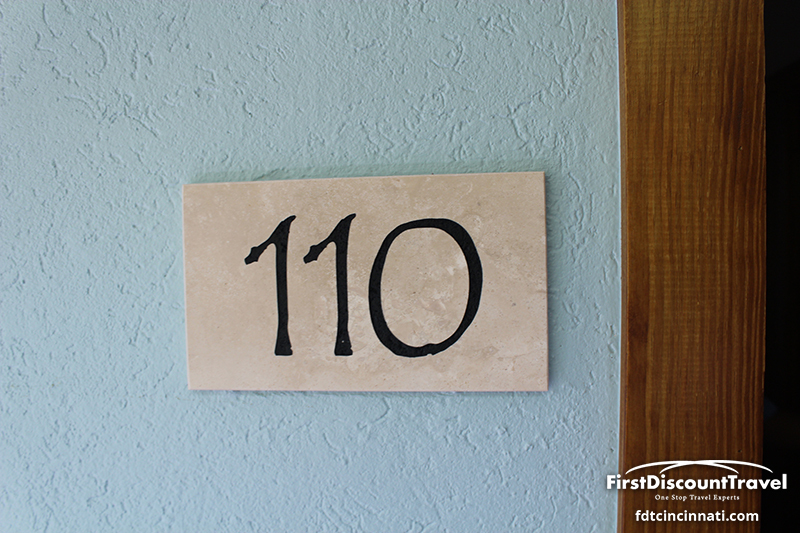 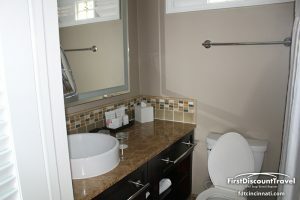 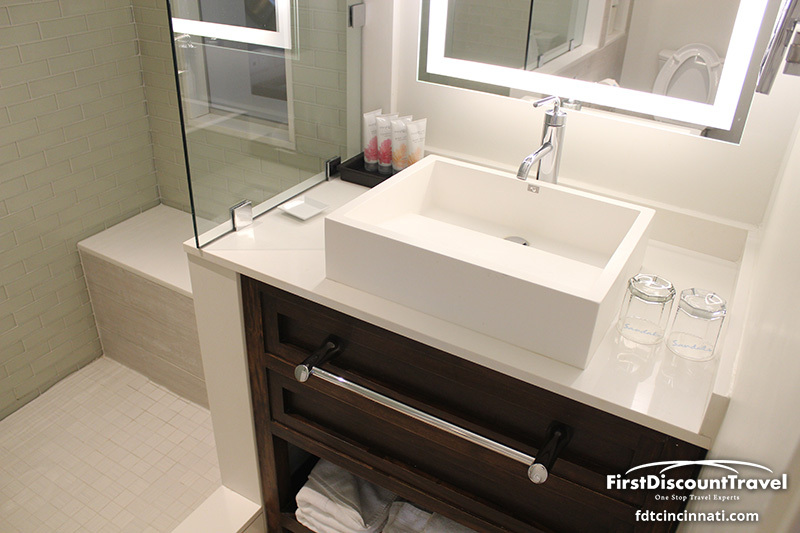 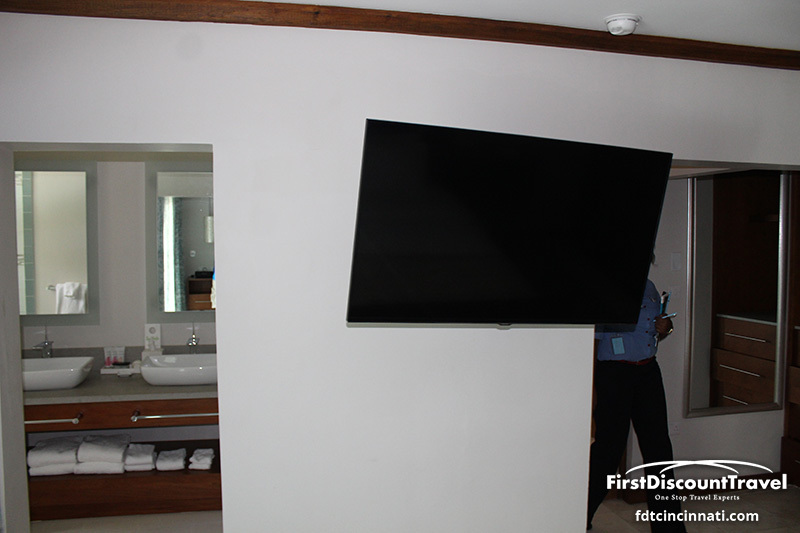 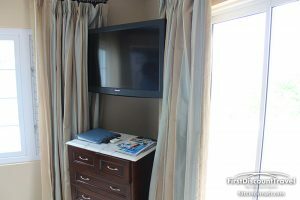 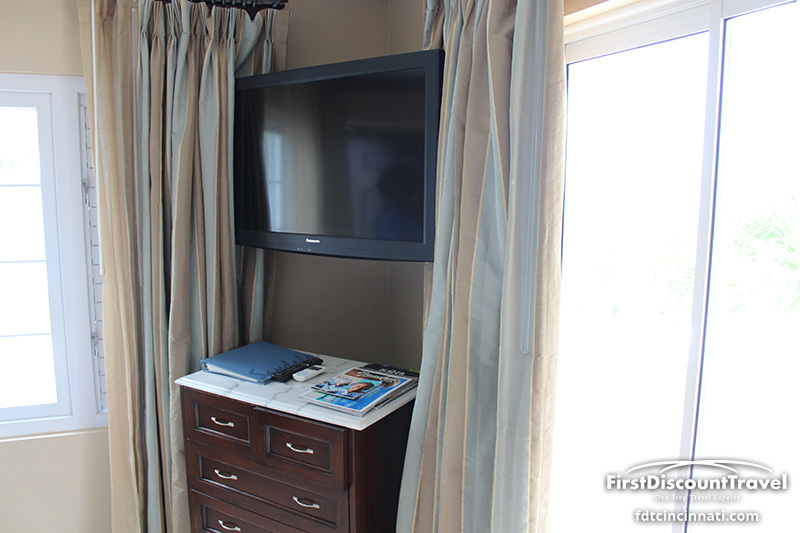 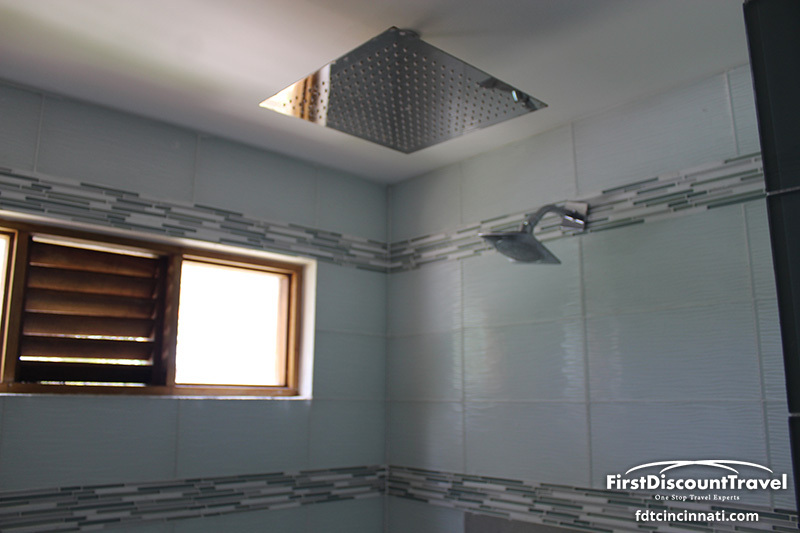 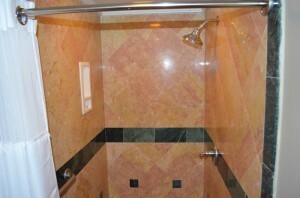 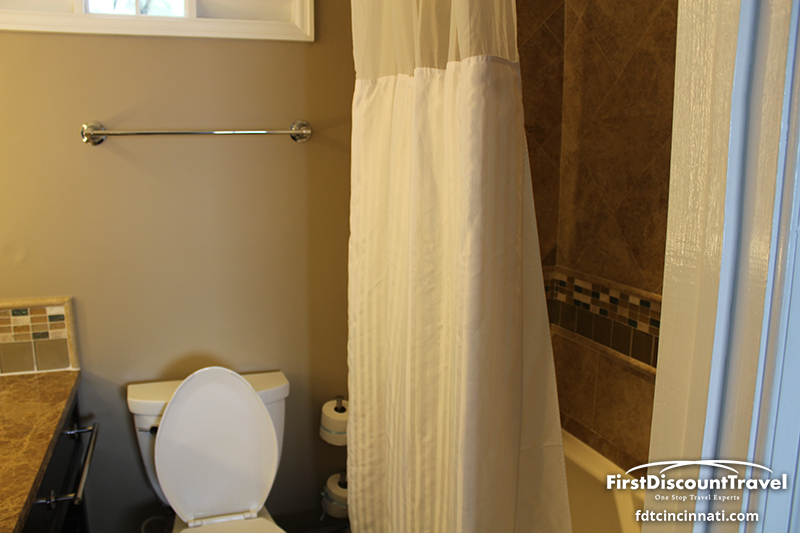 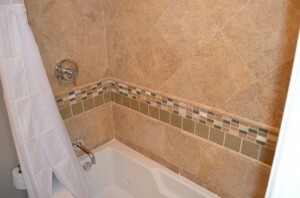 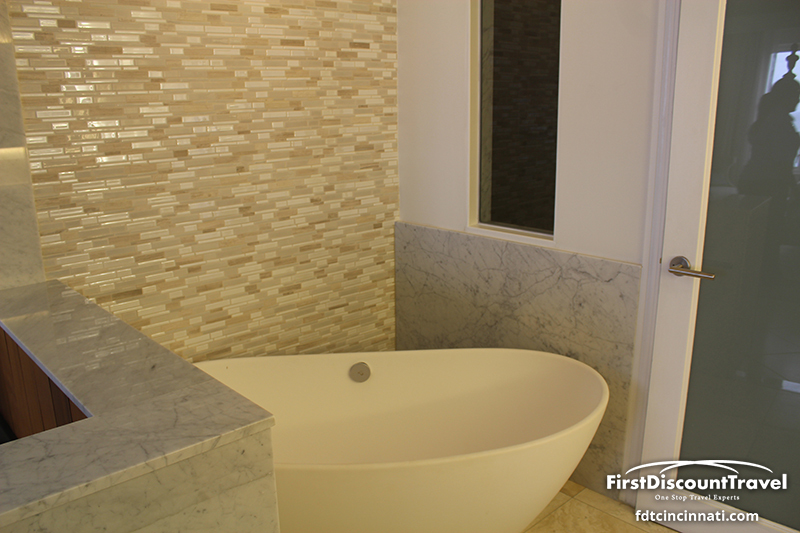 The rooms are constantly being refreshed and look great! 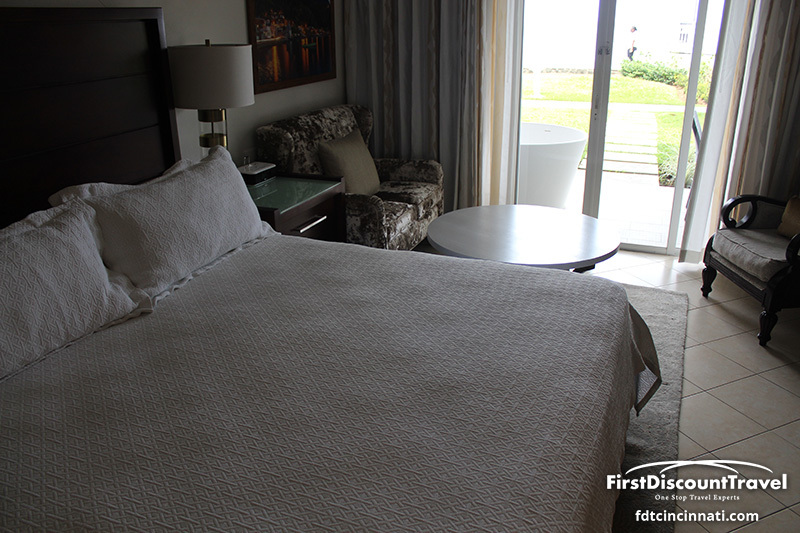 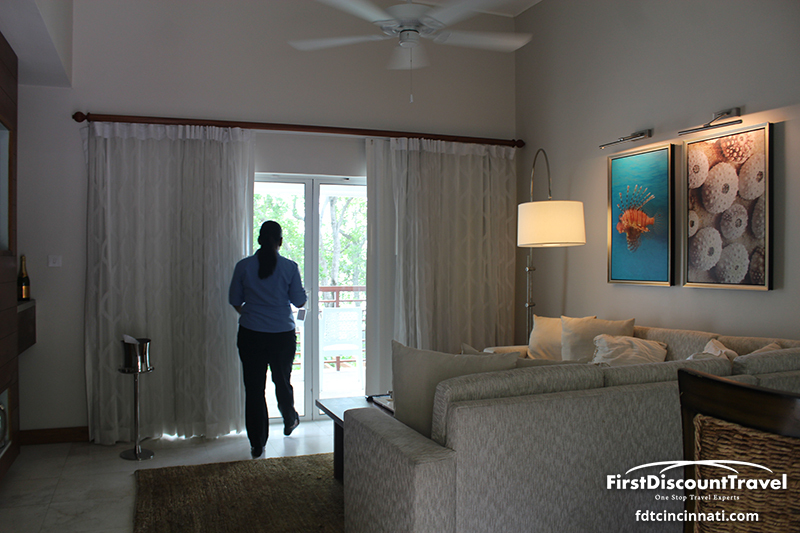 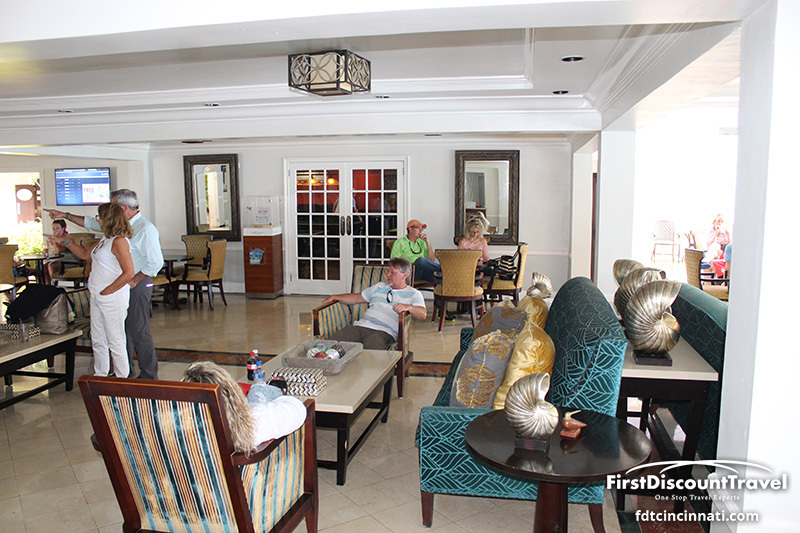 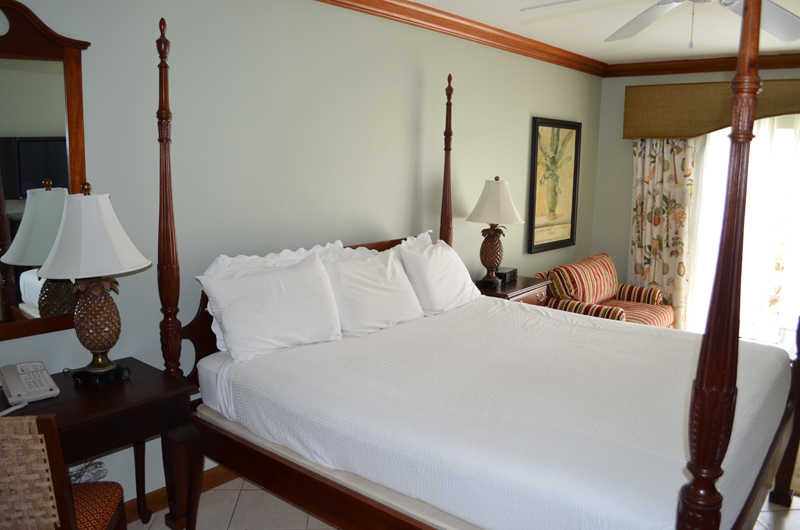 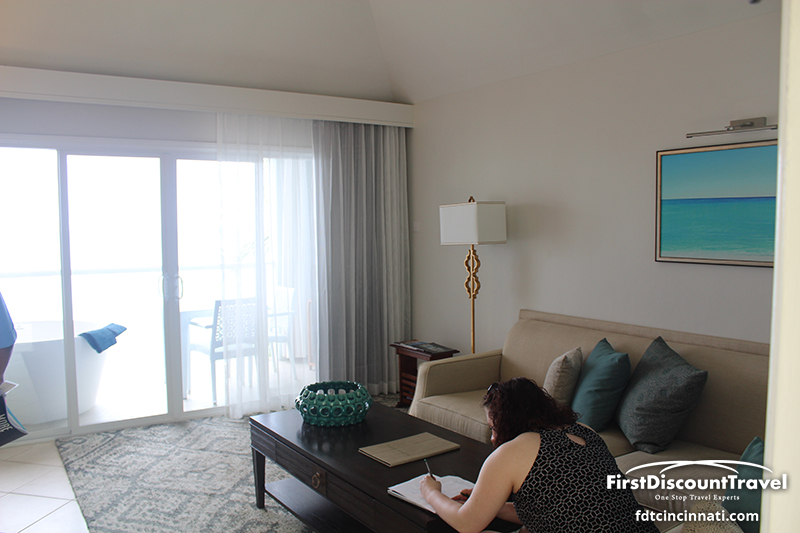 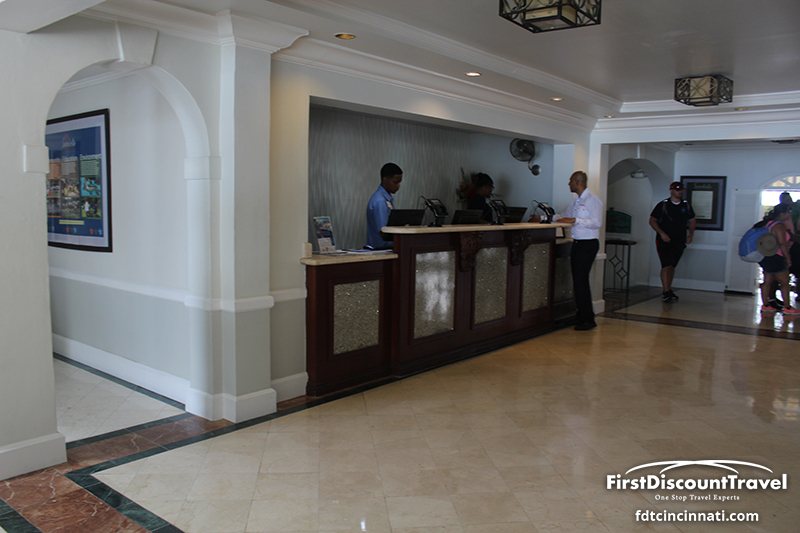 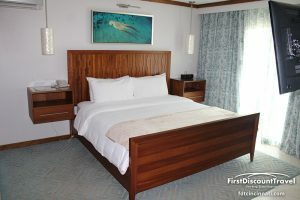 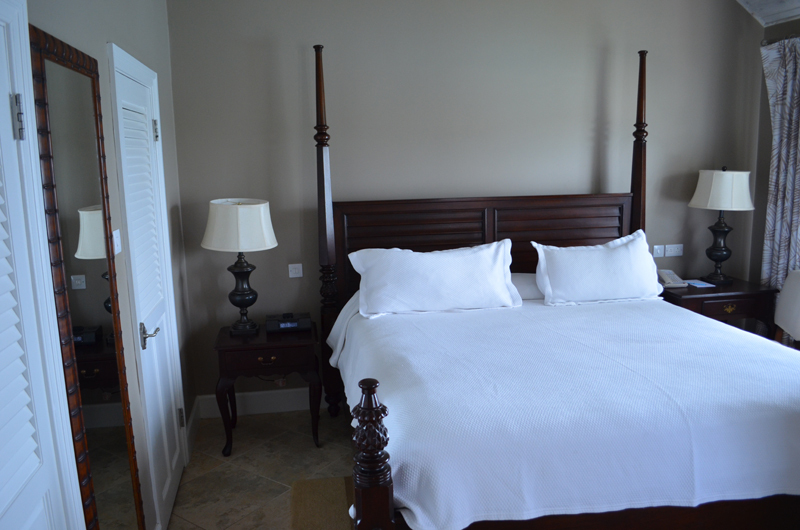 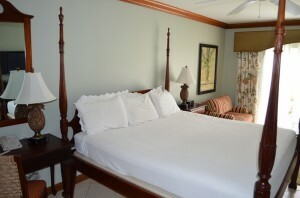 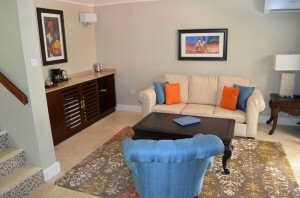 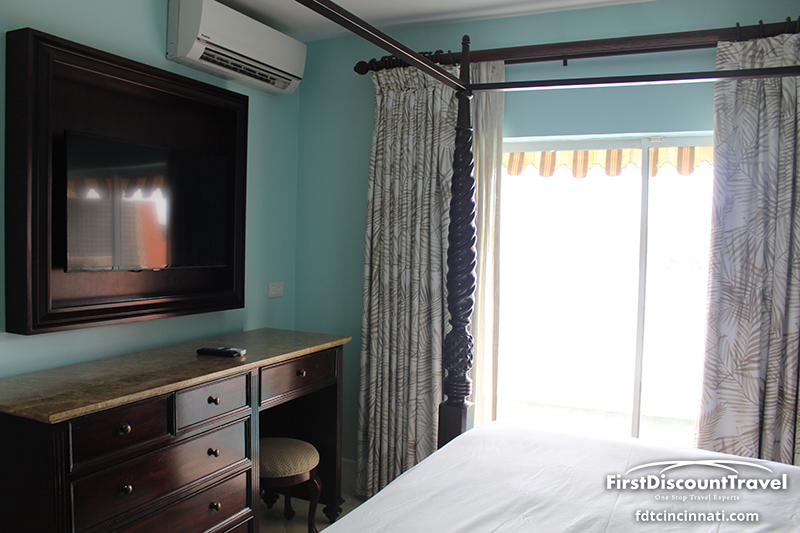 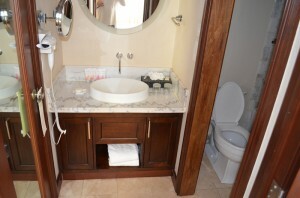 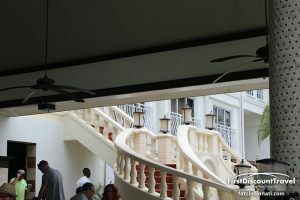 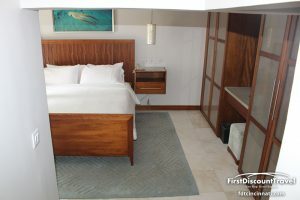 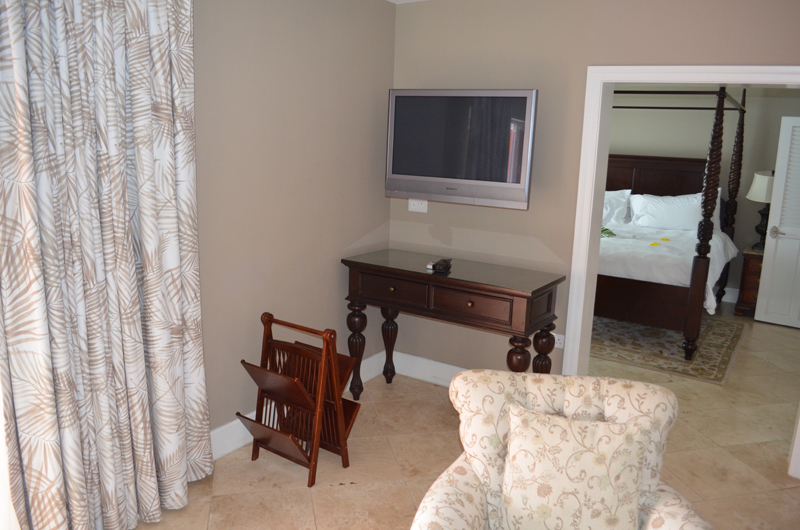 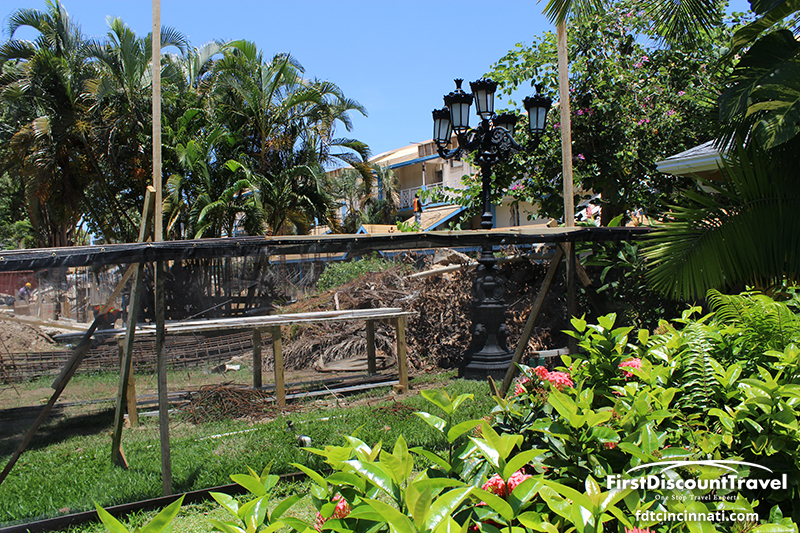 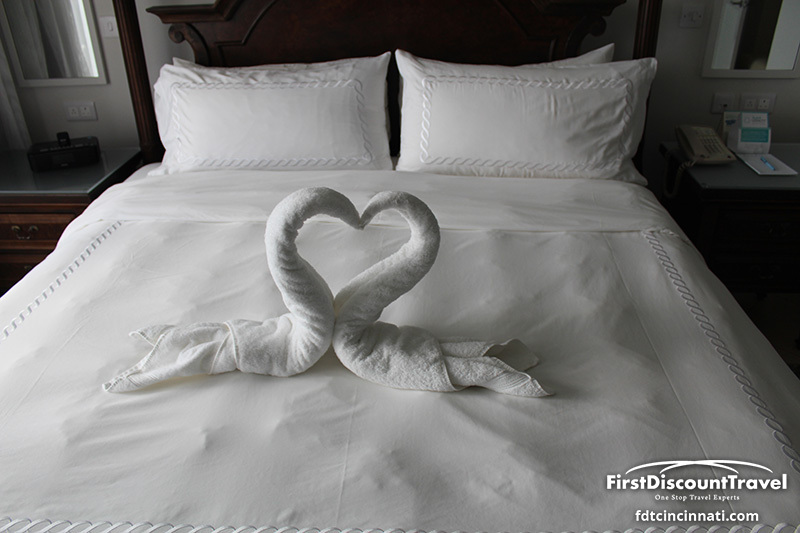 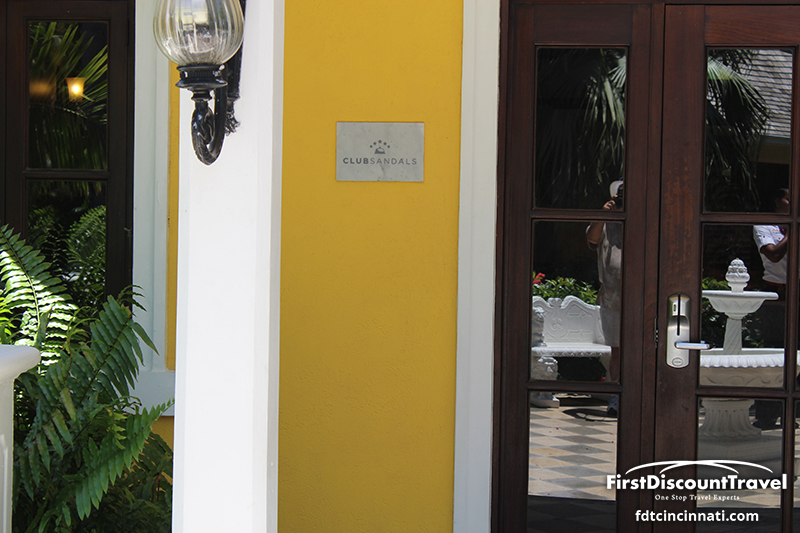 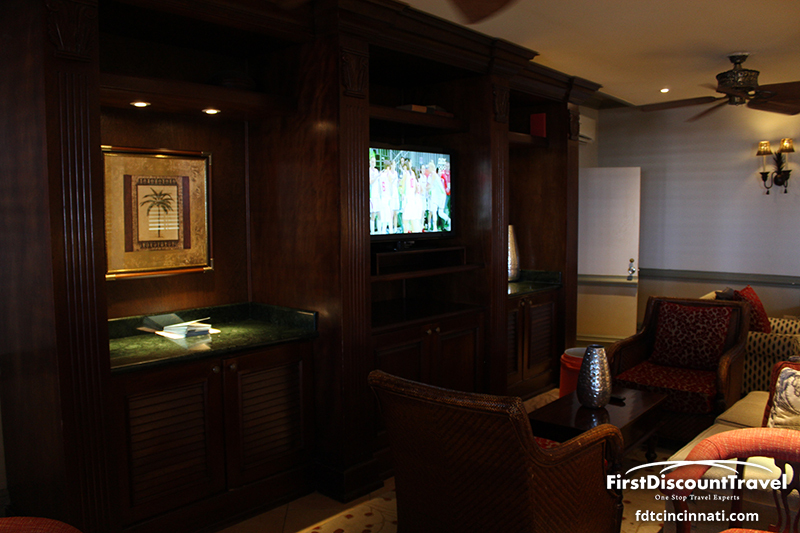 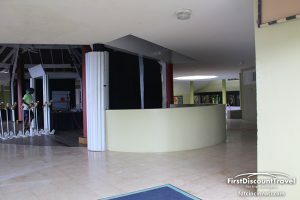 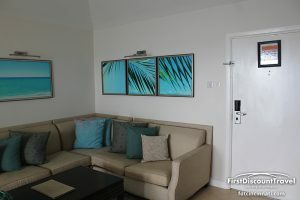 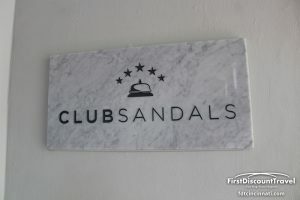 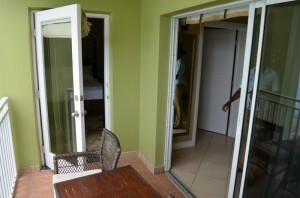 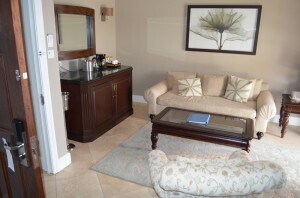 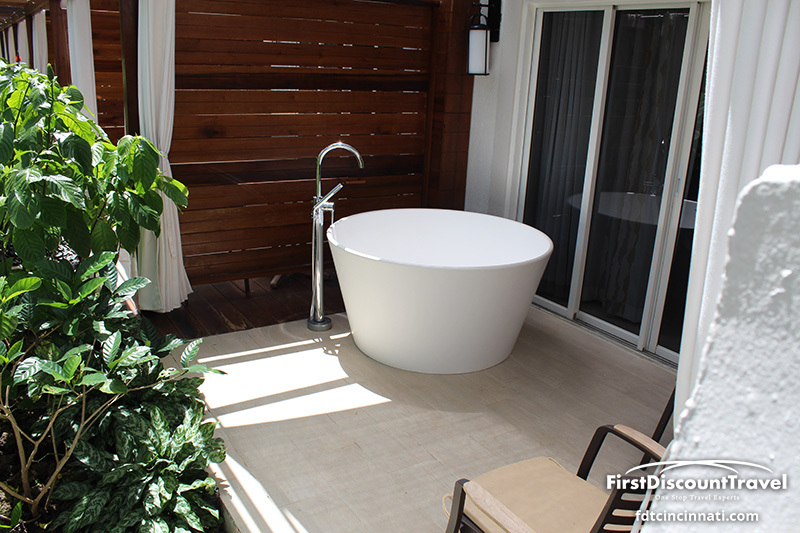 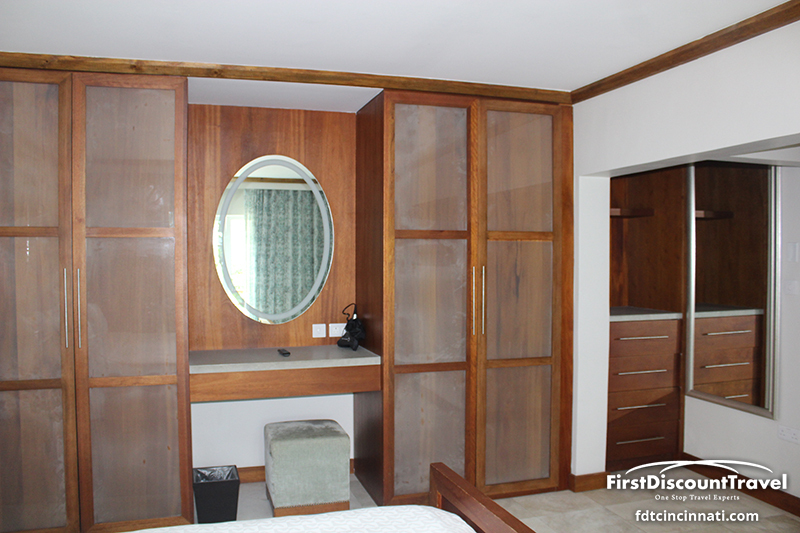 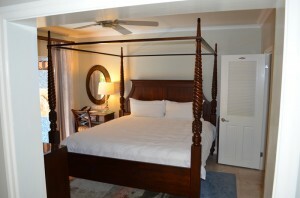 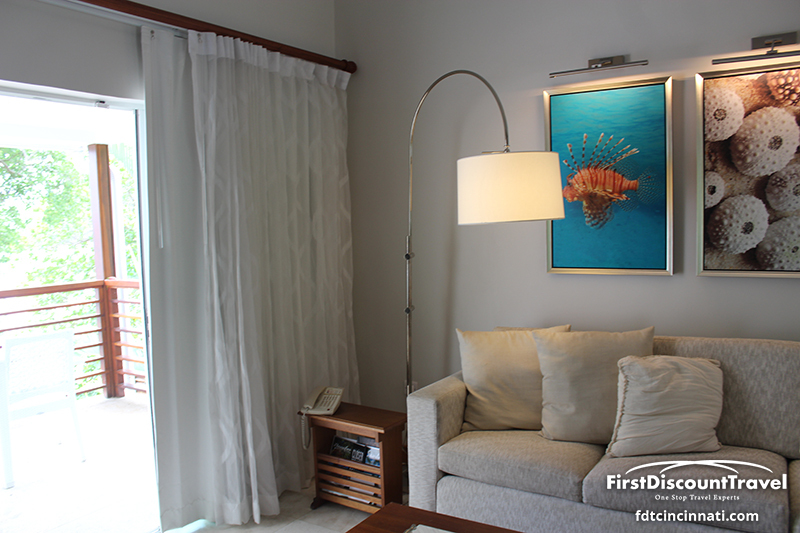 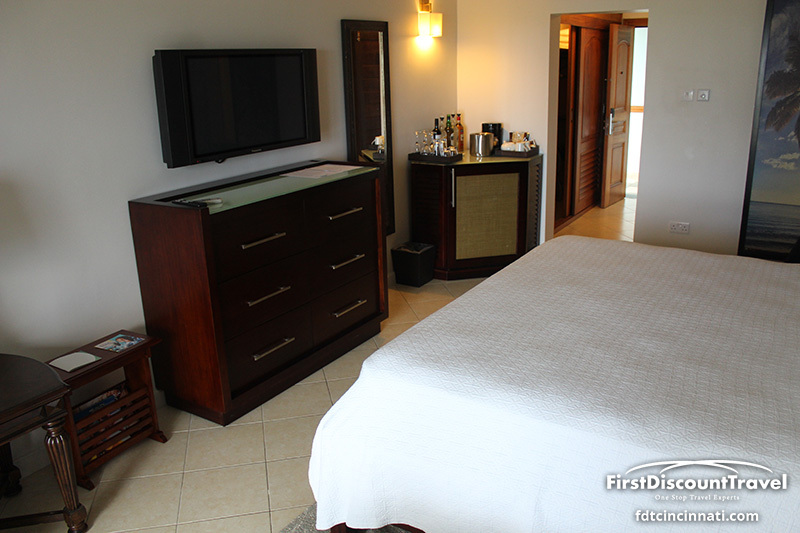 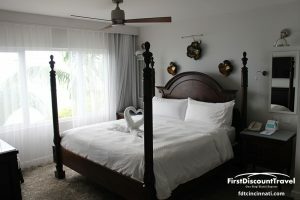 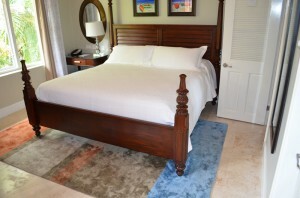 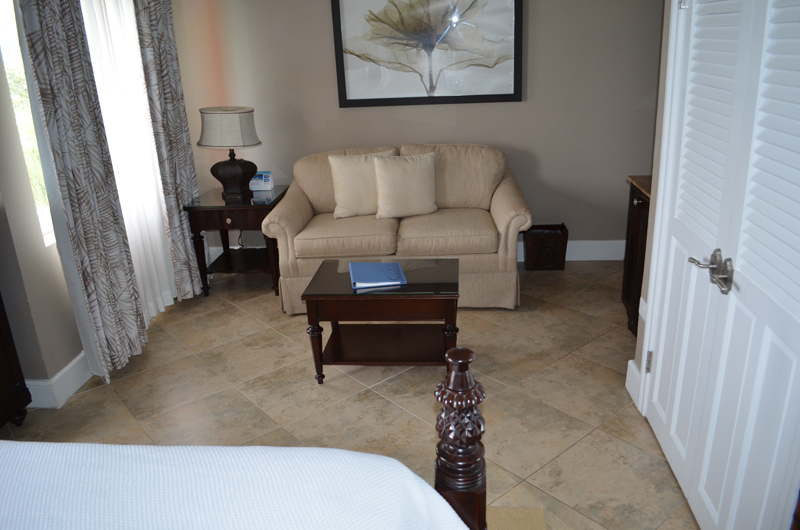 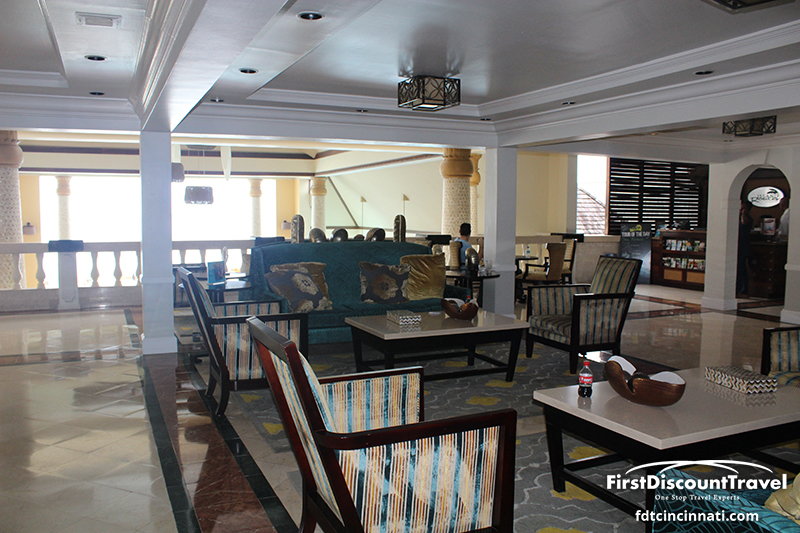 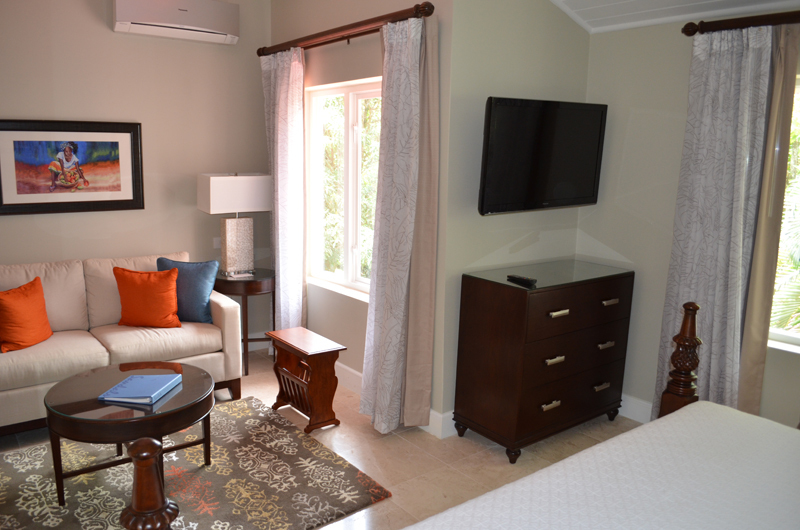 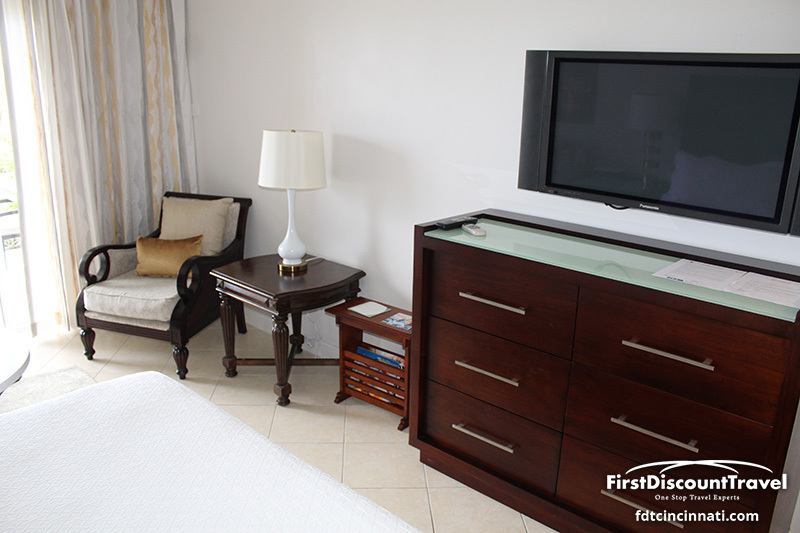 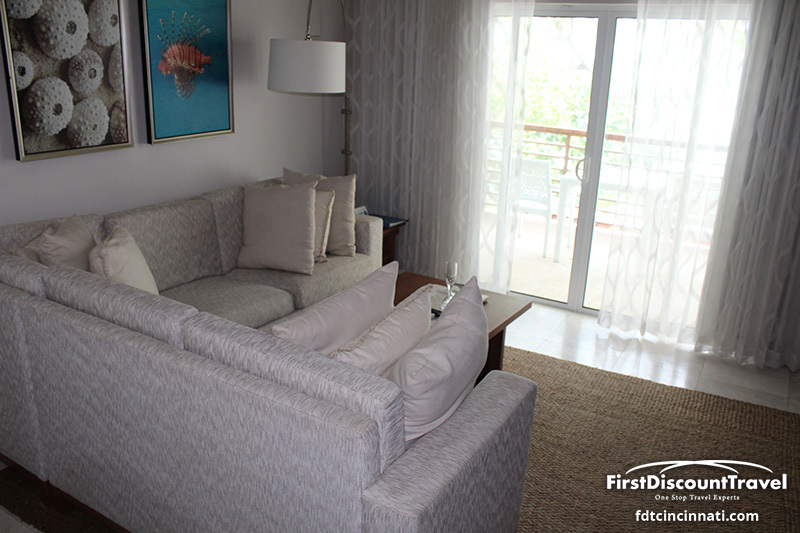 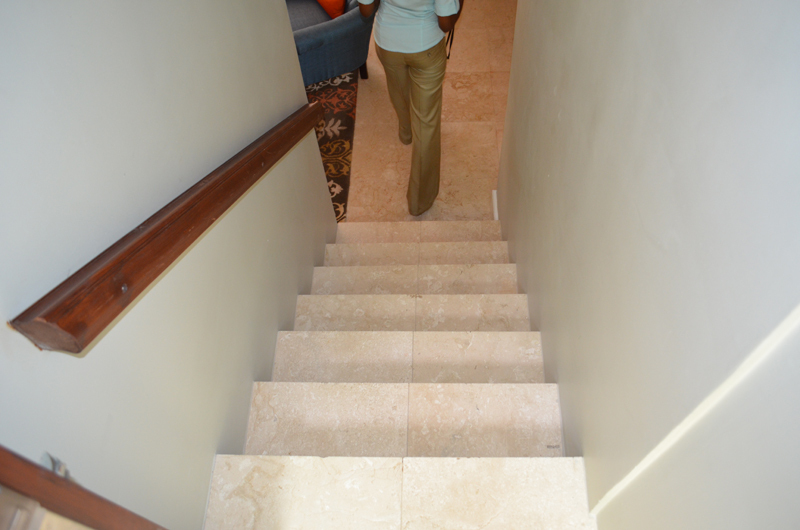 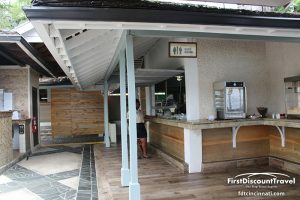 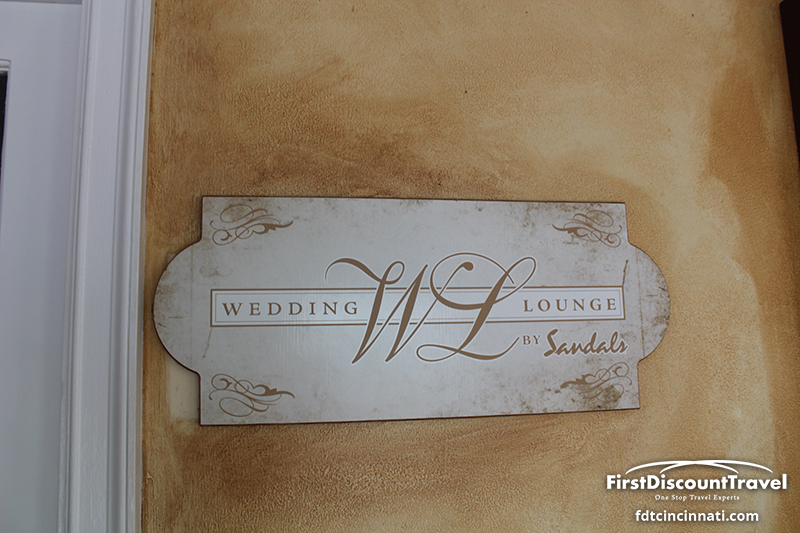 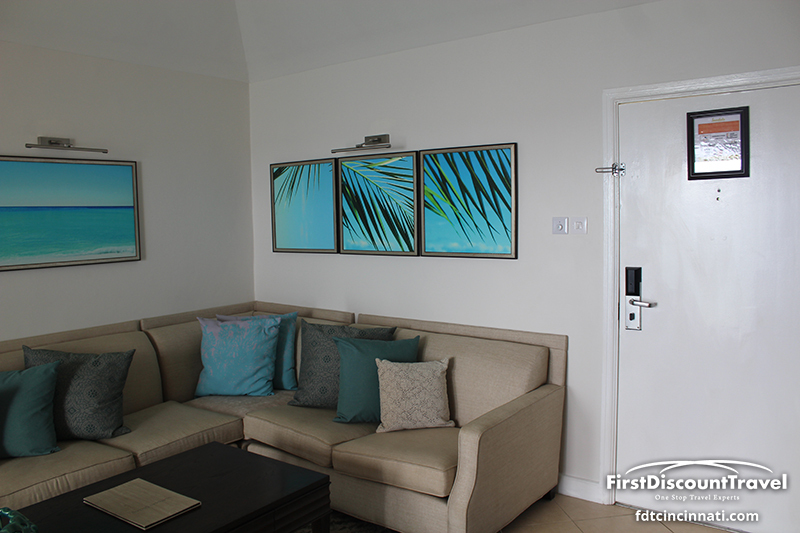 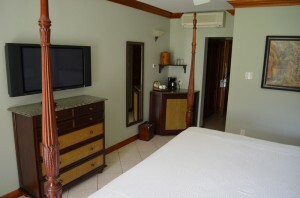 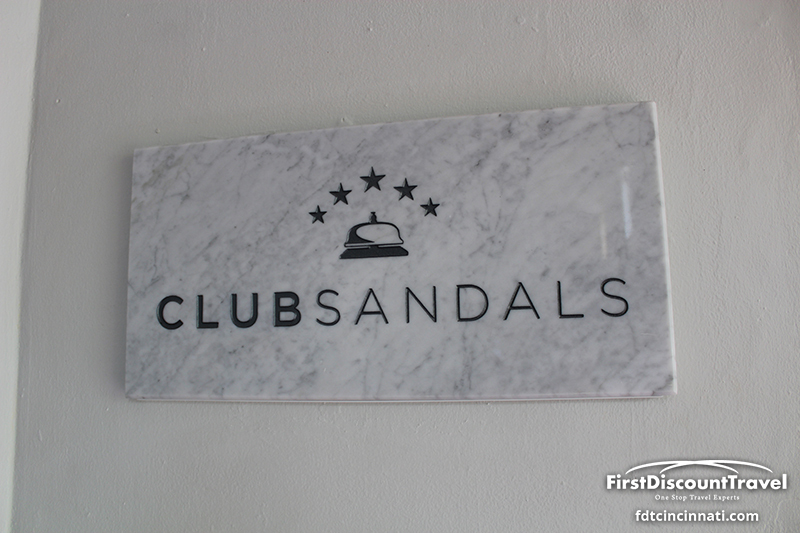 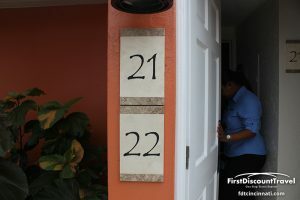 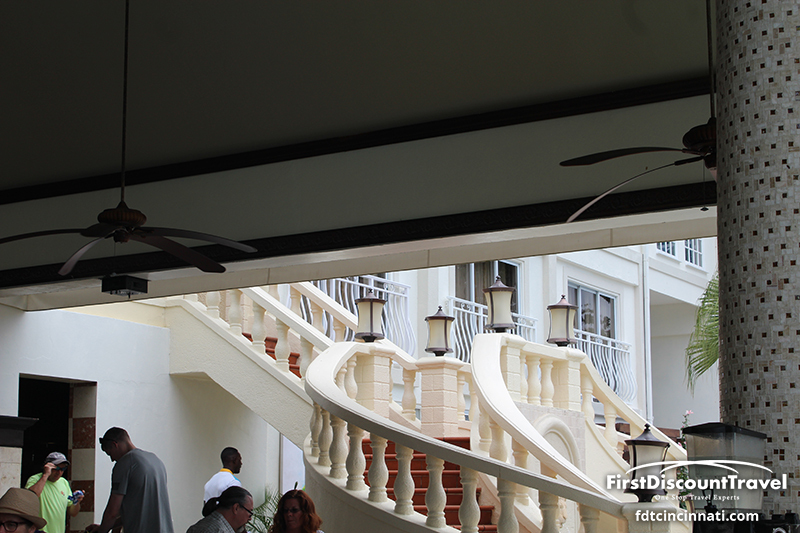 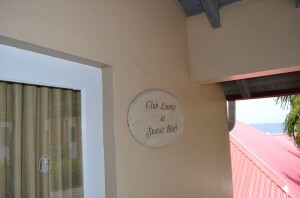 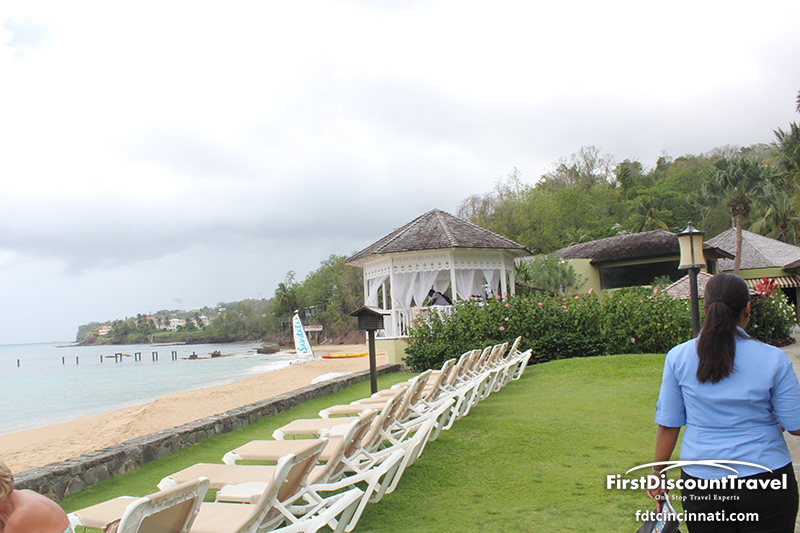 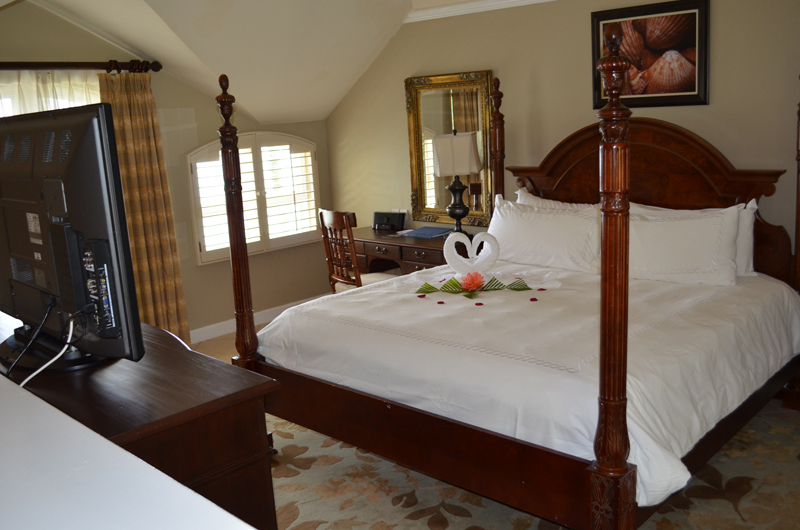 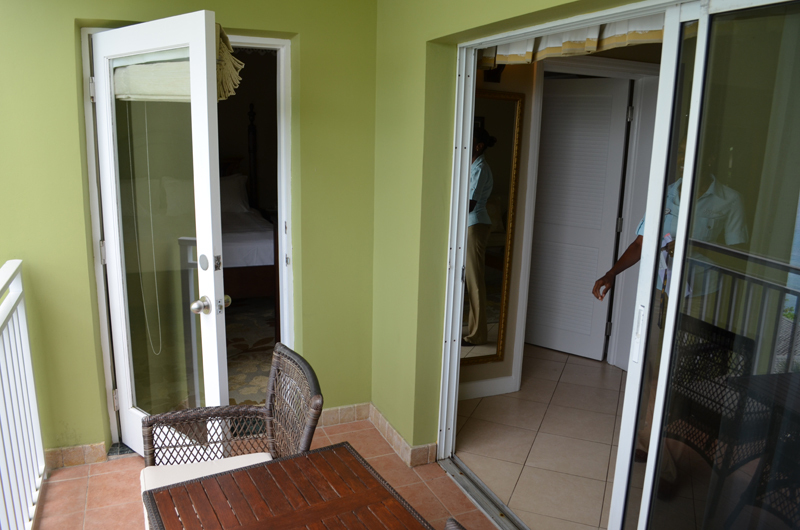 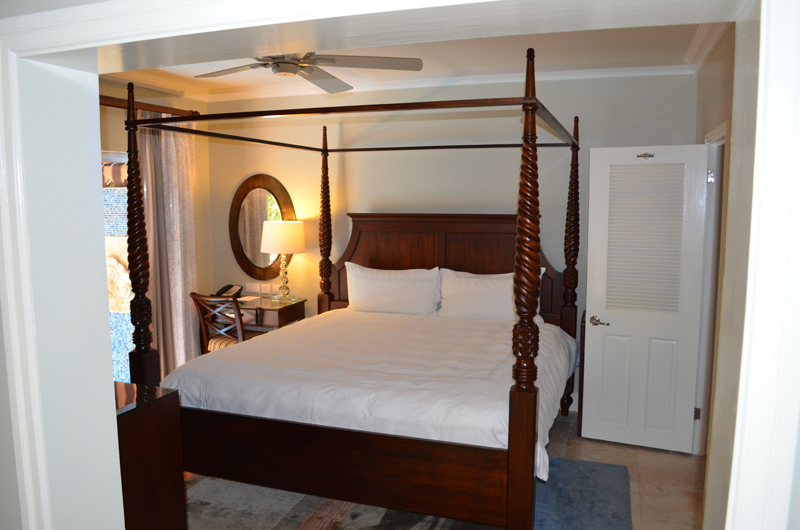 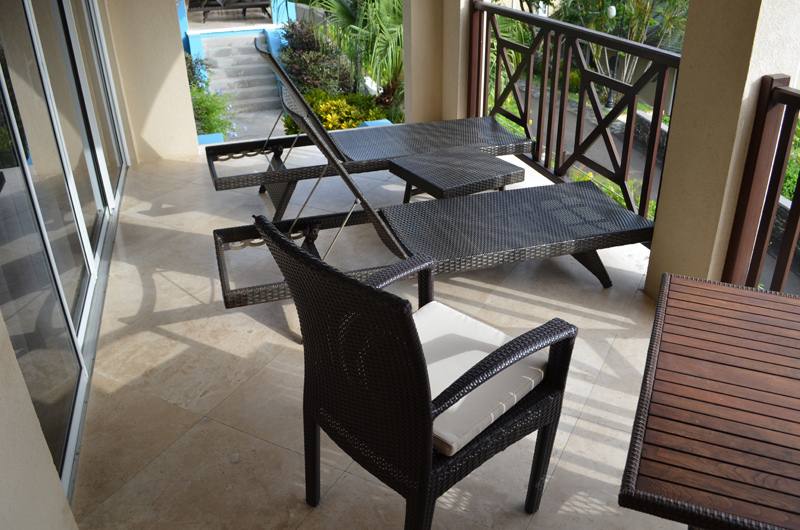 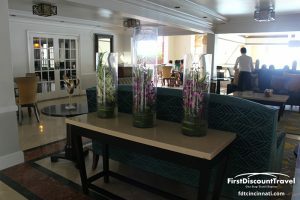 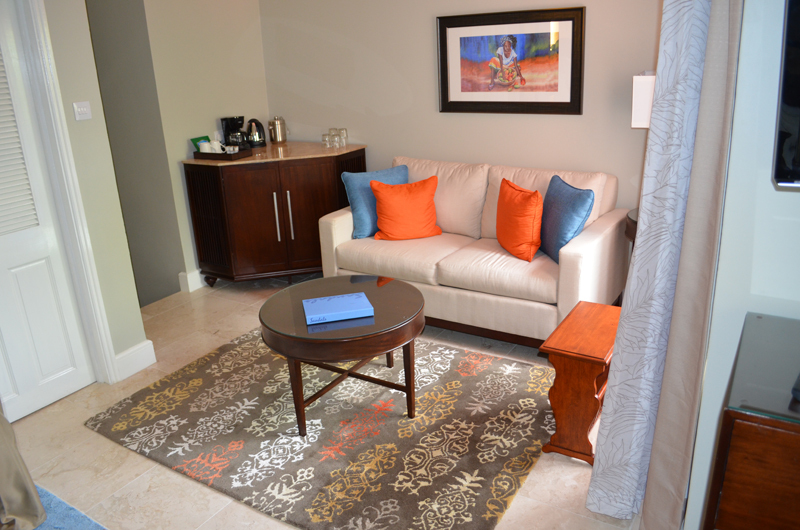 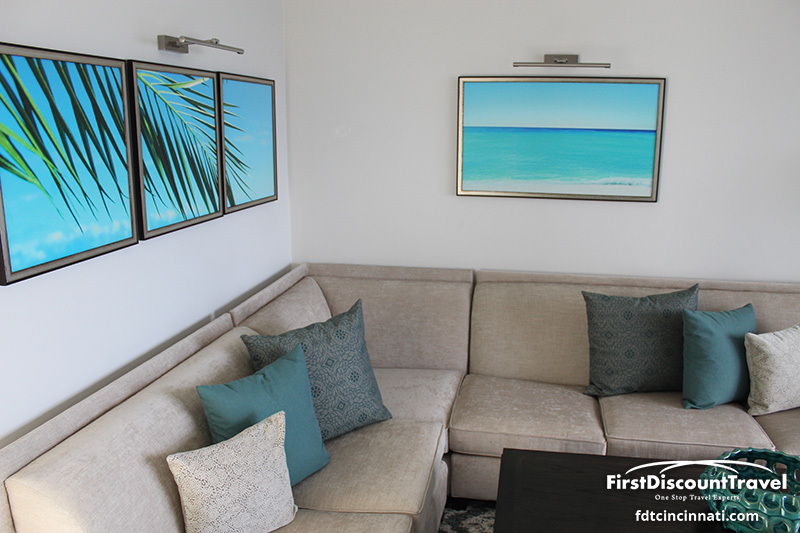 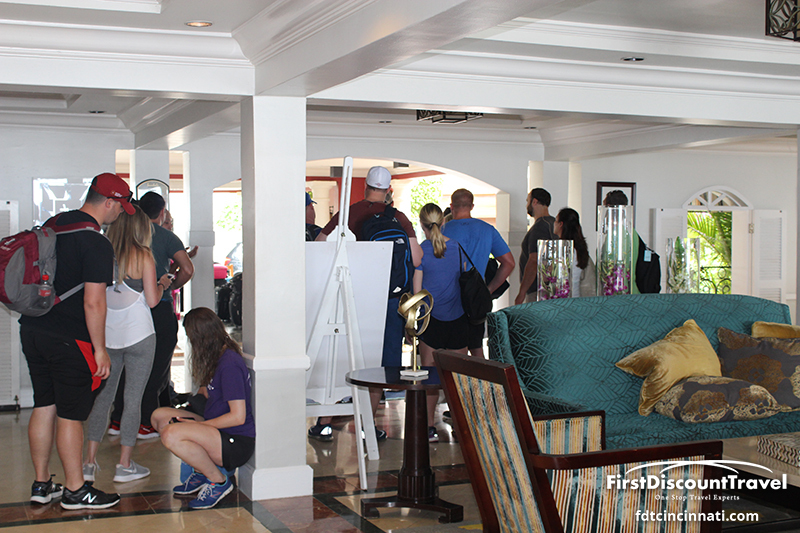 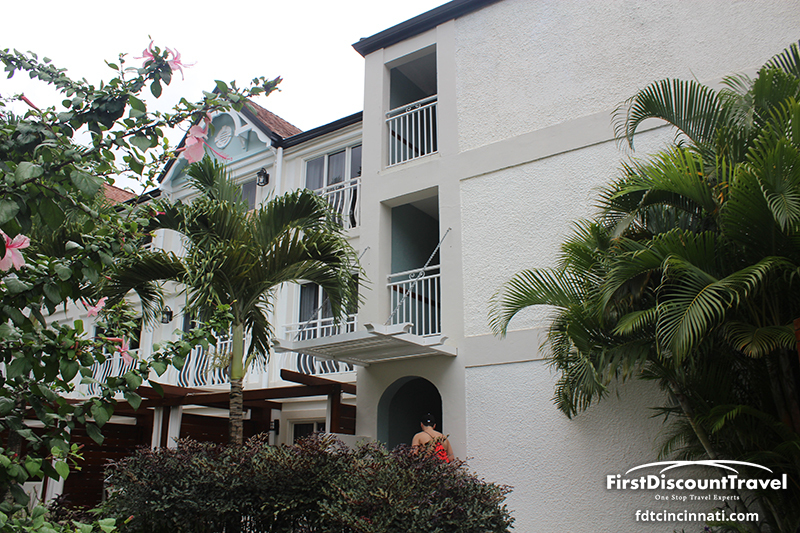 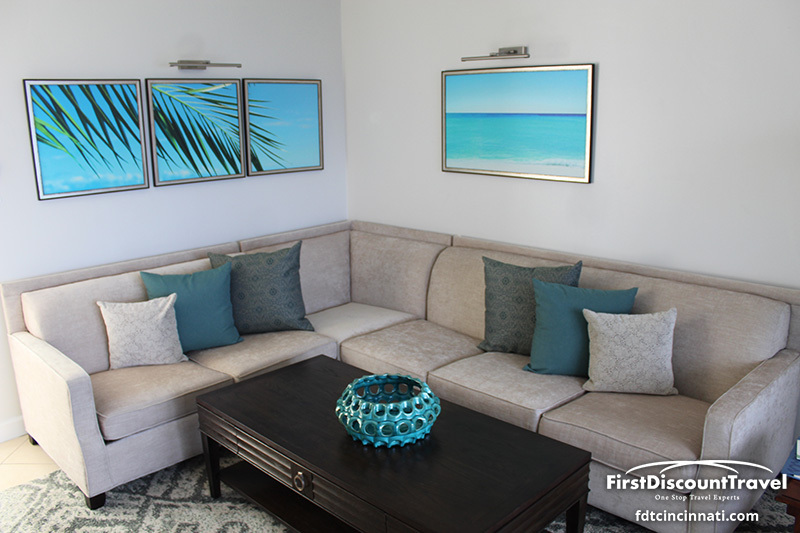 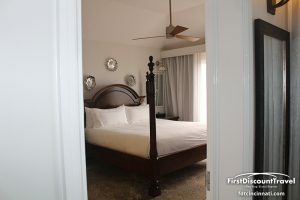 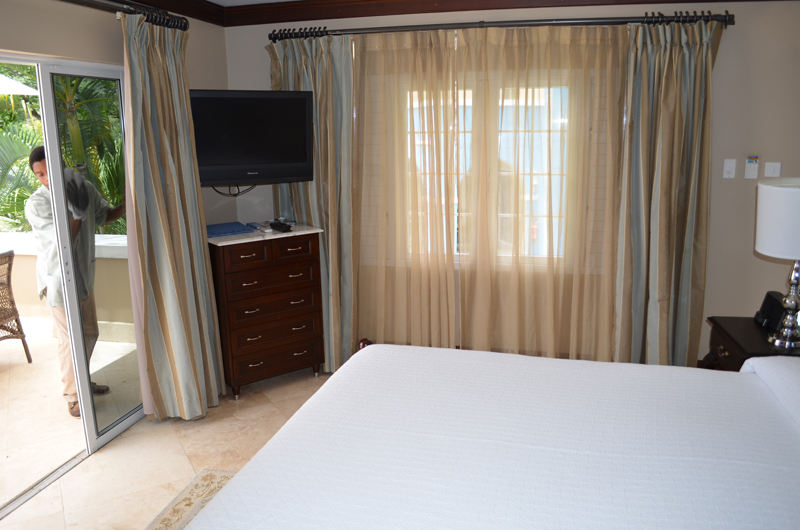 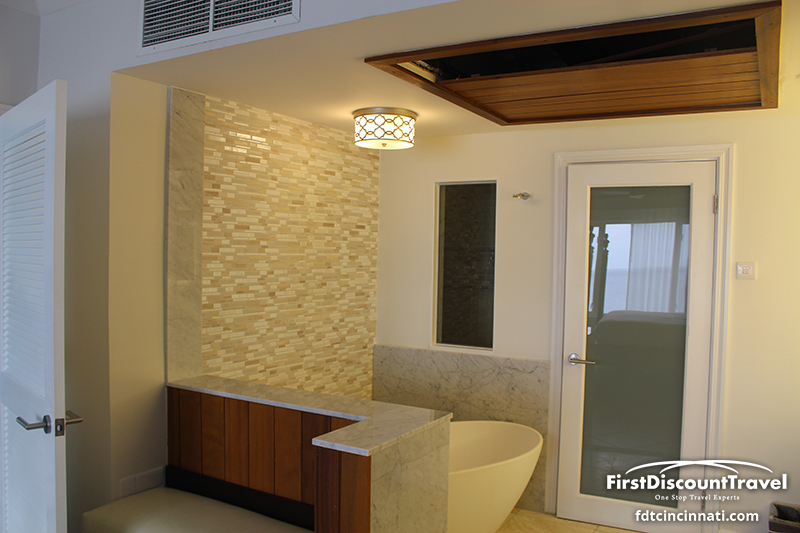 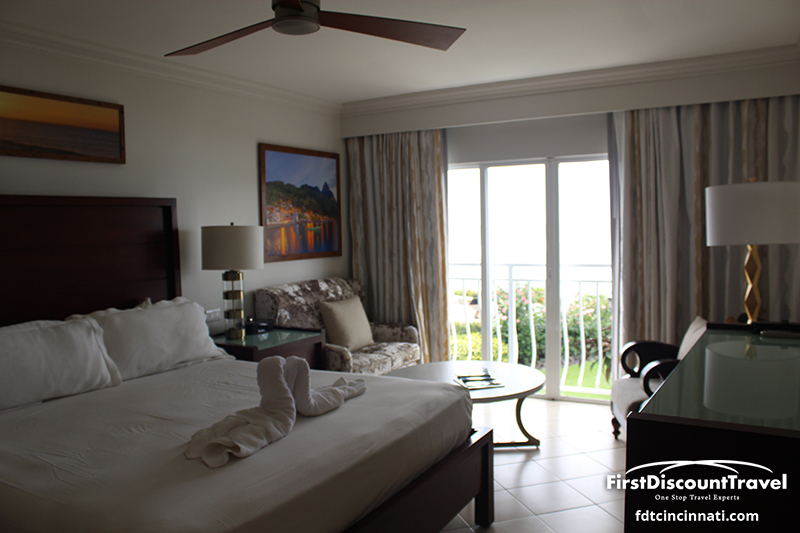 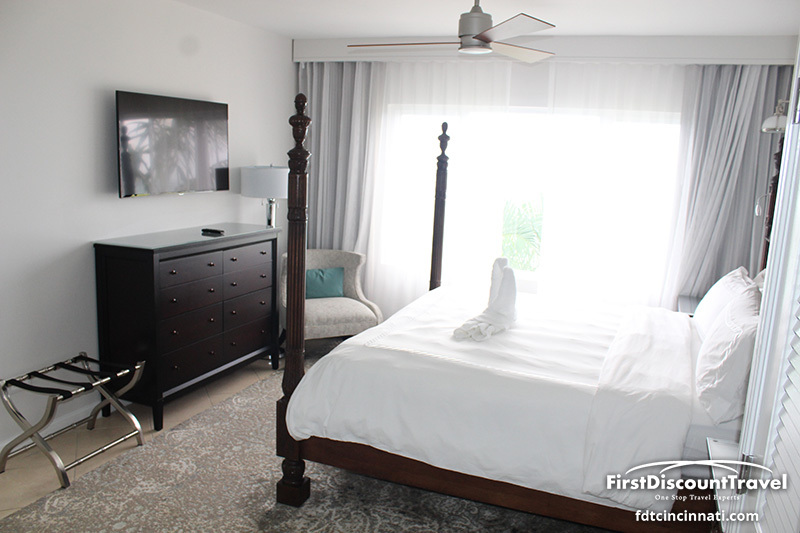 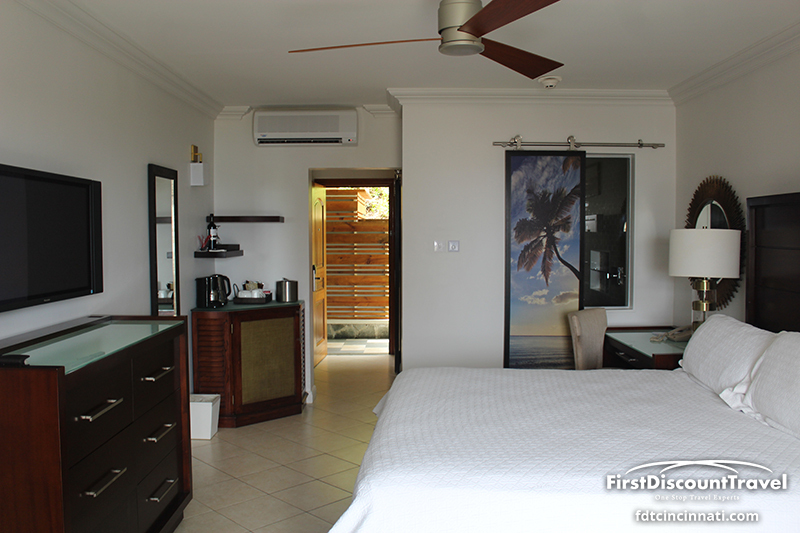 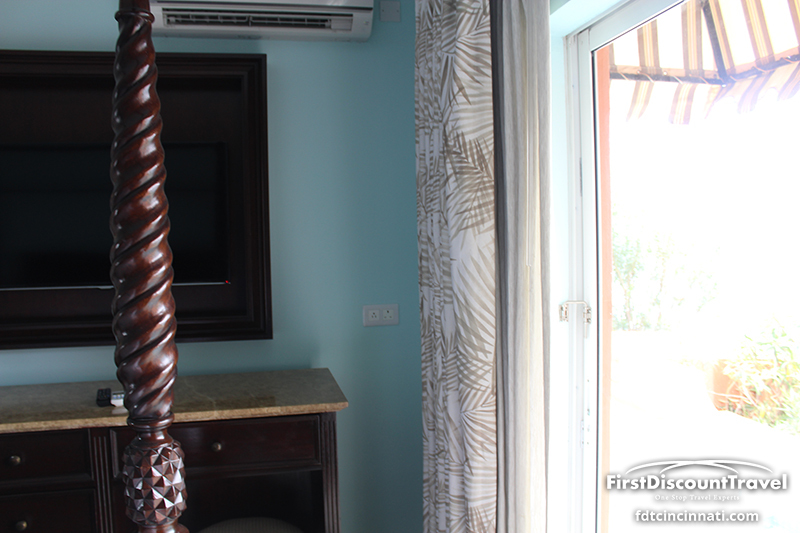 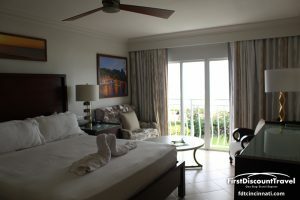 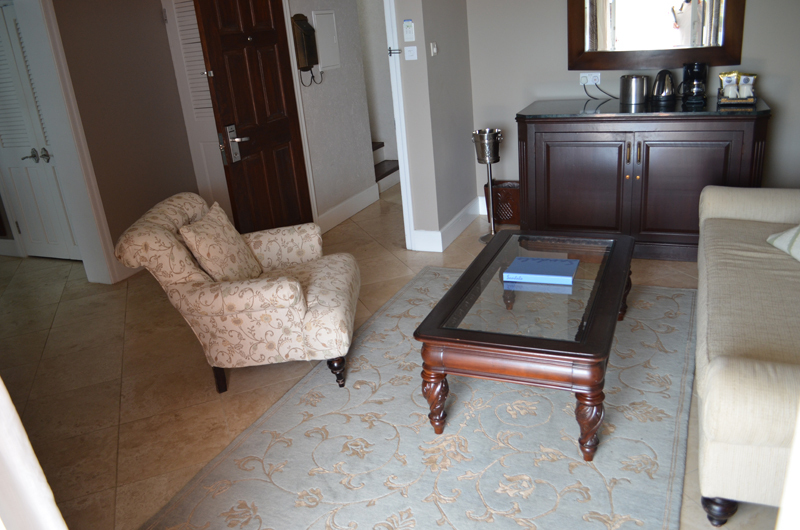 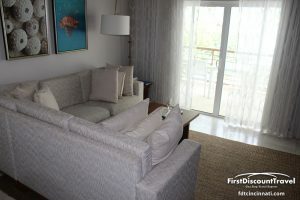 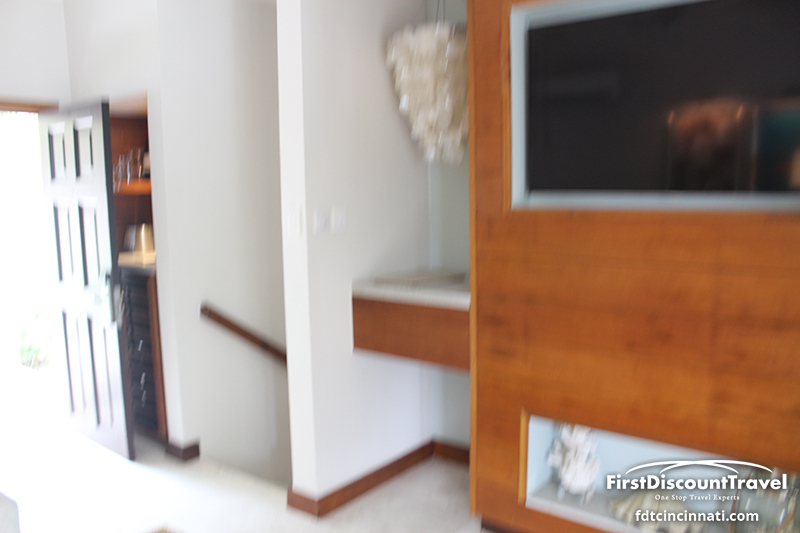 New butler suites will be added in October of 2013 when the resort converts to the new Club Sandals concept. 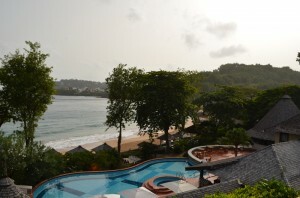 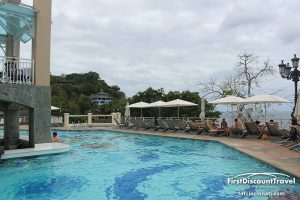 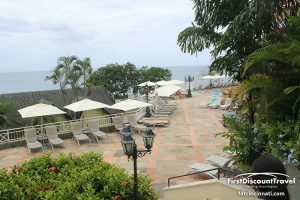 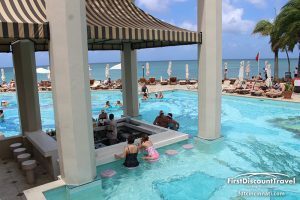 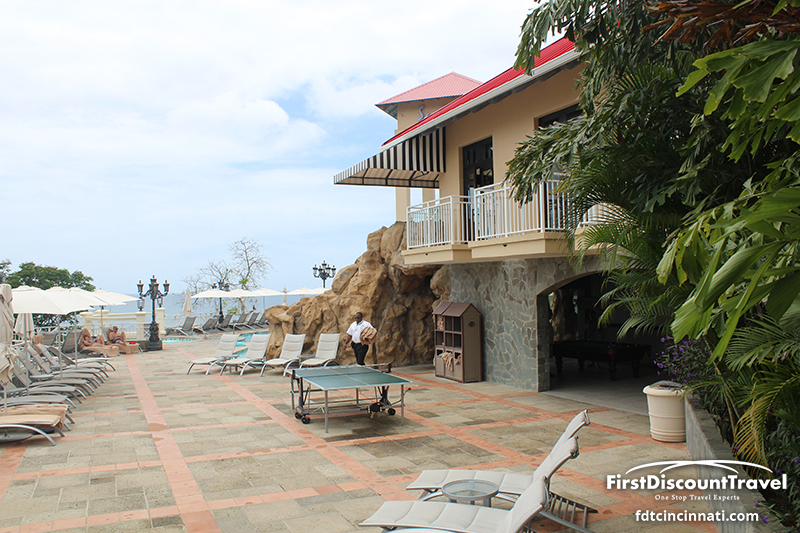 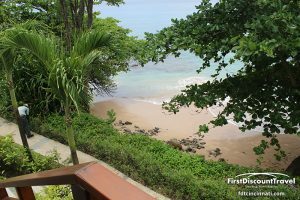 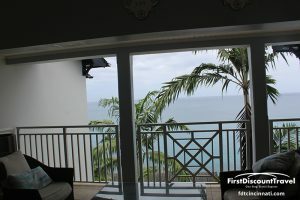 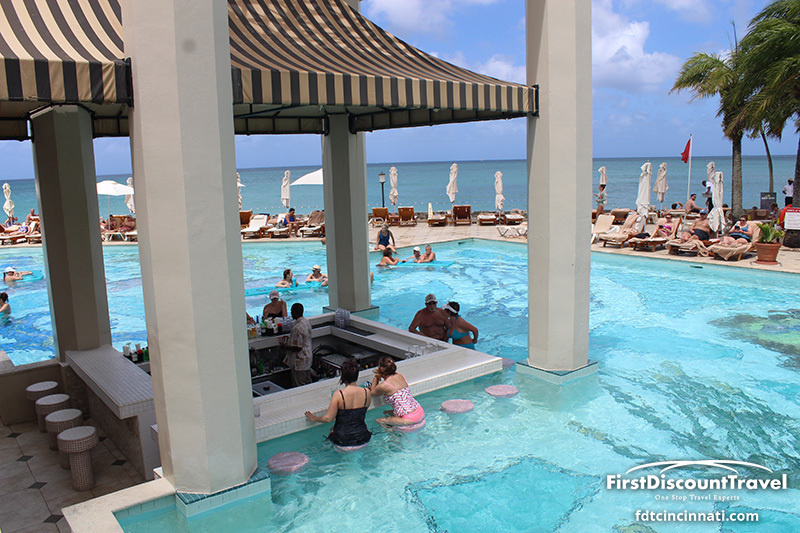 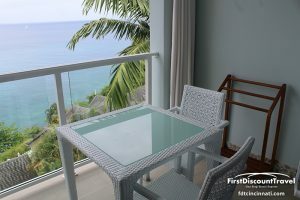 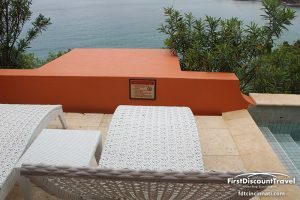 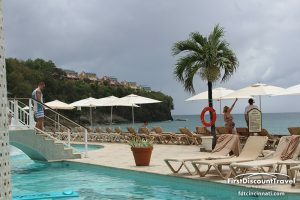 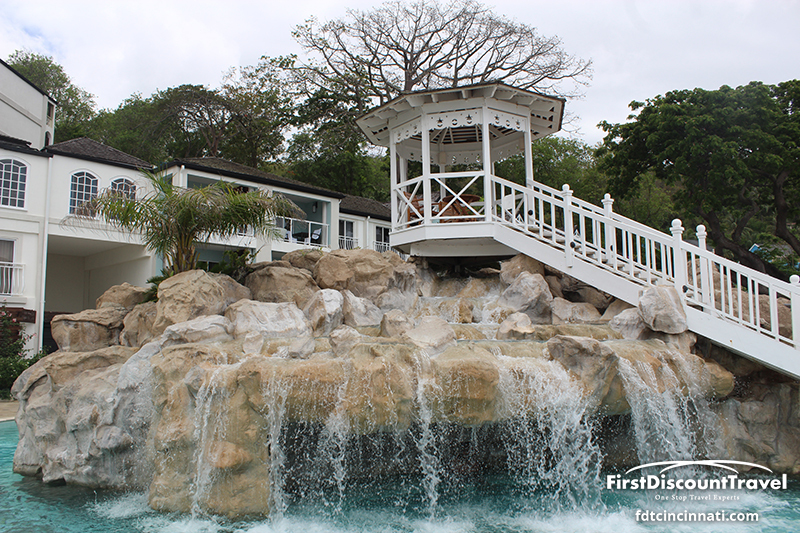 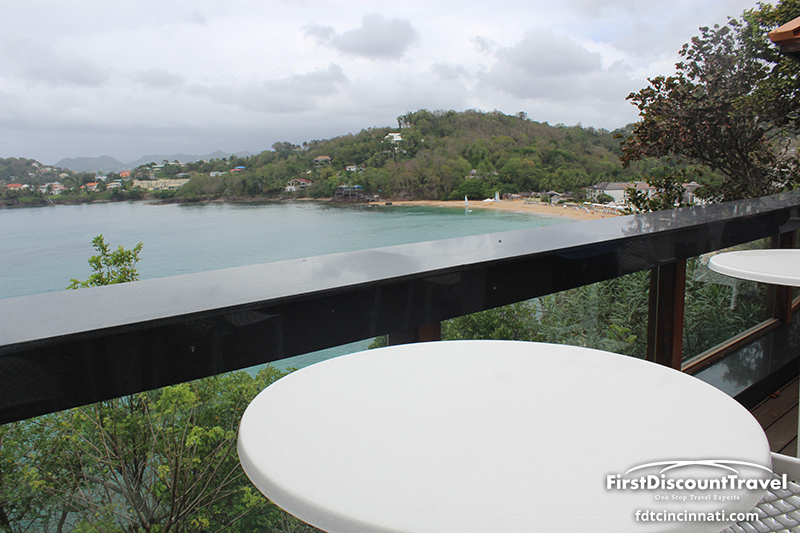 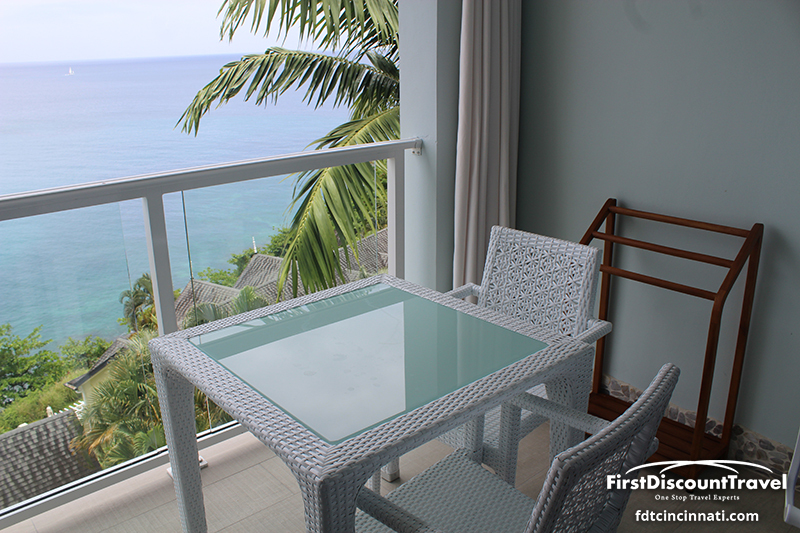 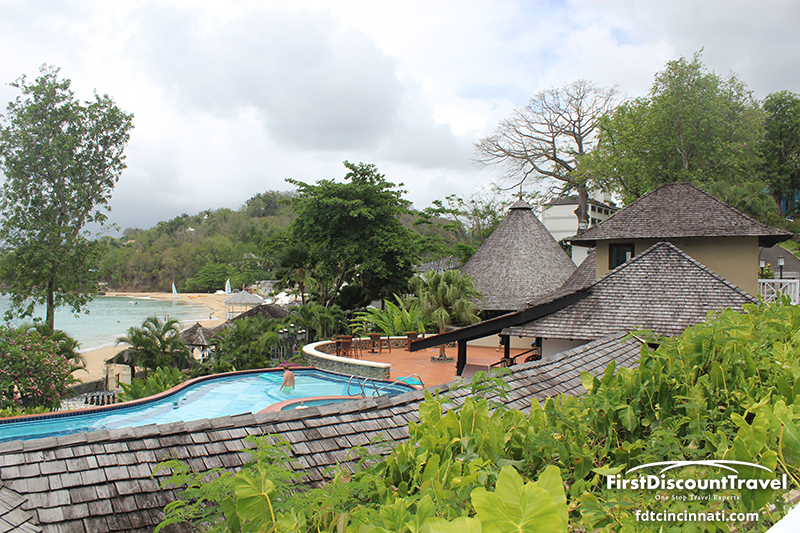 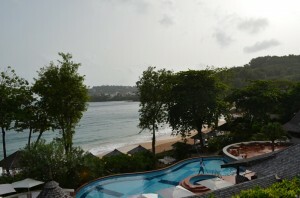 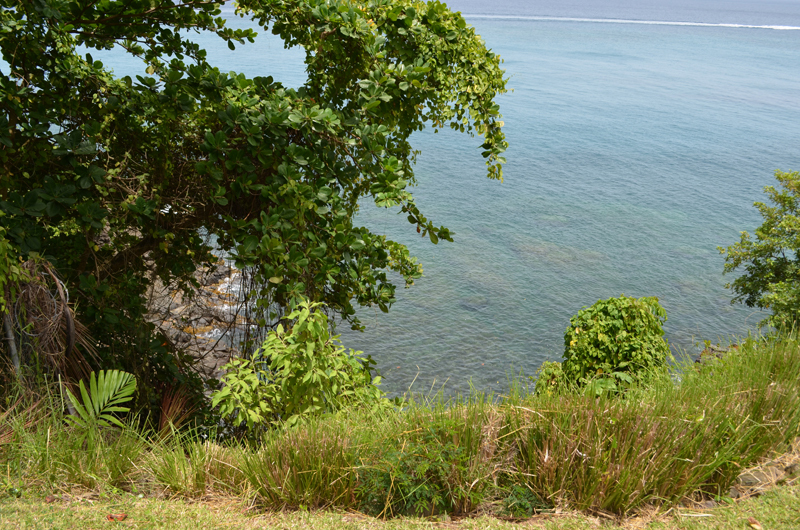 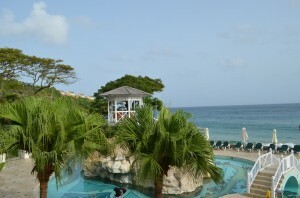 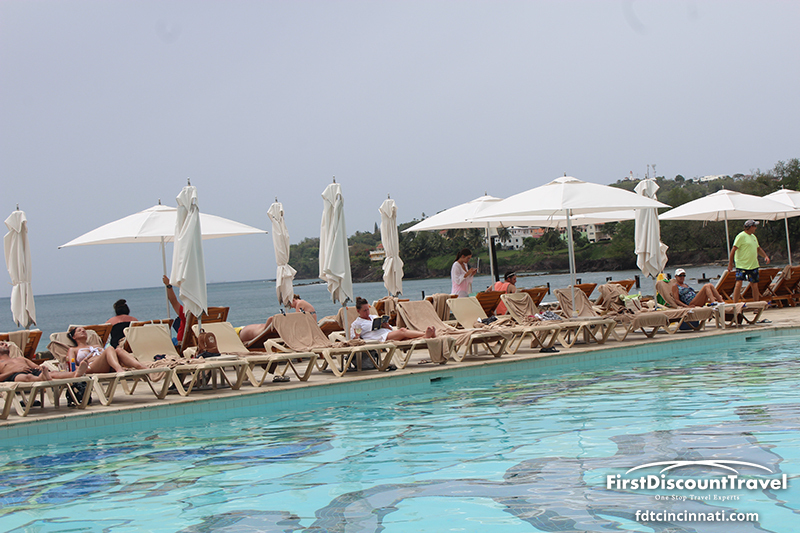 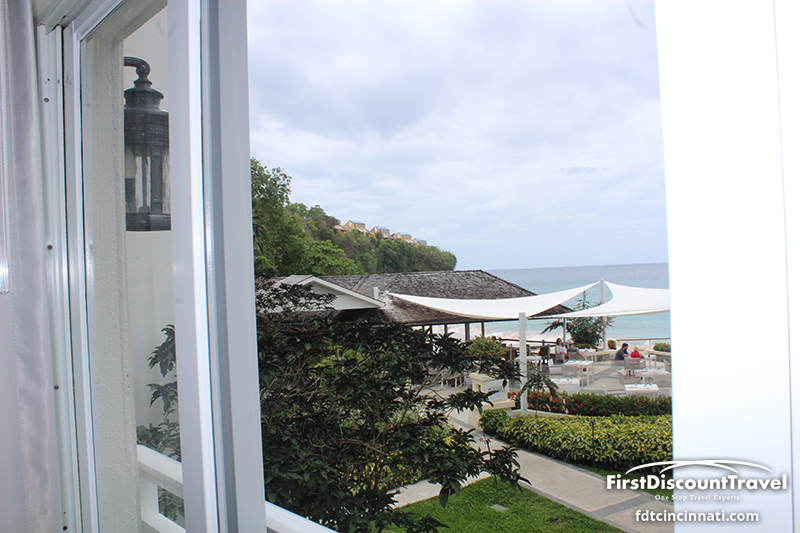 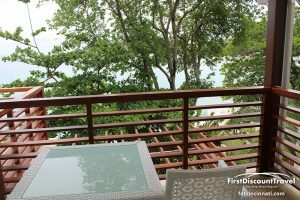 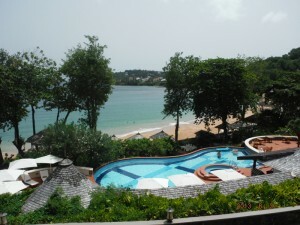 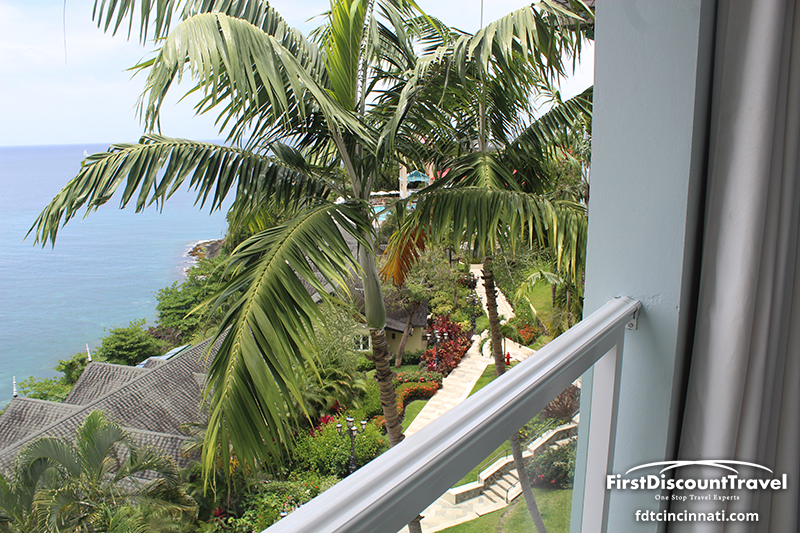 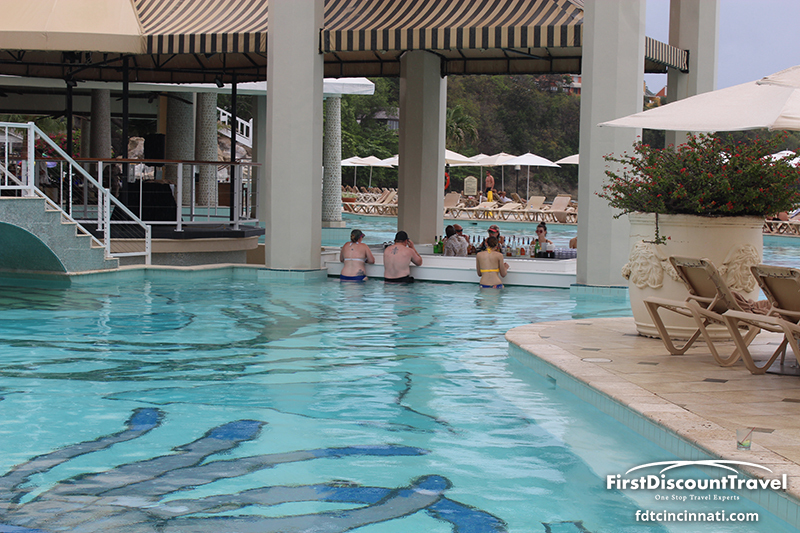 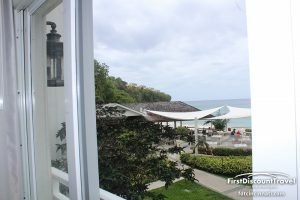 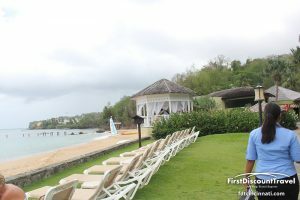 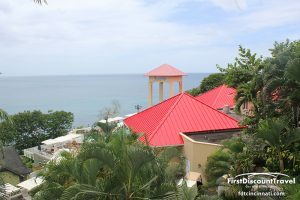 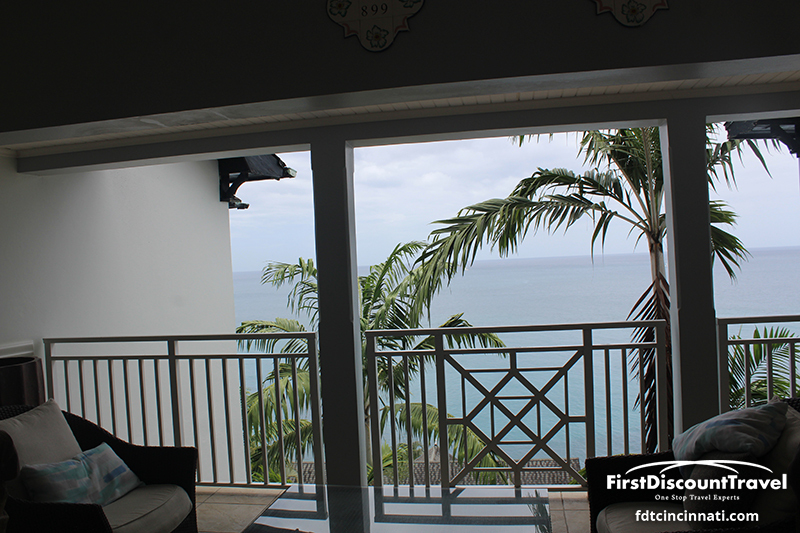 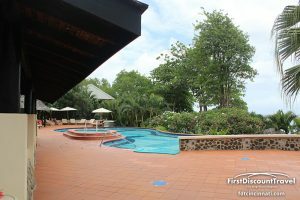 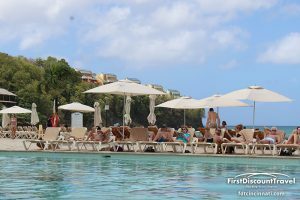 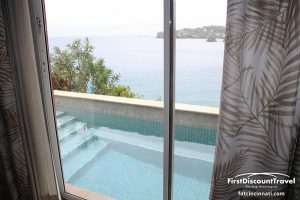 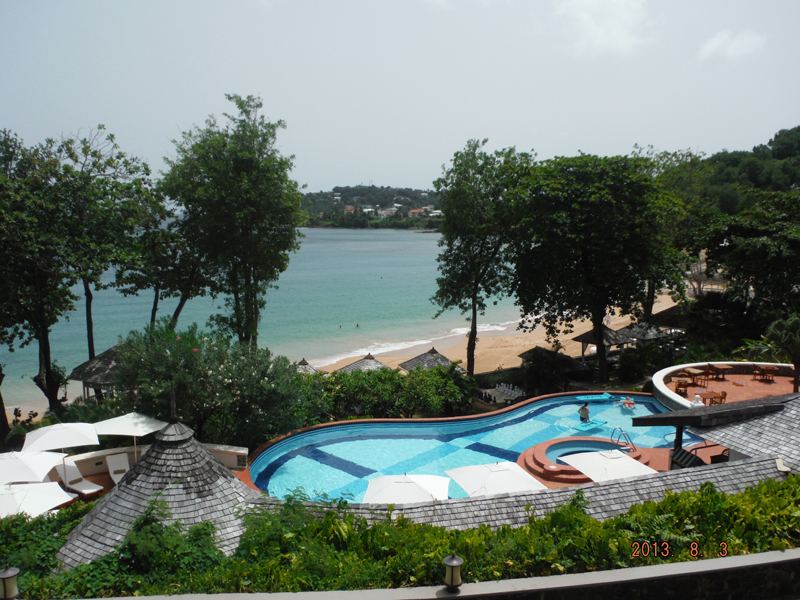 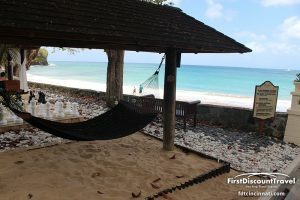 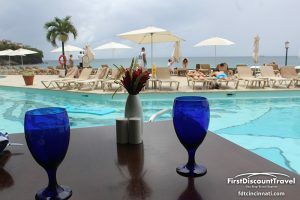 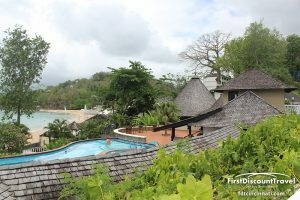 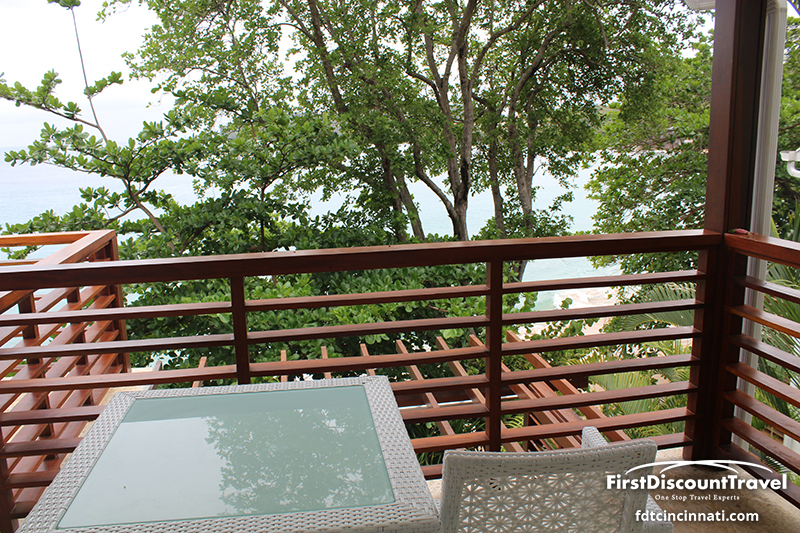 Sandals La Toc is built into the cliff with the main active pool overlooking the beach. 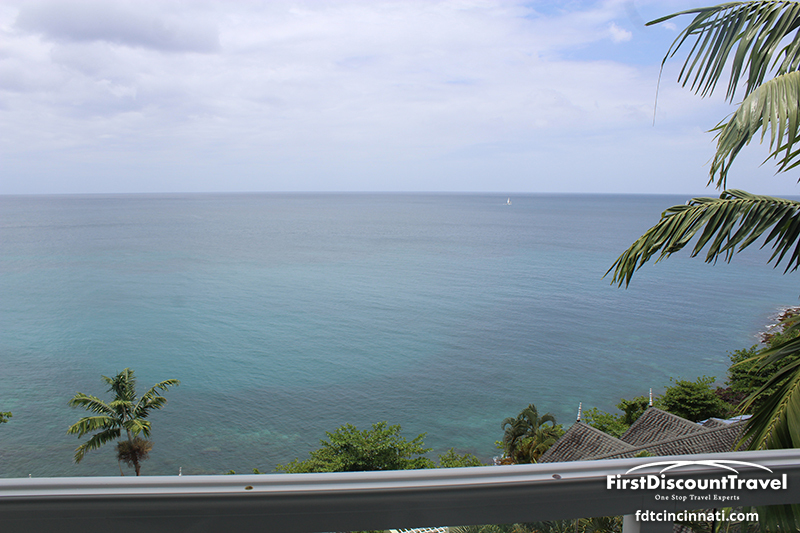 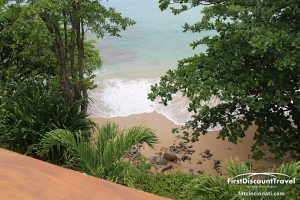 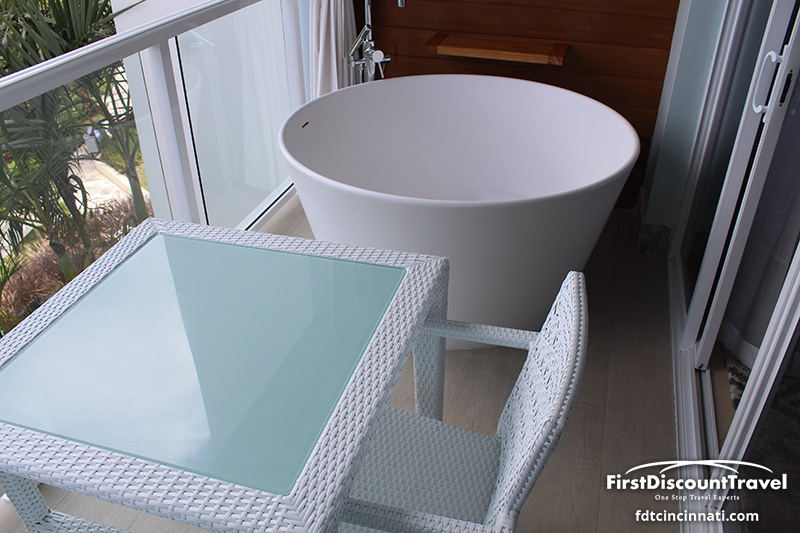 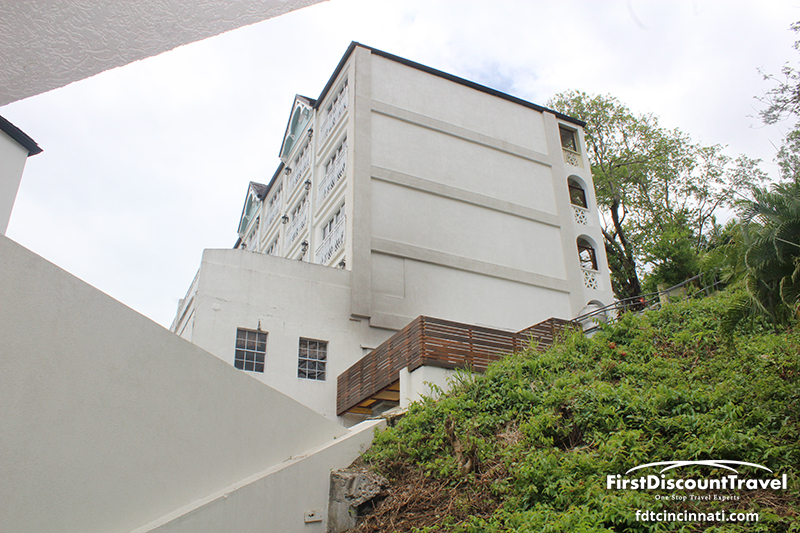 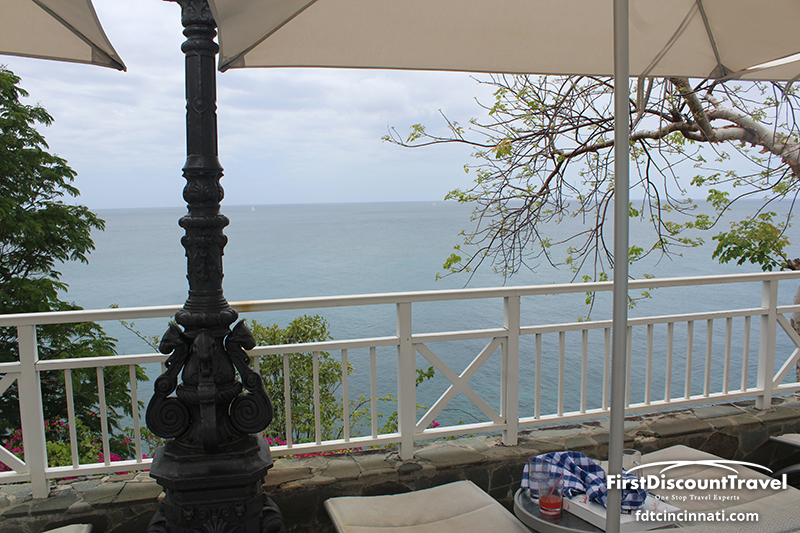 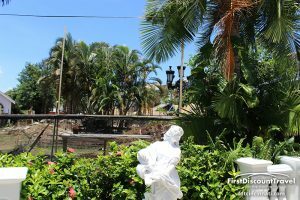 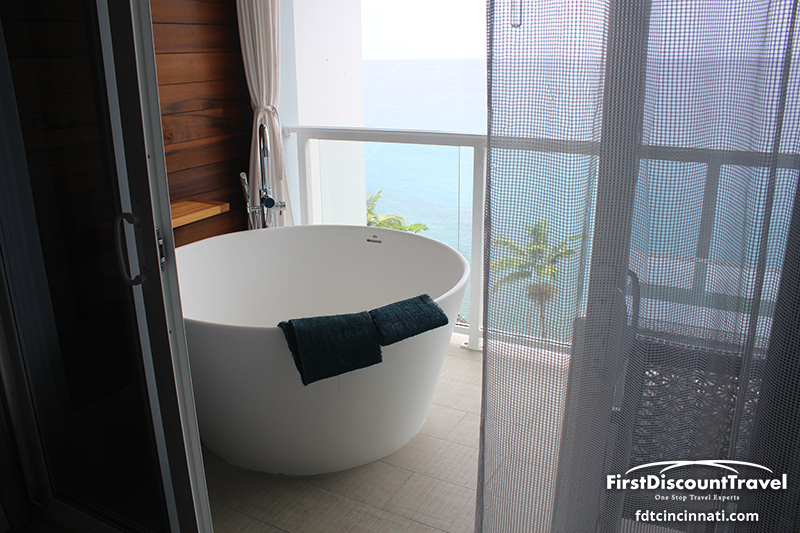 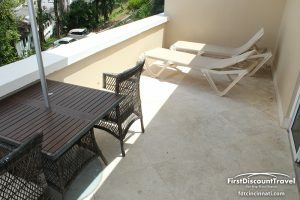 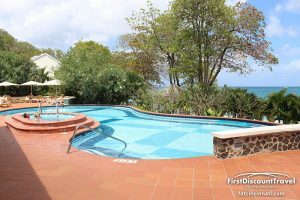 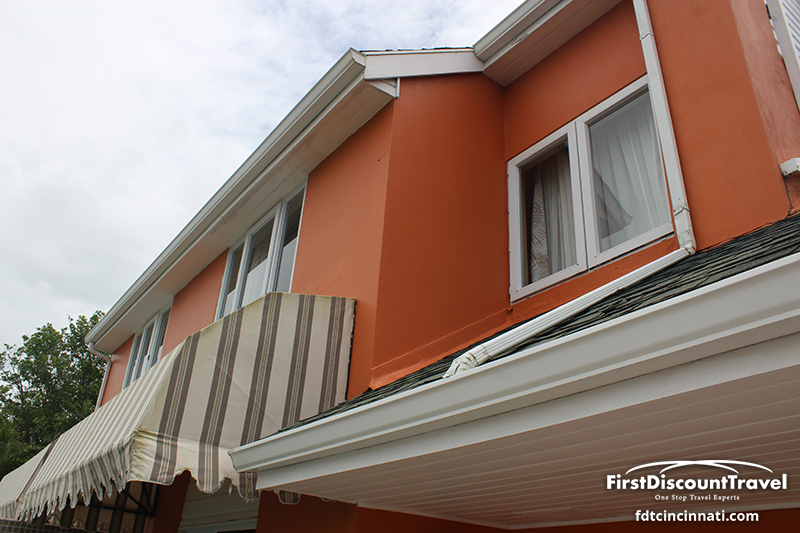 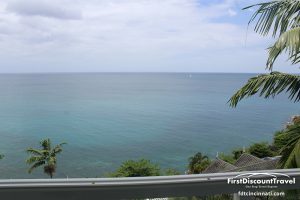 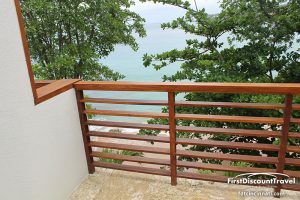 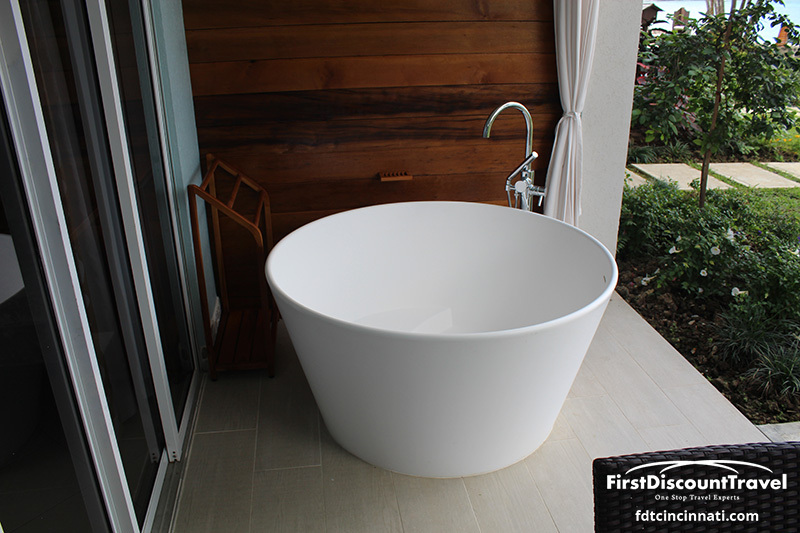 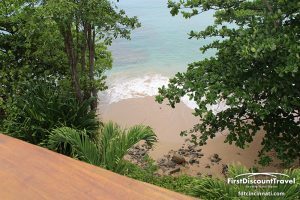 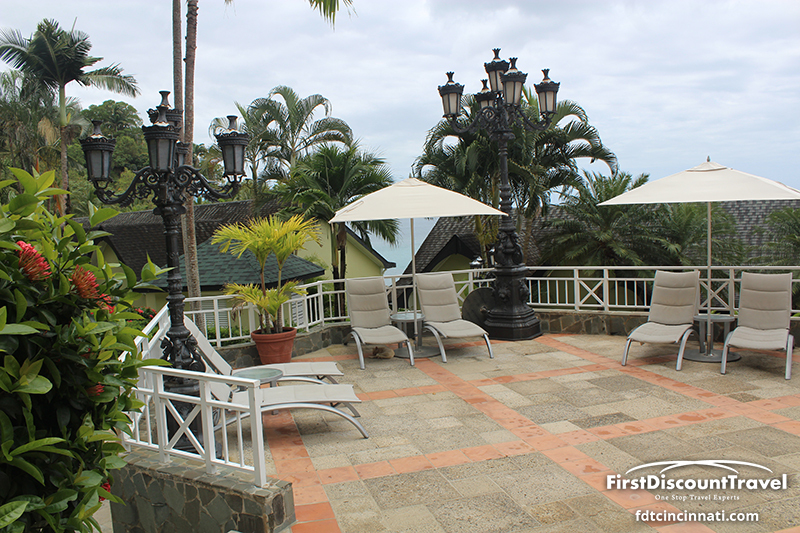 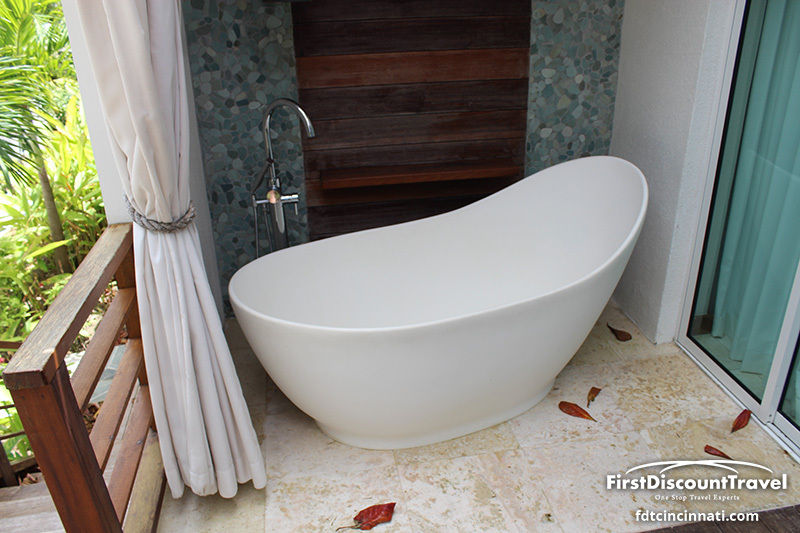 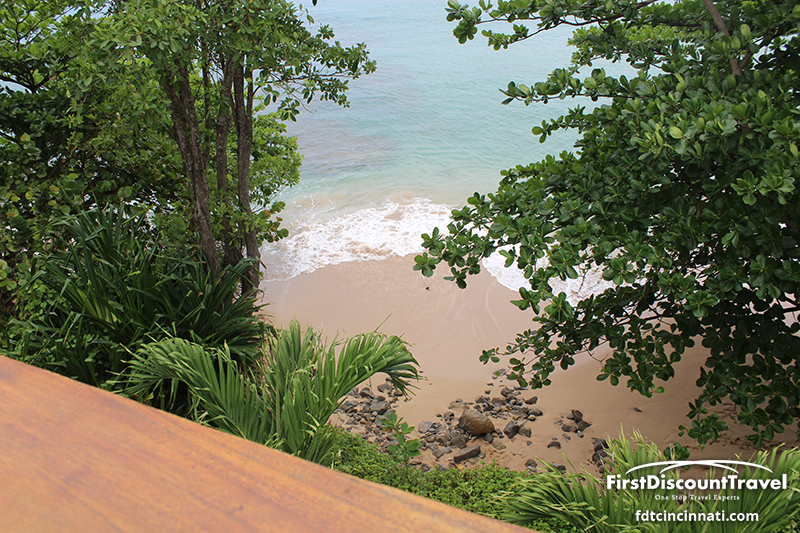 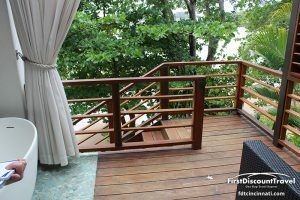 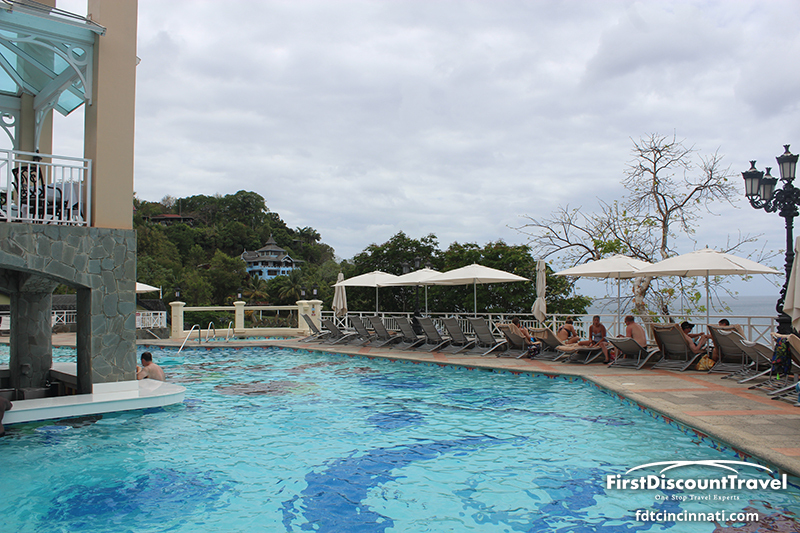 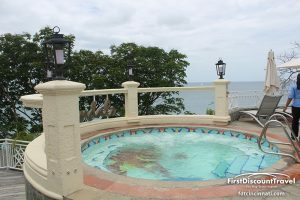 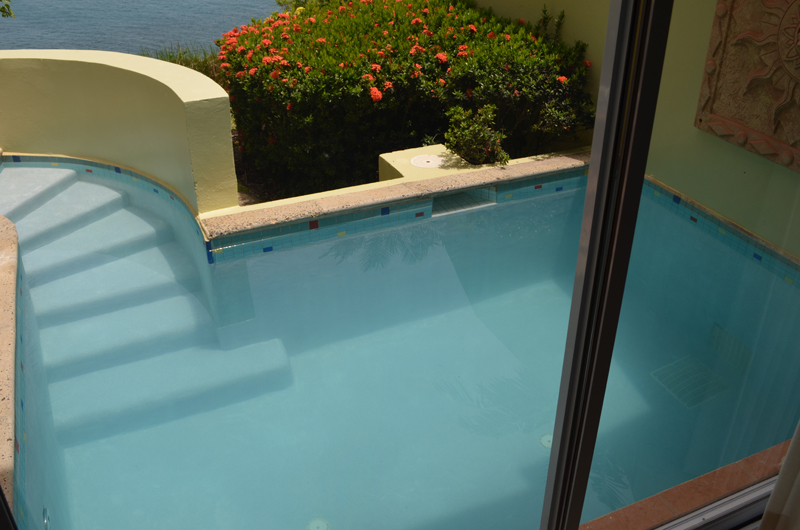 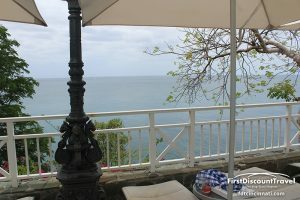 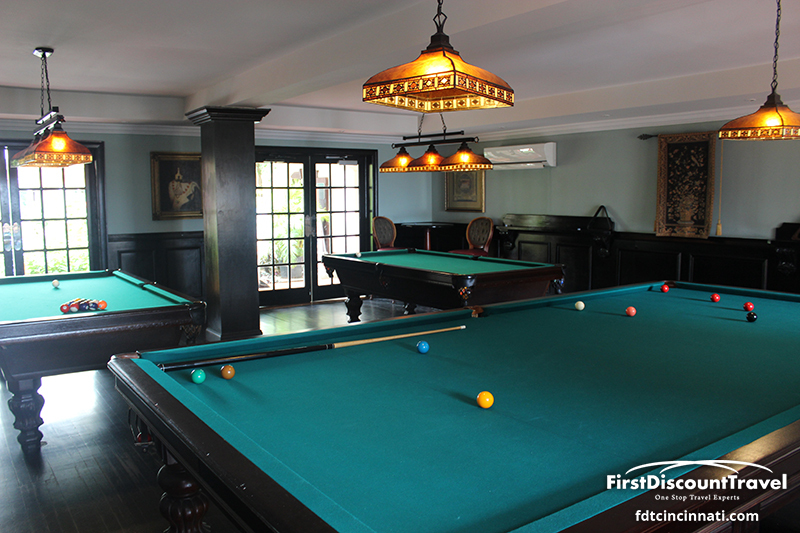 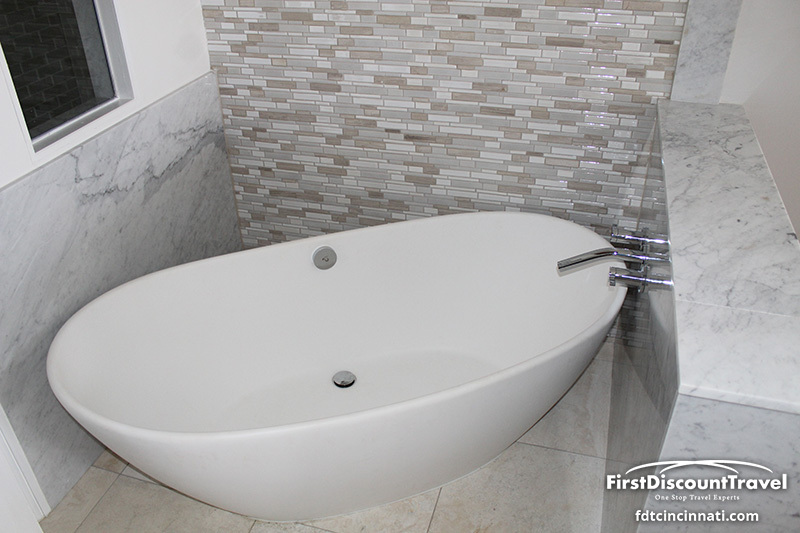 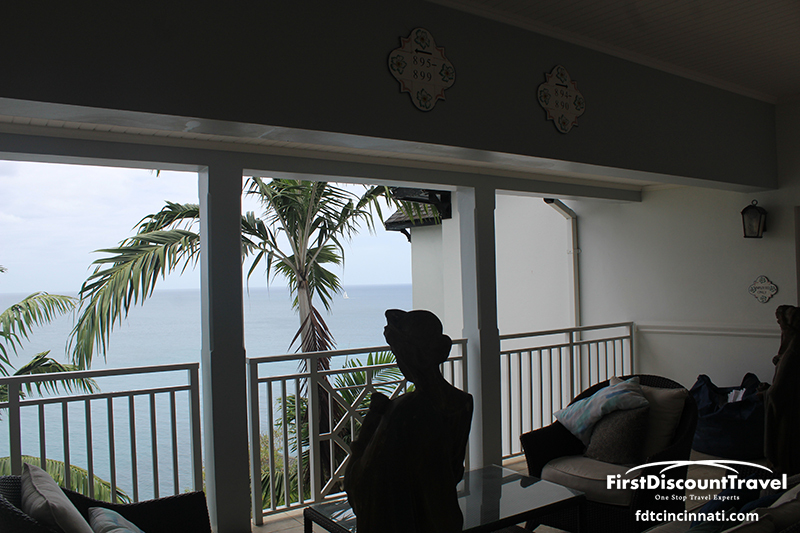 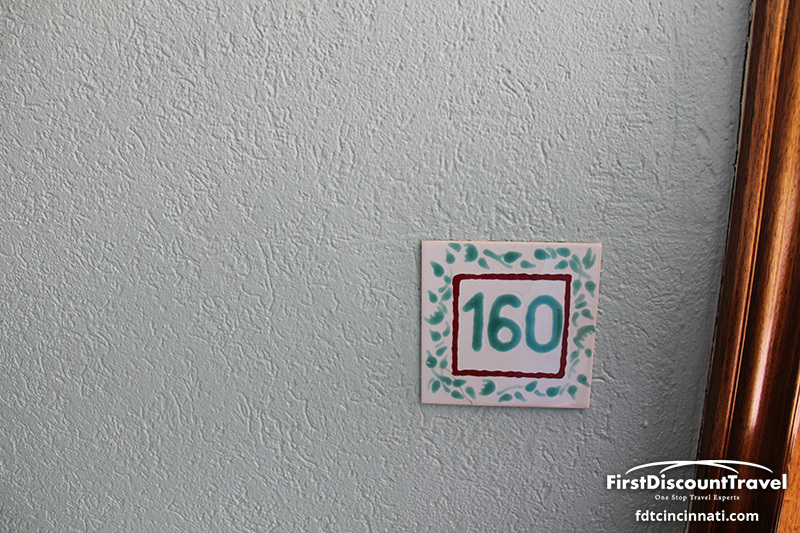 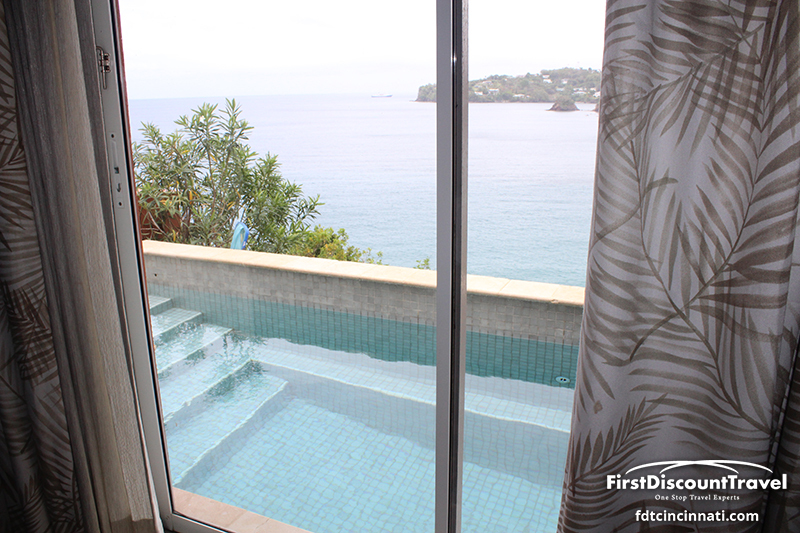 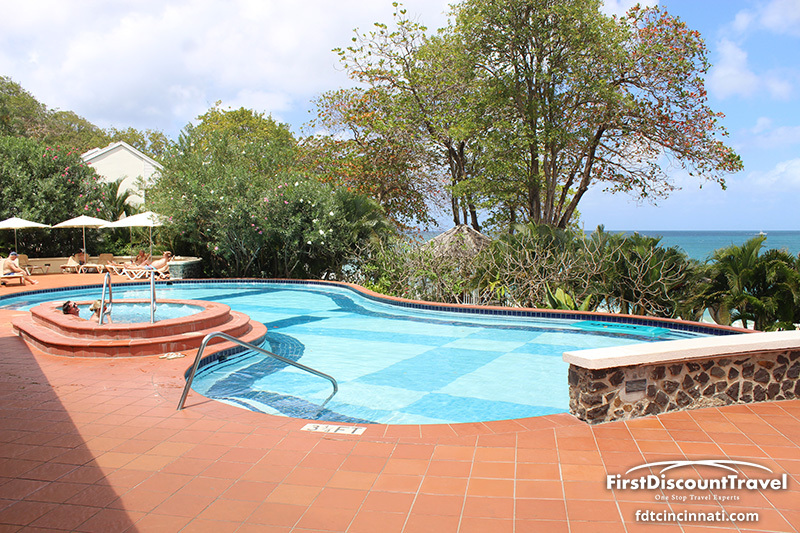 There is a relaxing pool on the Sunset Bluff offering magnificent views. 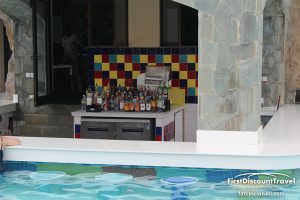 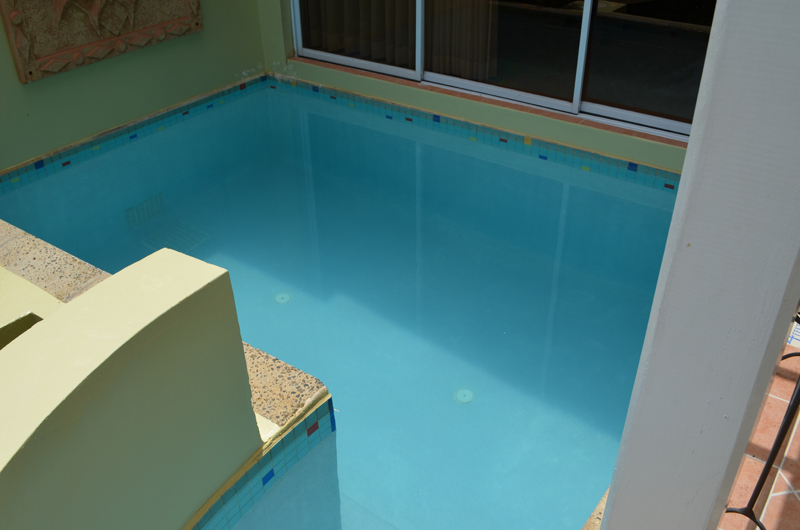 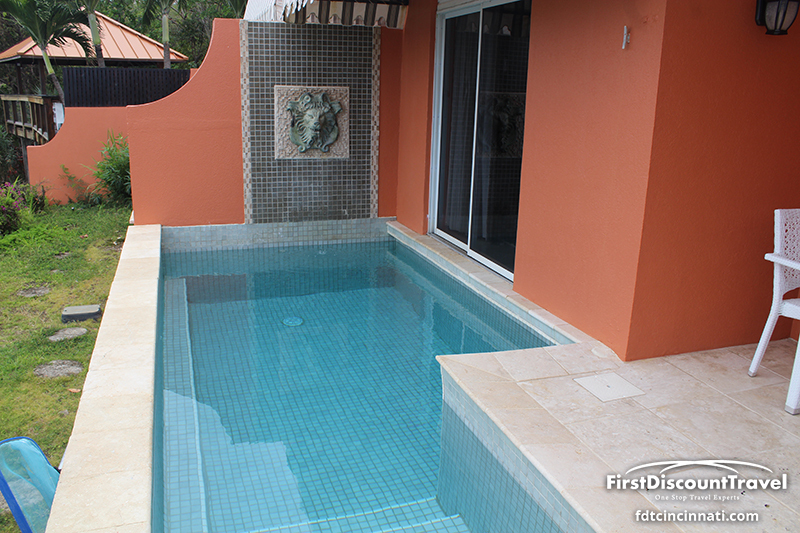 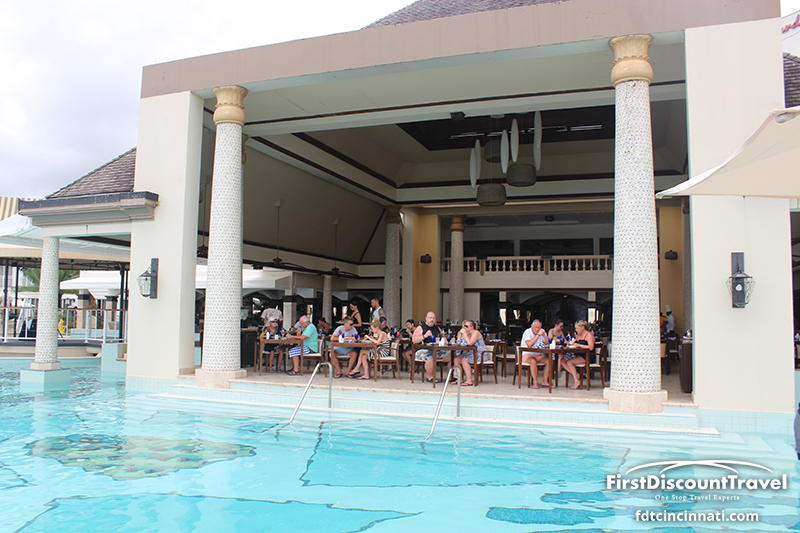 Both pools offer swim up pool bars! 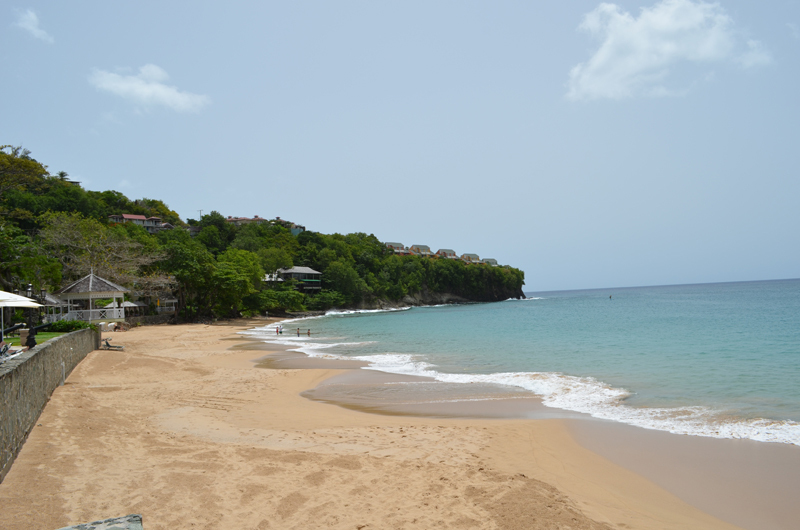 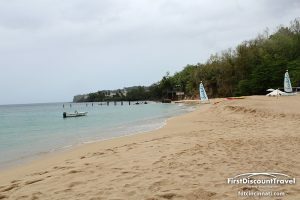 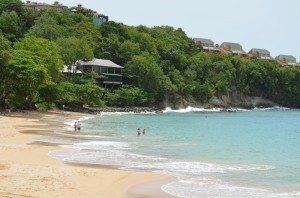 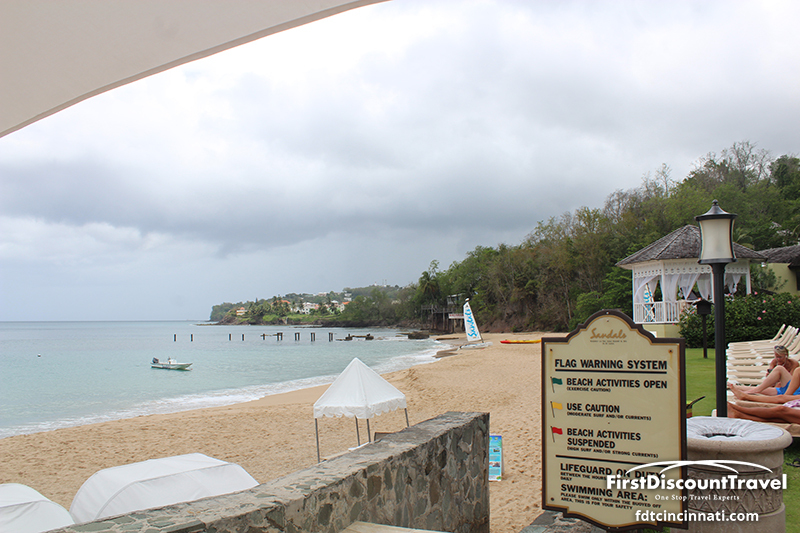 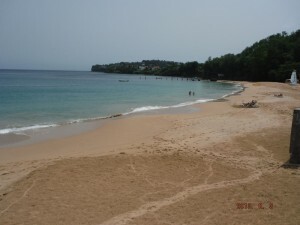 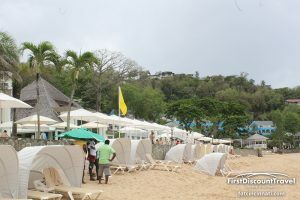 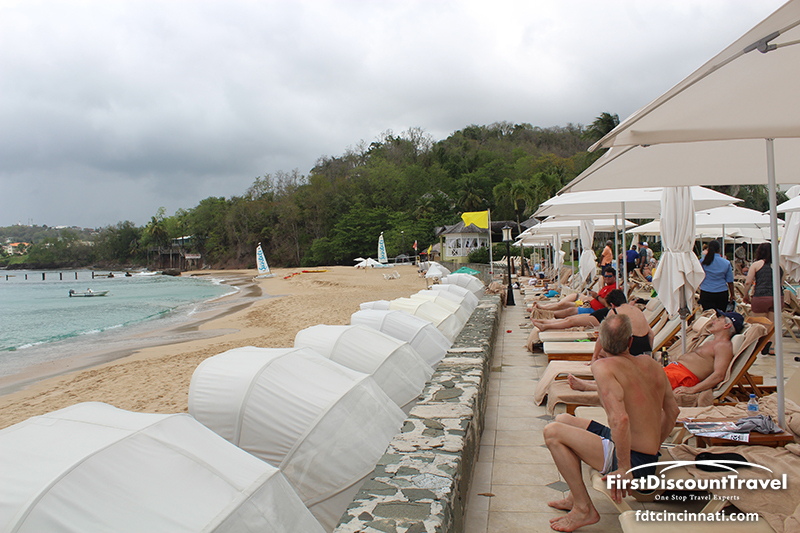 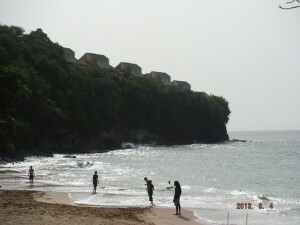 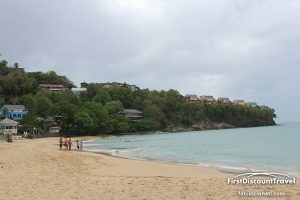 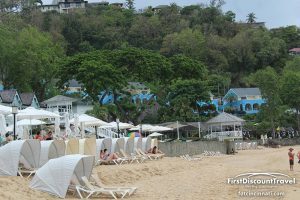 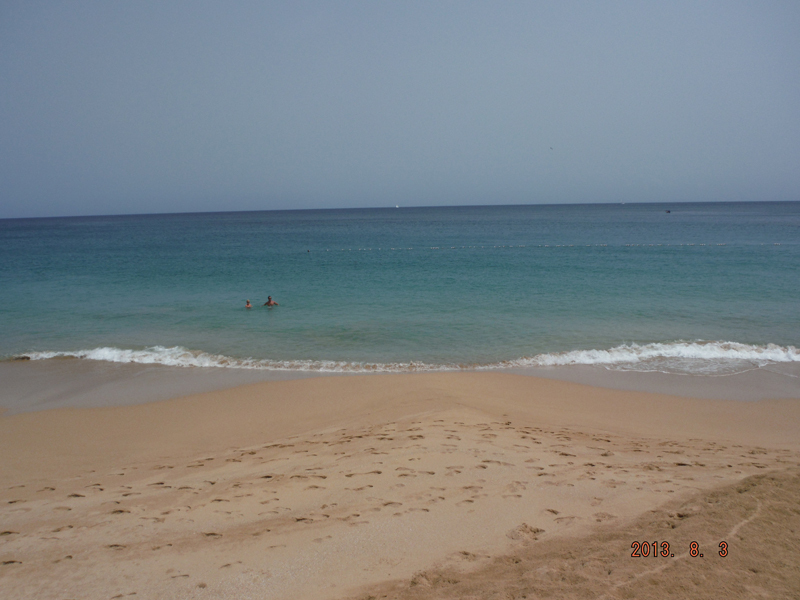 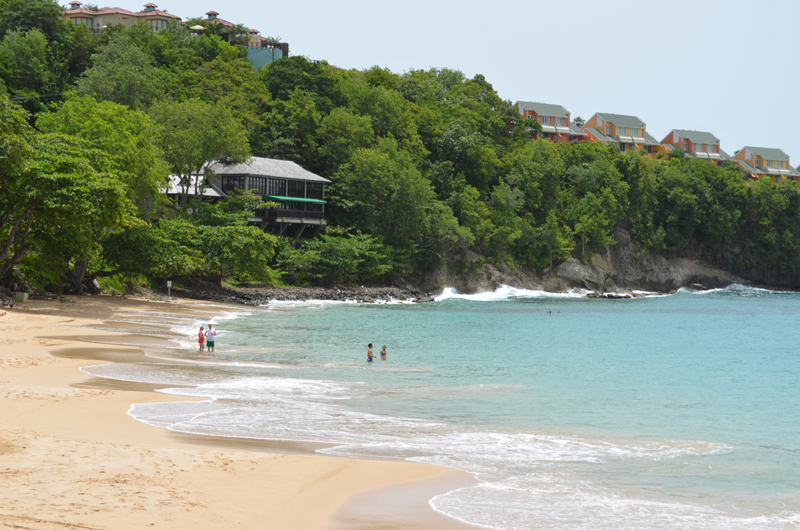 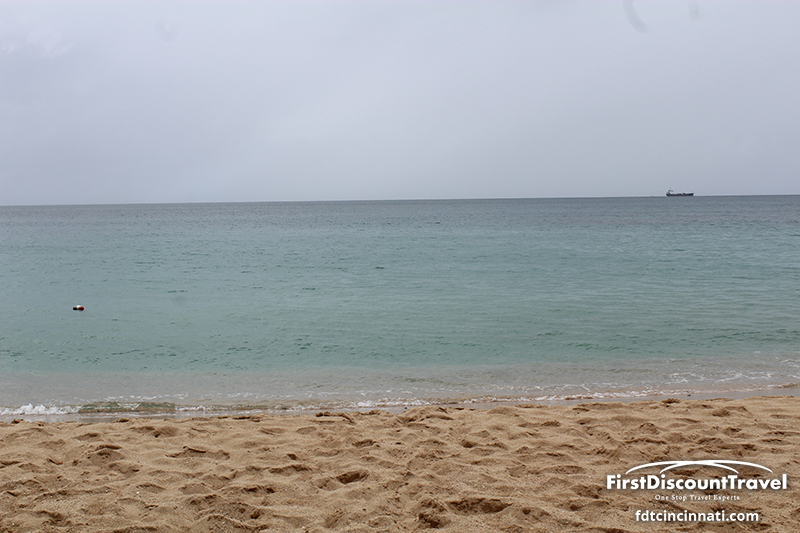 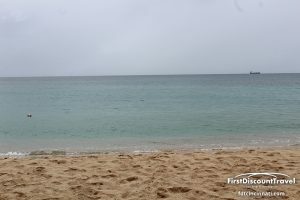 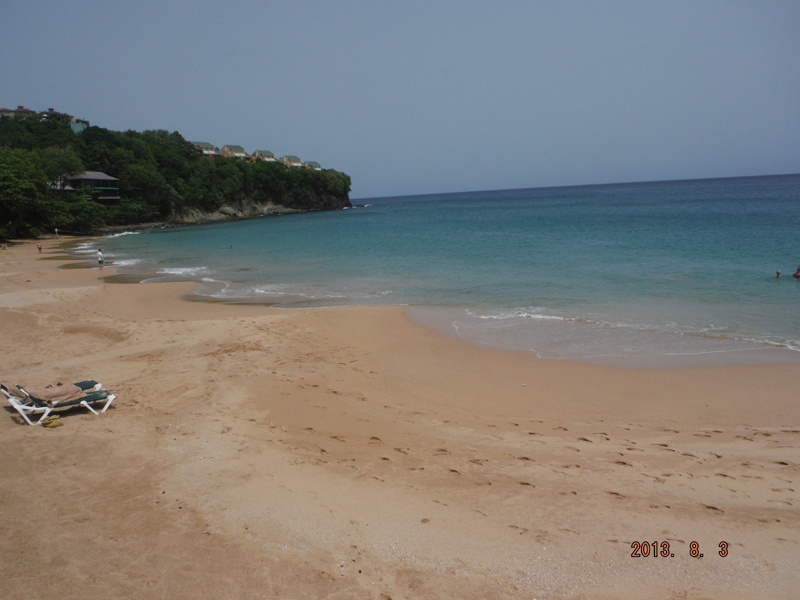 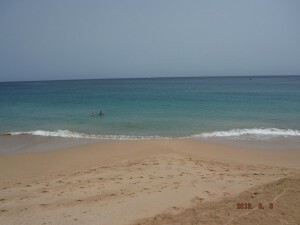 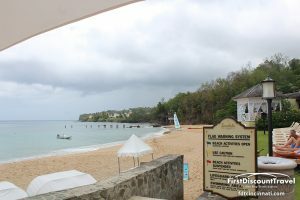 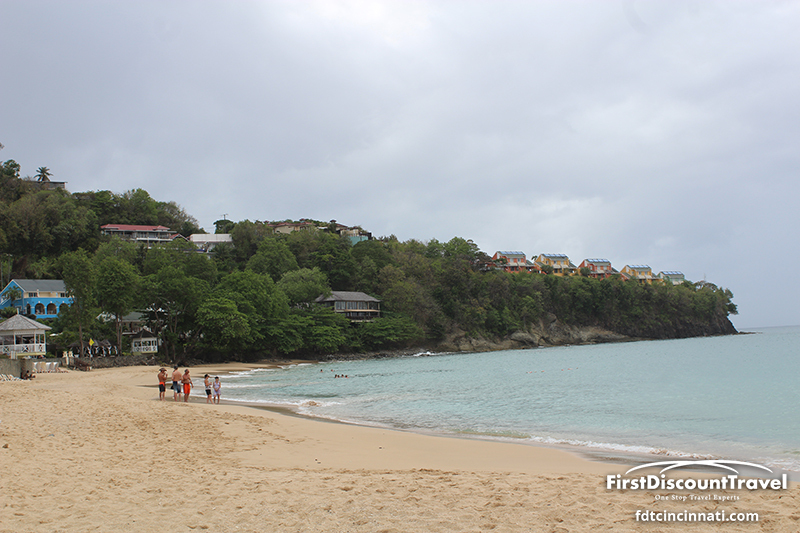 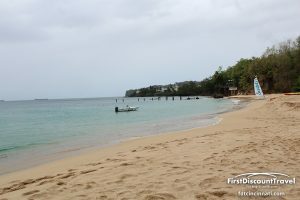 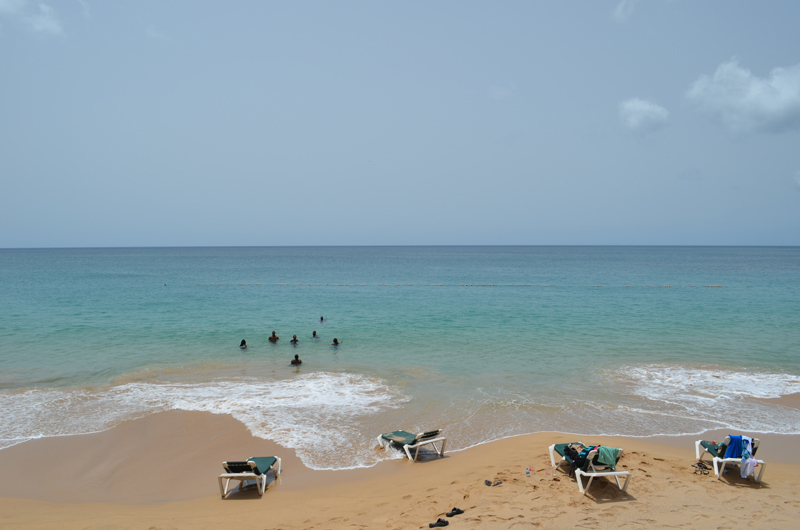 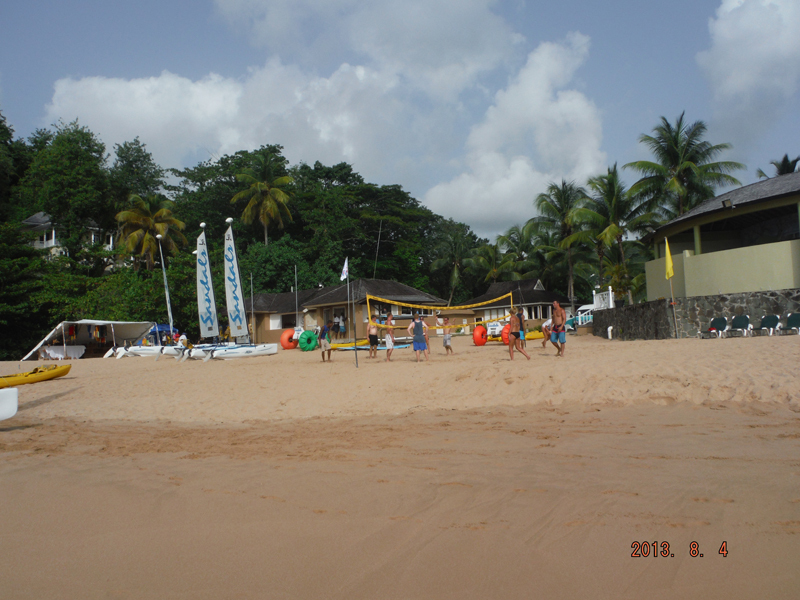 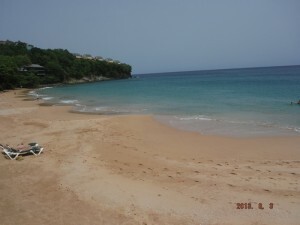 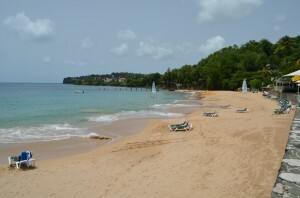 The beach is nice for walking and swimming but not perfect like the beach at Sandals Grande St Lucian. Typically, Sandals La Toc does get some waves, but this was not the case when I visited. 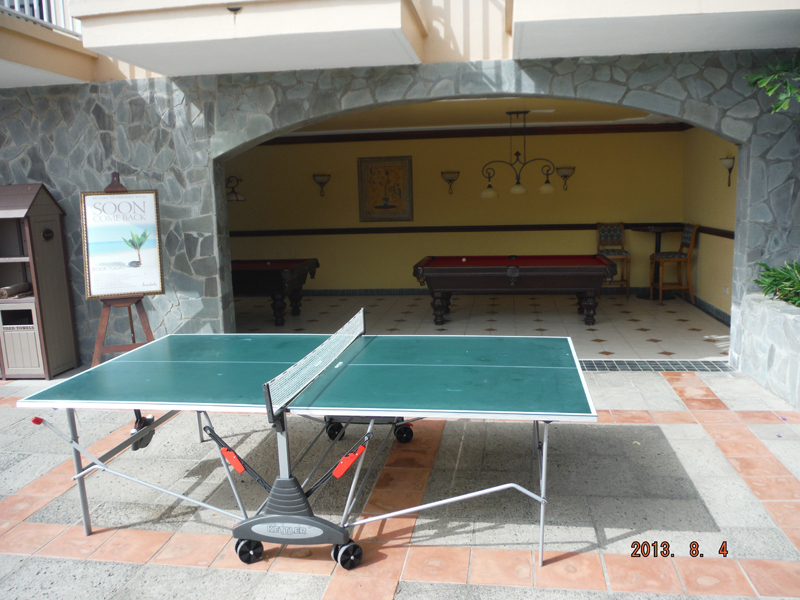 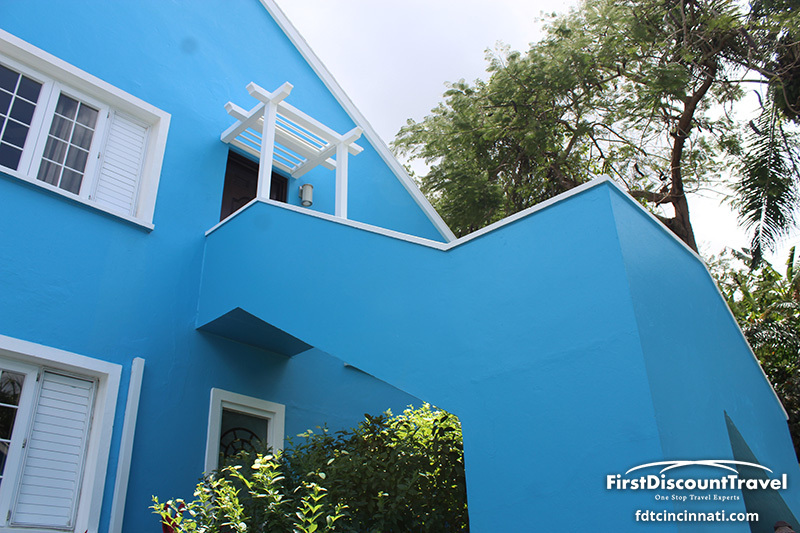 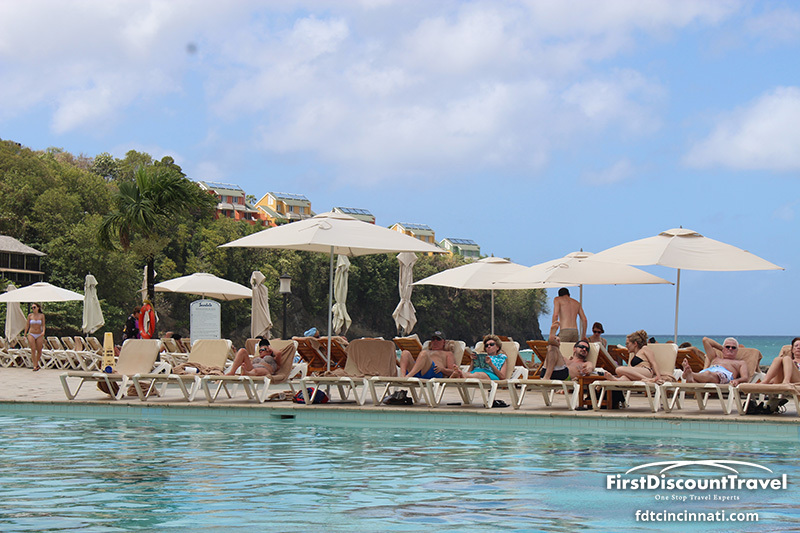 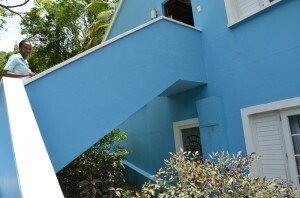 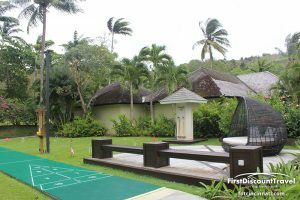 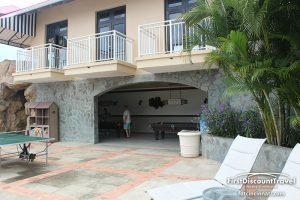 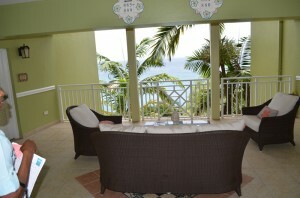 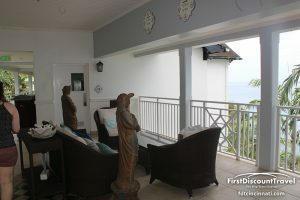 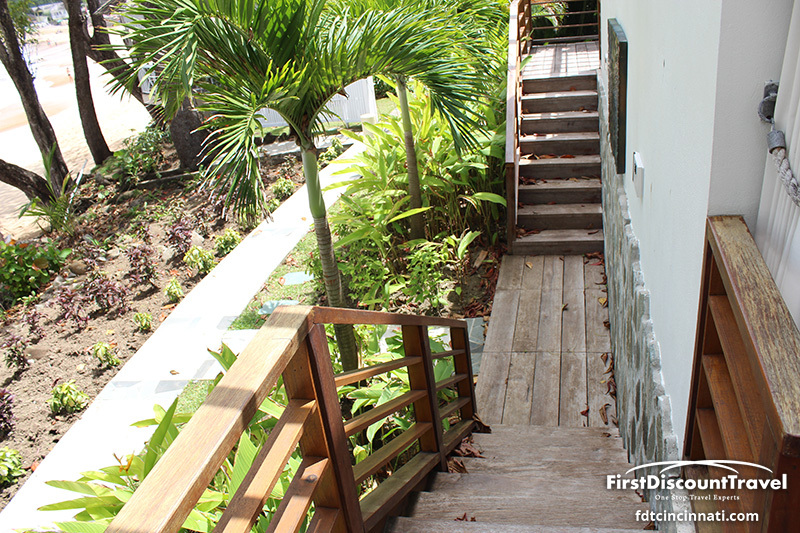 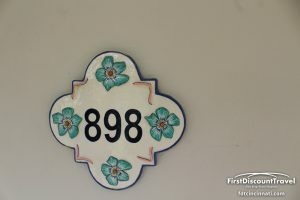 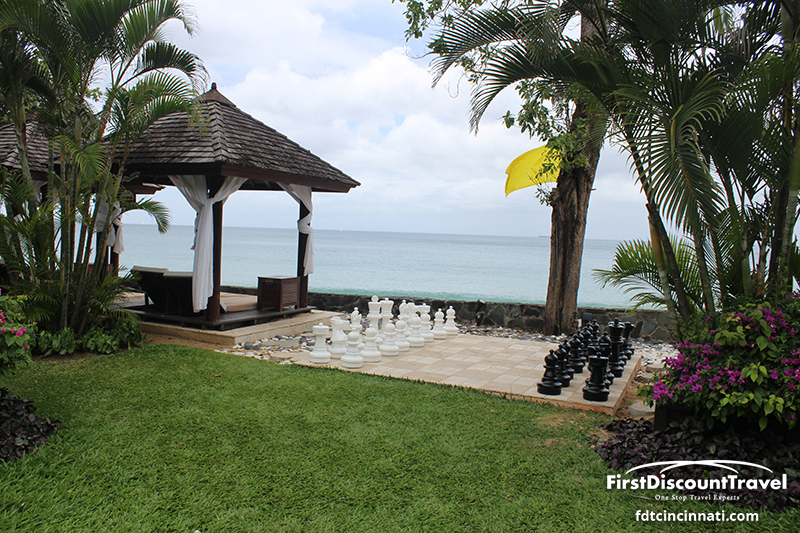 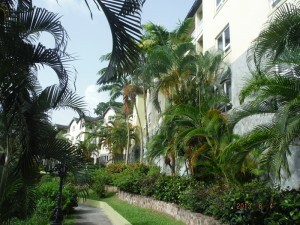 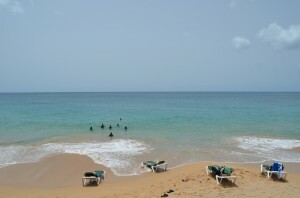 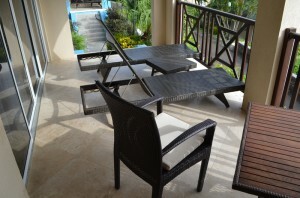 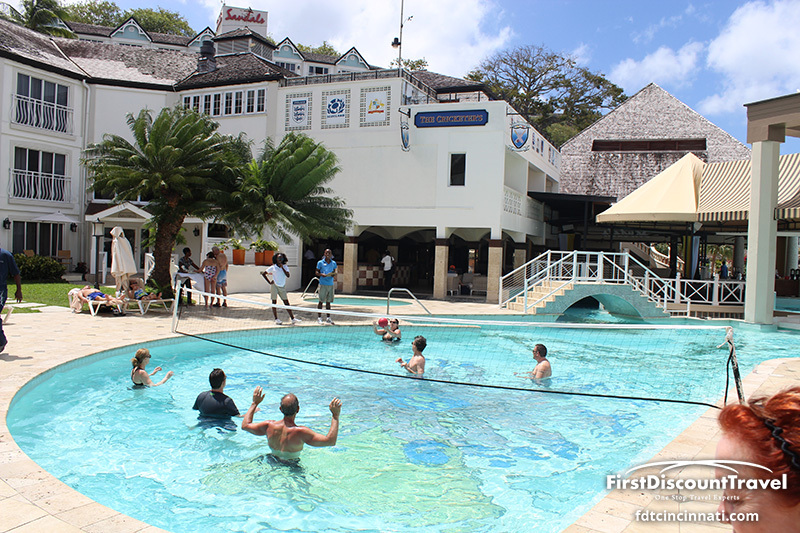 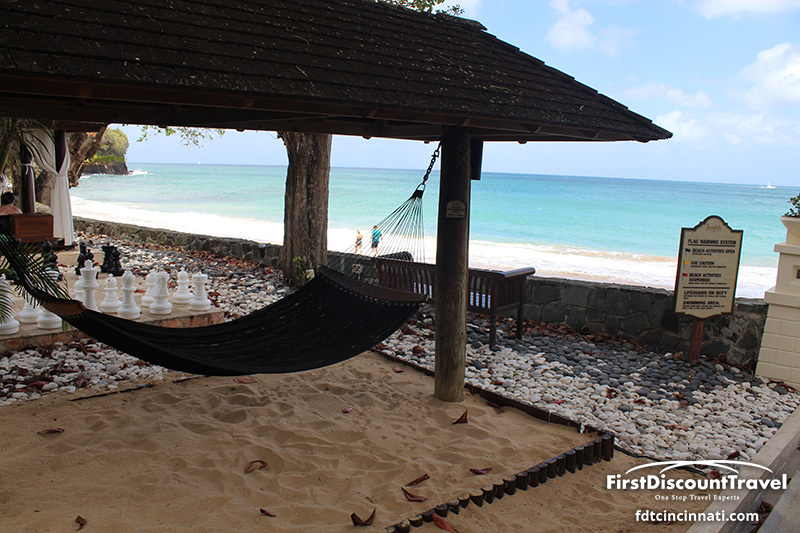 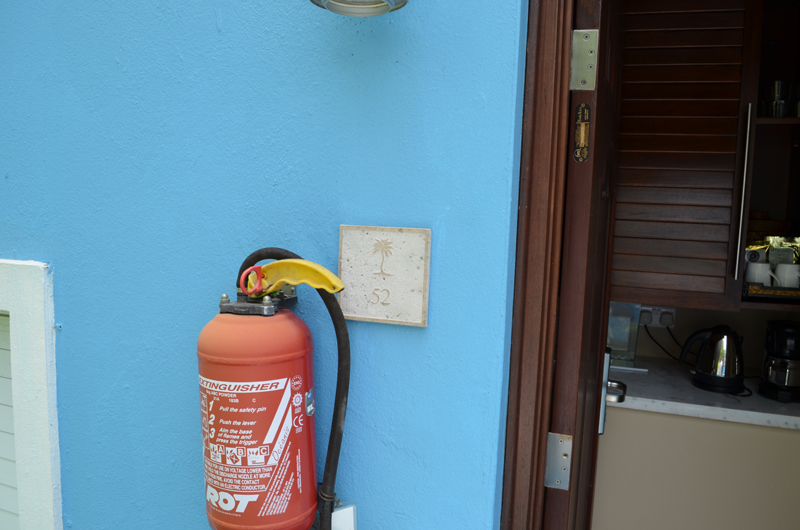 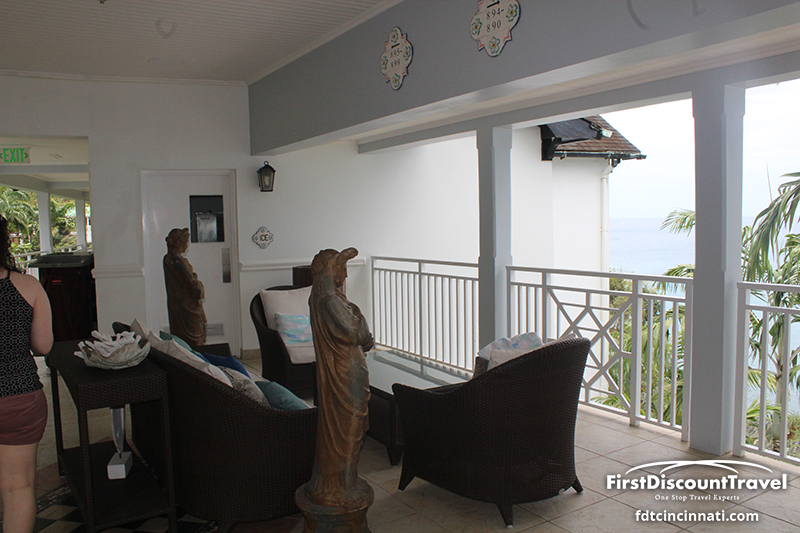 The resort is very active, but most watersports require a transfer to the Grande St Lucian. 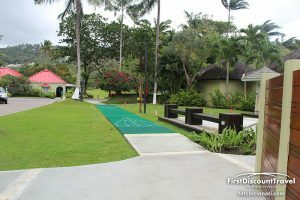 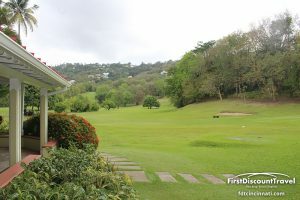 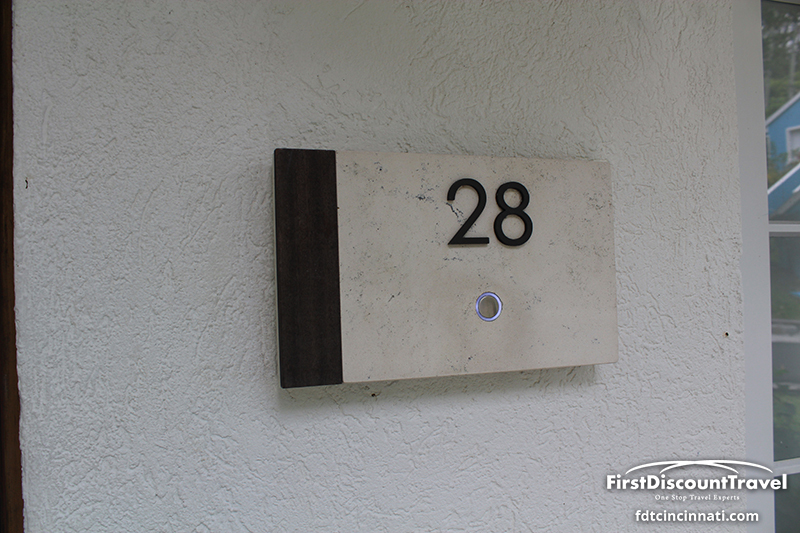 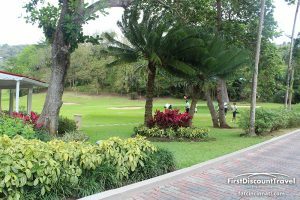 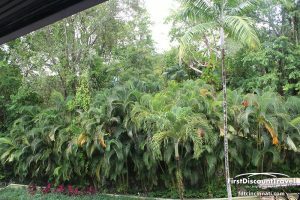 There is a 9 hole 2300 yard par 3 golf course located on property. 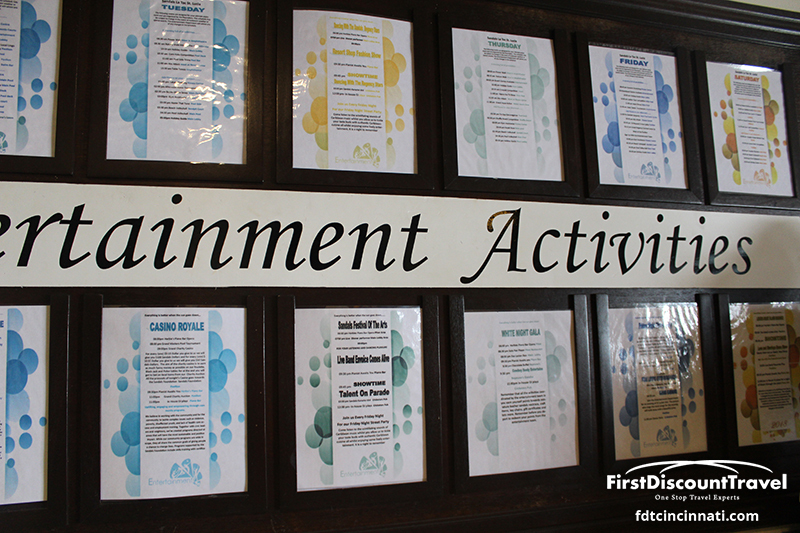 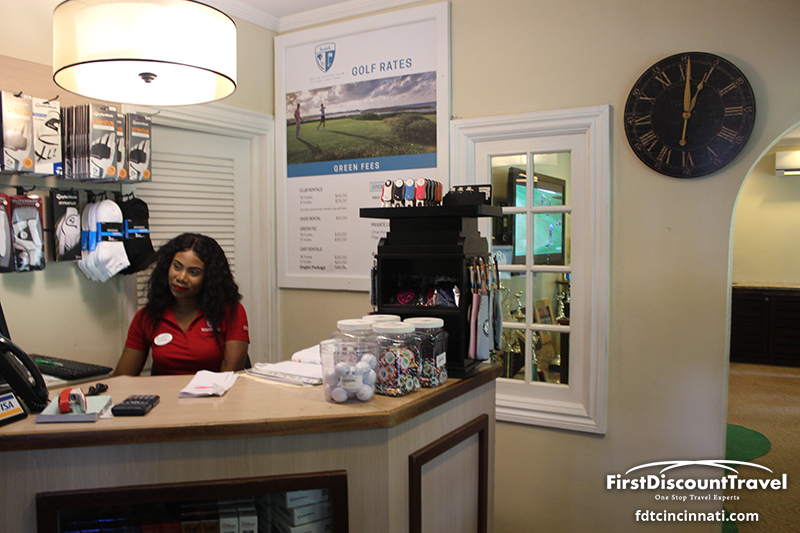 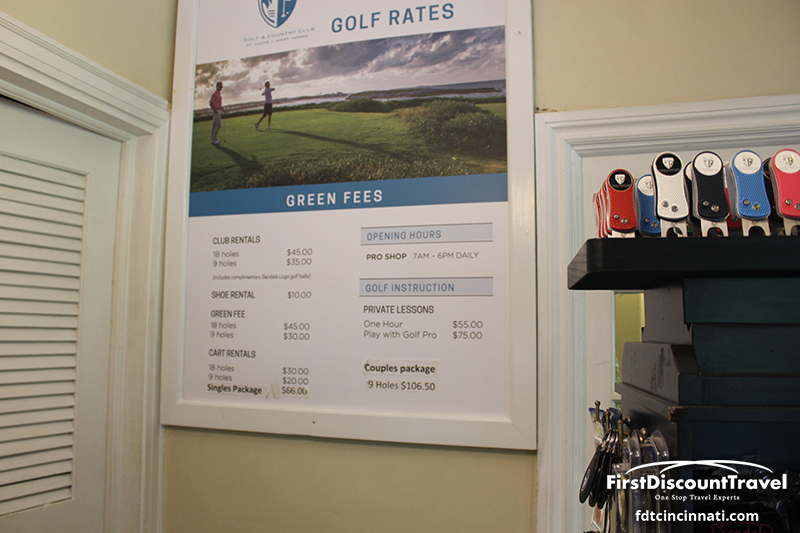 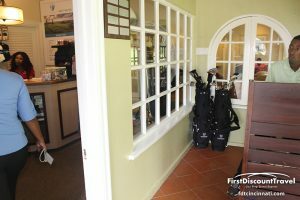 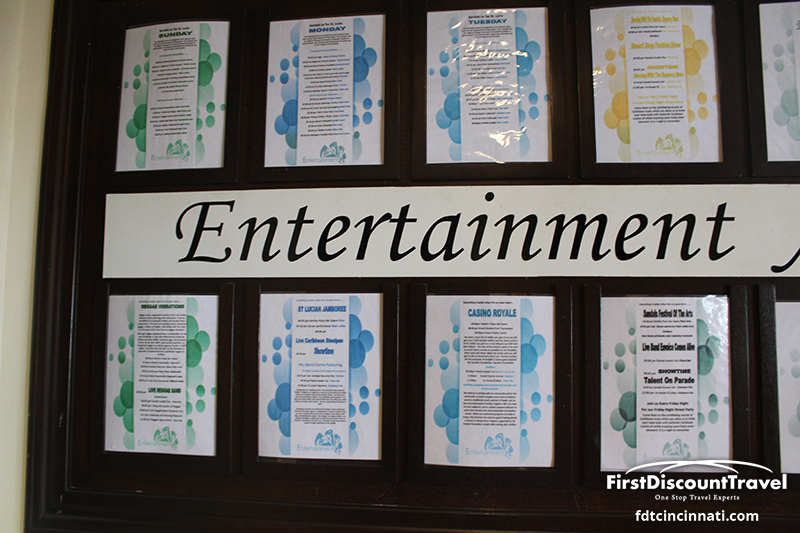 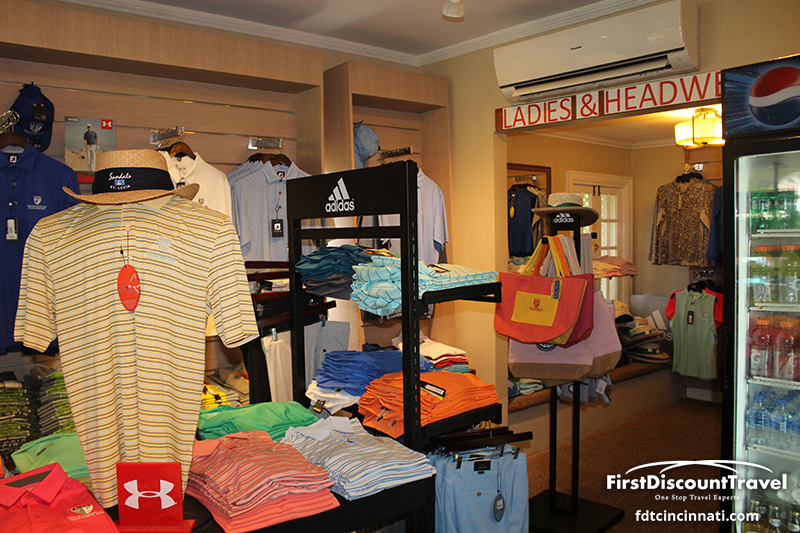 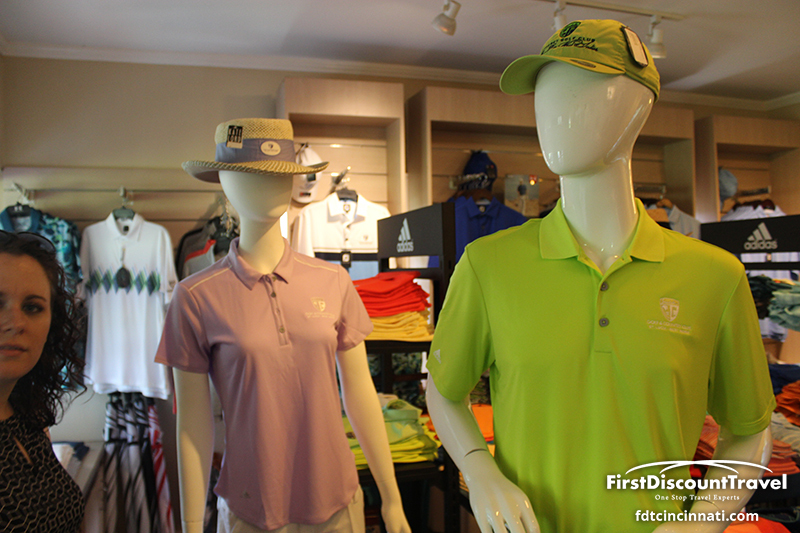 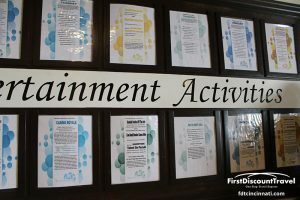 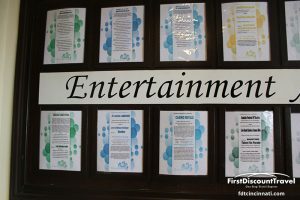 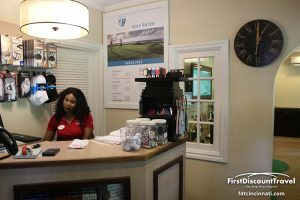 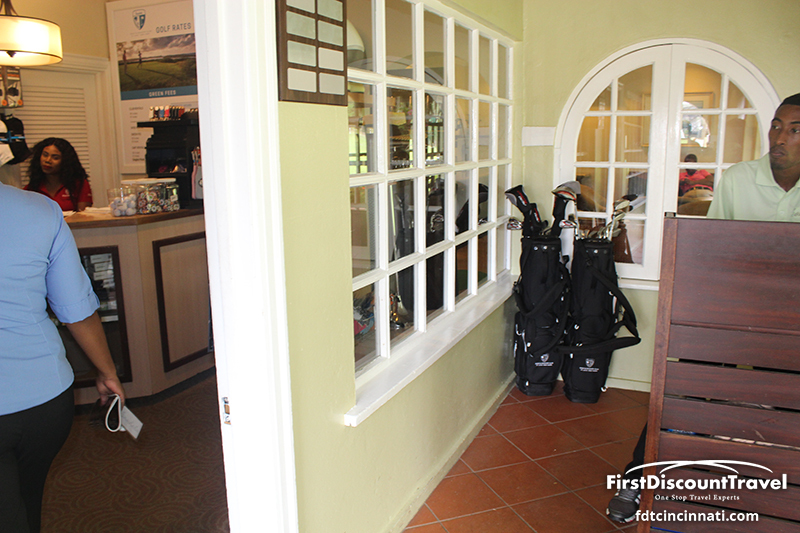 It takes about 90 minutes to 2 hours to play, and club rental and carts are optional and require additional cost. 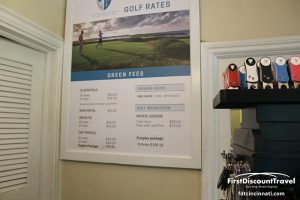 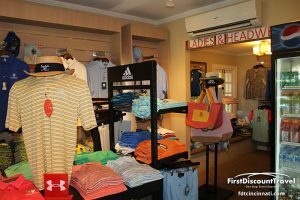 A caddy is mandatory and costs $10 for 9 holes. 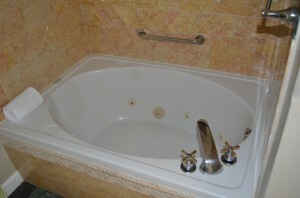 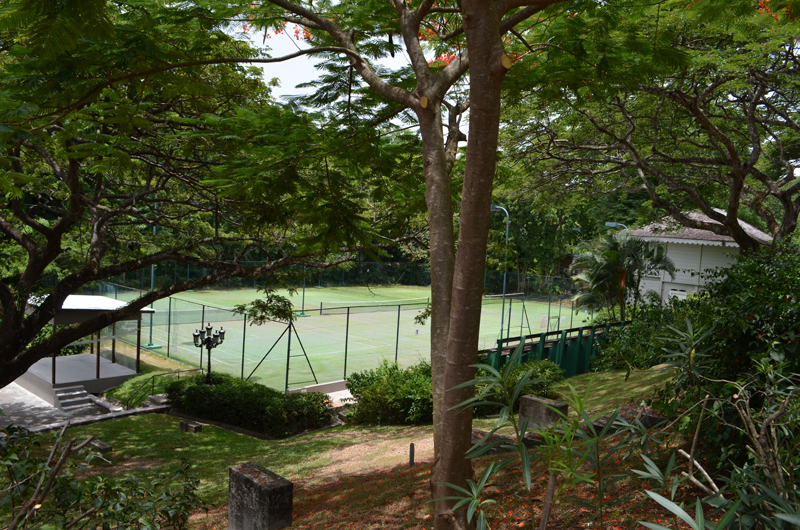 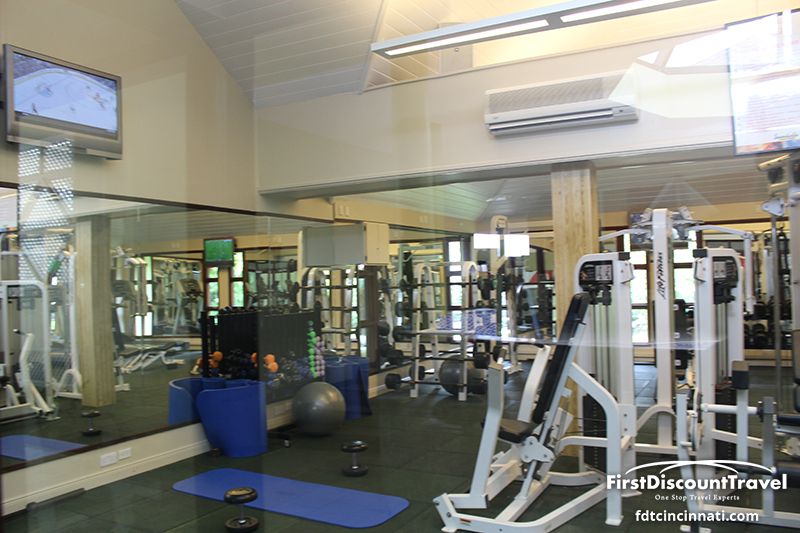 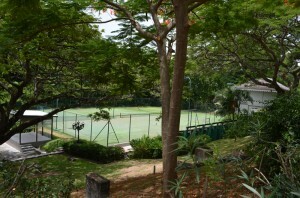 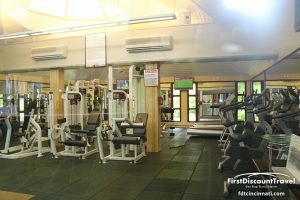 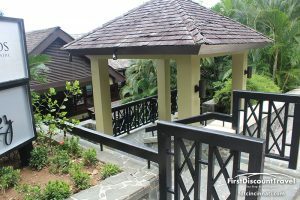 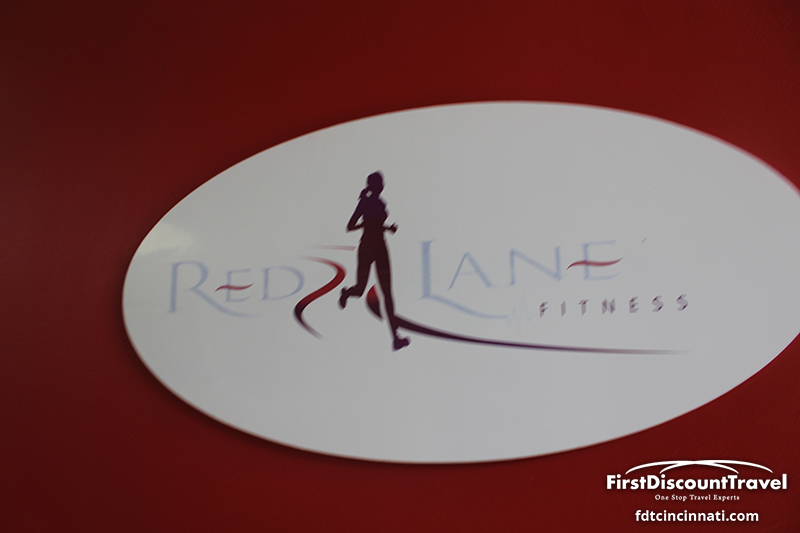 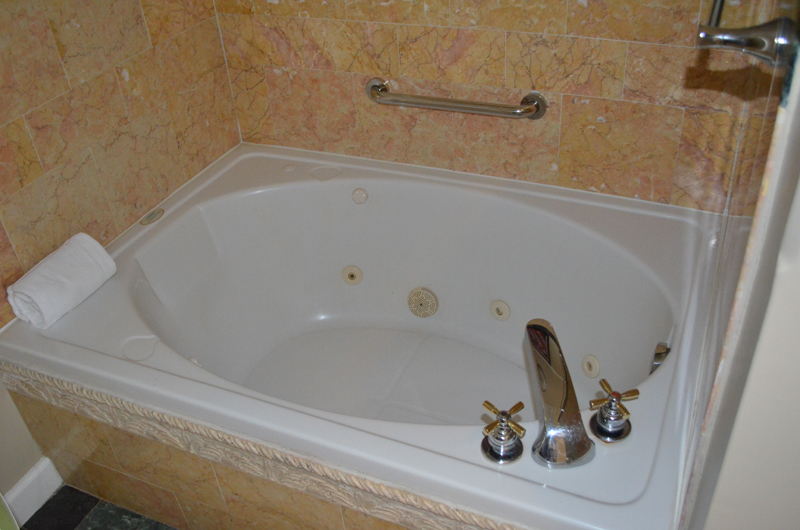 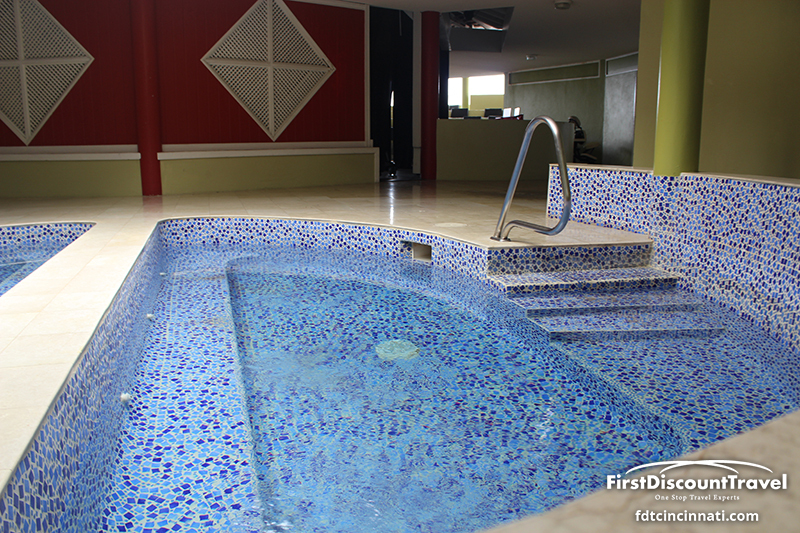 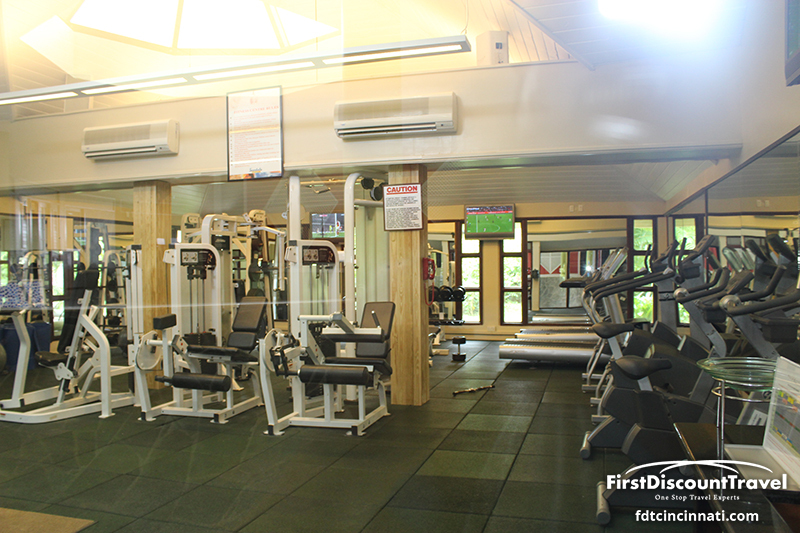 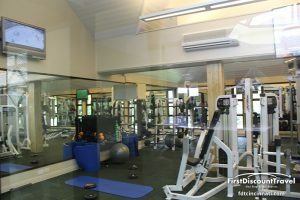 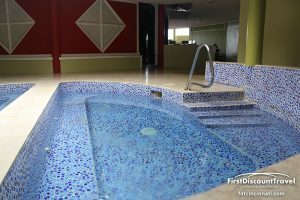 The resort has a fantastic spa and a nice gym with free weights and plenty of cardio equipment. 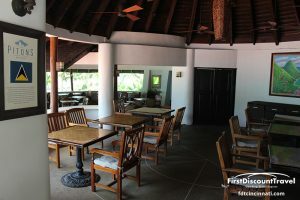 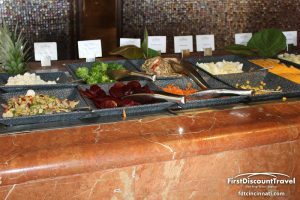 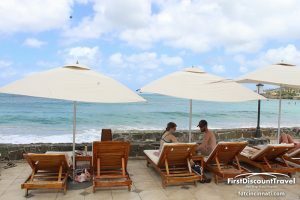 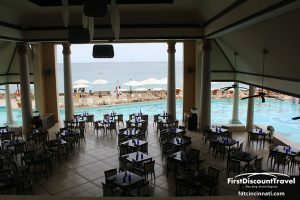 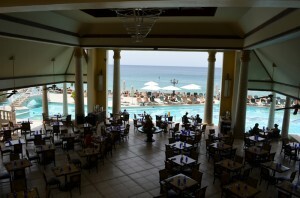 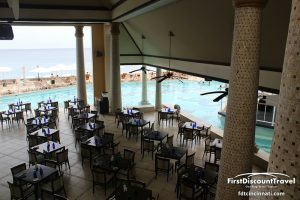 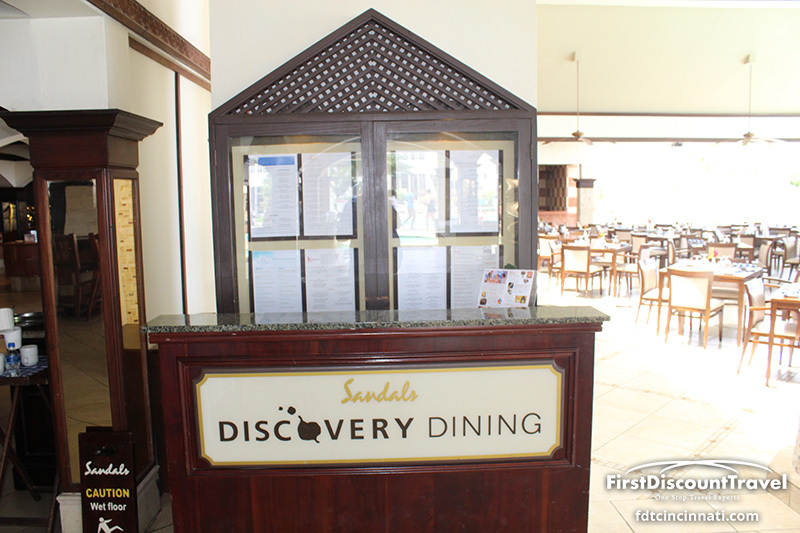 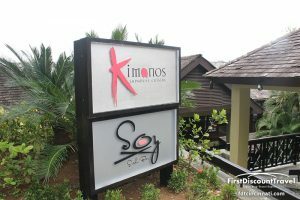 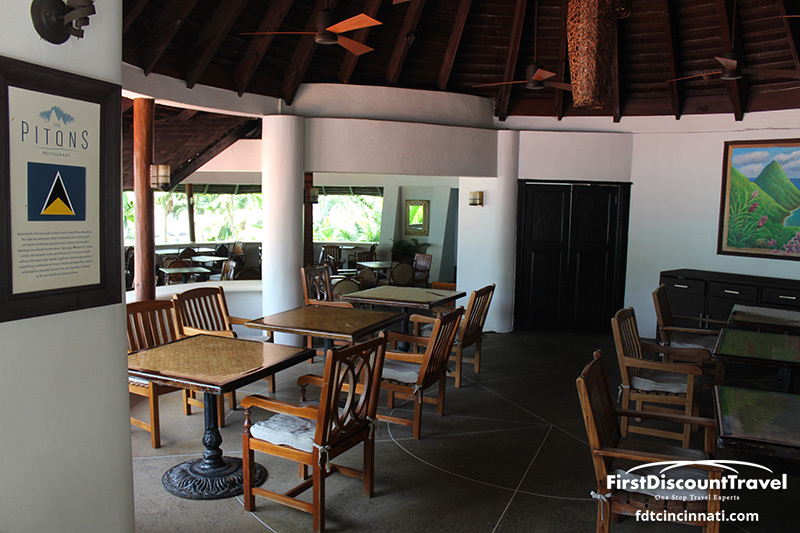 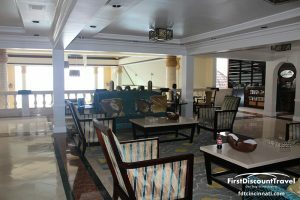 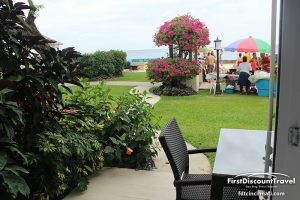 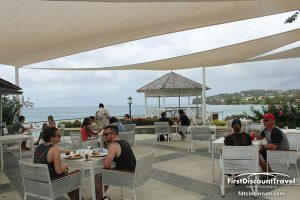 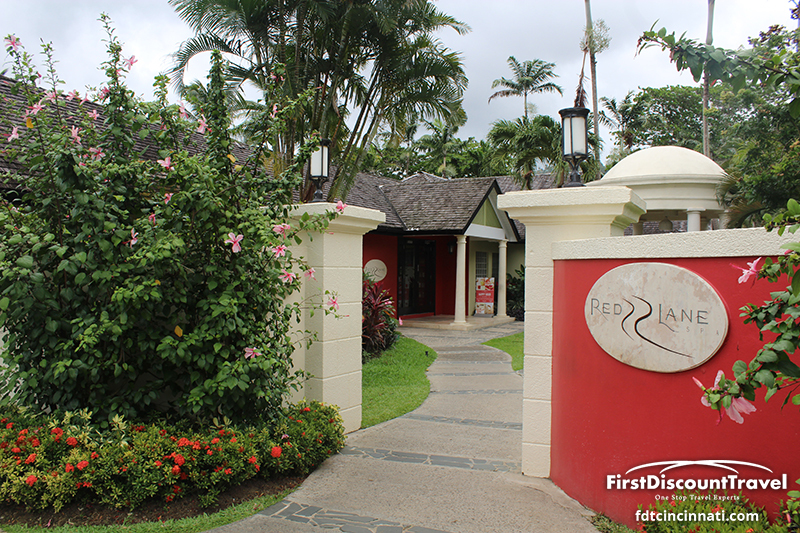 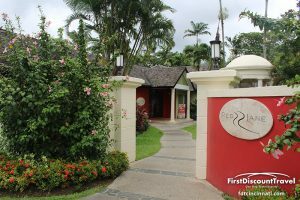 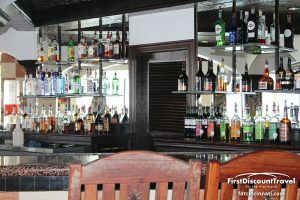 Sandals Regency has 10 restaurants, including Kimonos (Benihana style teppanaki style dining), which is the most popular. 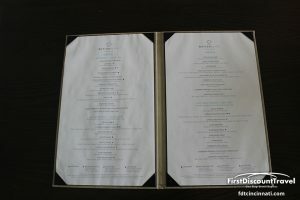 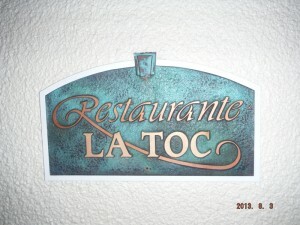 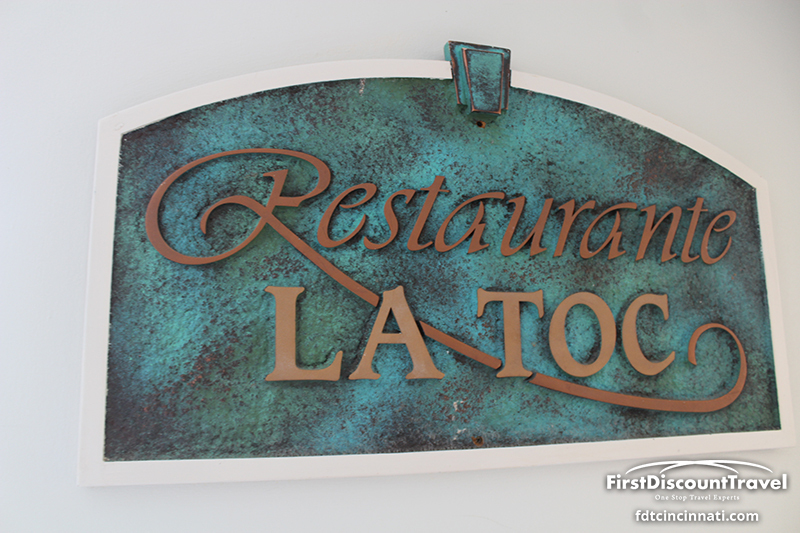 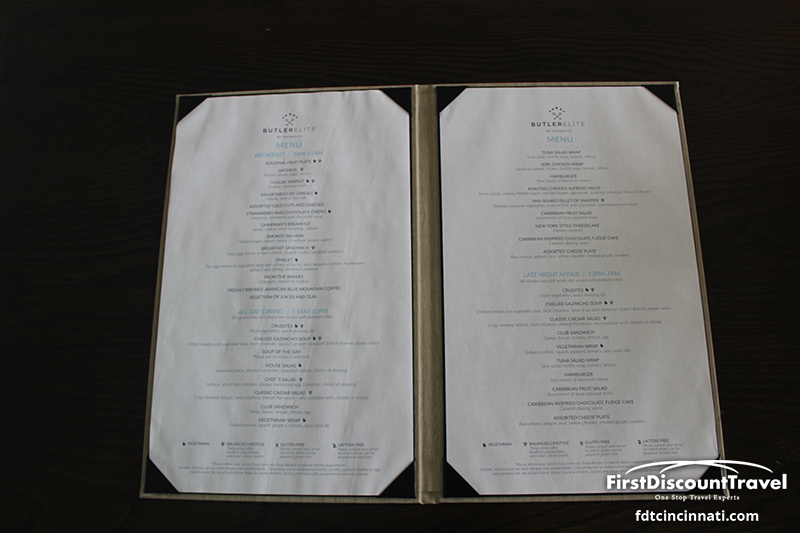 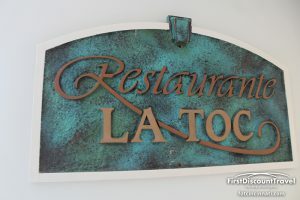 The other restaurant that requires reservations is the gourmet French restaurant, La Toc. 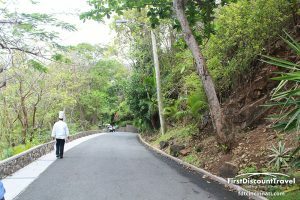 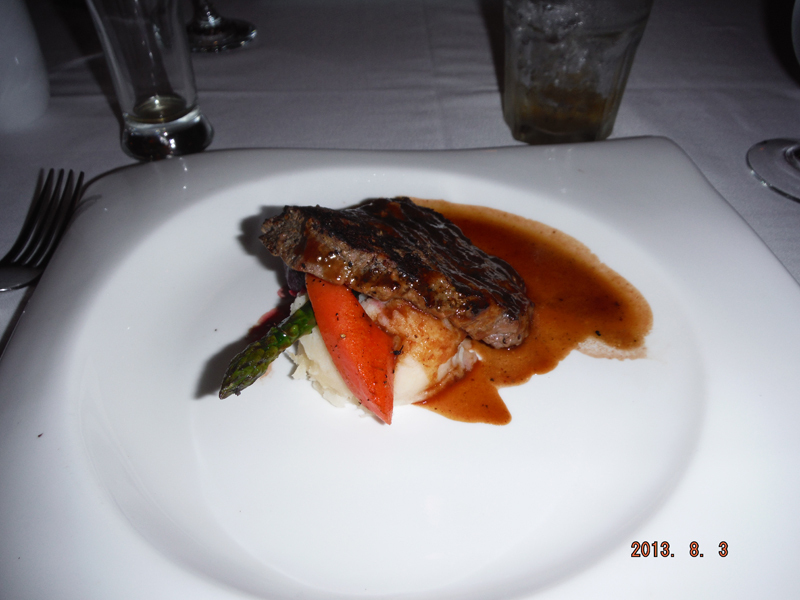 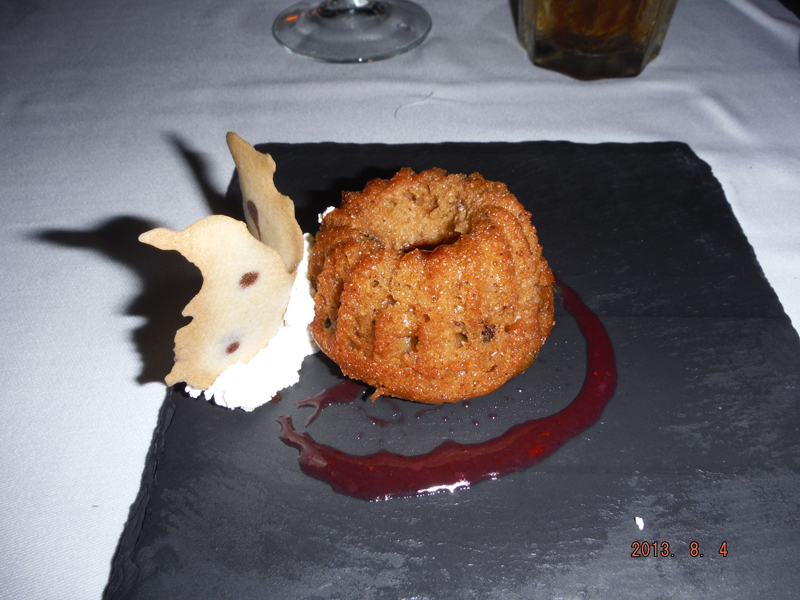 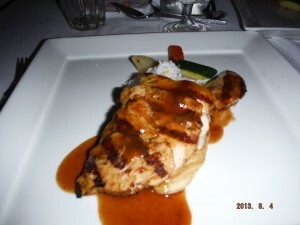 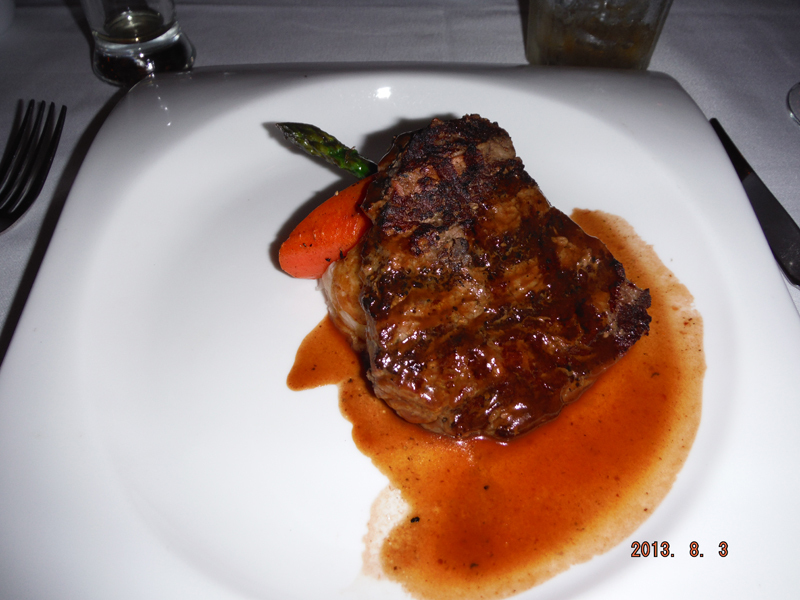 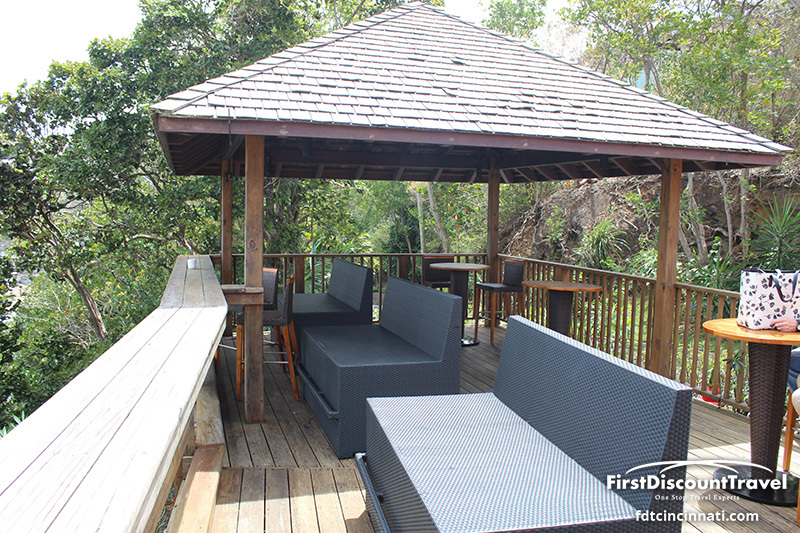 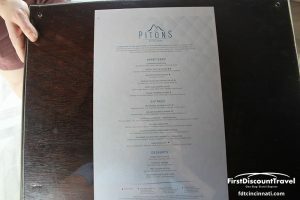 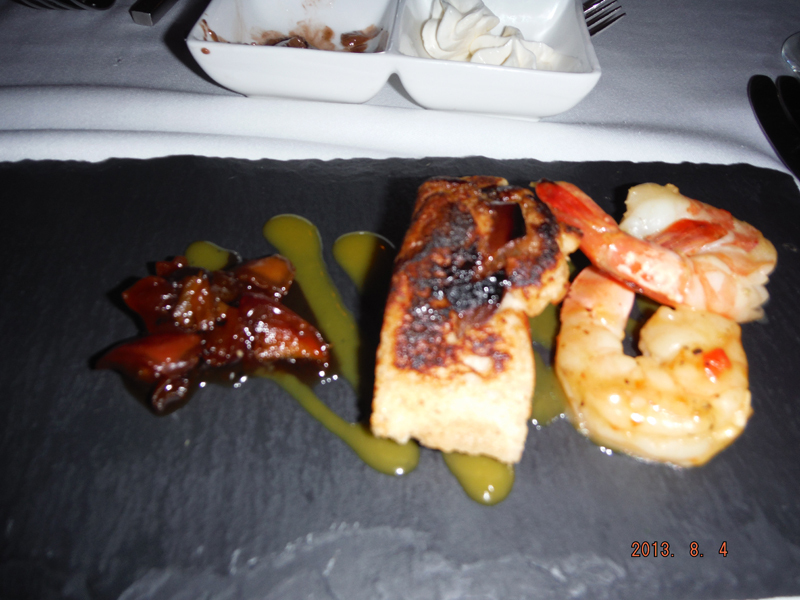 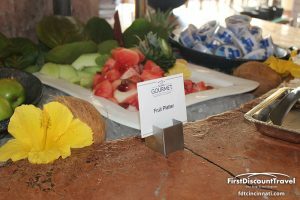 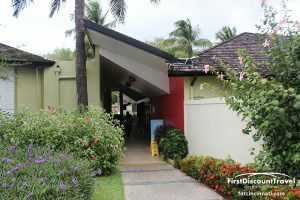 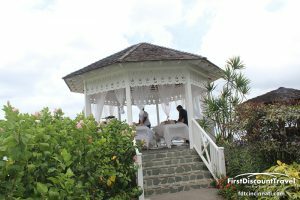 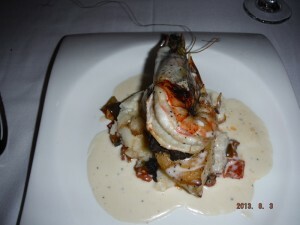 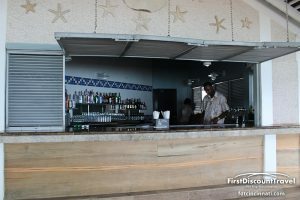 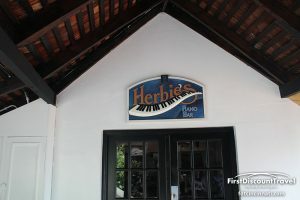 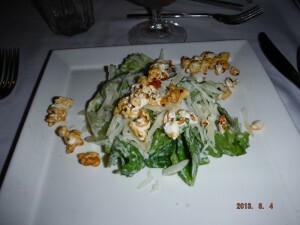 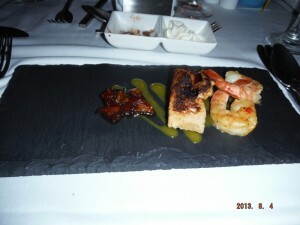 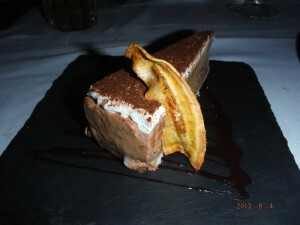 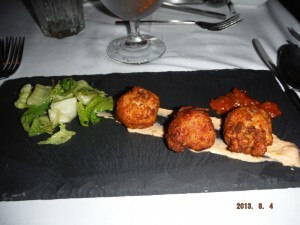 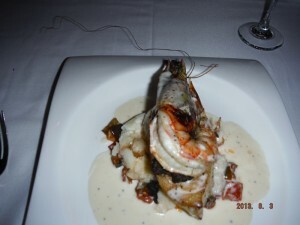 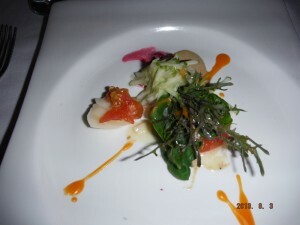 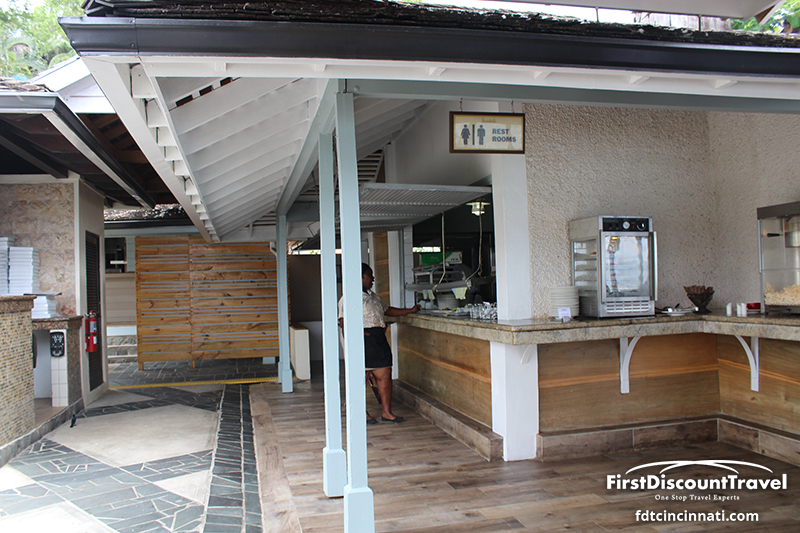 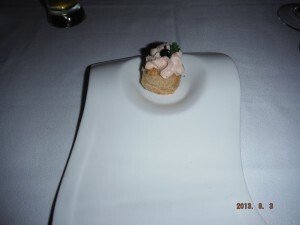 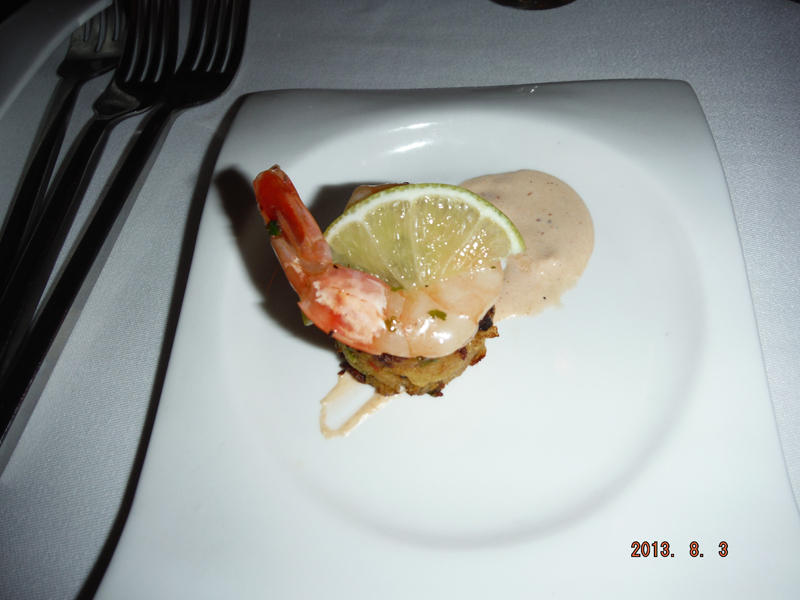 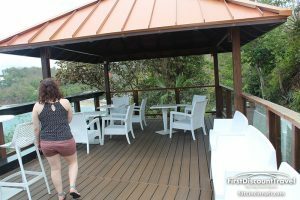 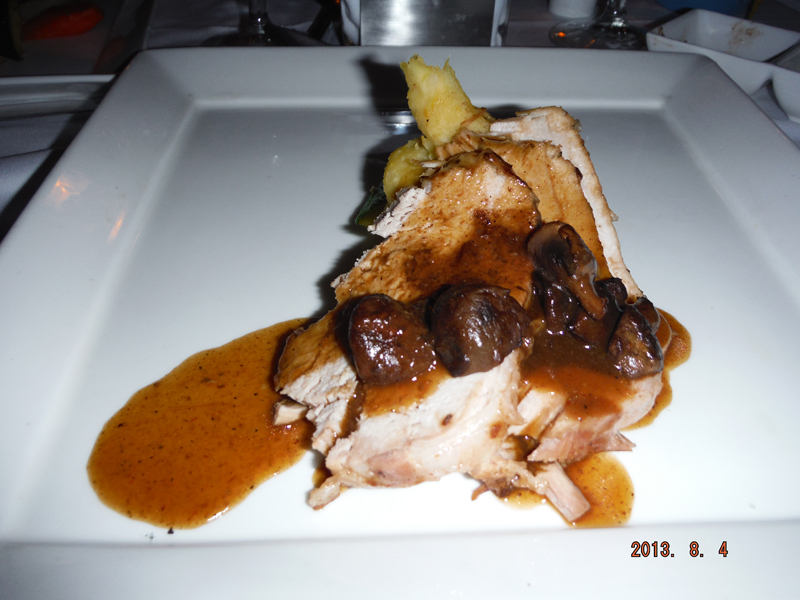 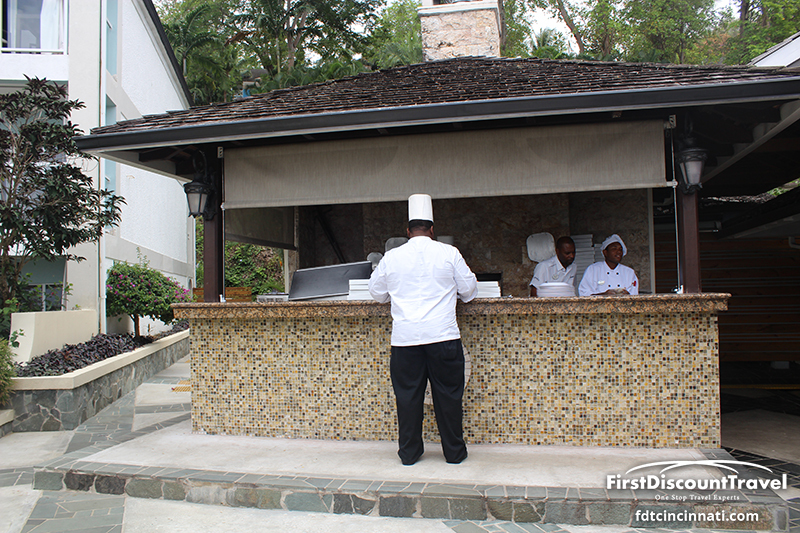 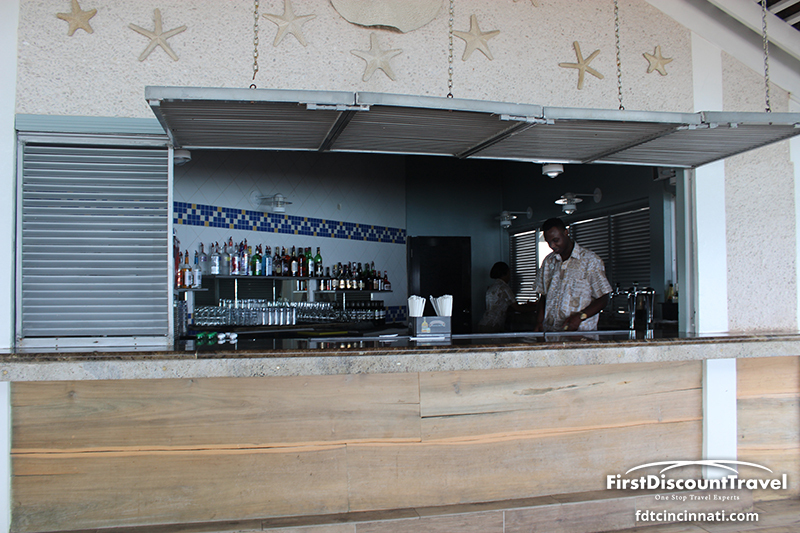 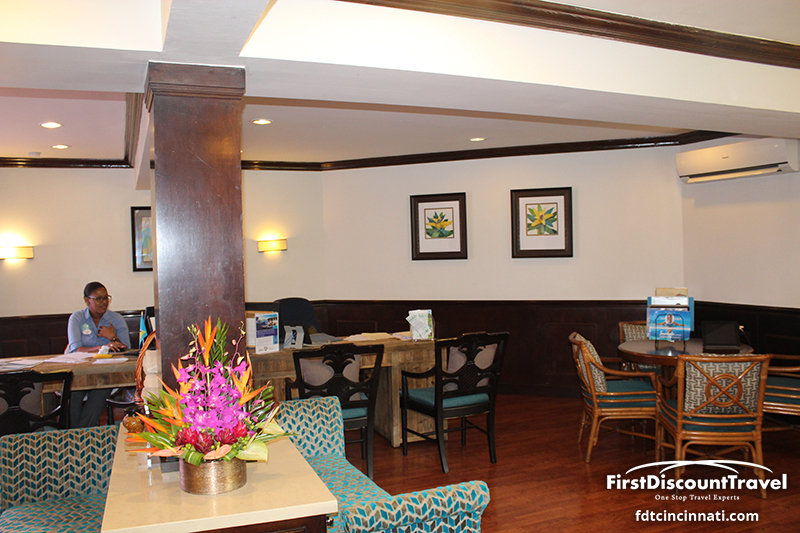 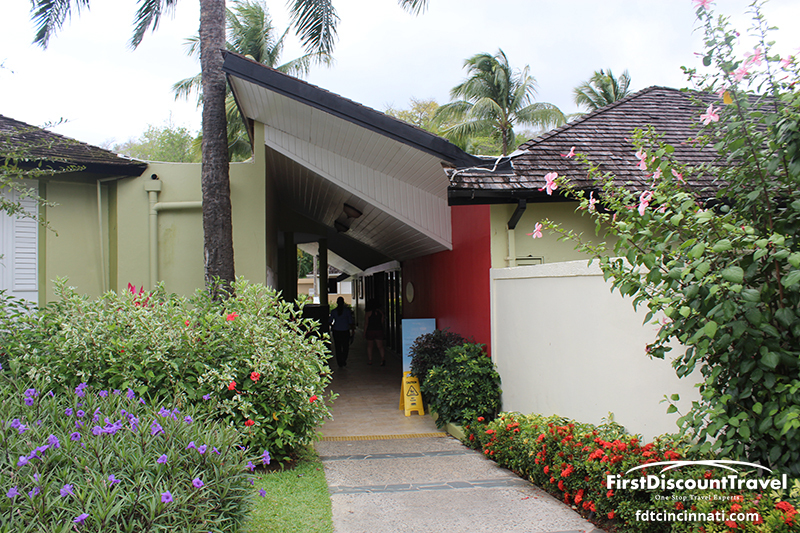 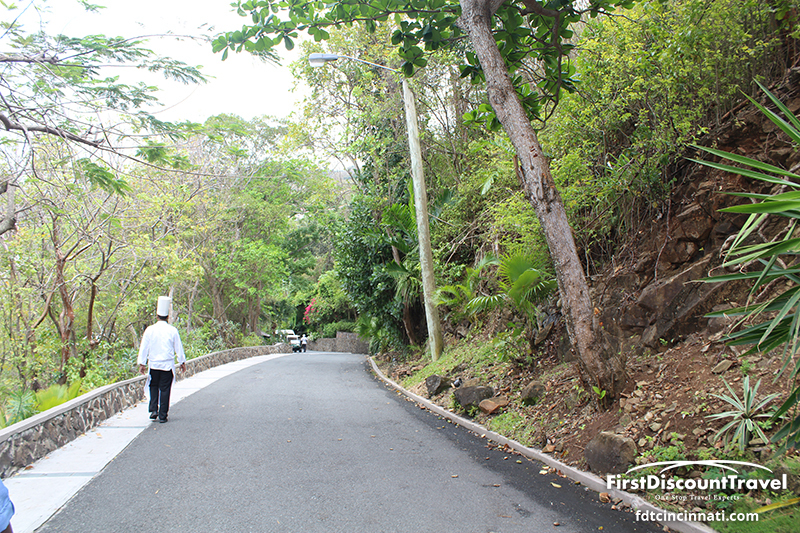 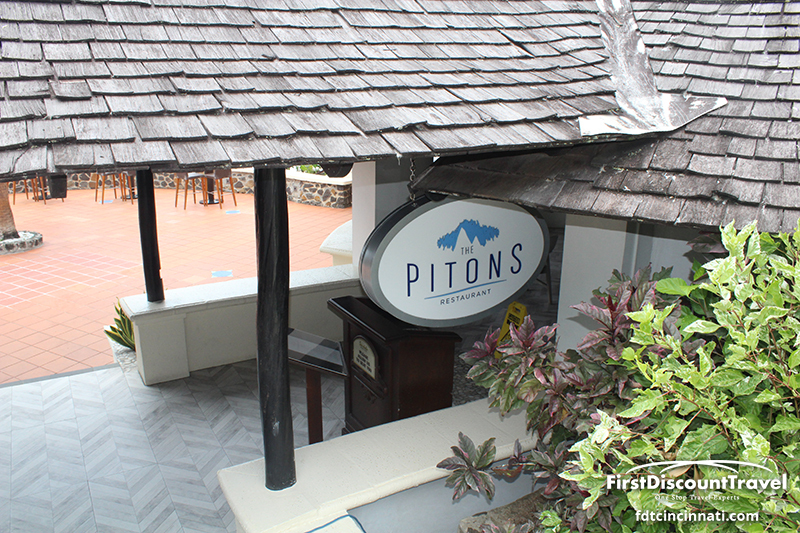 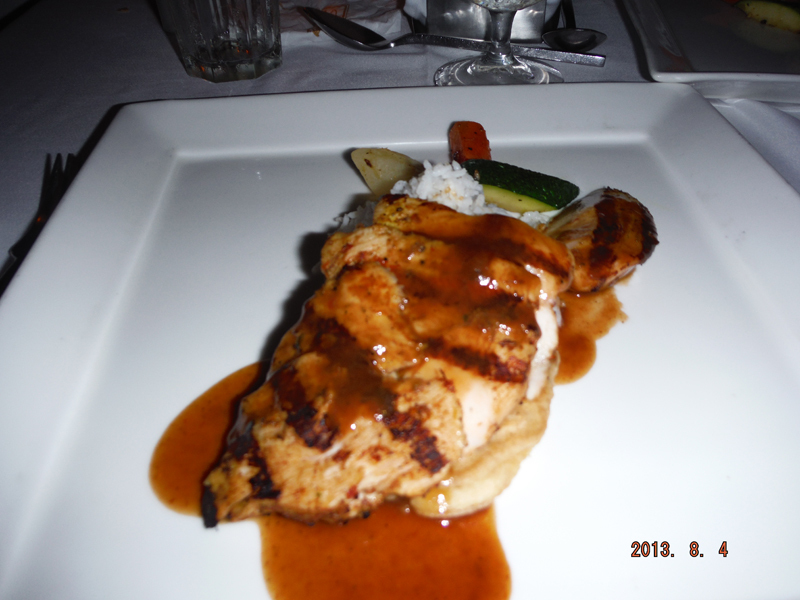 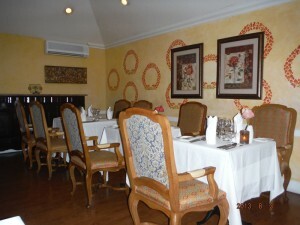 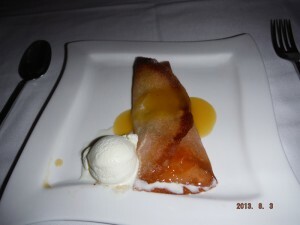 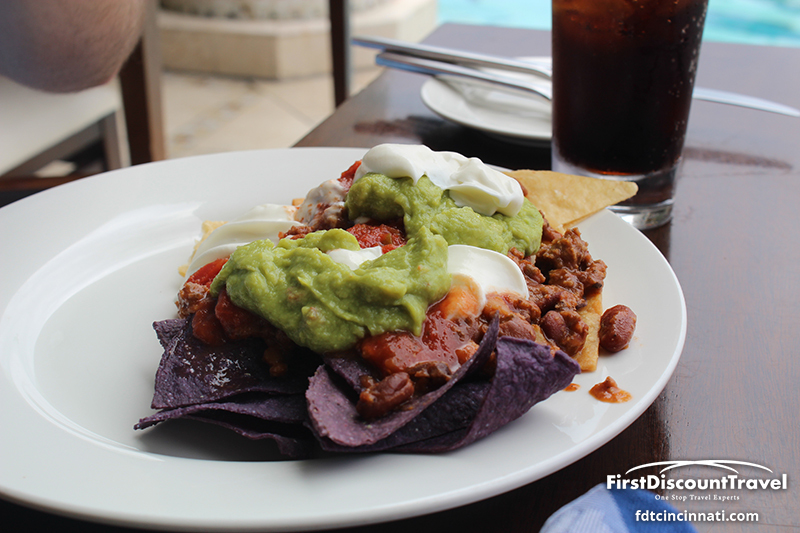 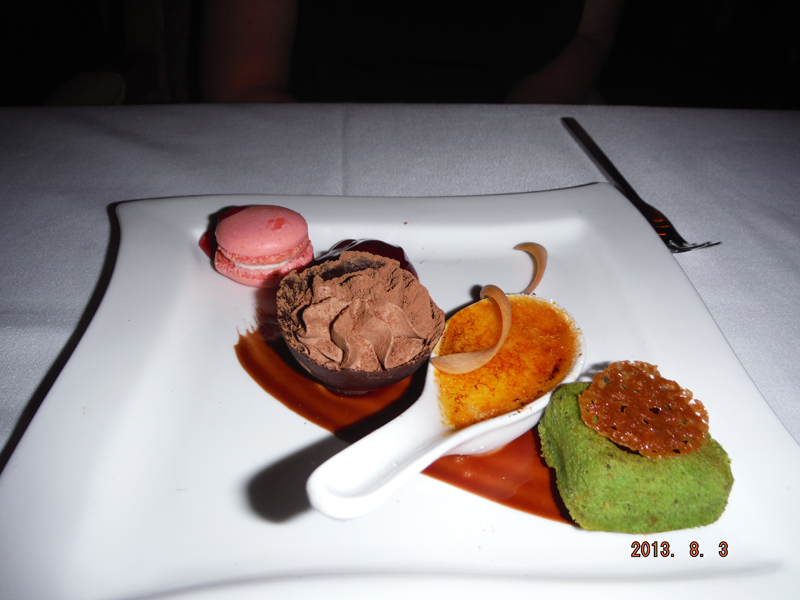 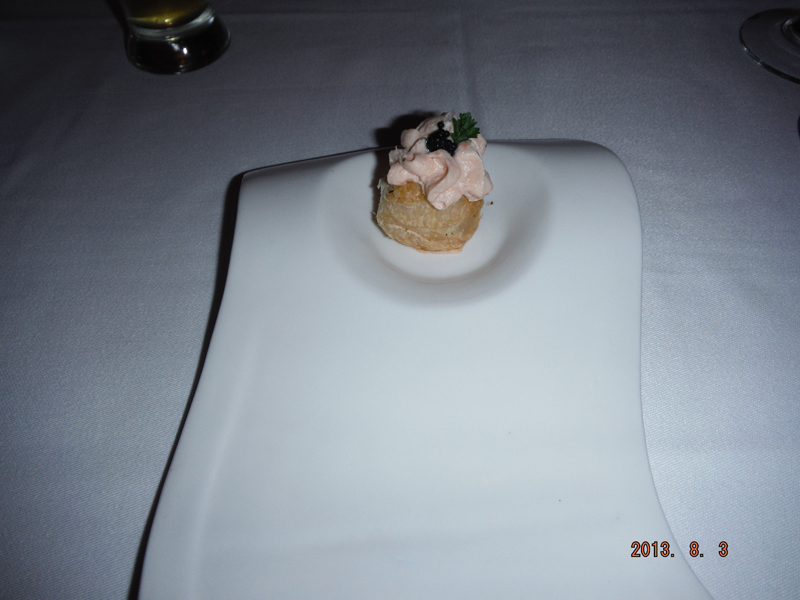 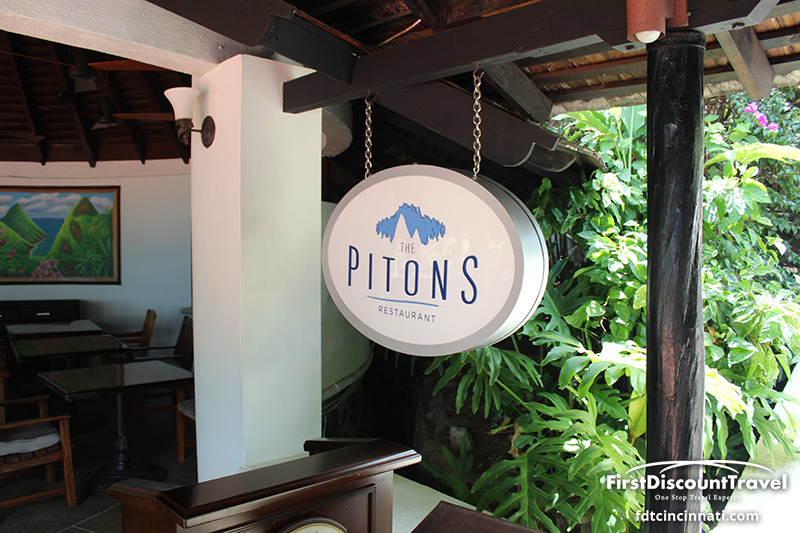 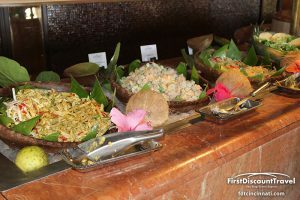 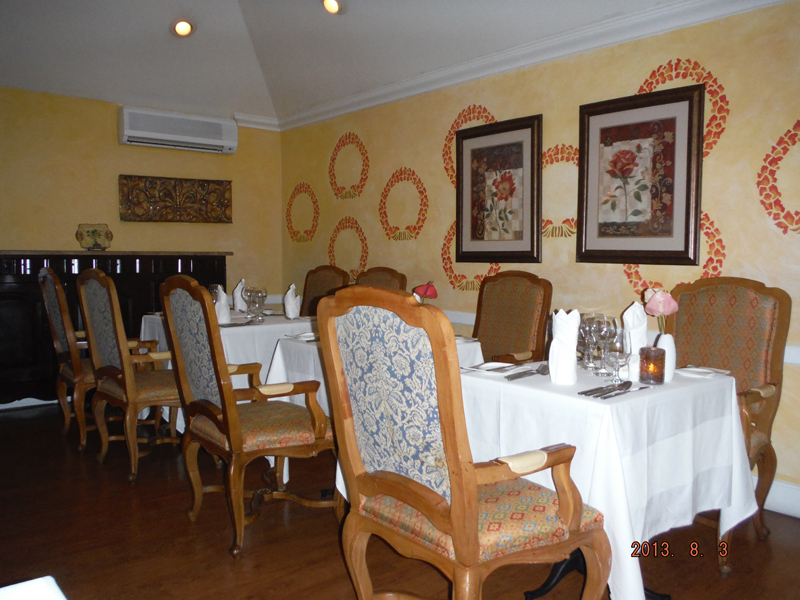 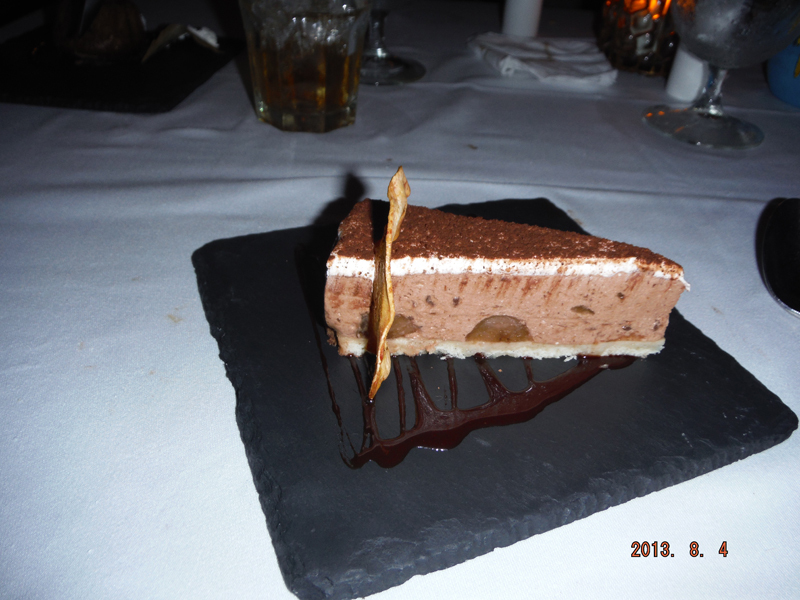 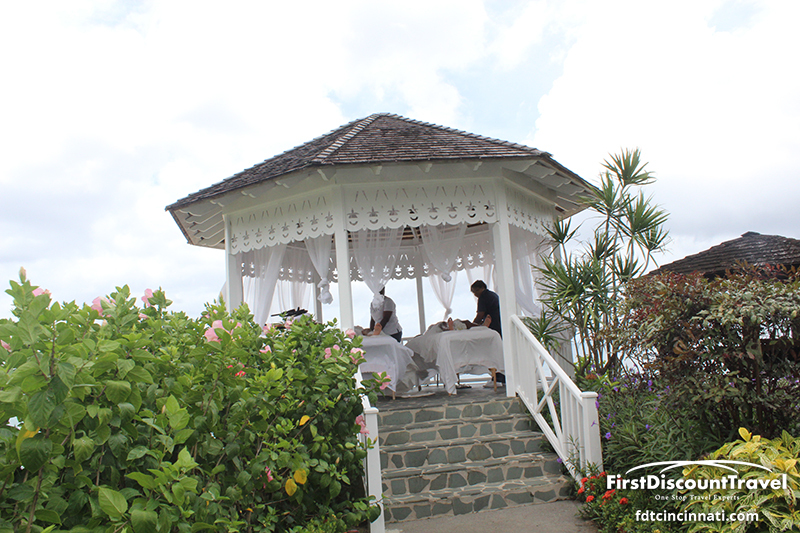 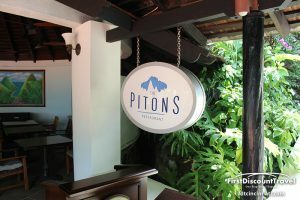 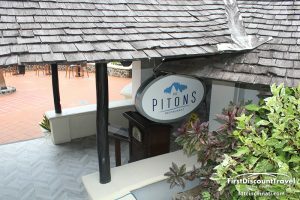 My personal favorite was thee Caribbean cuisine of the Piton Restaurant. 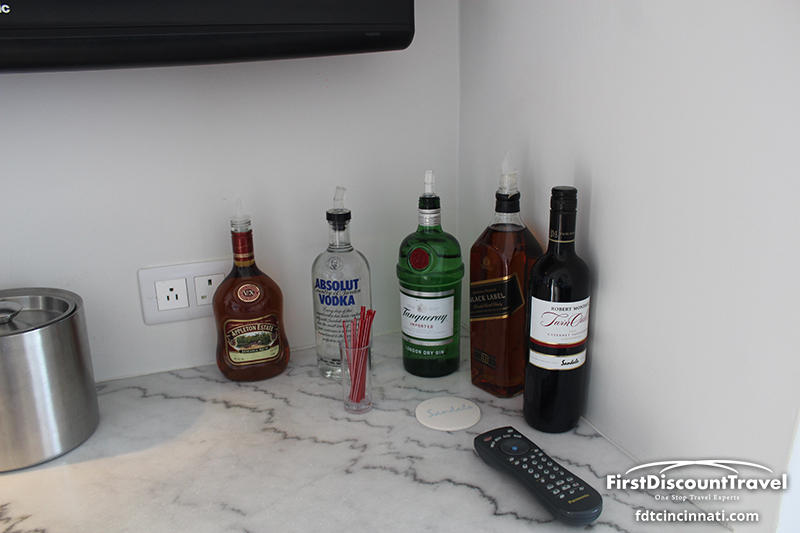 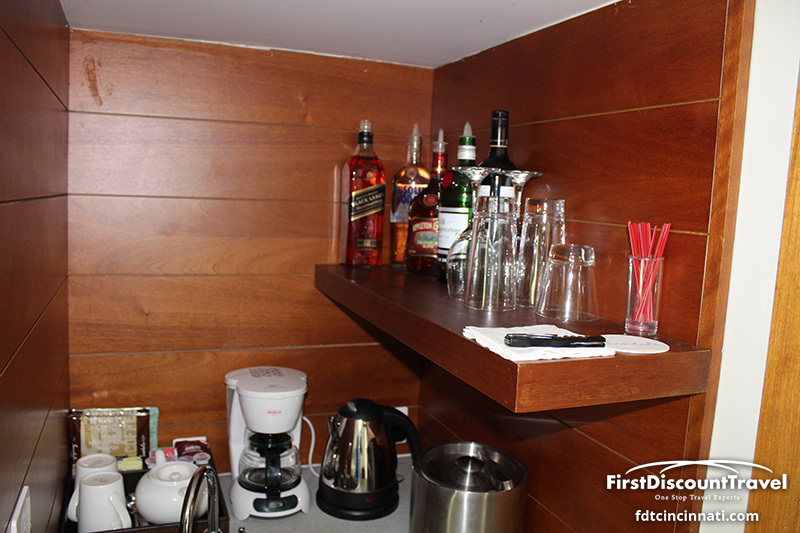 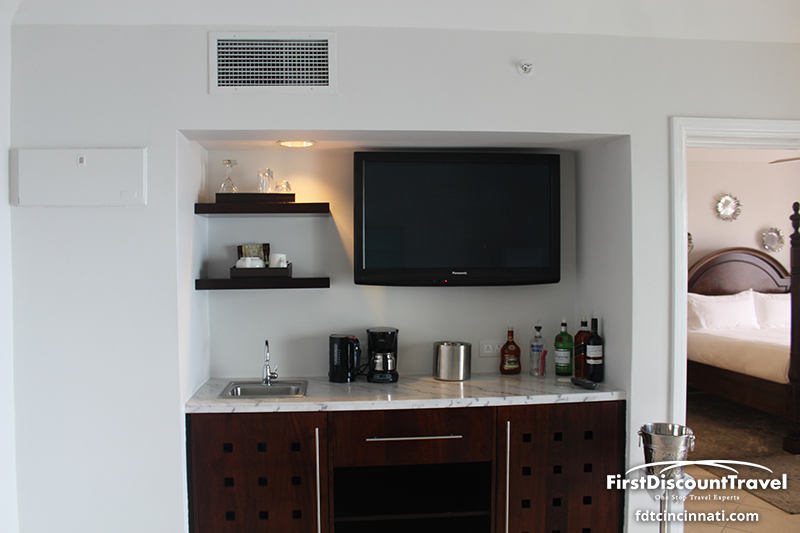 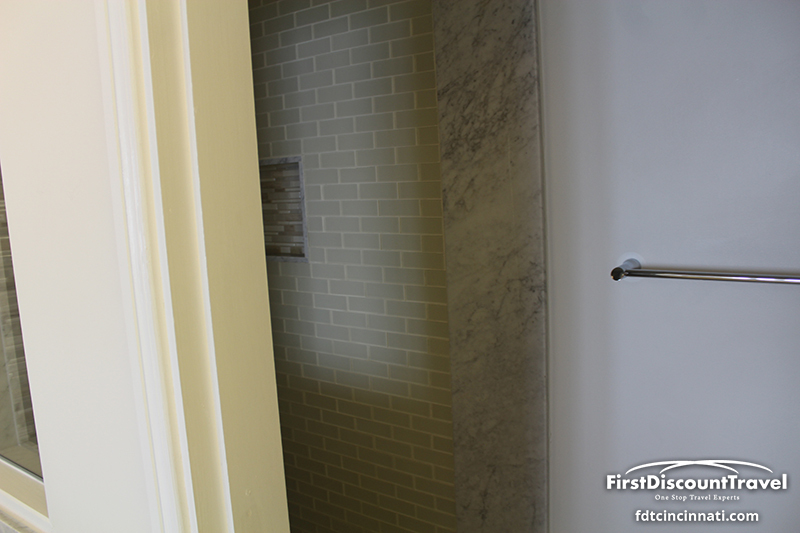 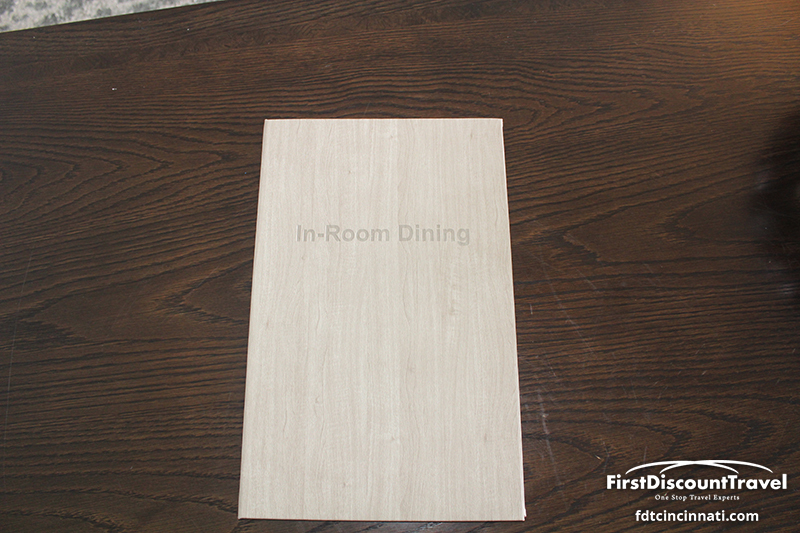 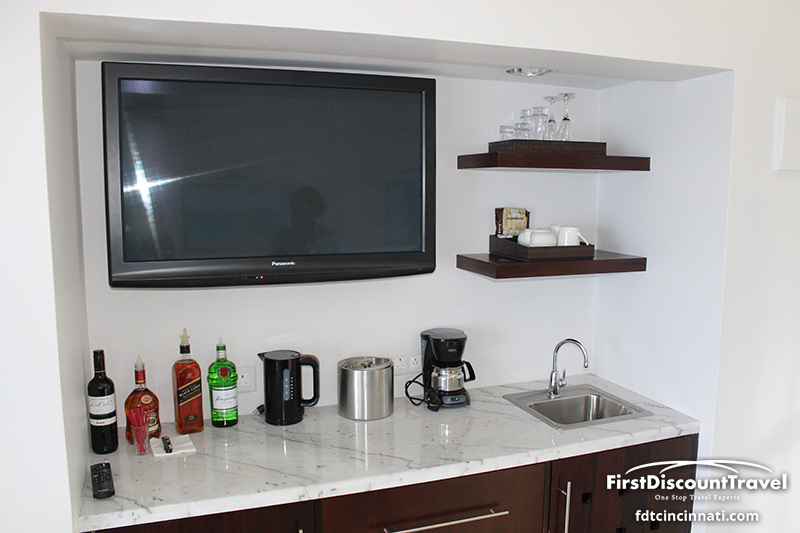 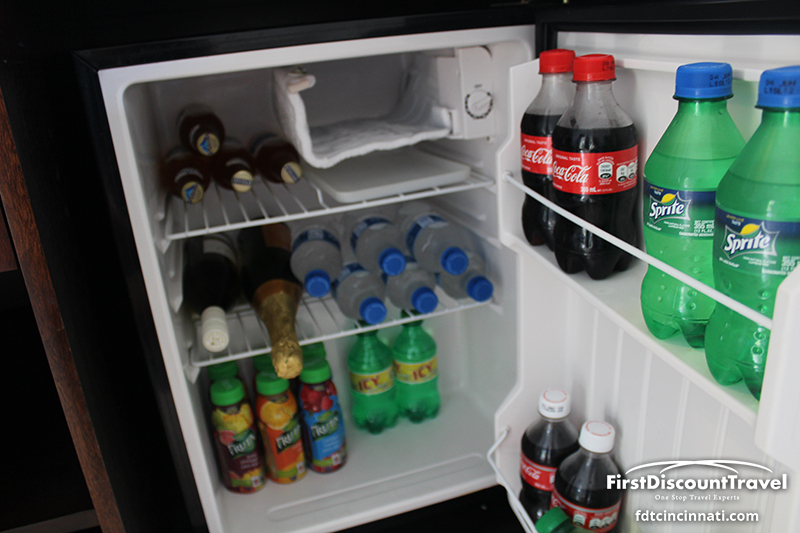 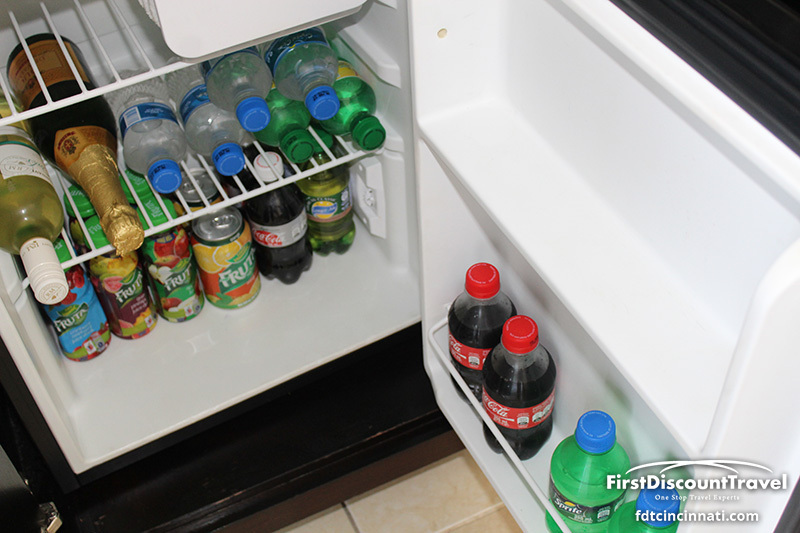 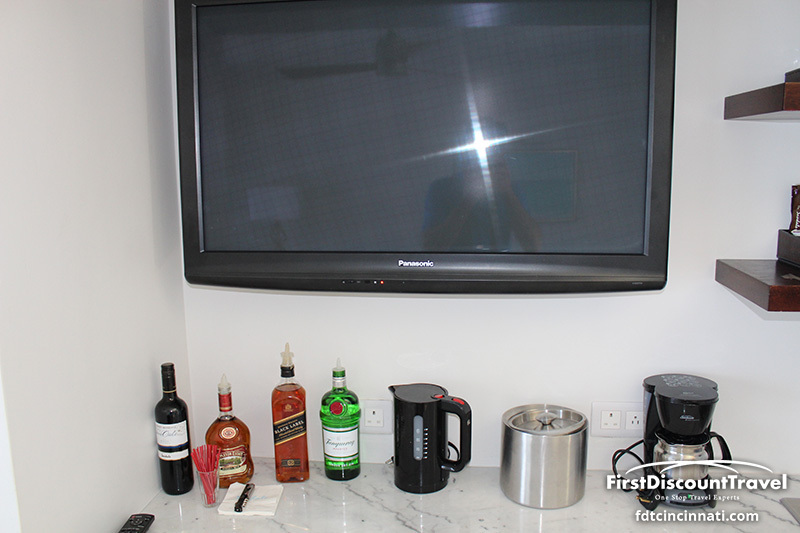 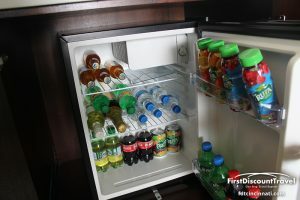 Room service will be available for Club level and butler suites starting in October of 2013. 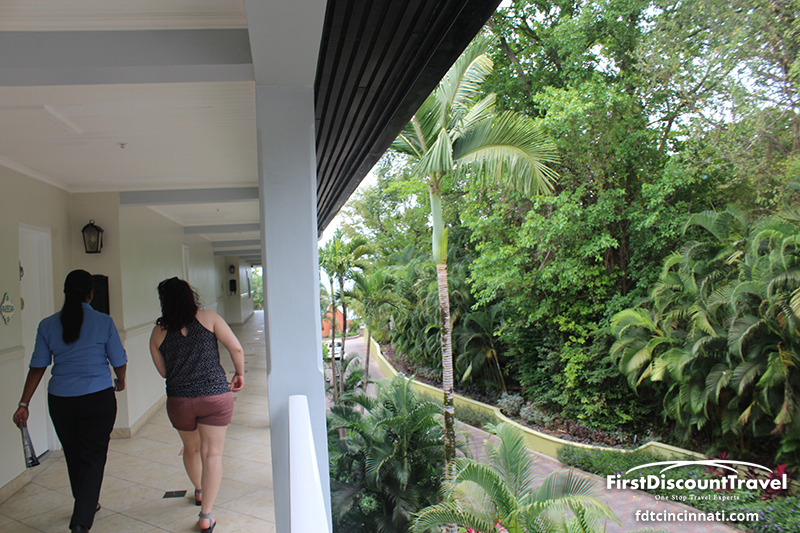 In summary, I really liked the resort. 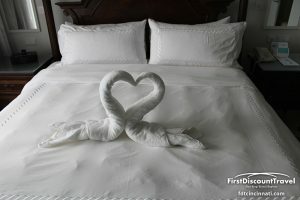 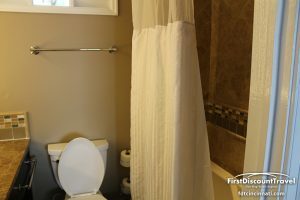 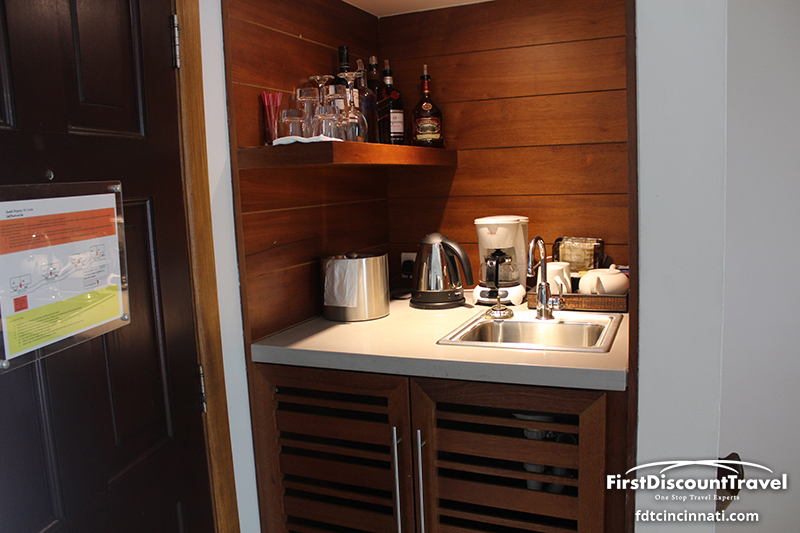 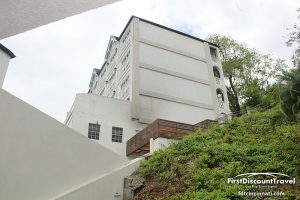 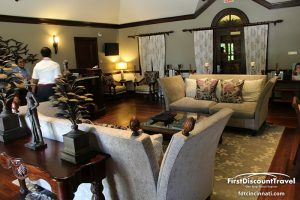 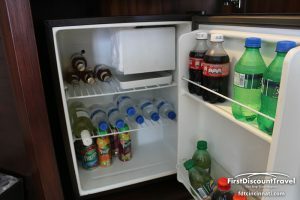 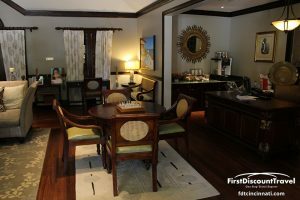 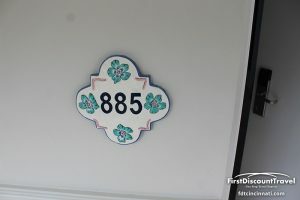 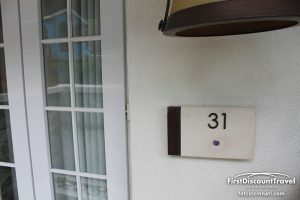 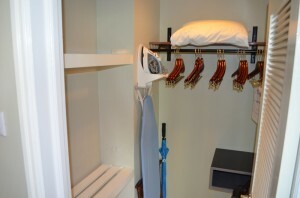 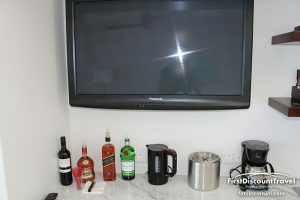 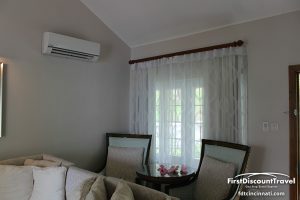 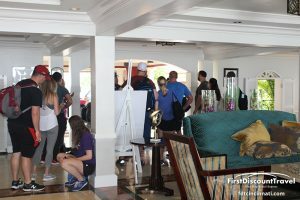 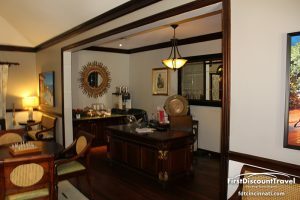 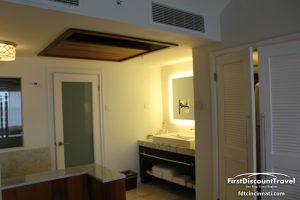 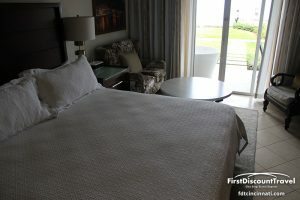 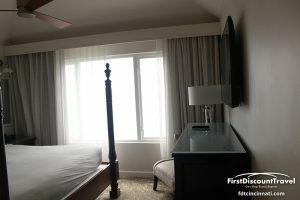 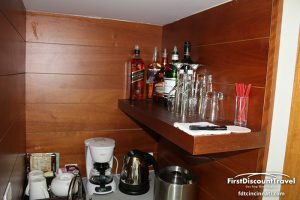 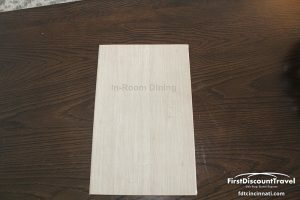 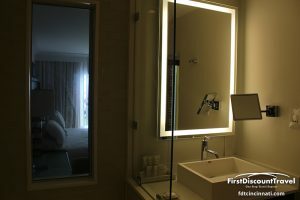 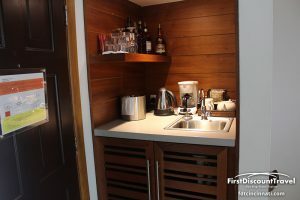 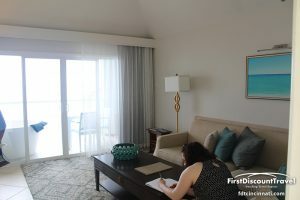 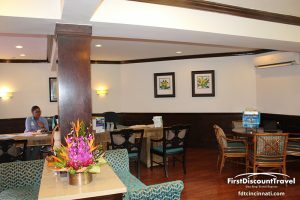 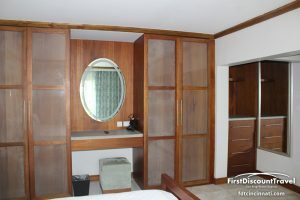 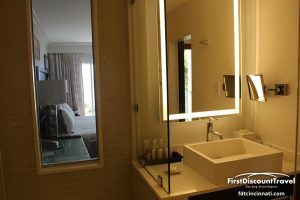 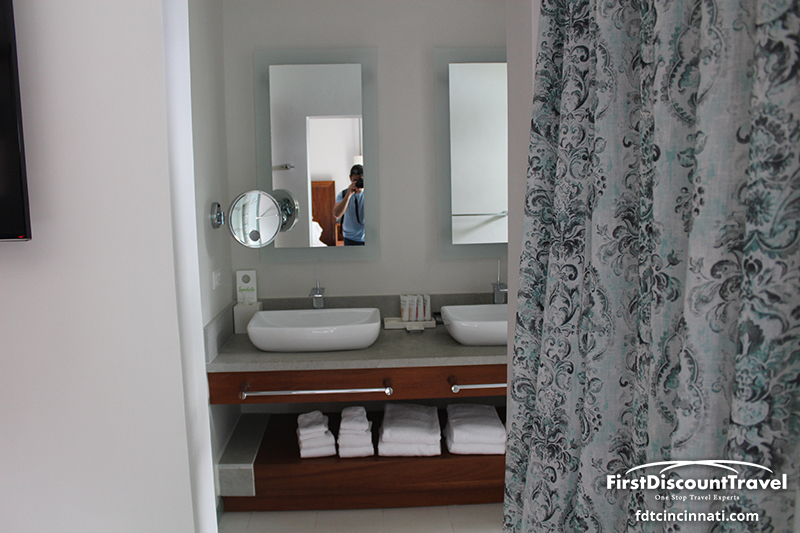 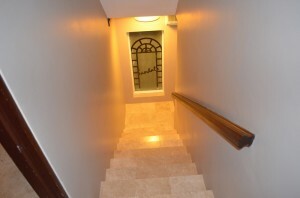 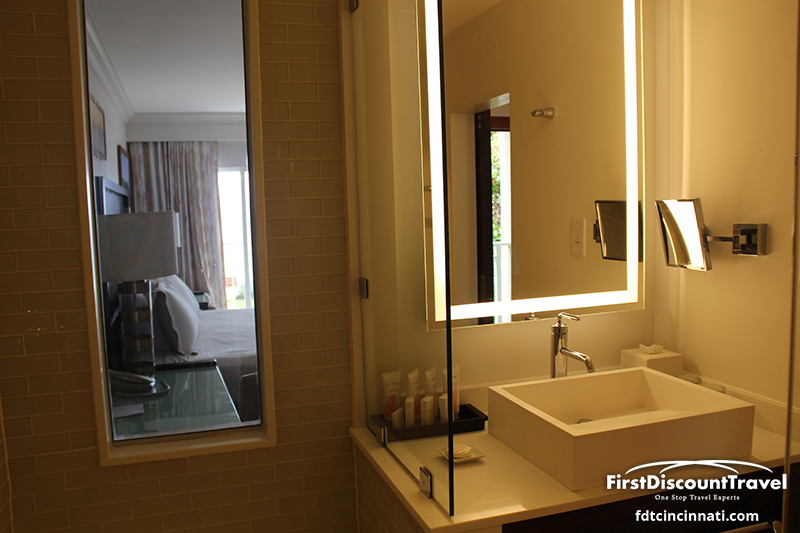 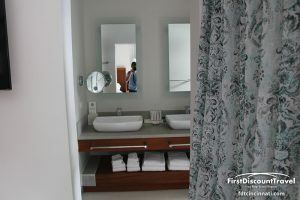 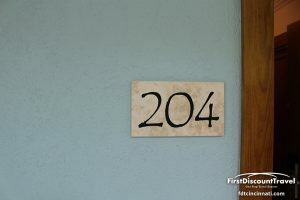 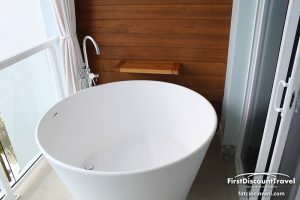 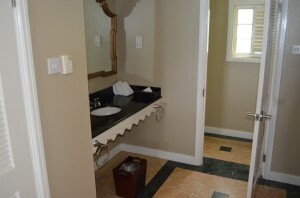 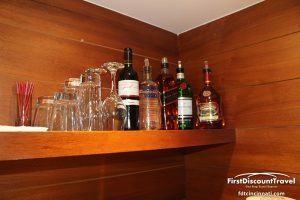 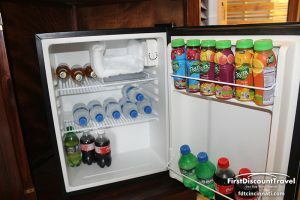 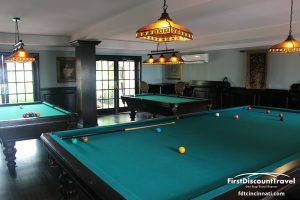 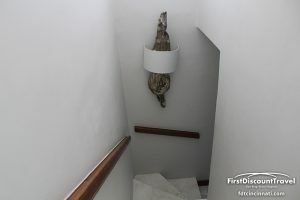 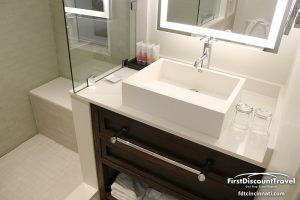 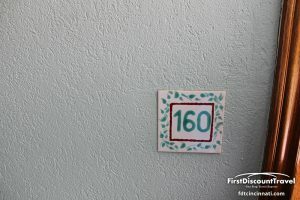 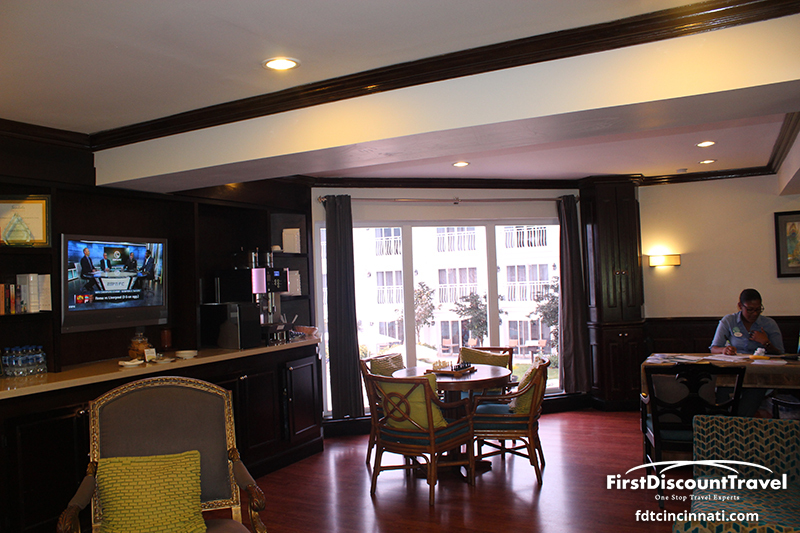 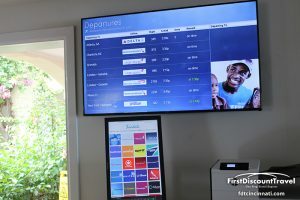 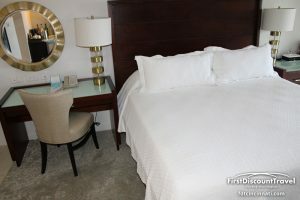 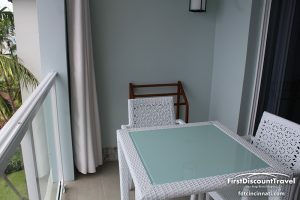 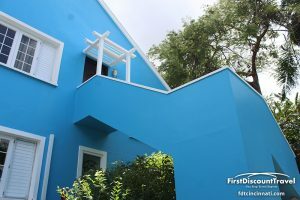 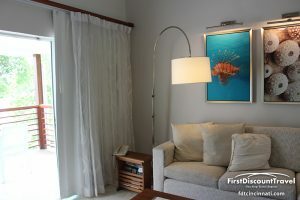 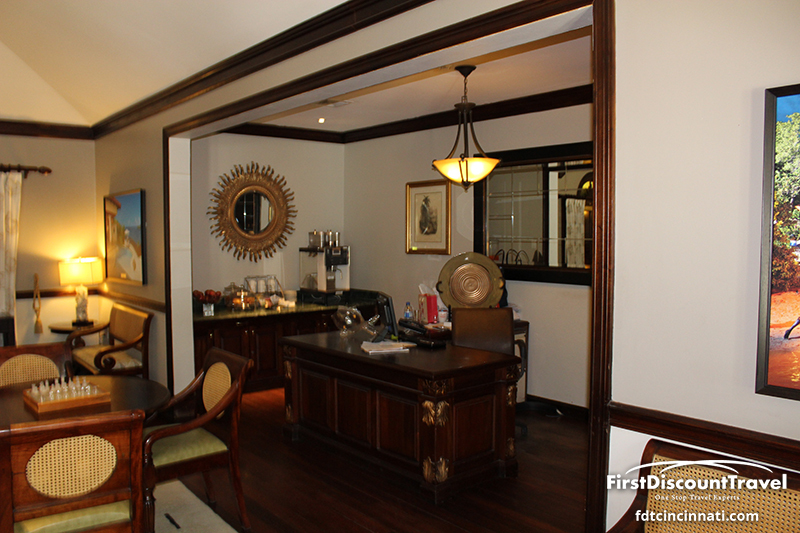 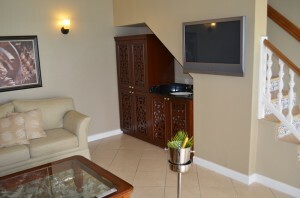 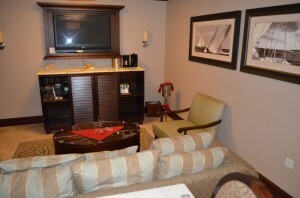 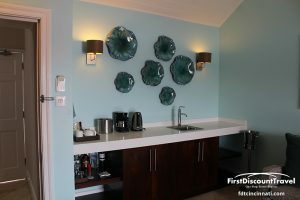 The renovated rooms are awesome and the selection of unique suites is amazing. 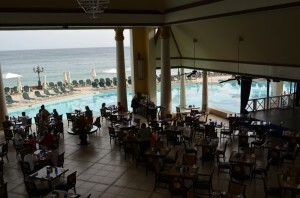 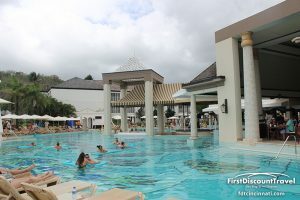 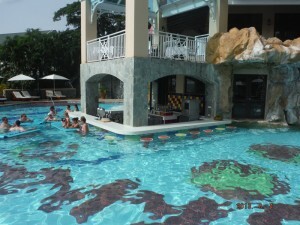 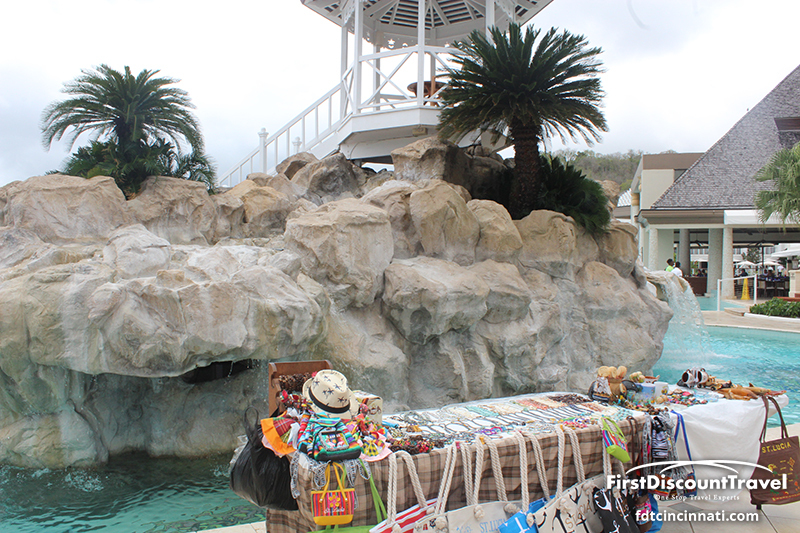 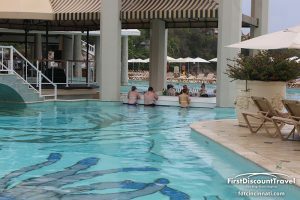 The main pool is very active, and the selection of restaurants is nice. I would highly recommend this resort.